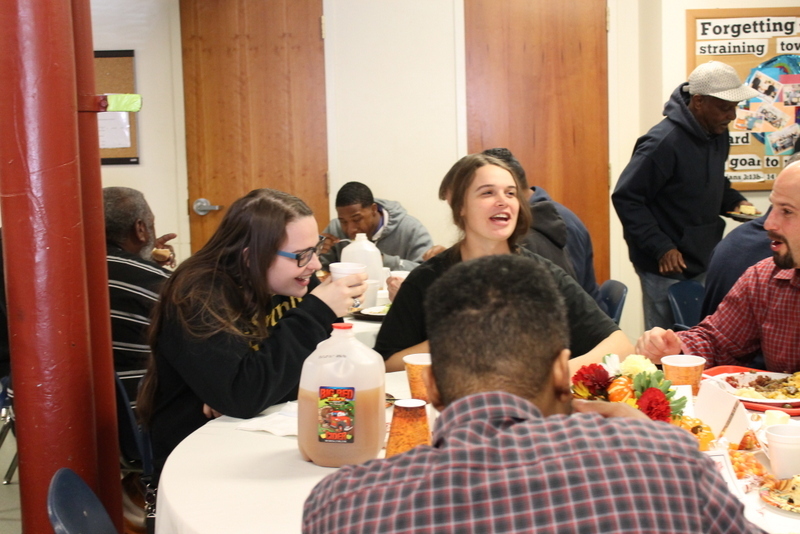 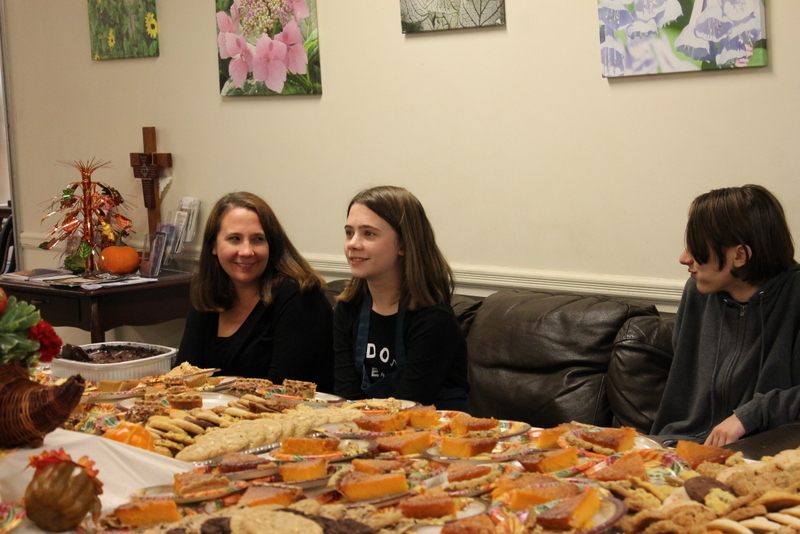 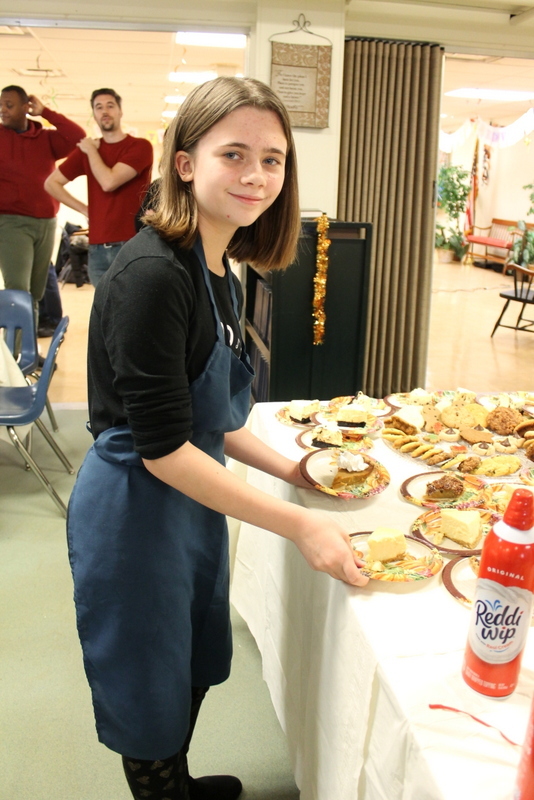 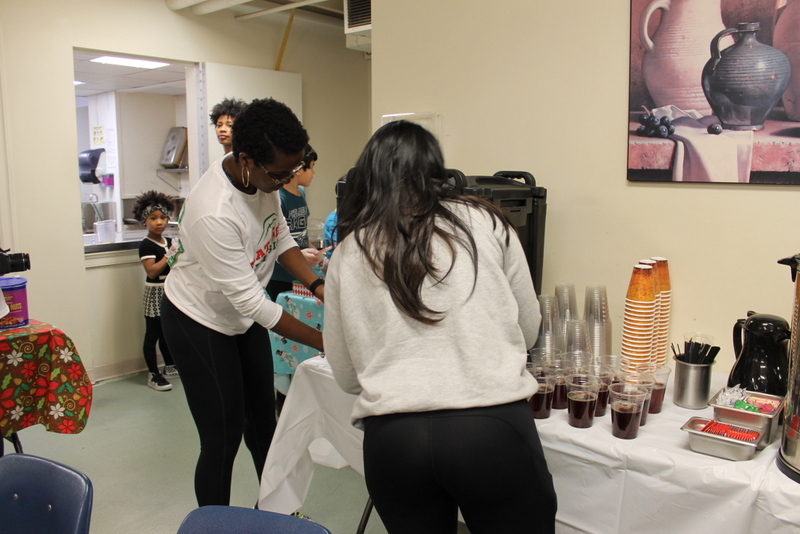 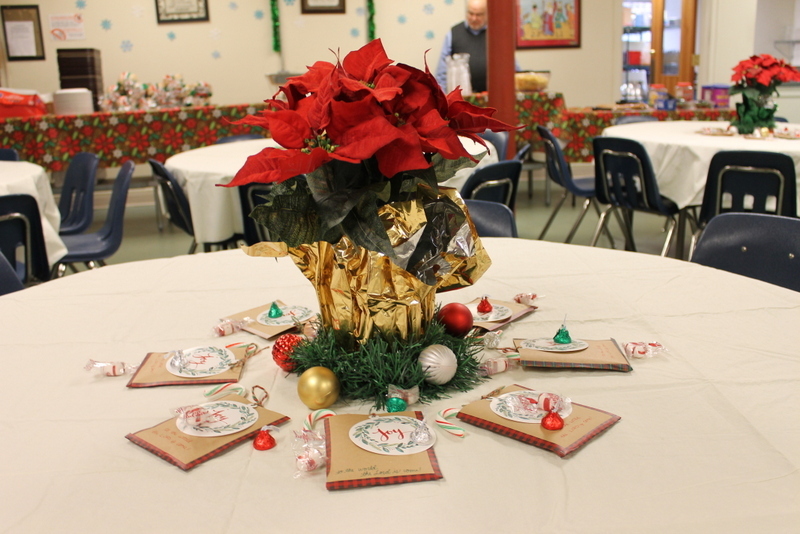 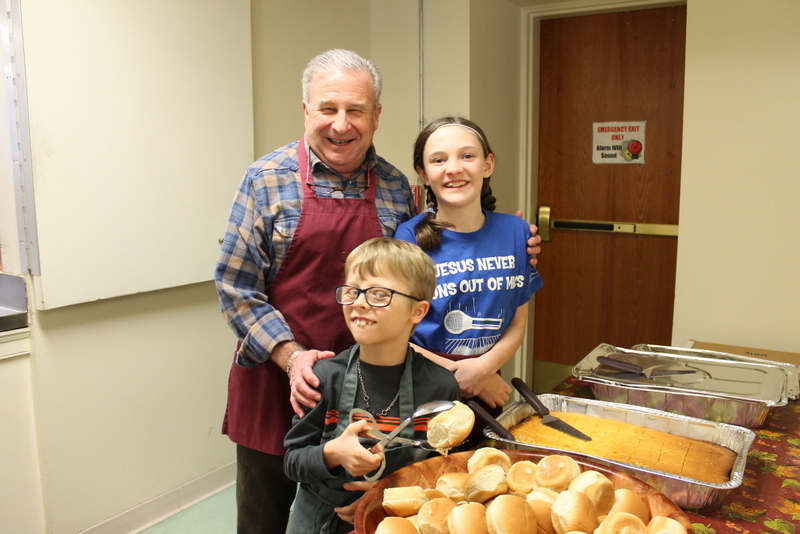 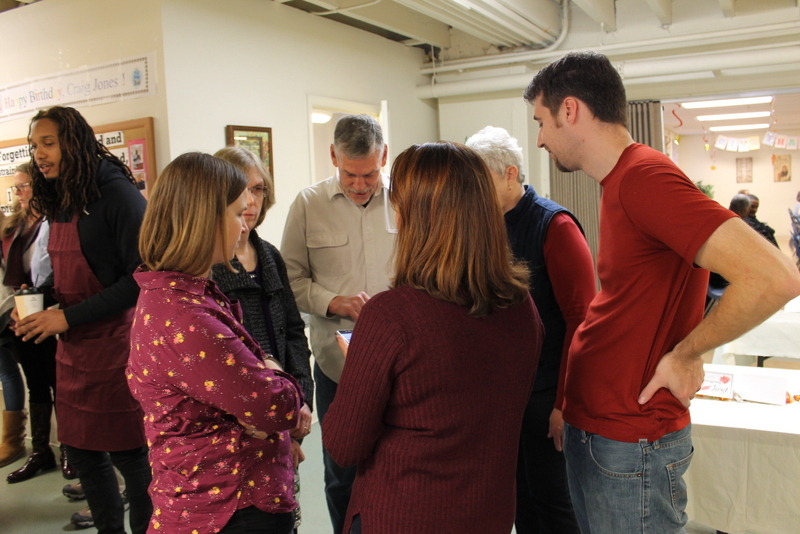 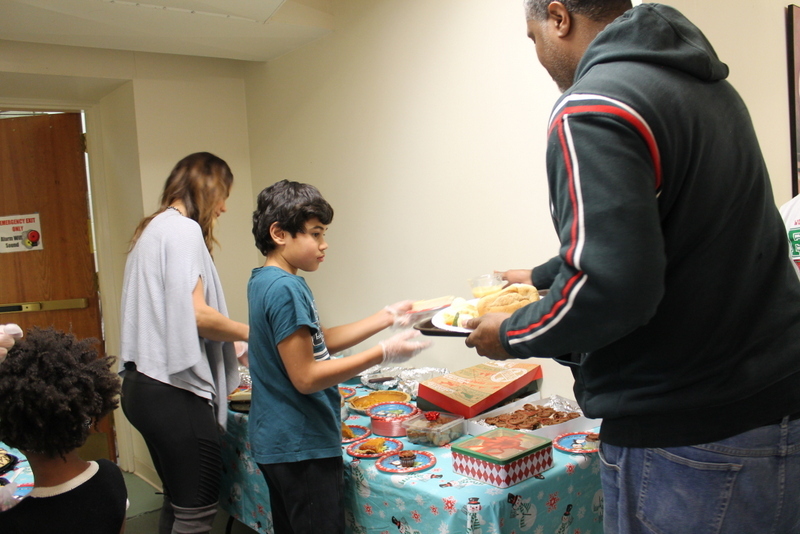 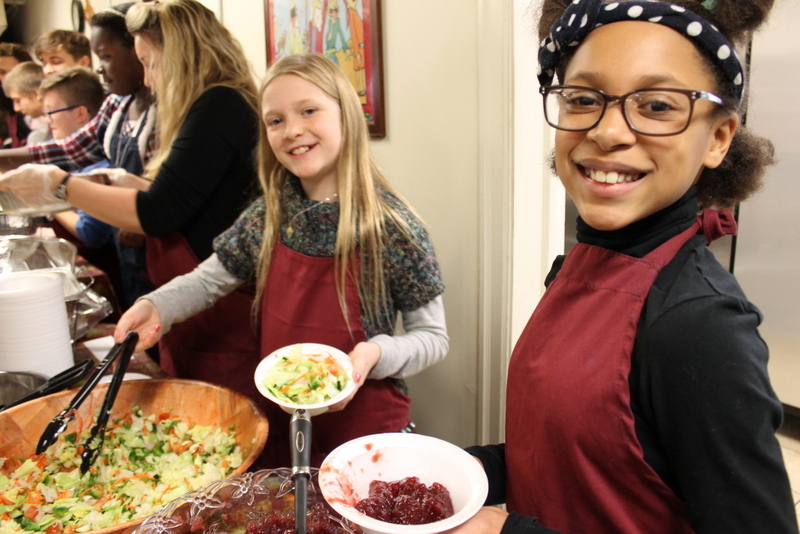 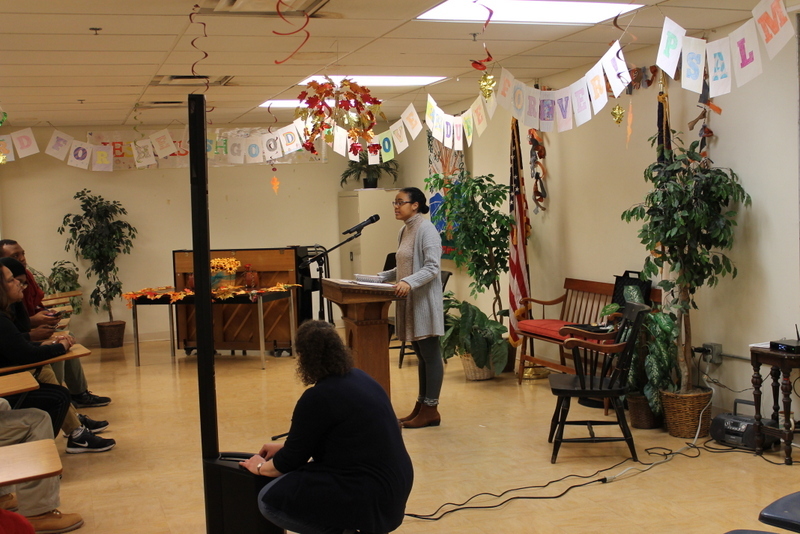 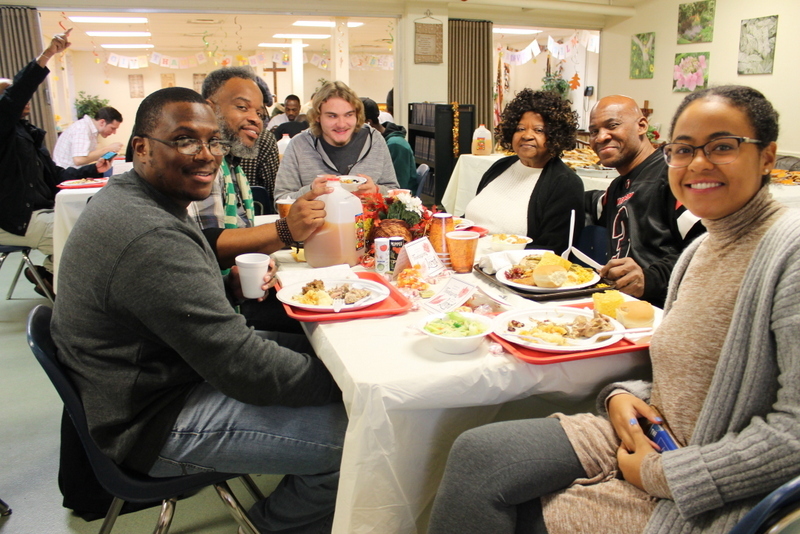 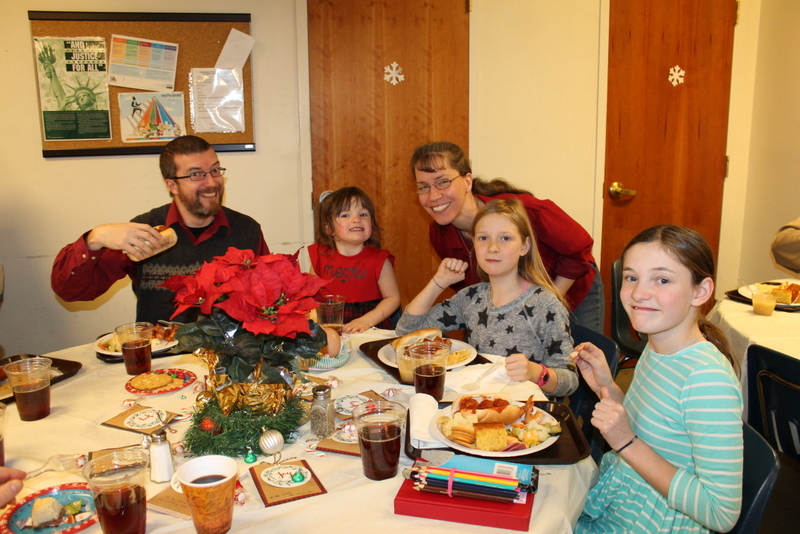 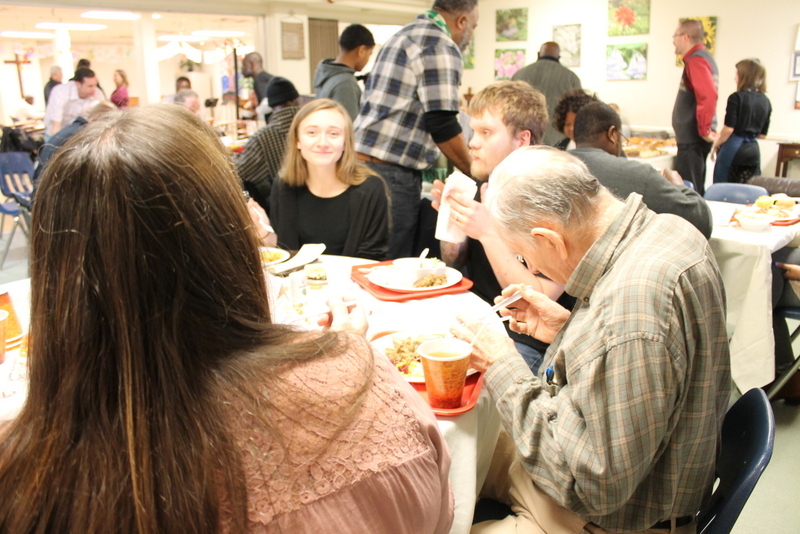 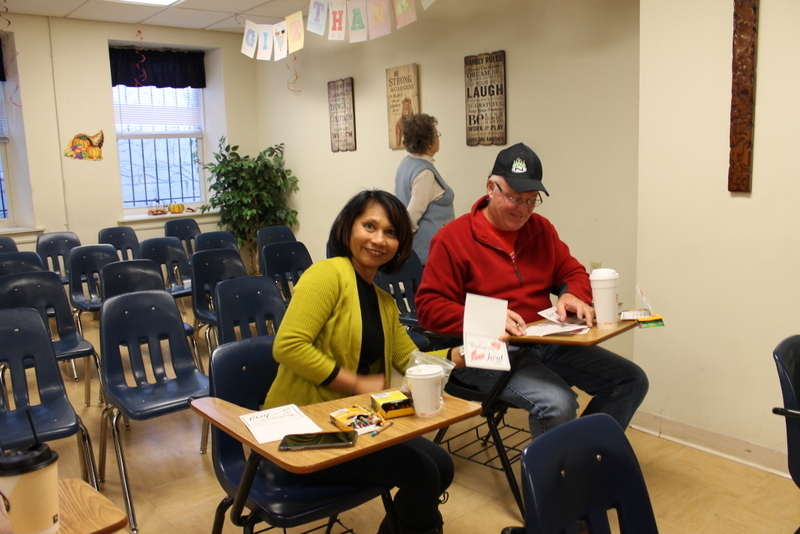 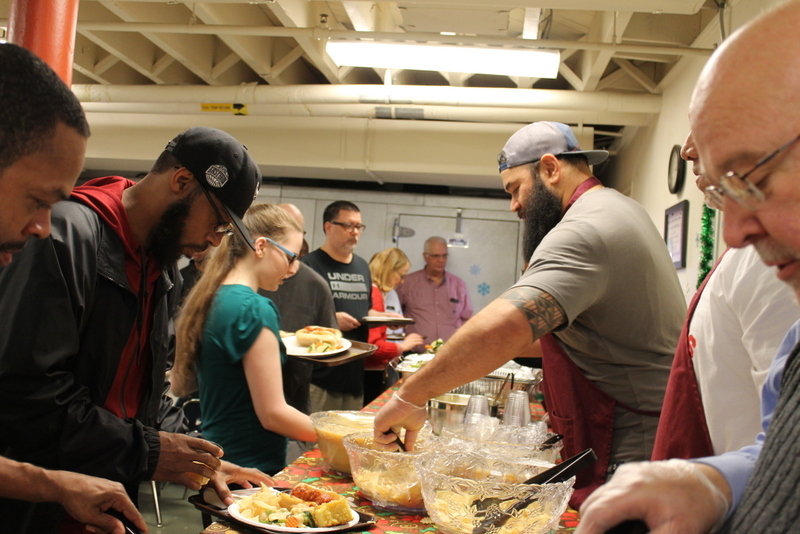 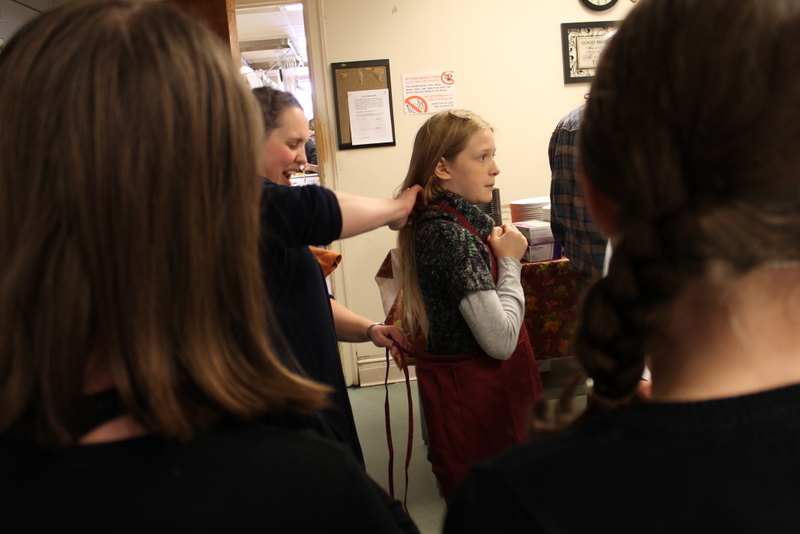 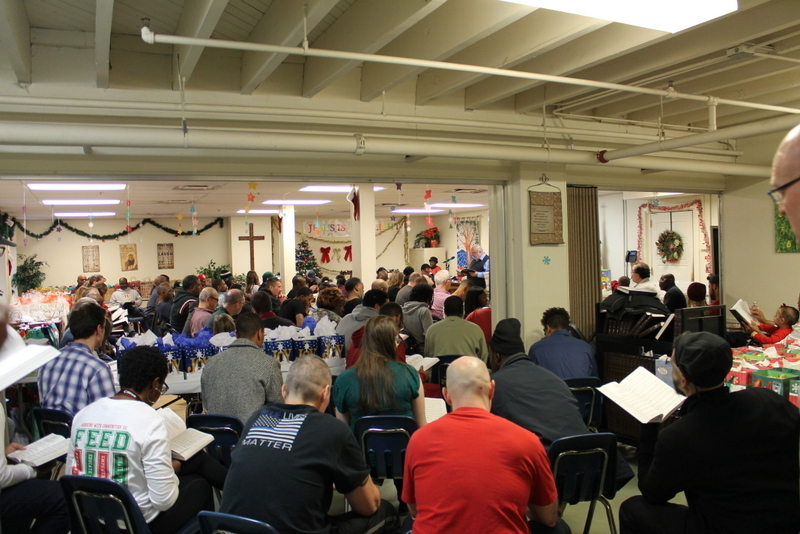 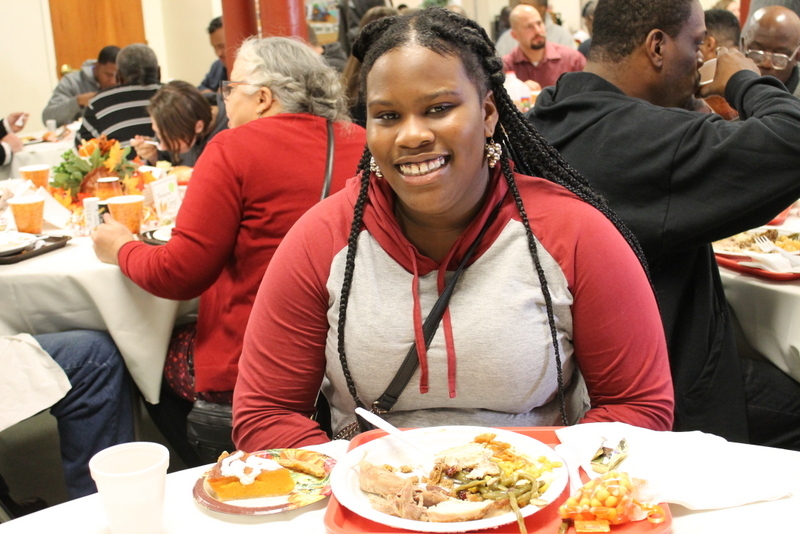 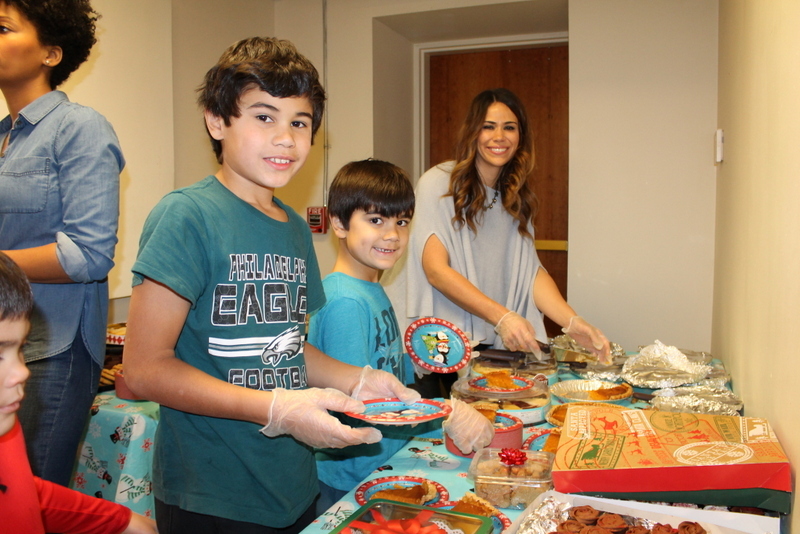 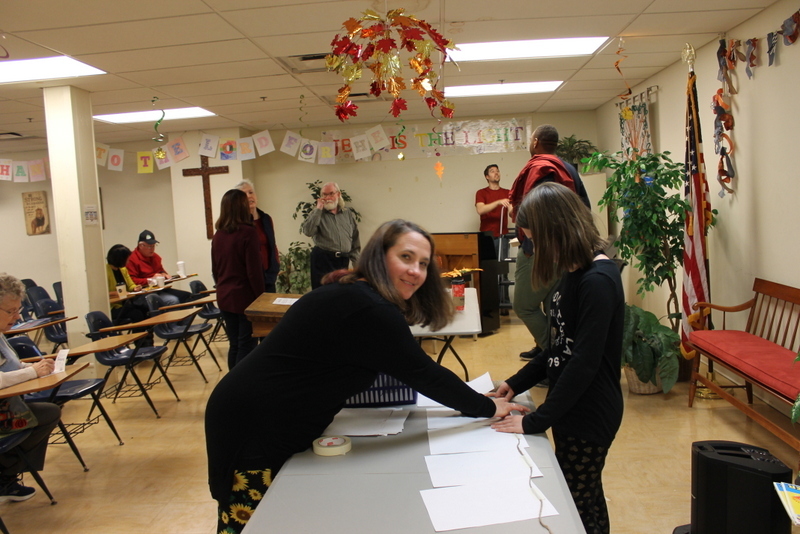 On the morning of December 24, 2018, the Mission family was busy getting ready for our annual Christmas Eve luncheon and chapel service. 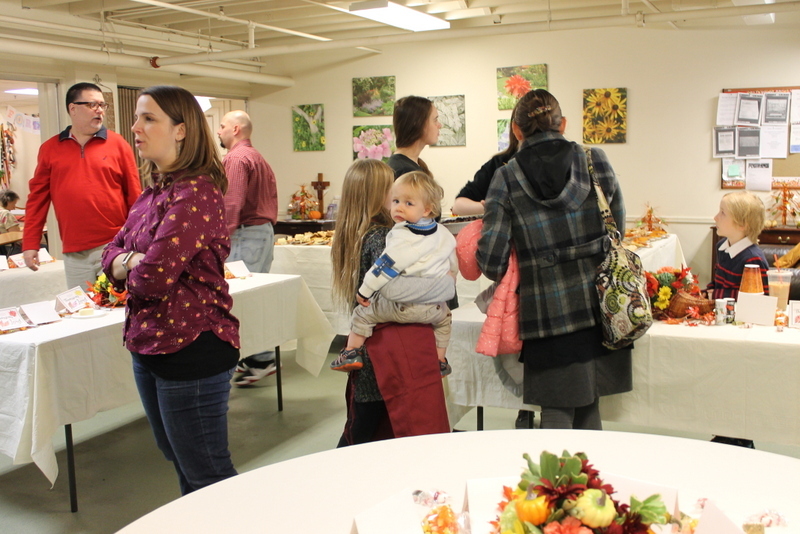 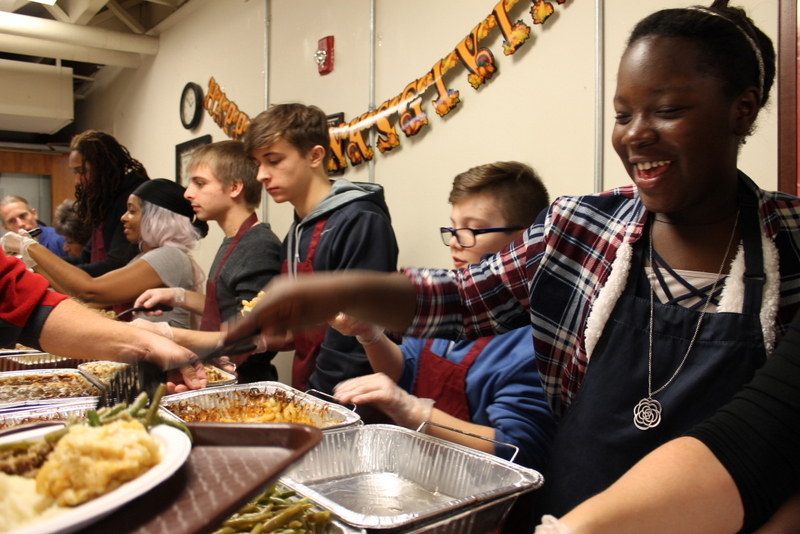 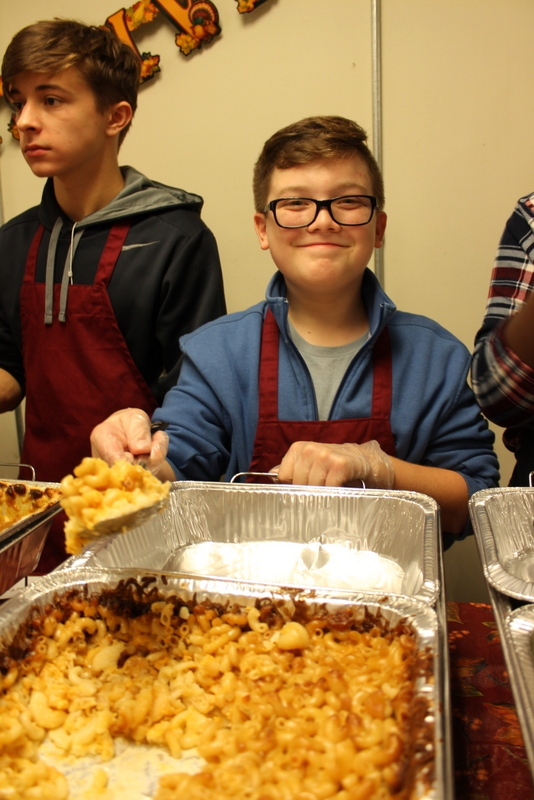 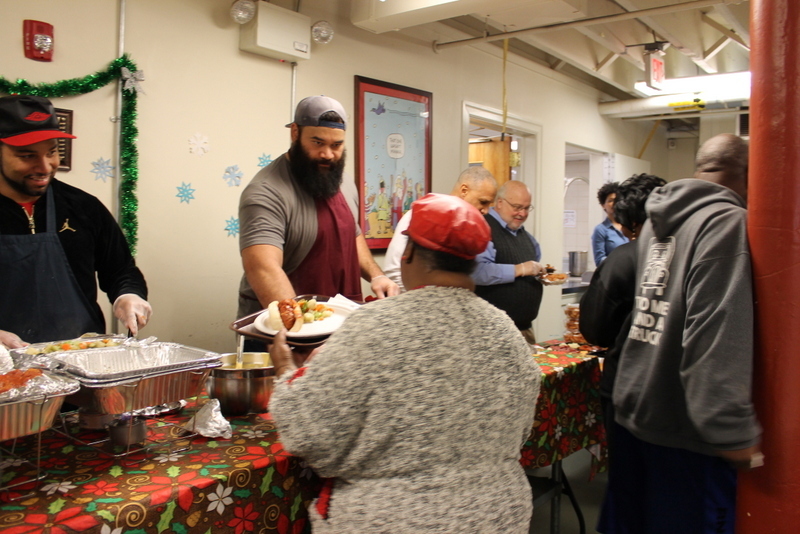 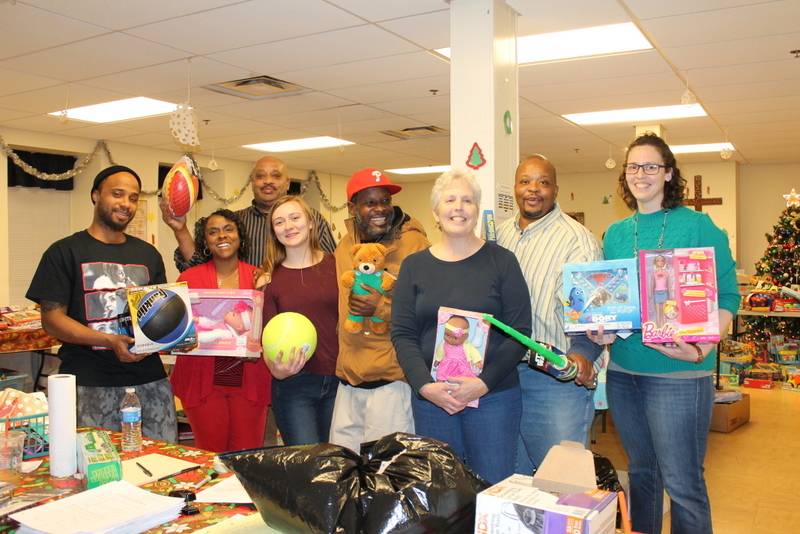 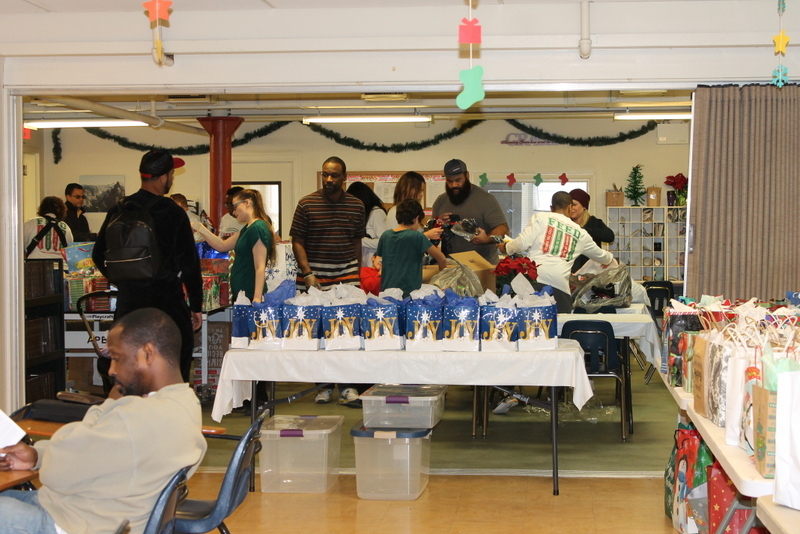 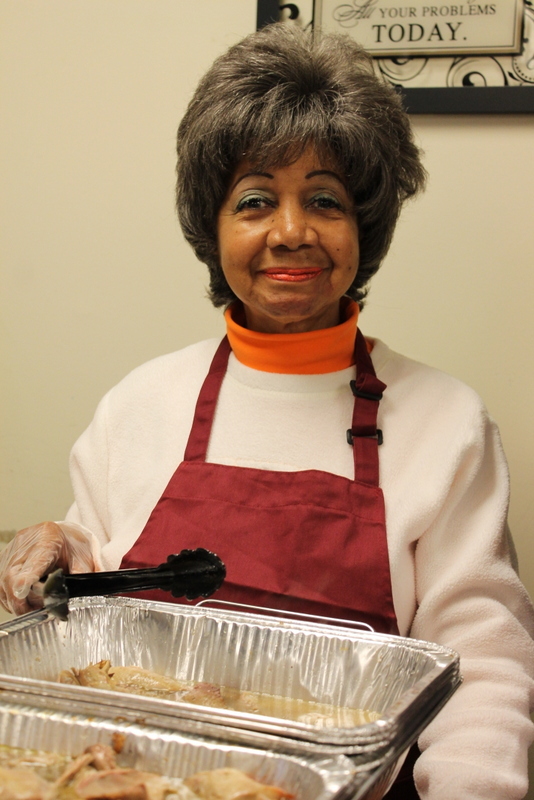 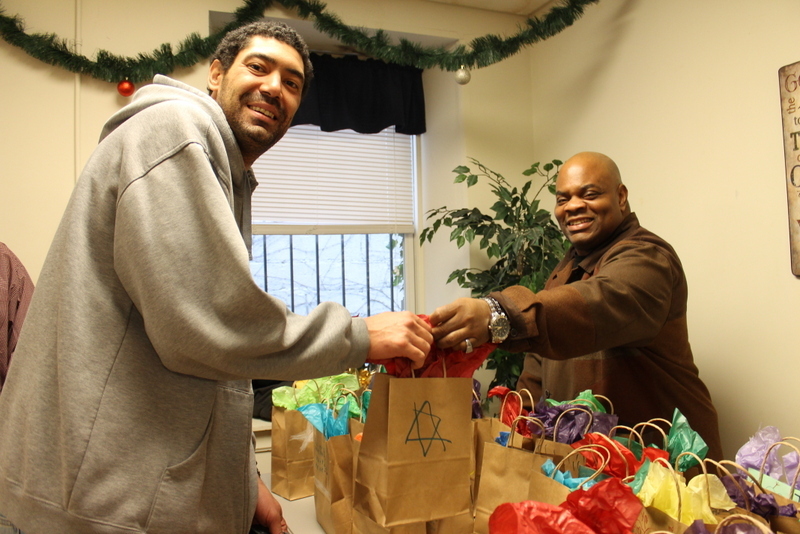 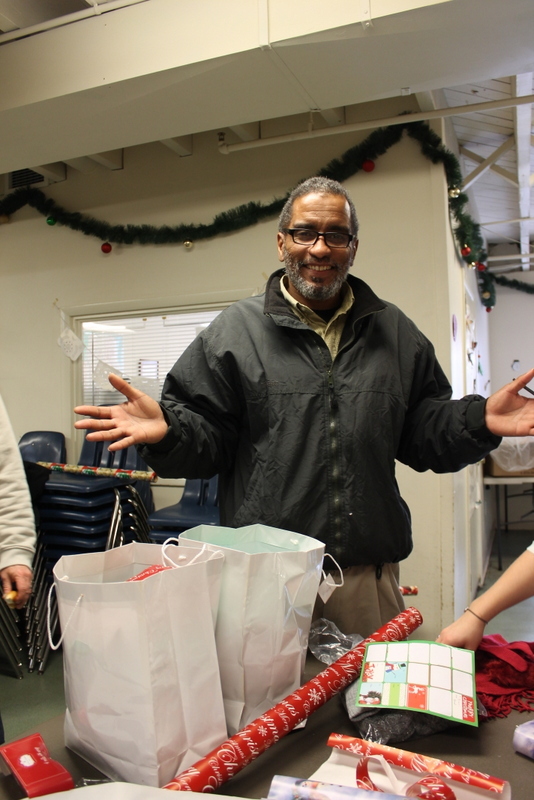 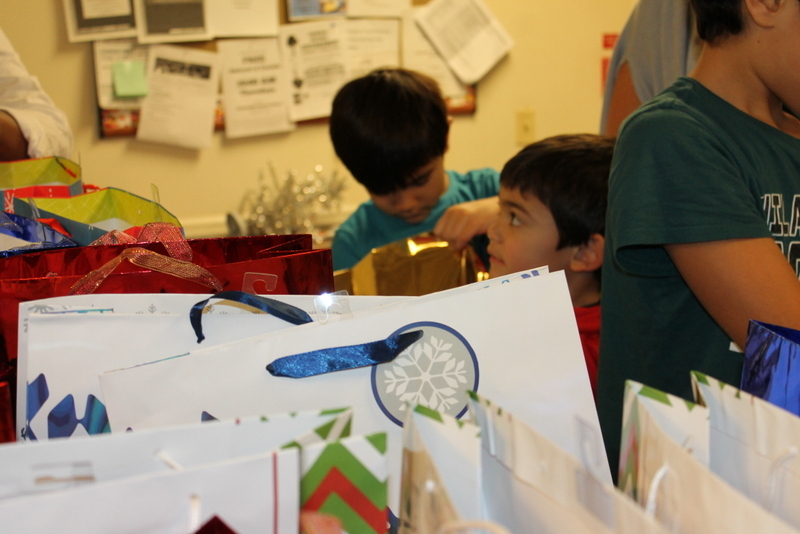 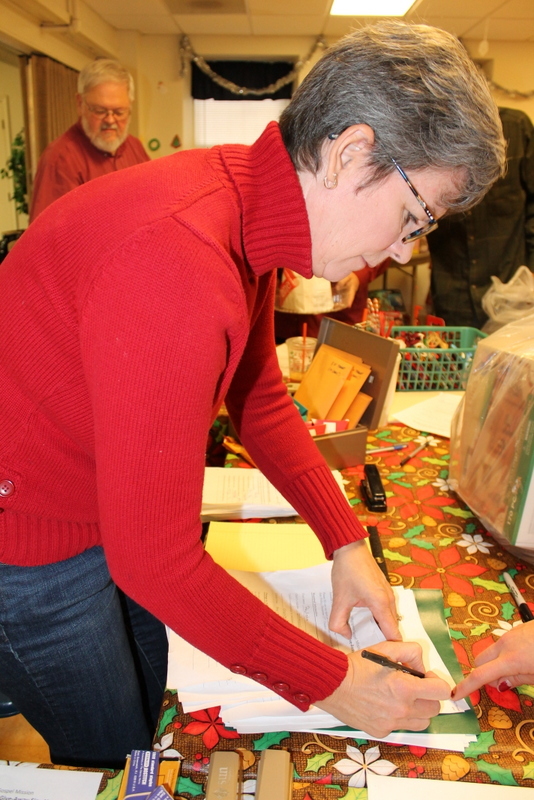 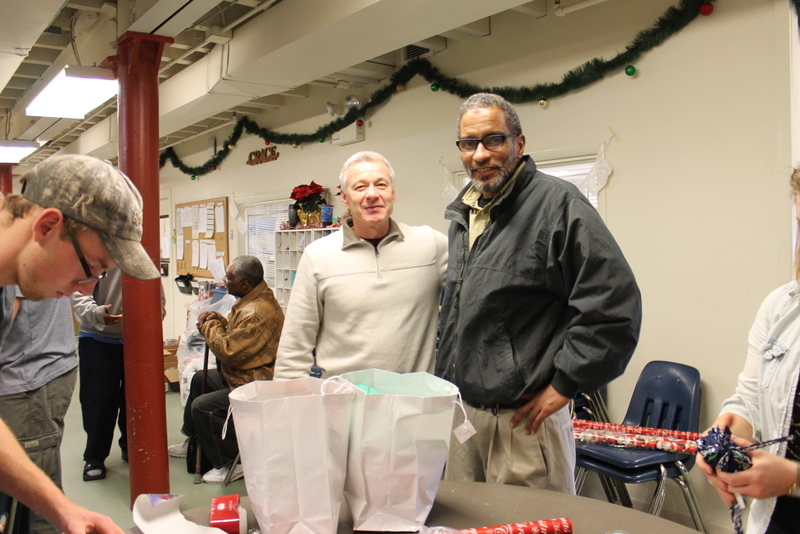 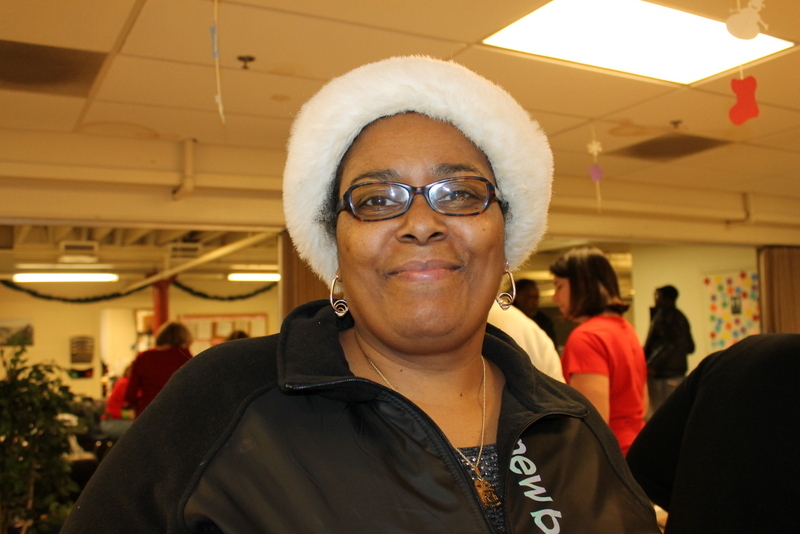 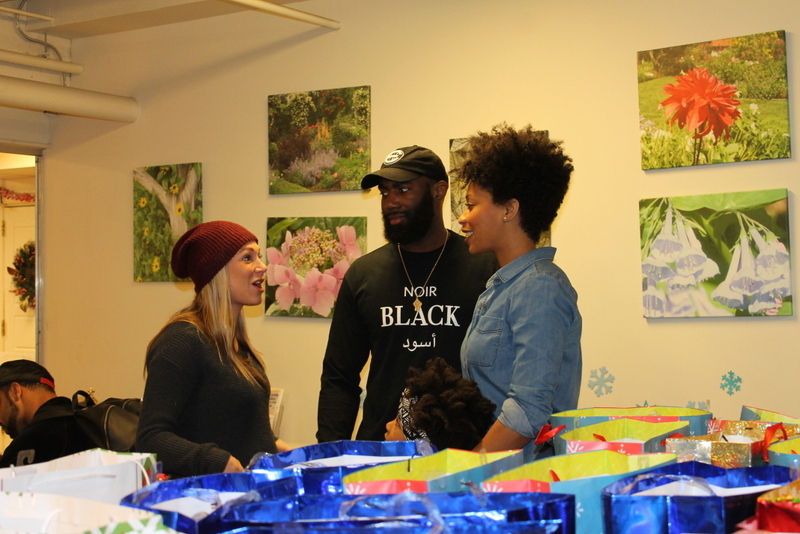 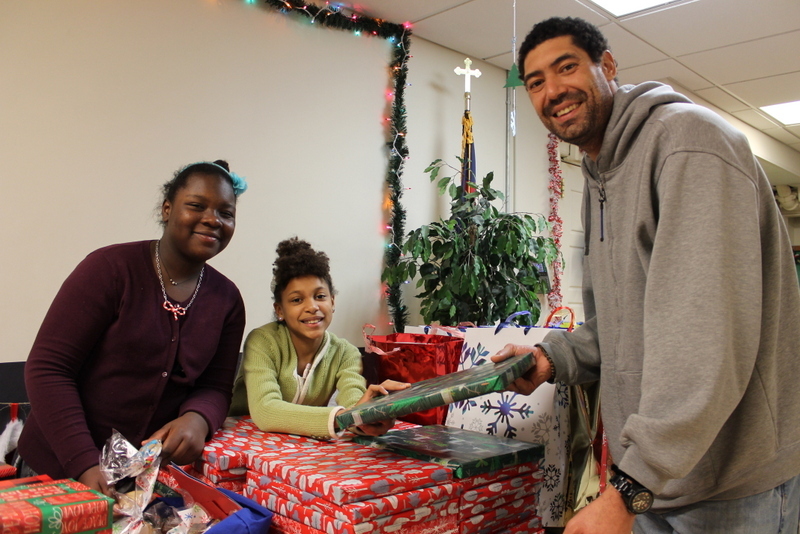 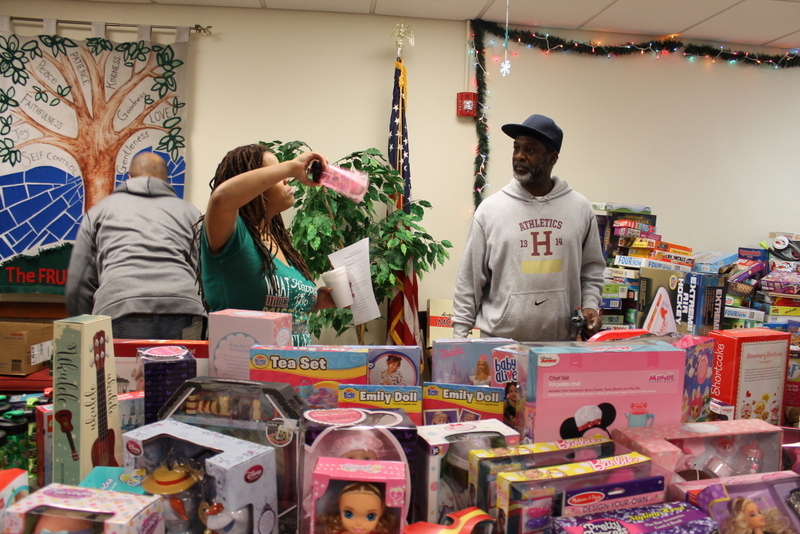 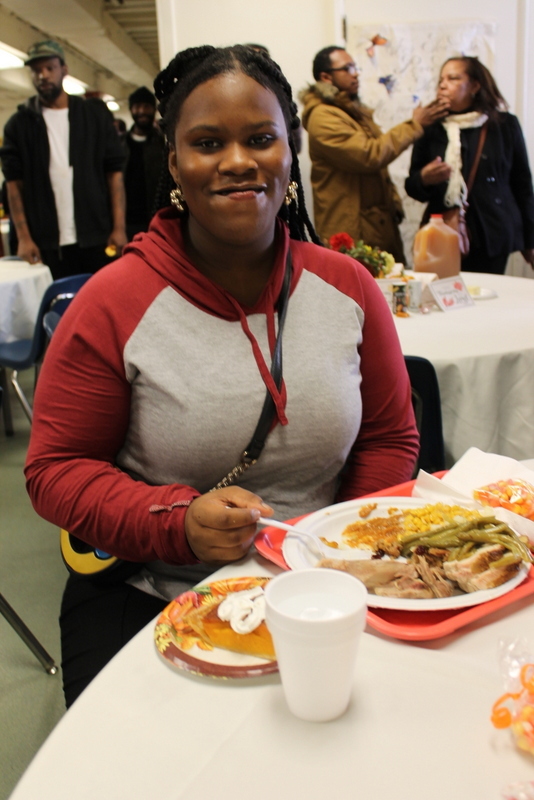 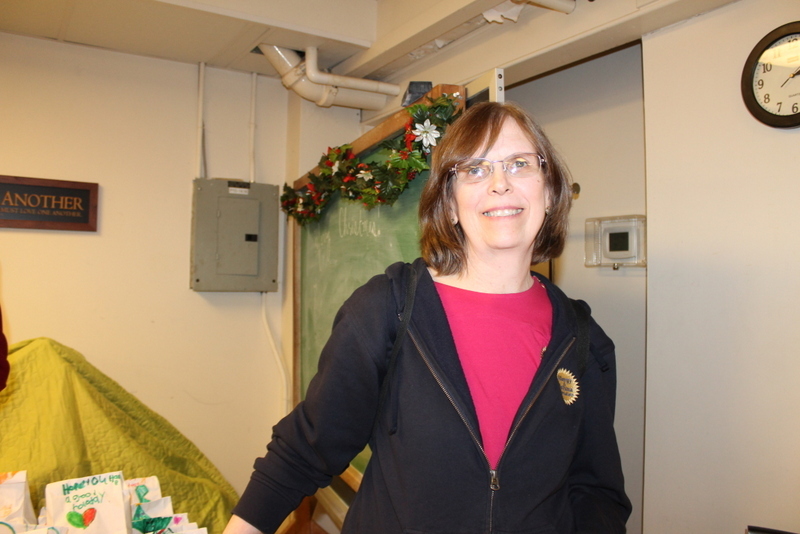 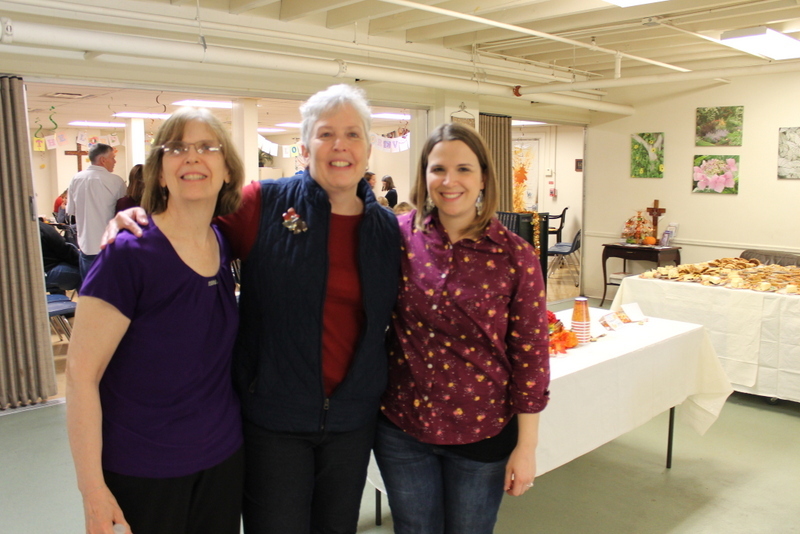 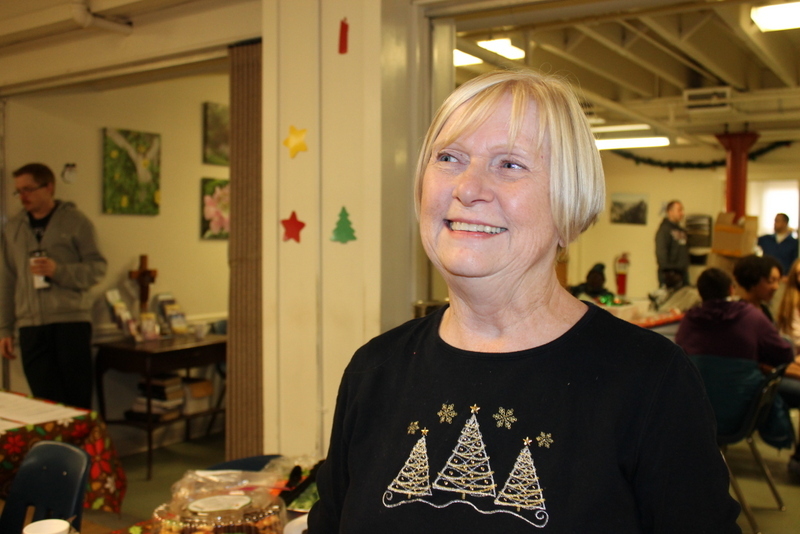 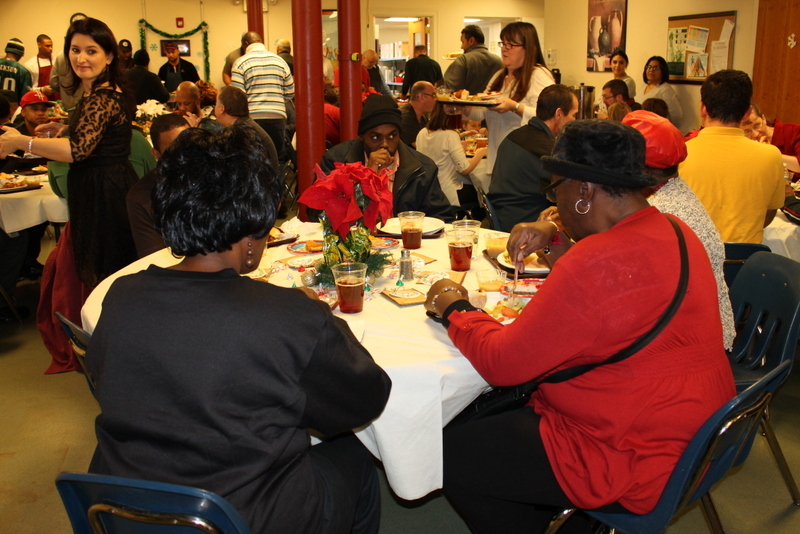 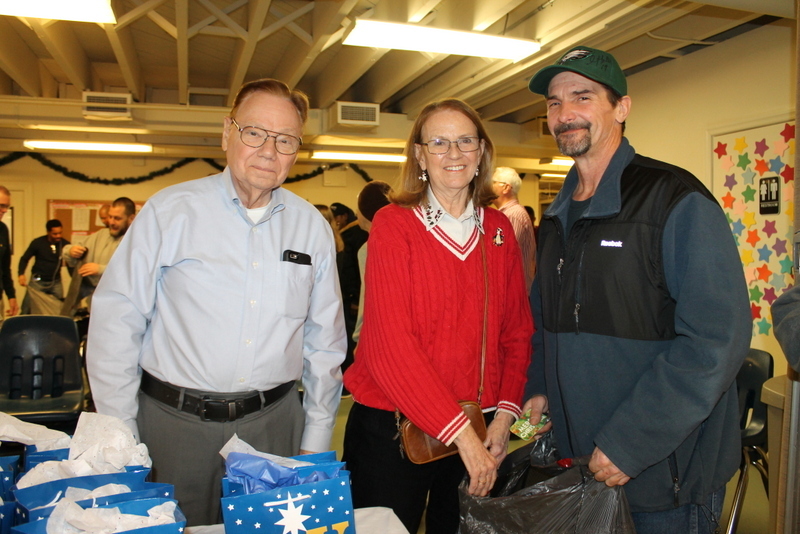 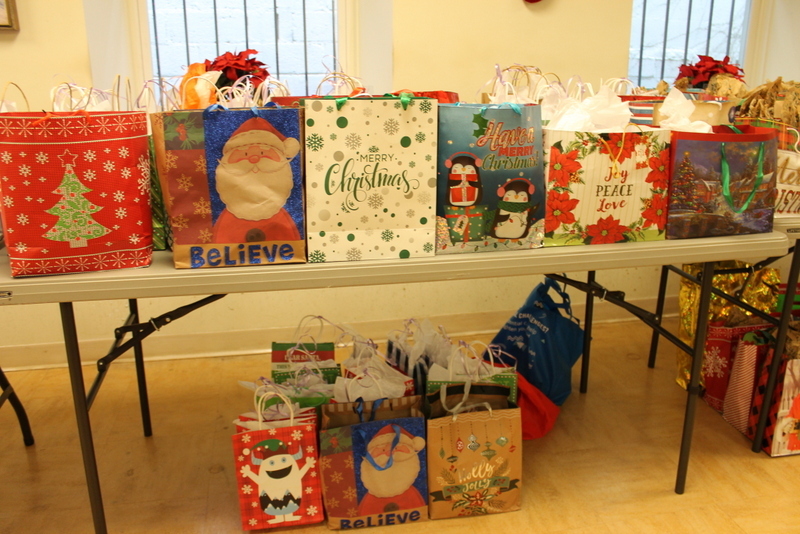 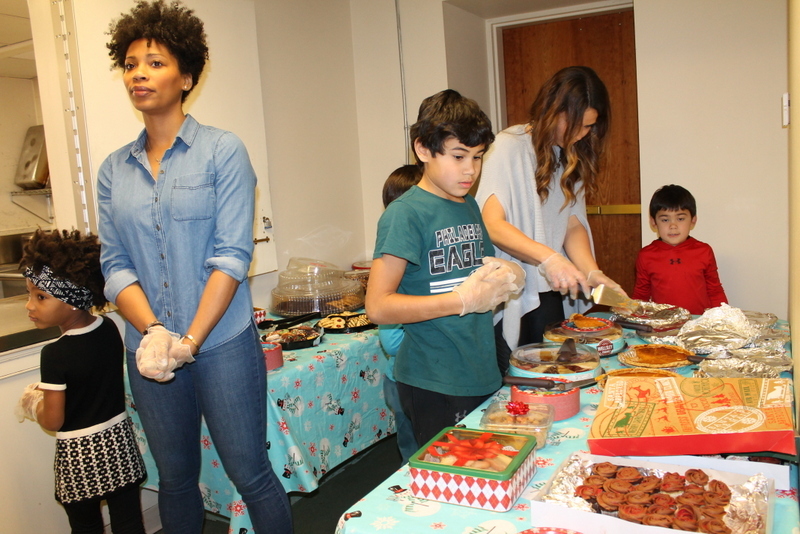 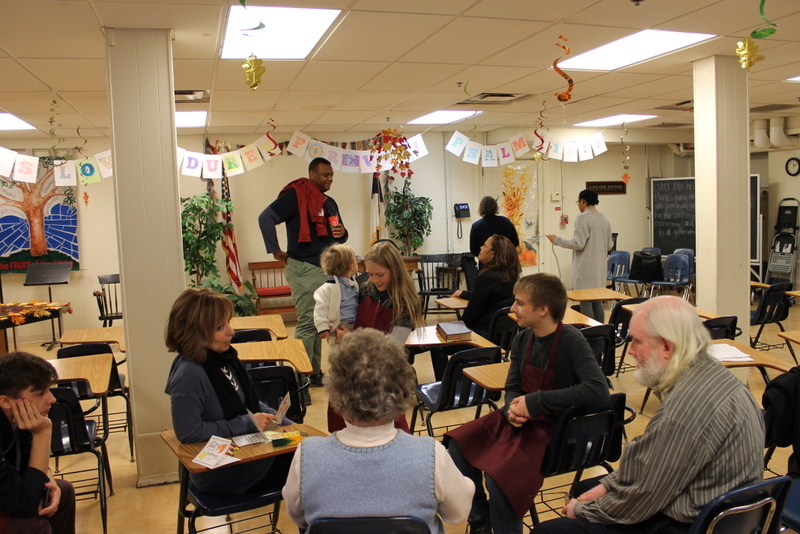 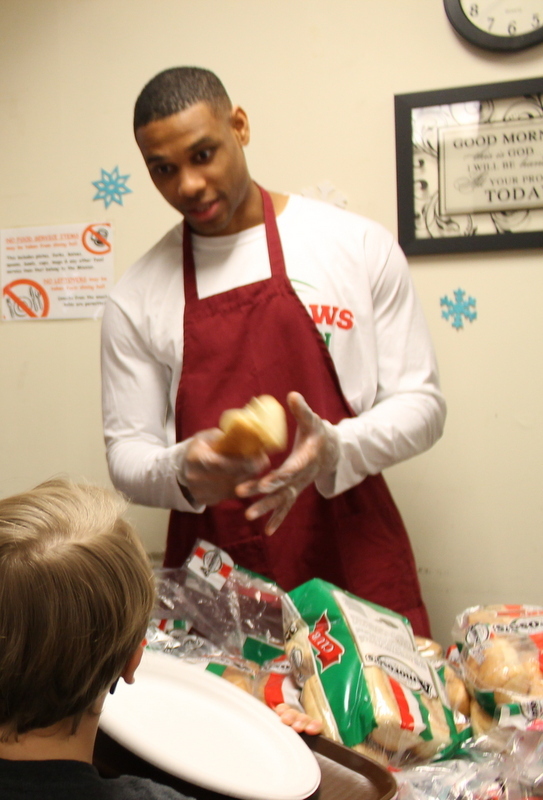 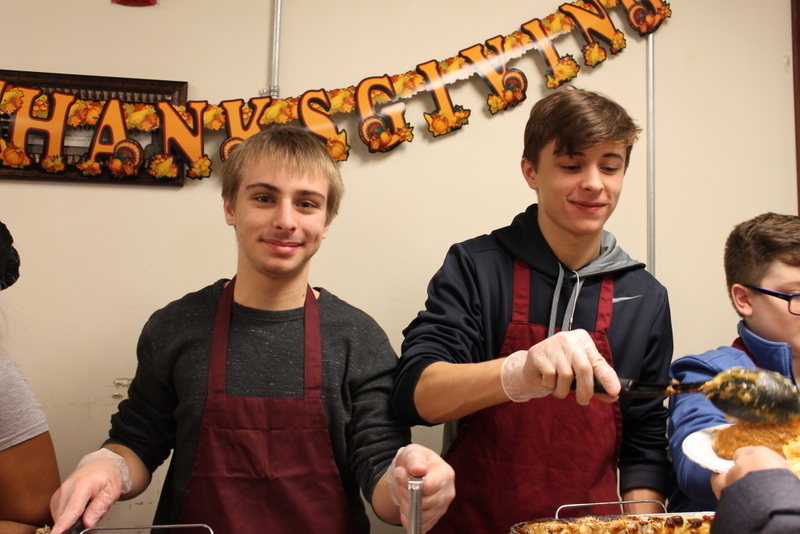 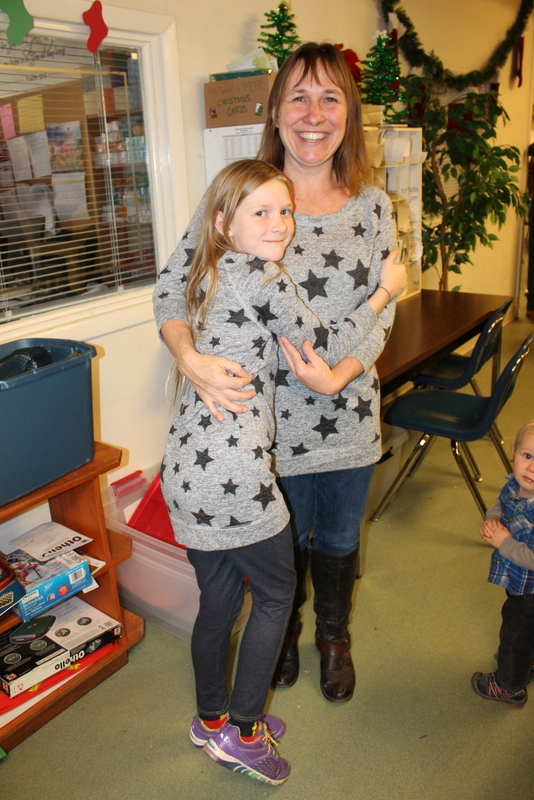 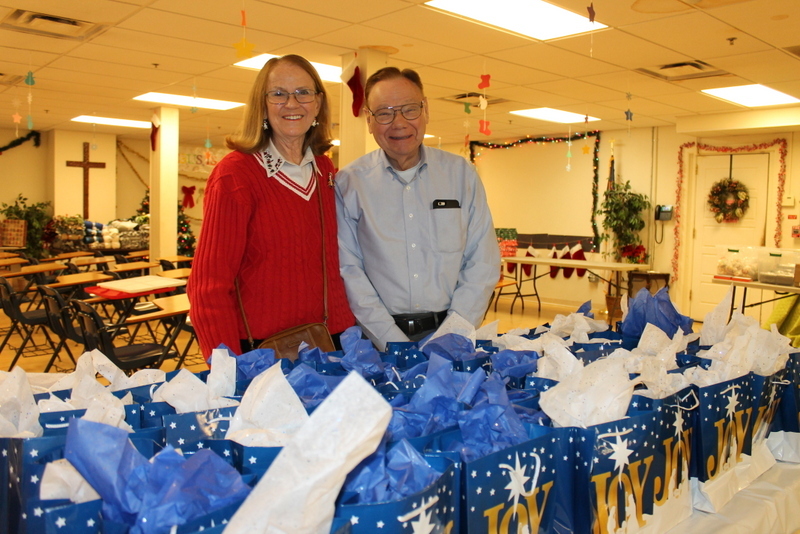 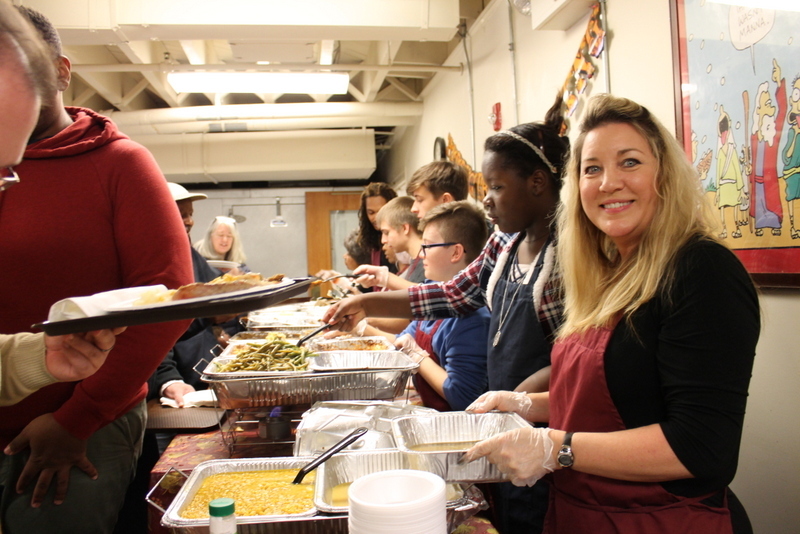 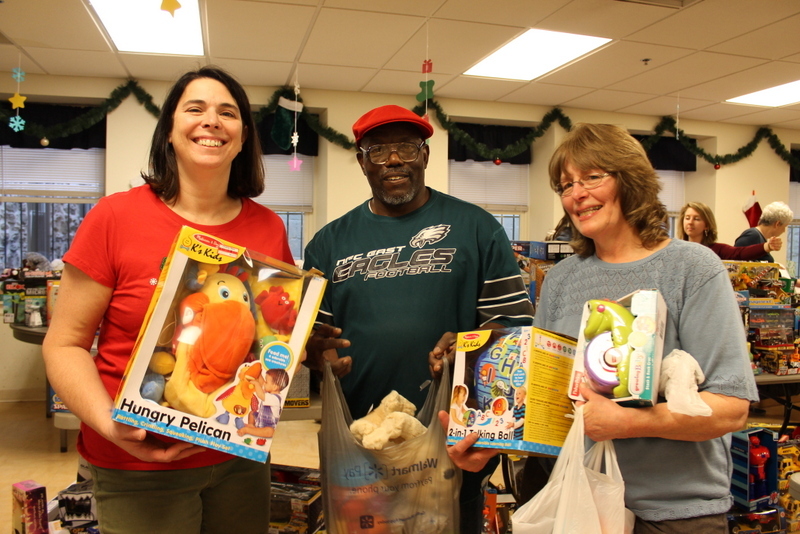 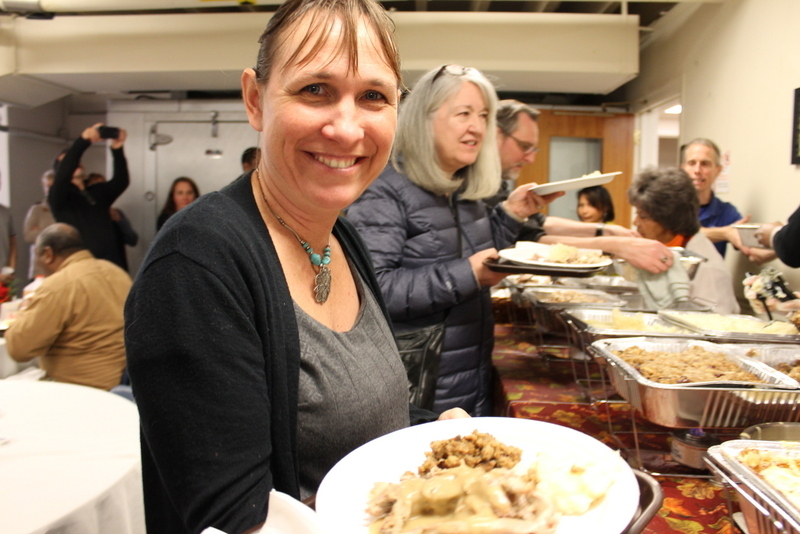 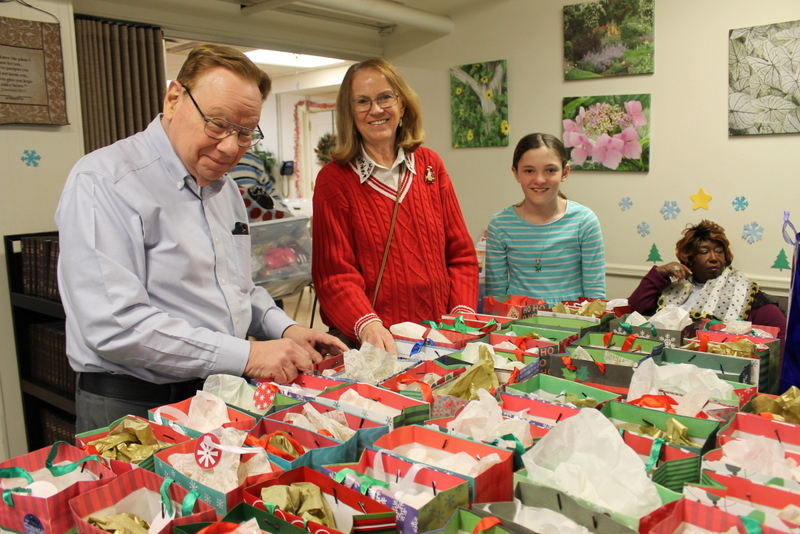 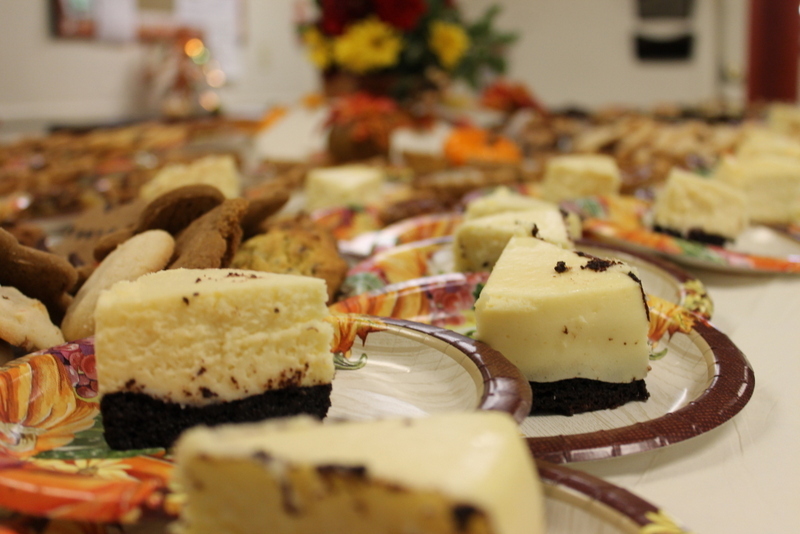 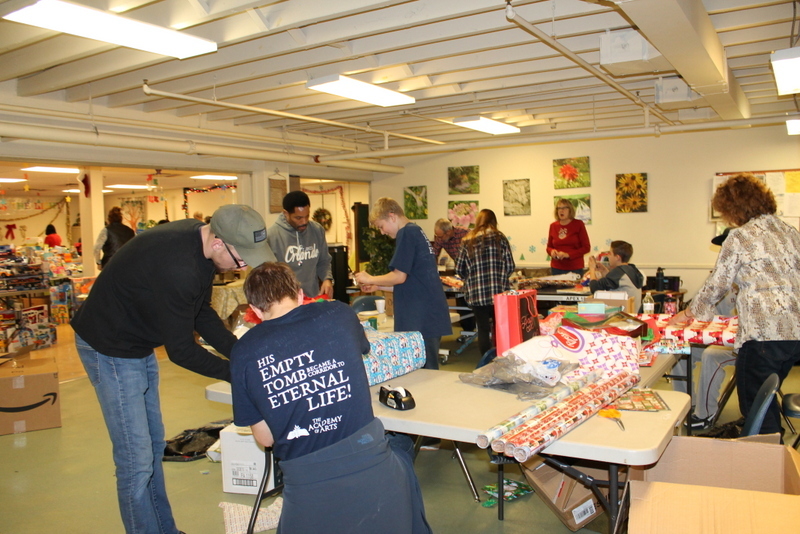 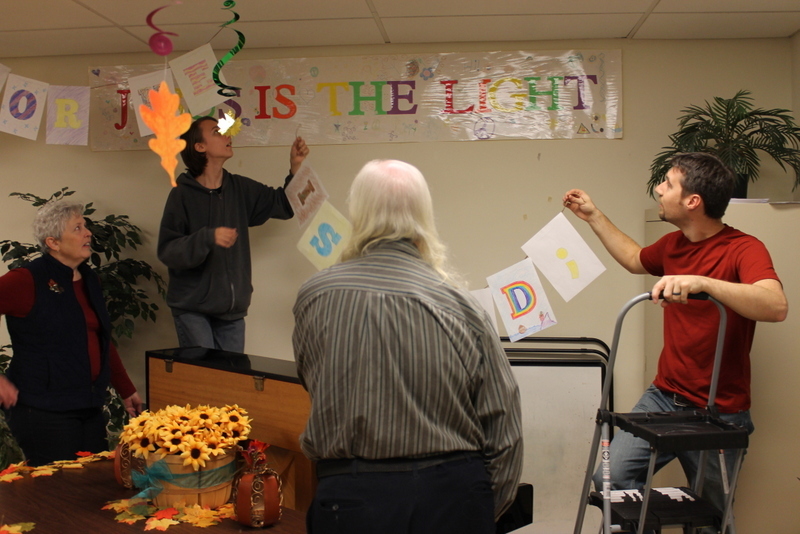 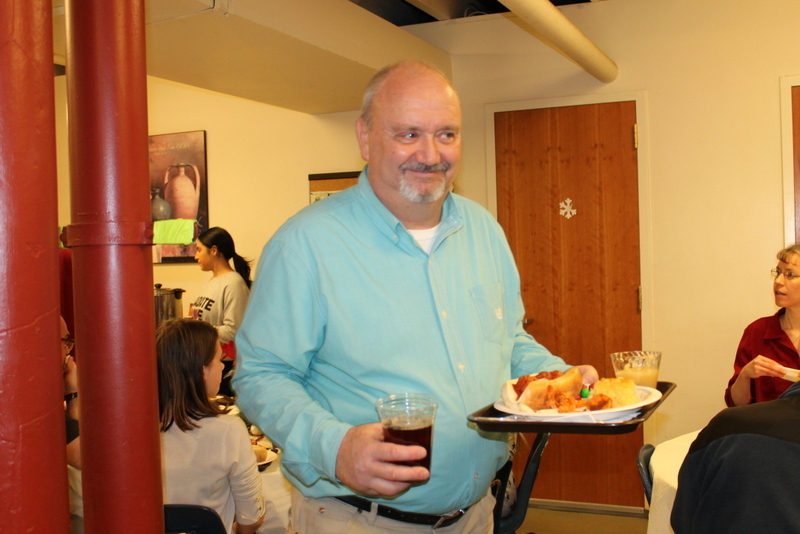 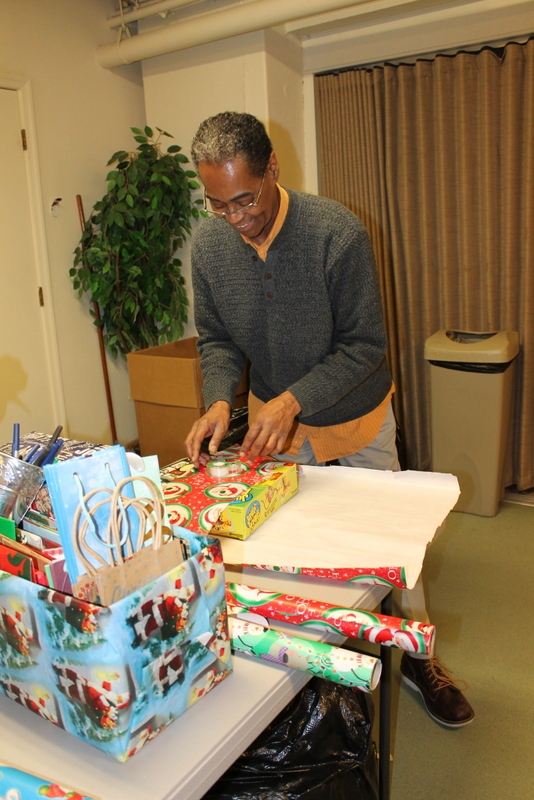 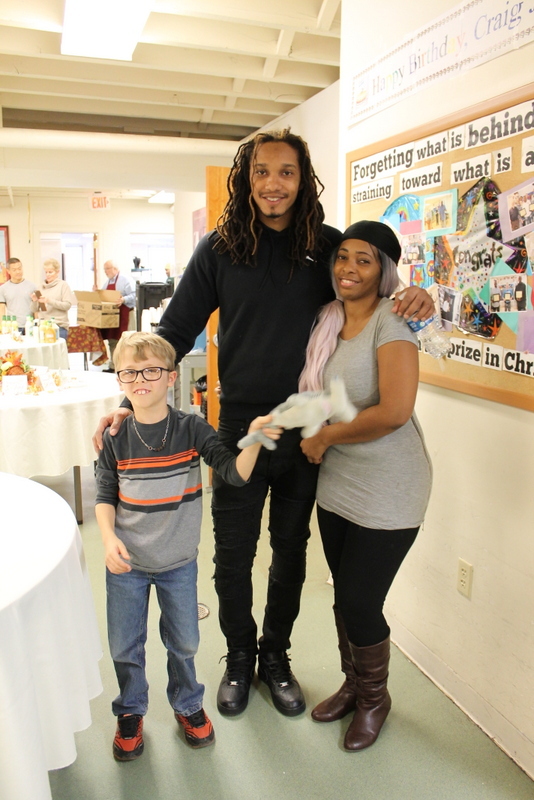 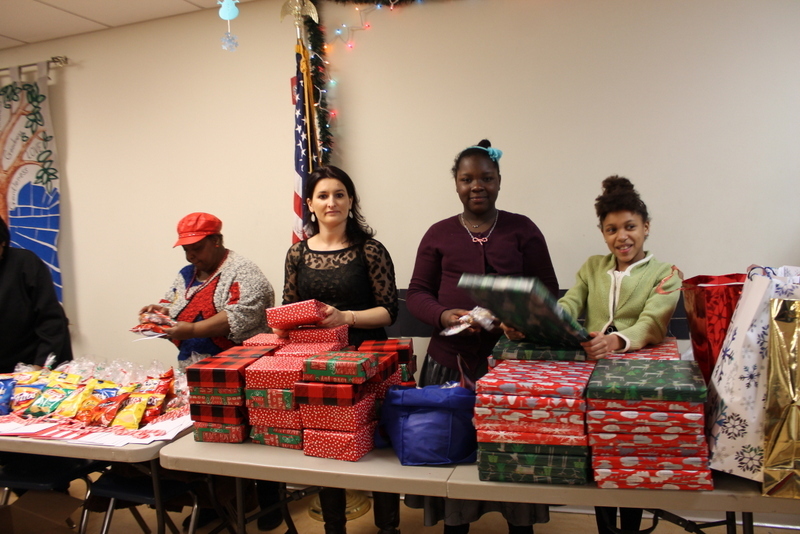 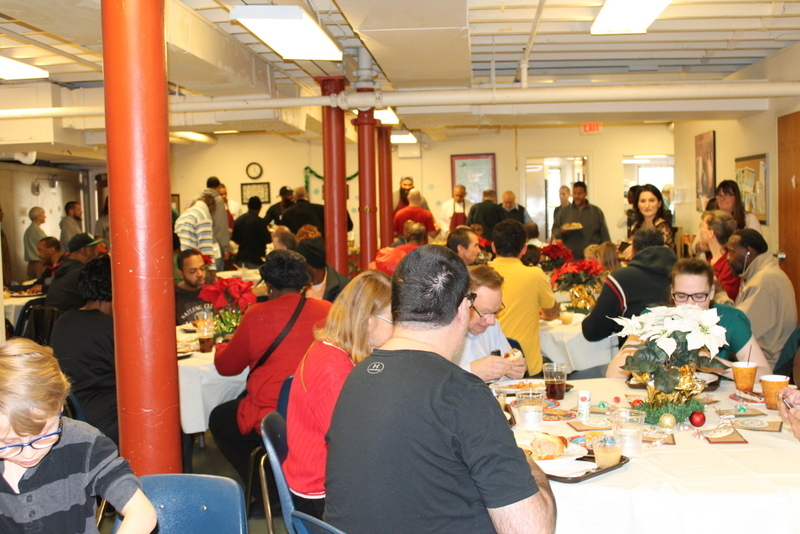 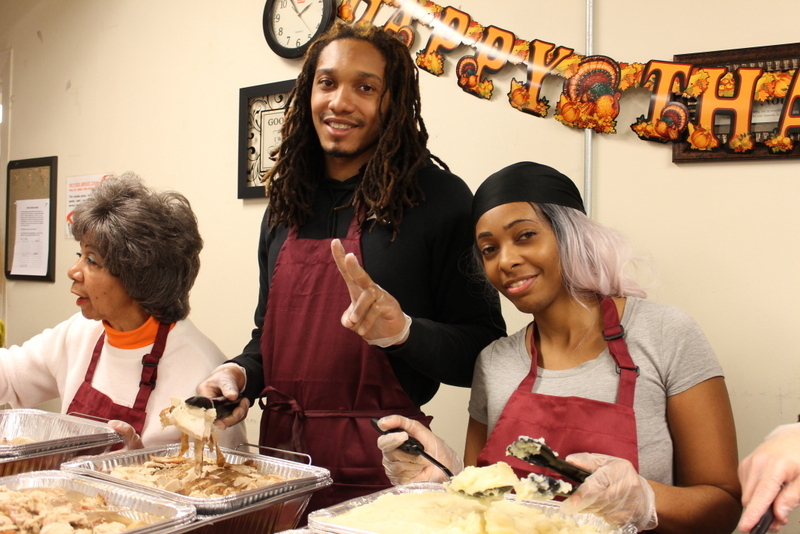 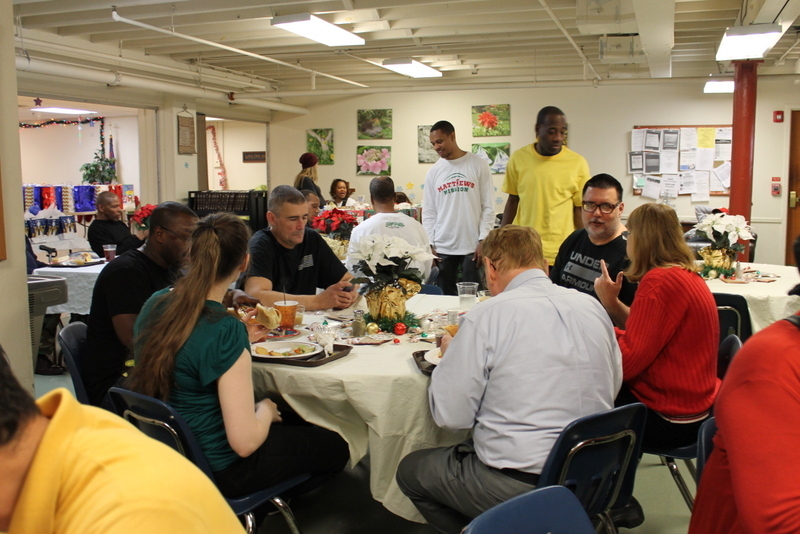 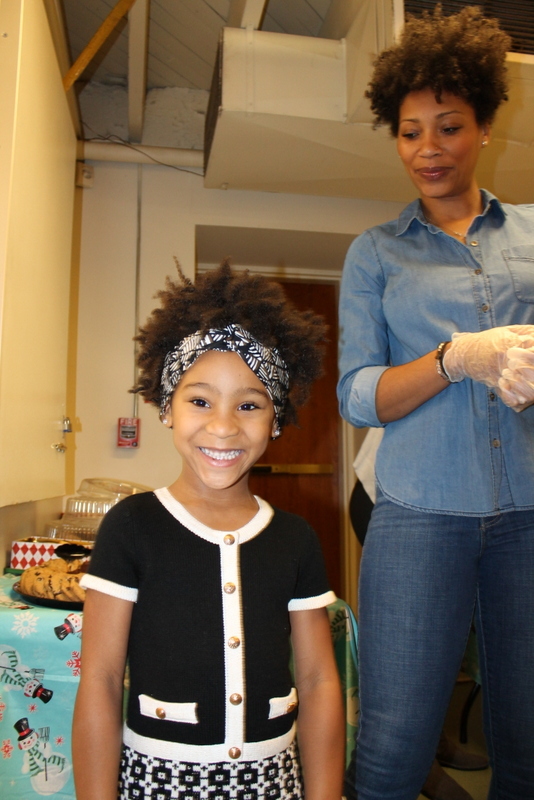 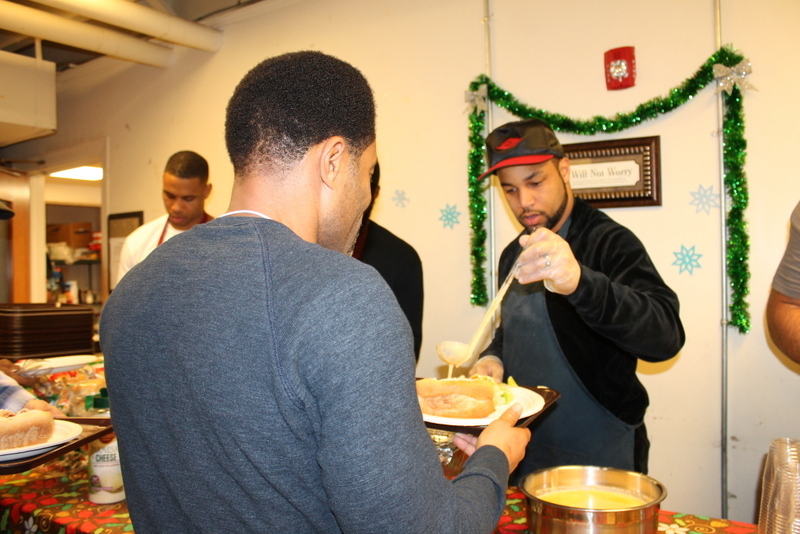 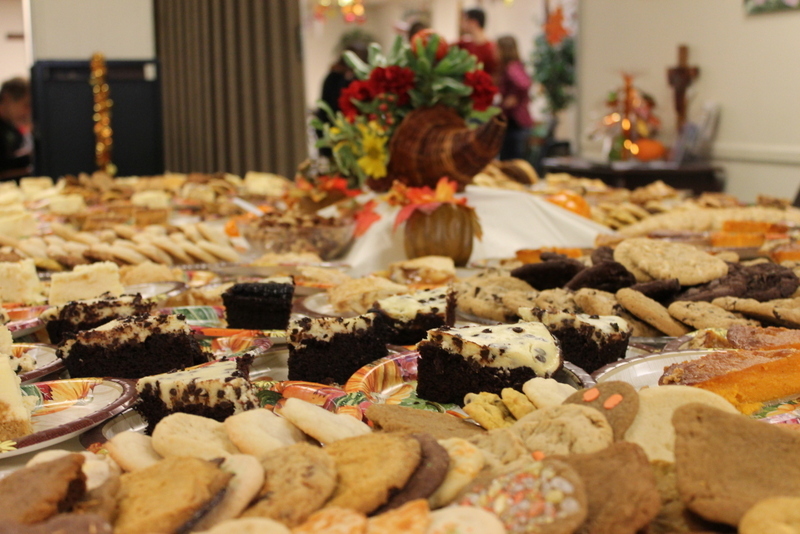 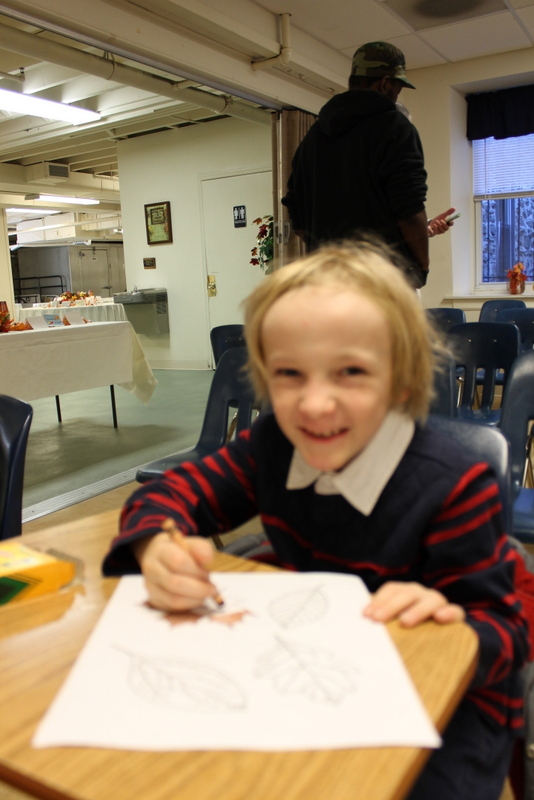 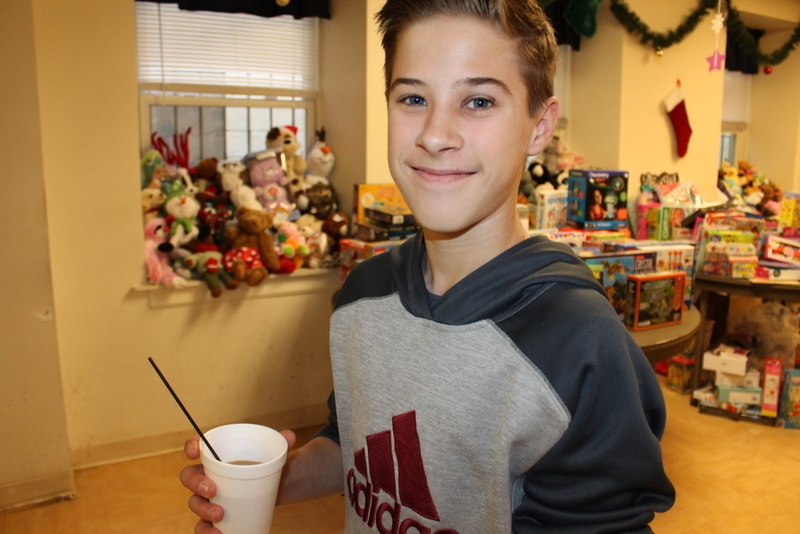 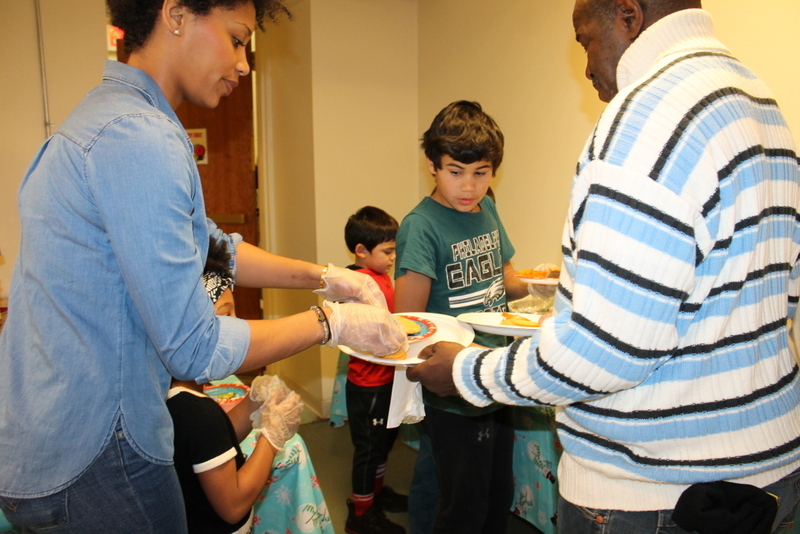 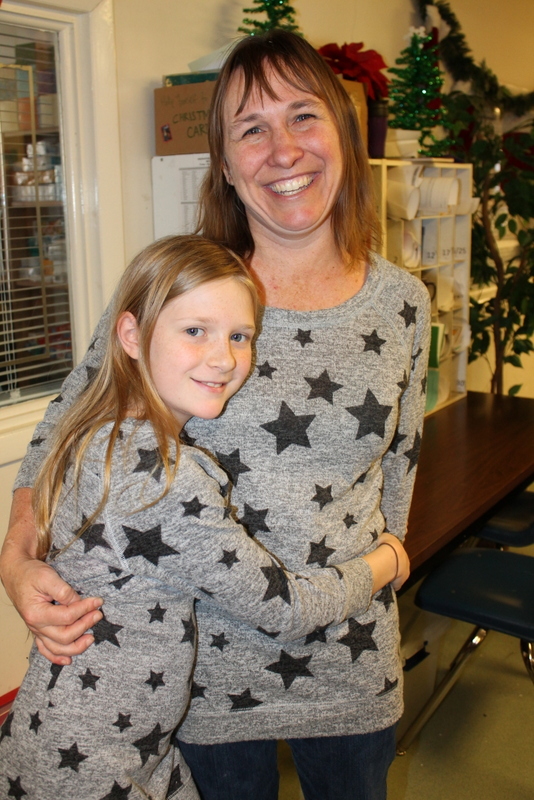 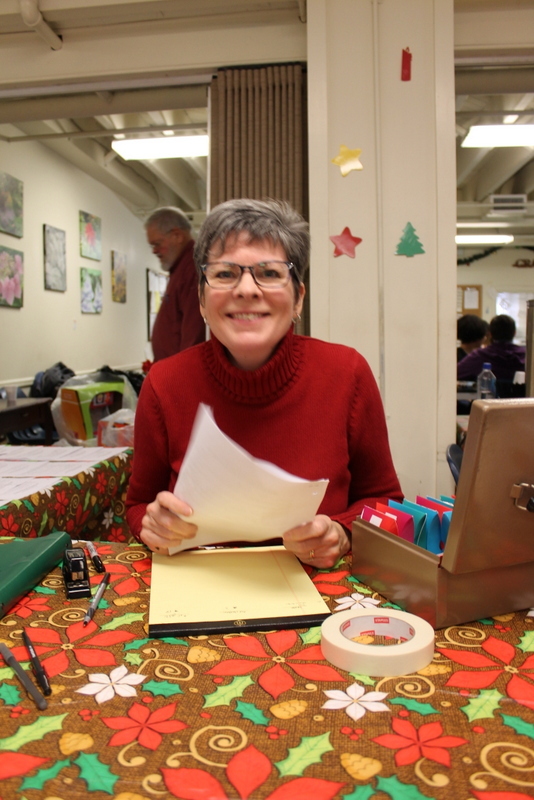 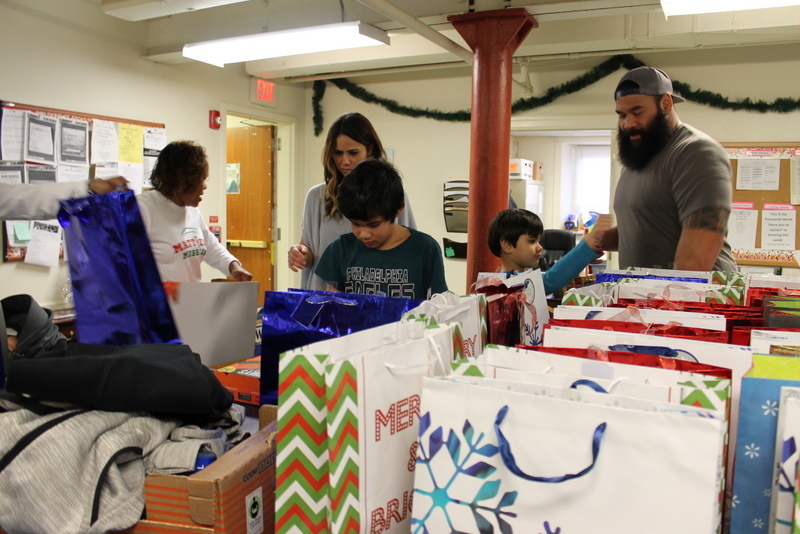 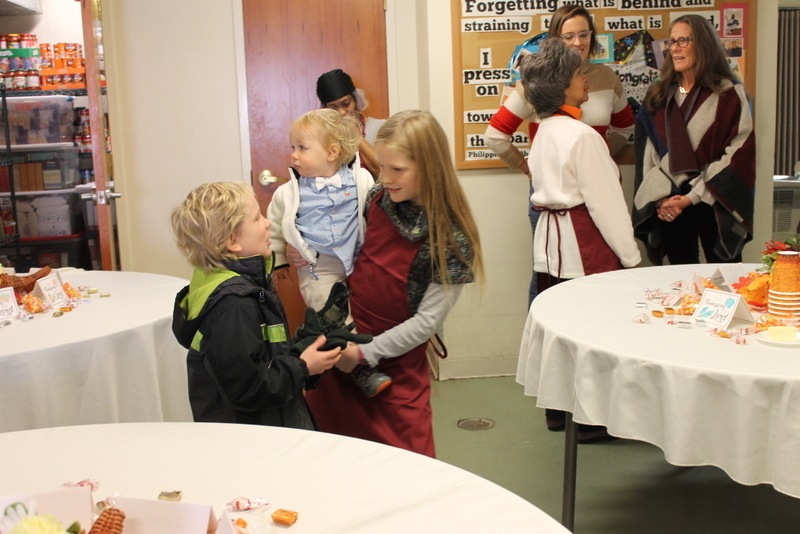 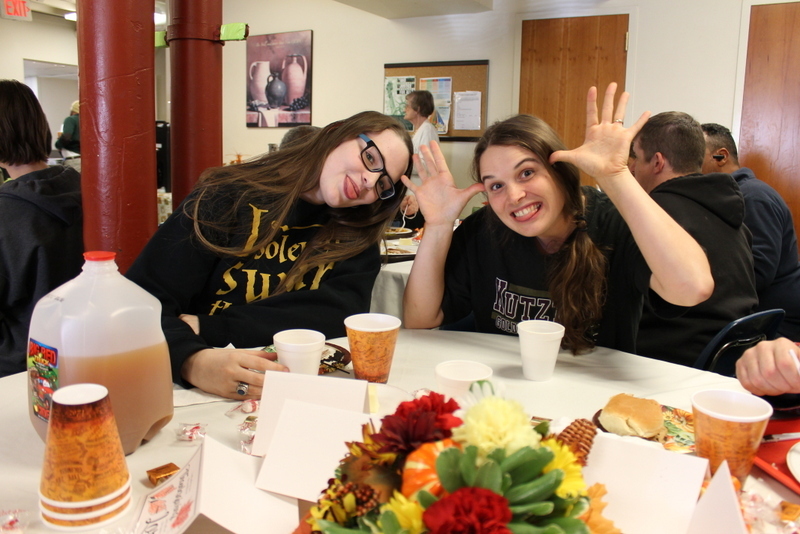 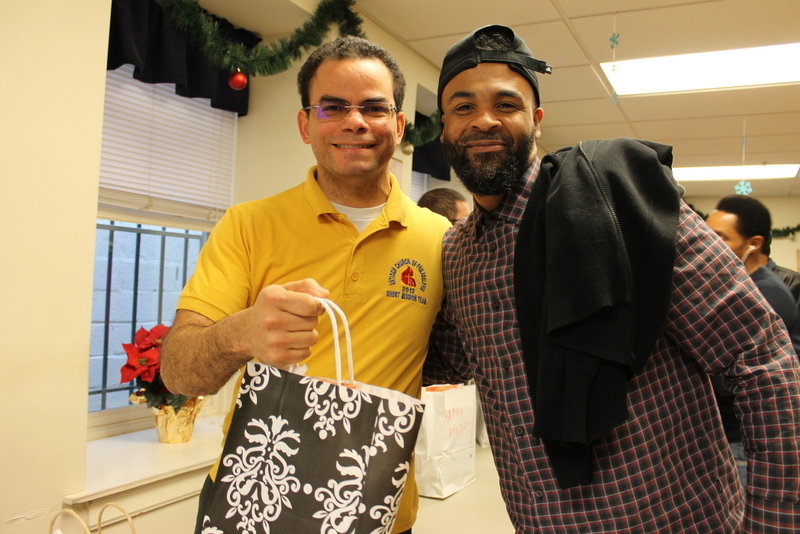 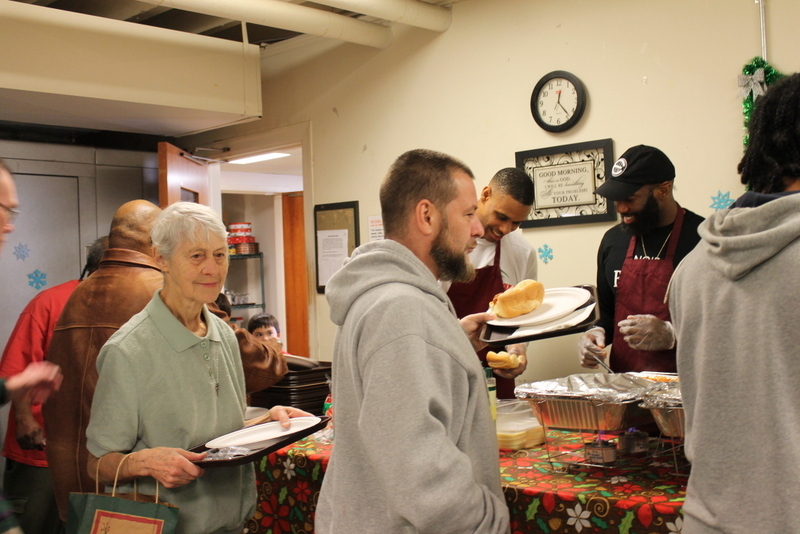 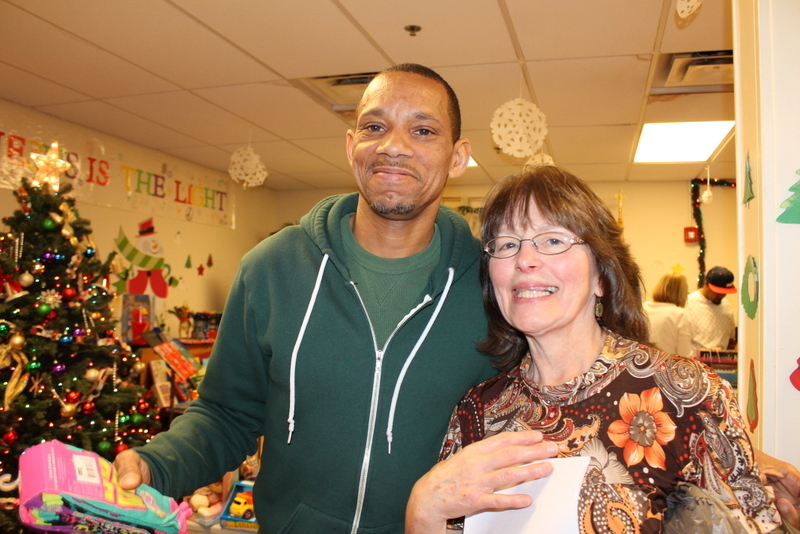 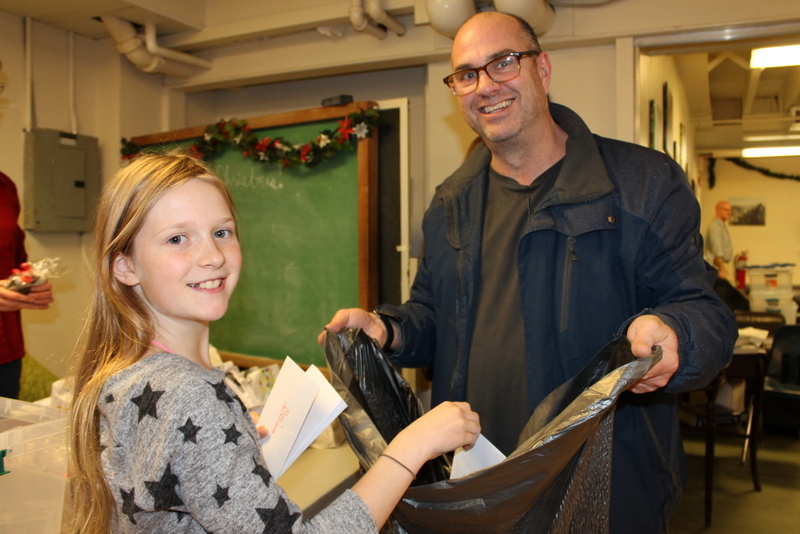 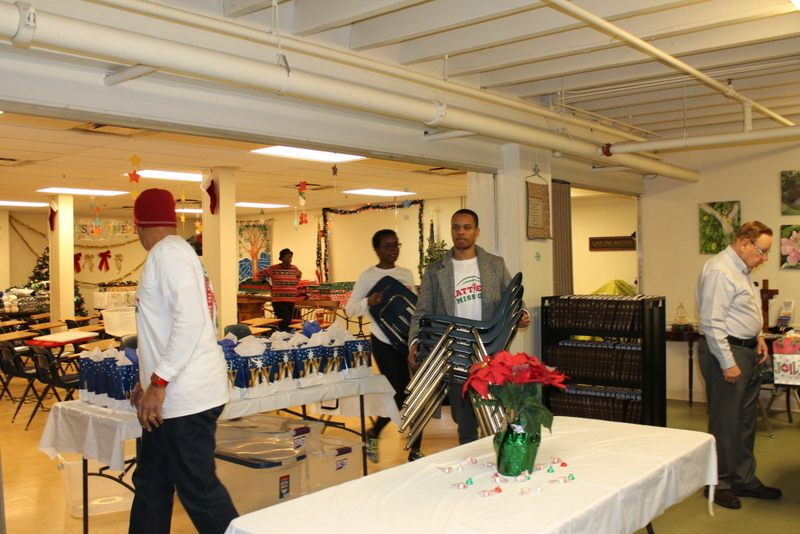 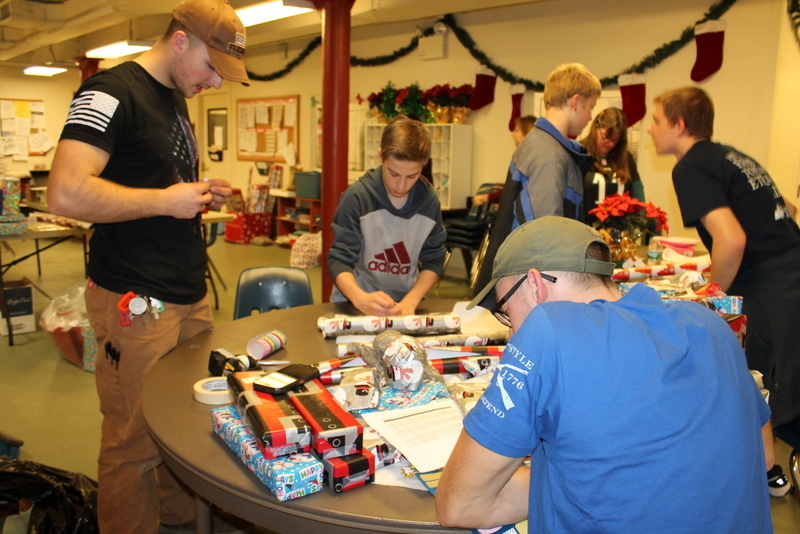 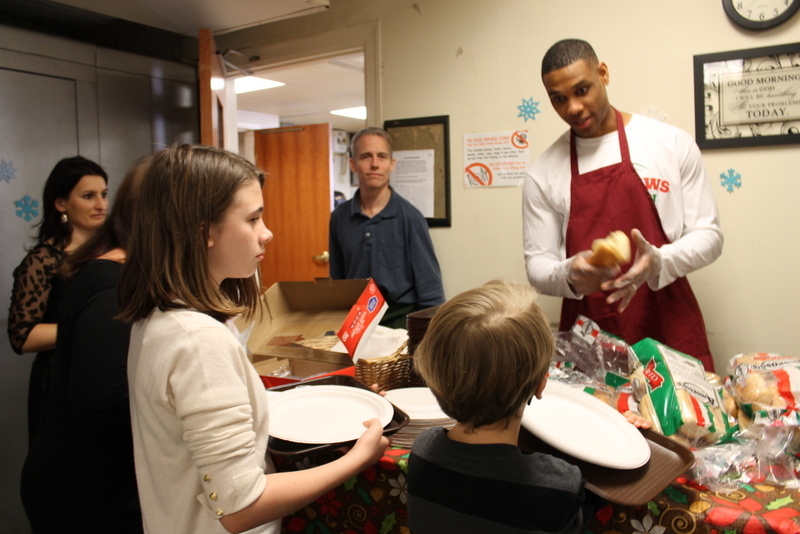 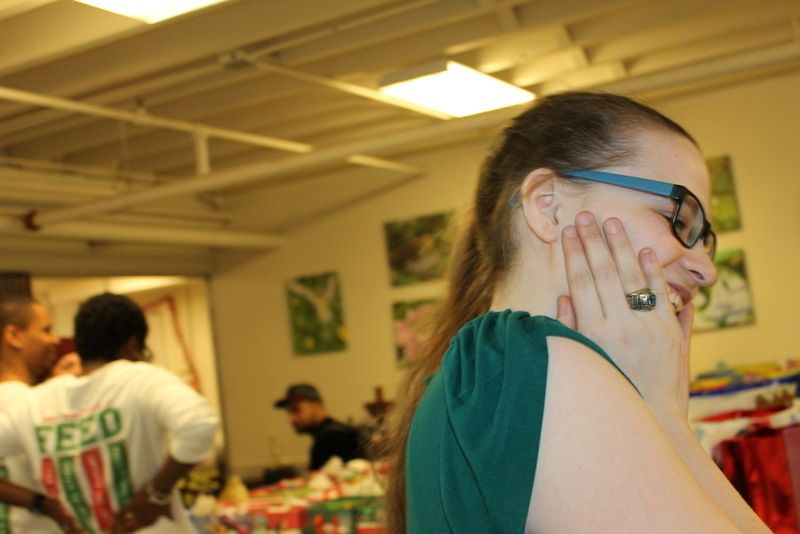 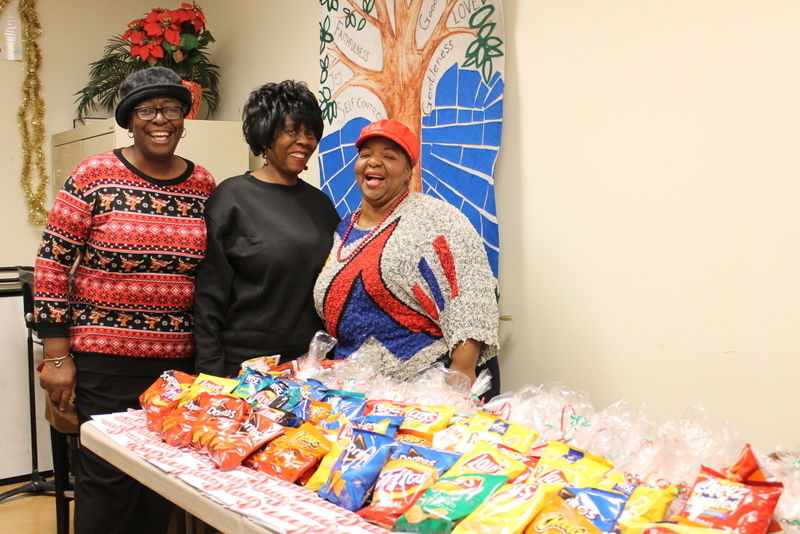 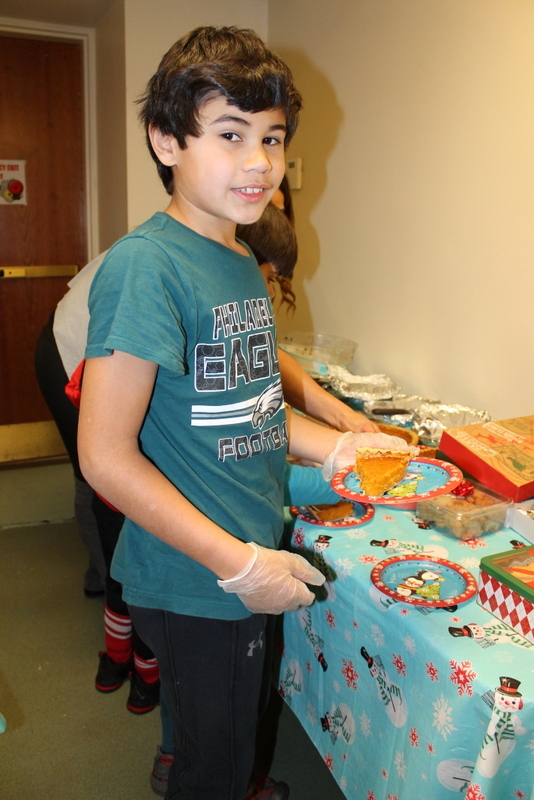 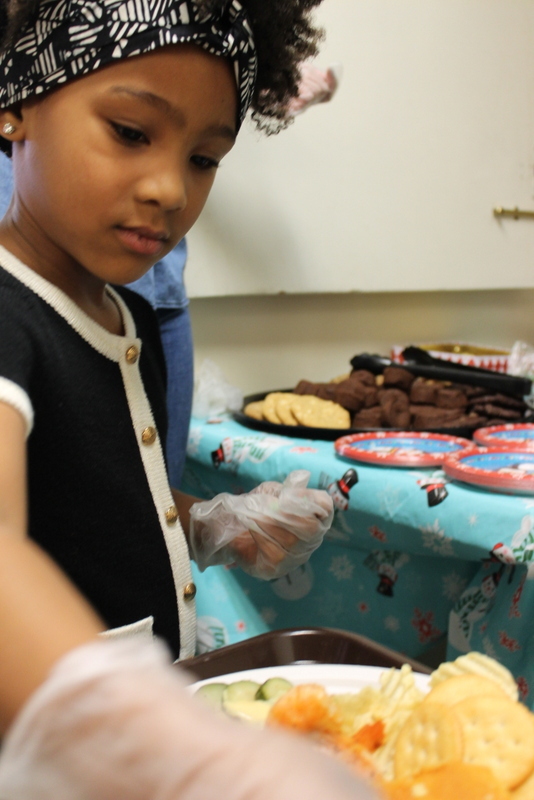 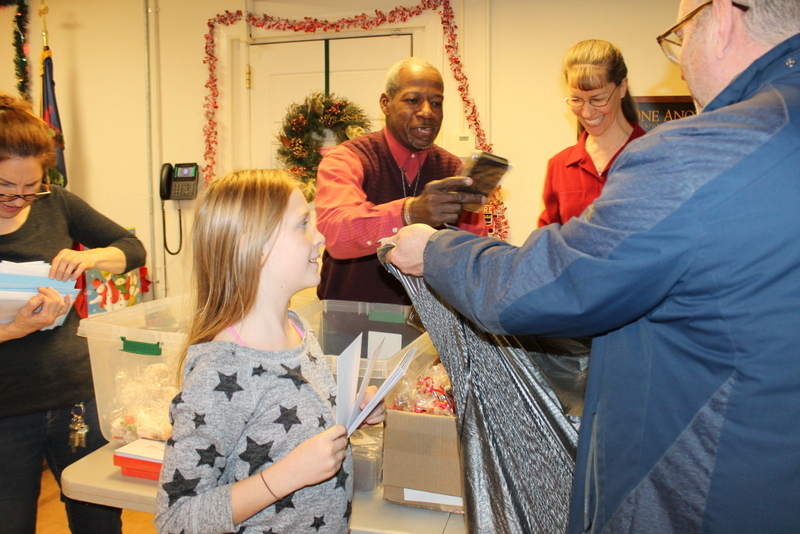 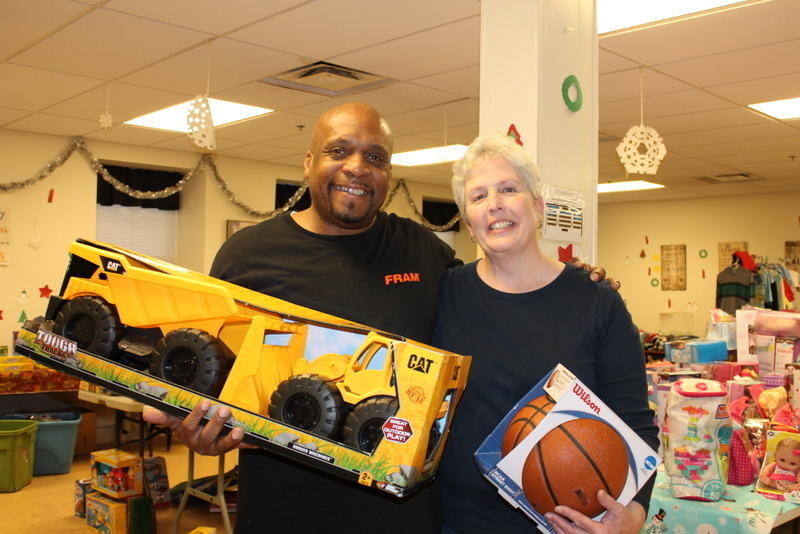 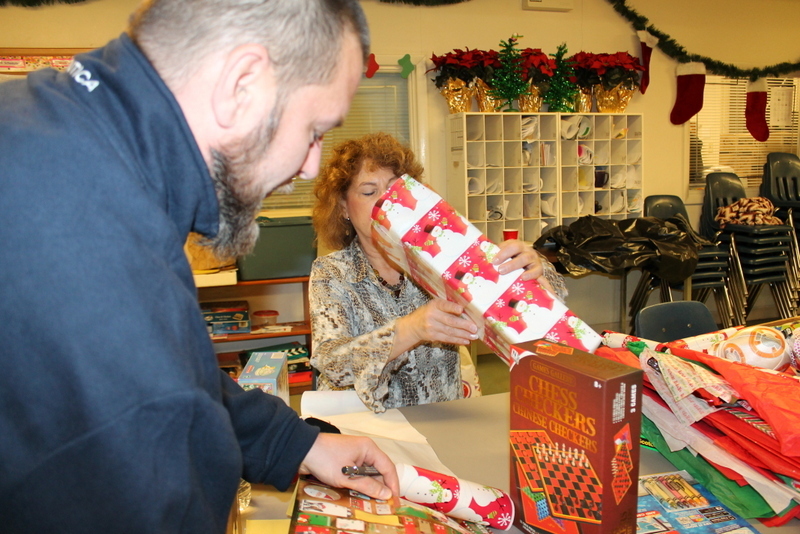 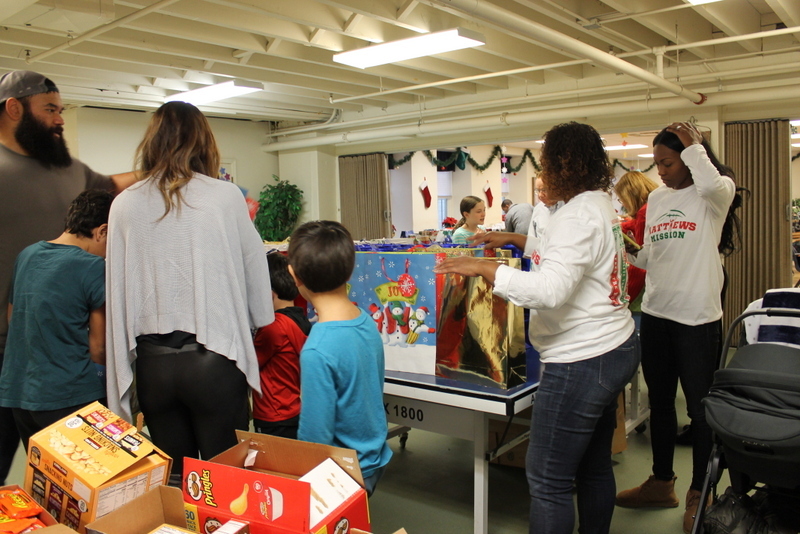 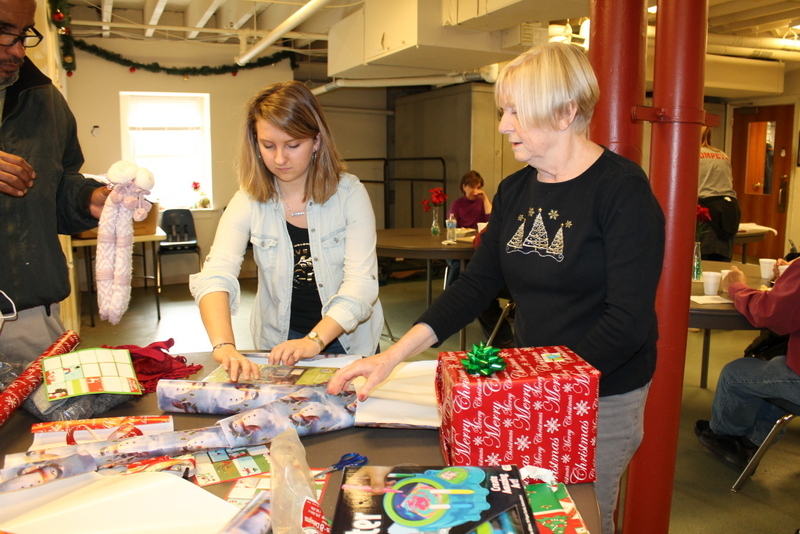 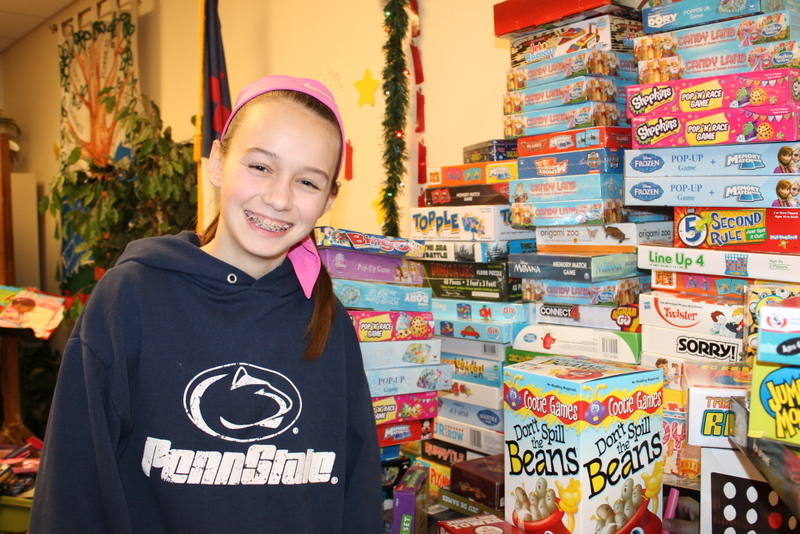 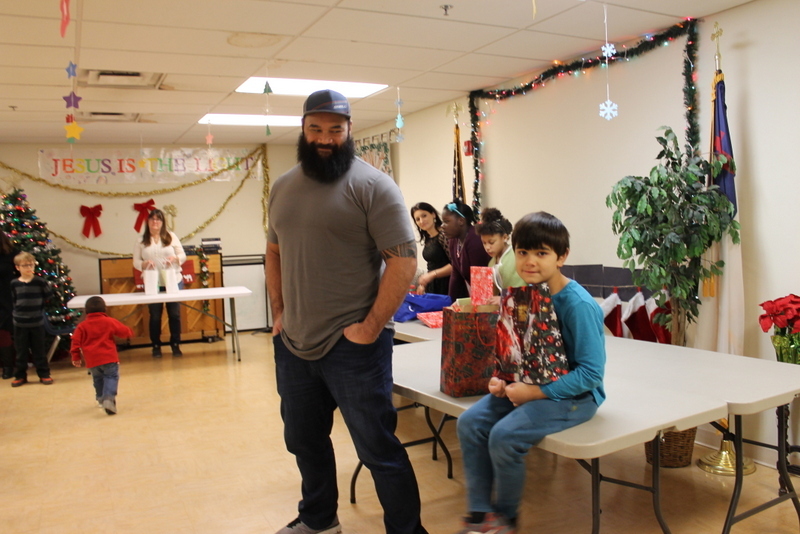 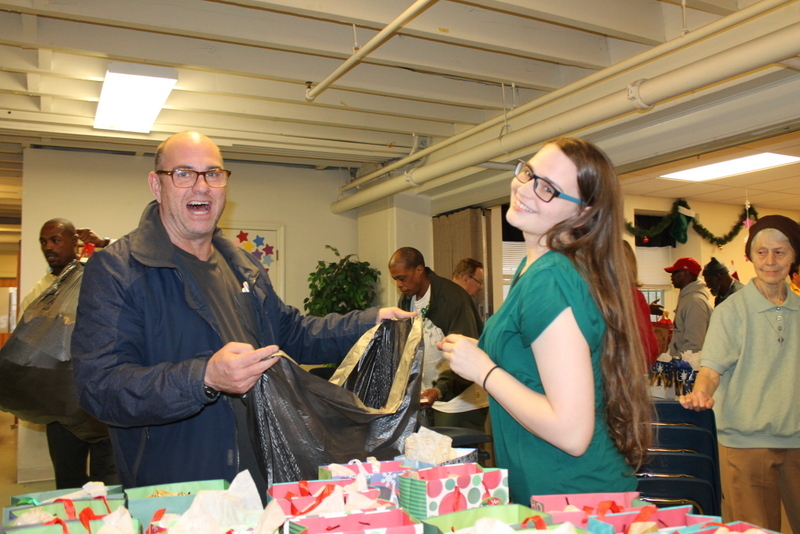 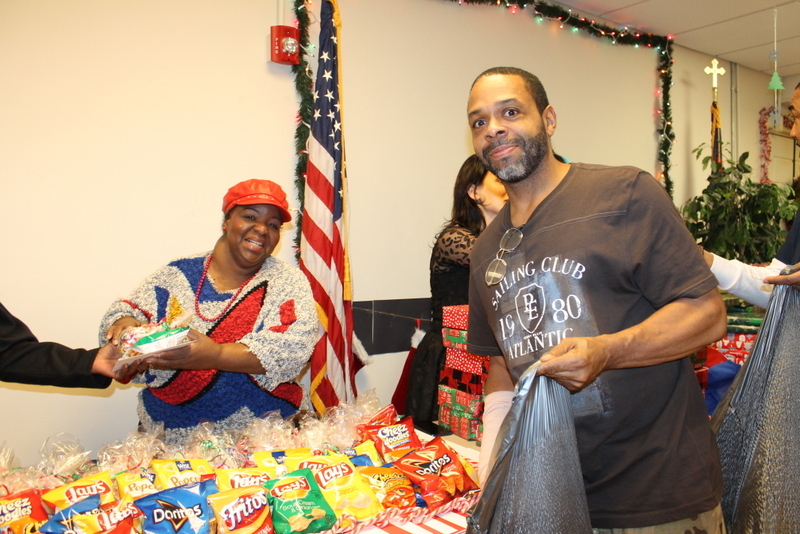 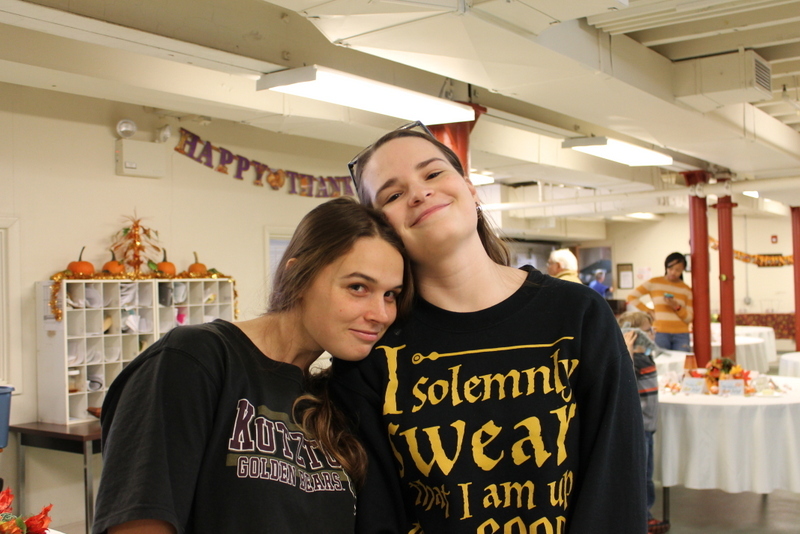 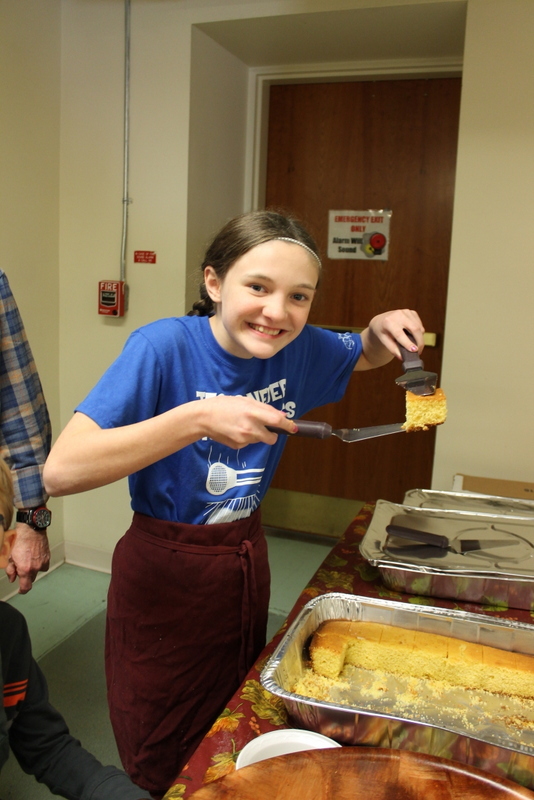 As we prepared the food and arranged all the presents for our residents, several volunteers showed up to help. 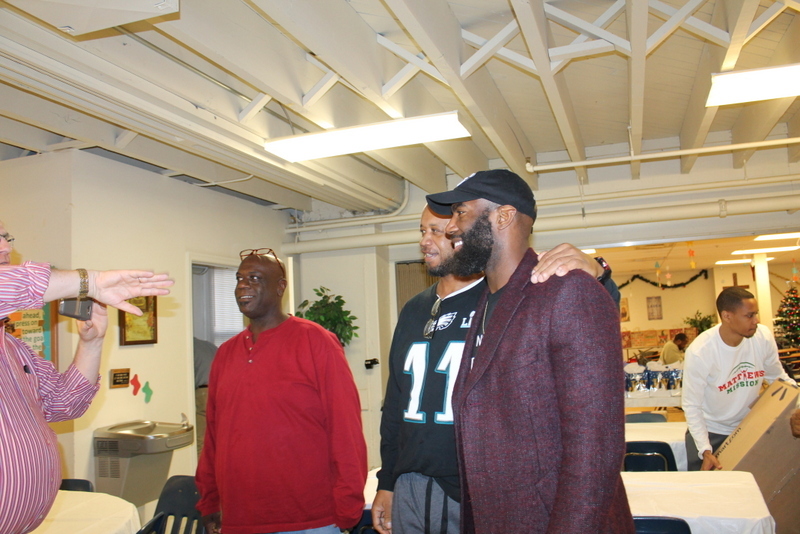 Among them were four of the Philadelphia Eagles and their families. 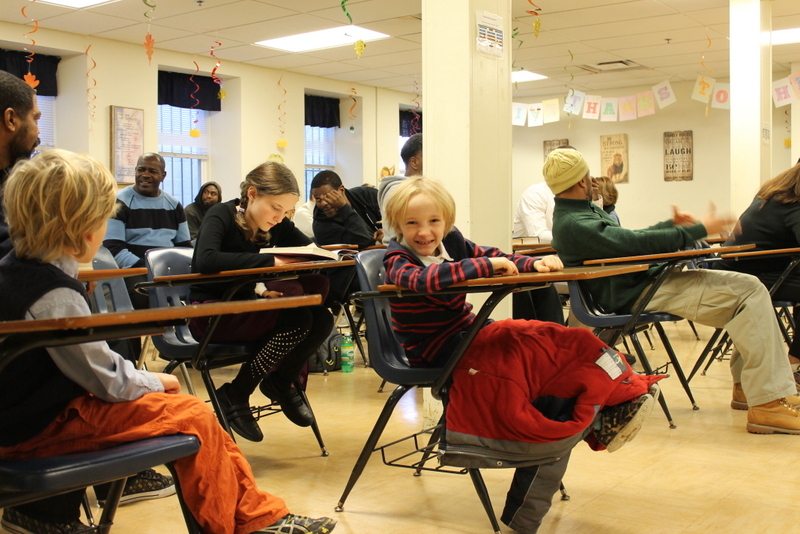 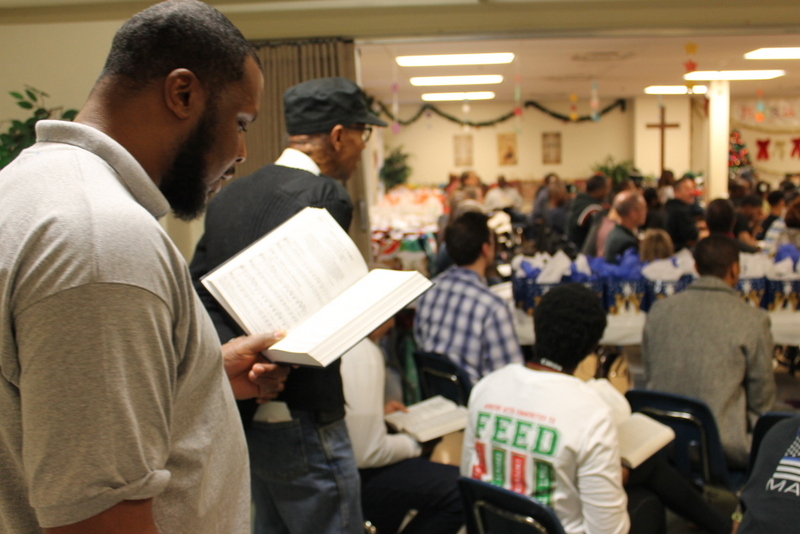 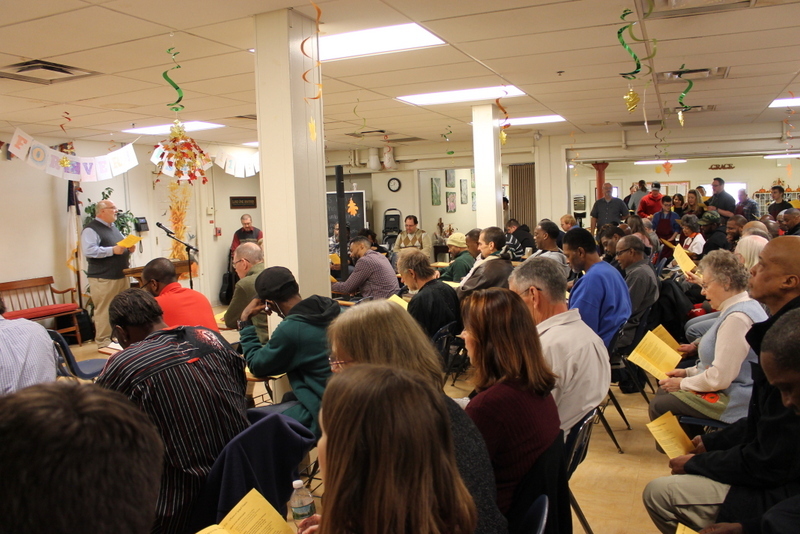 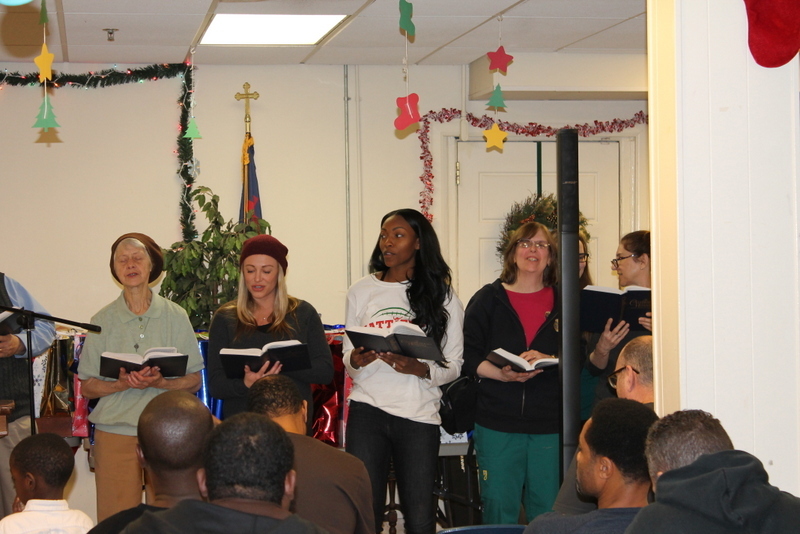 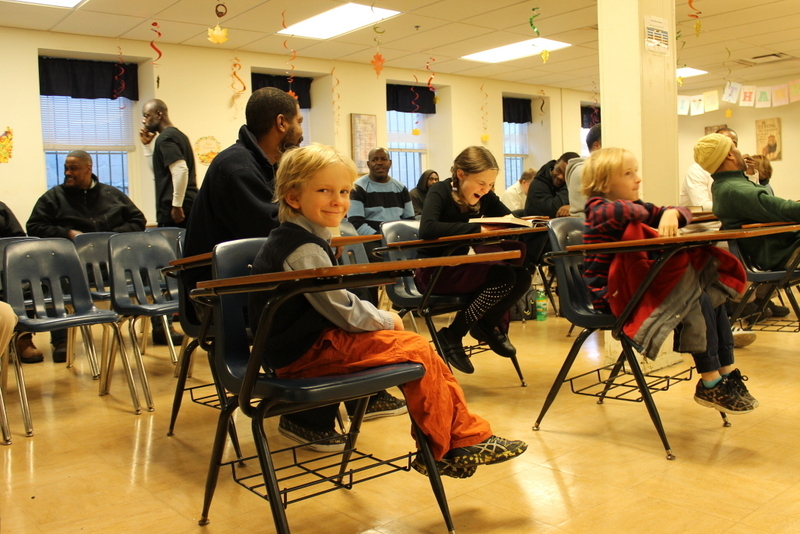 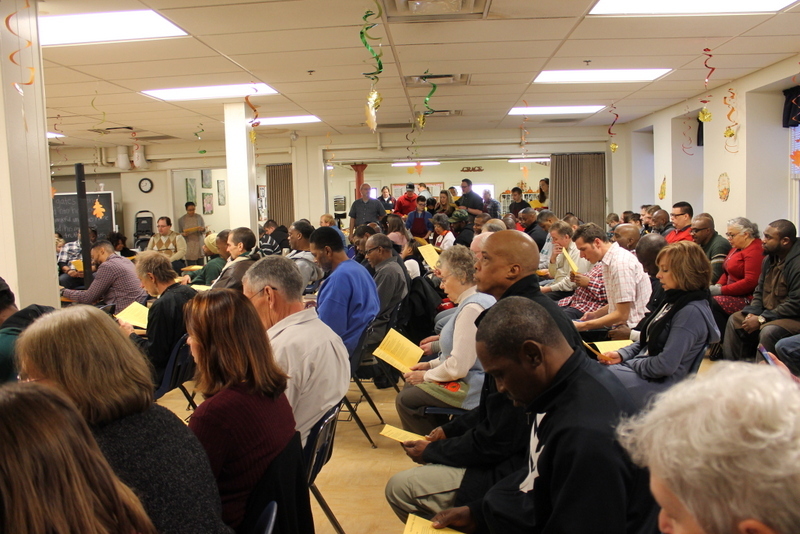 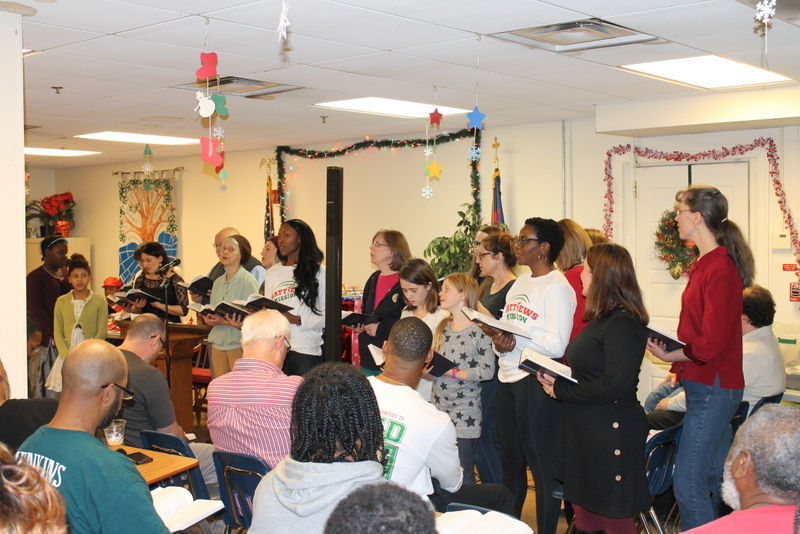 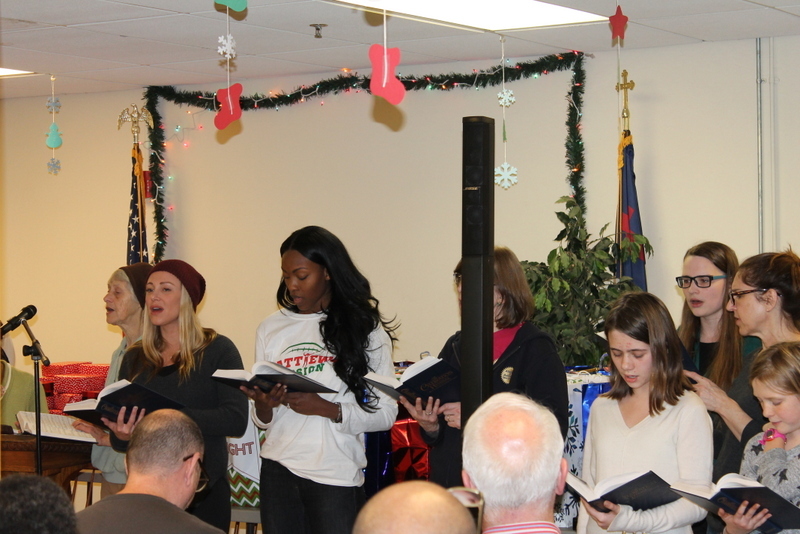 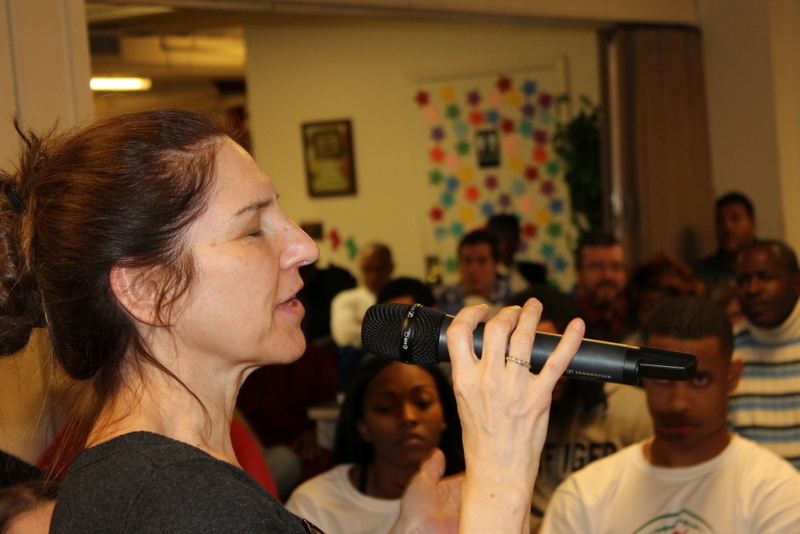 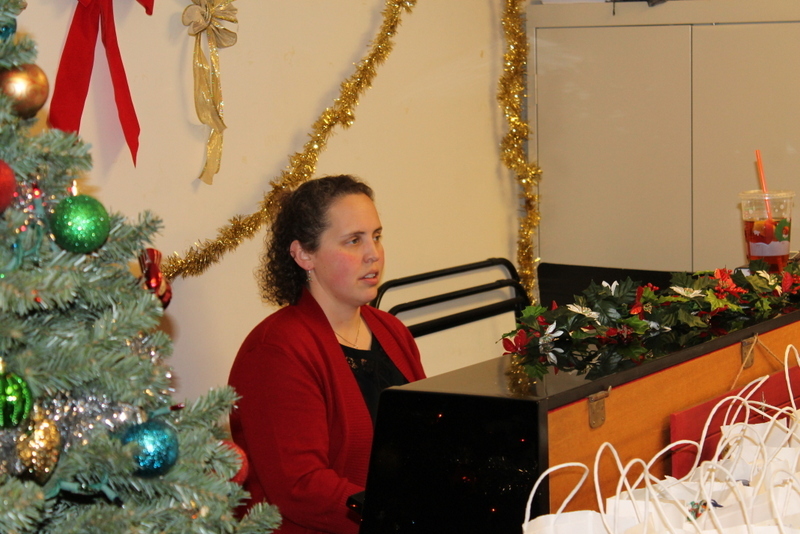 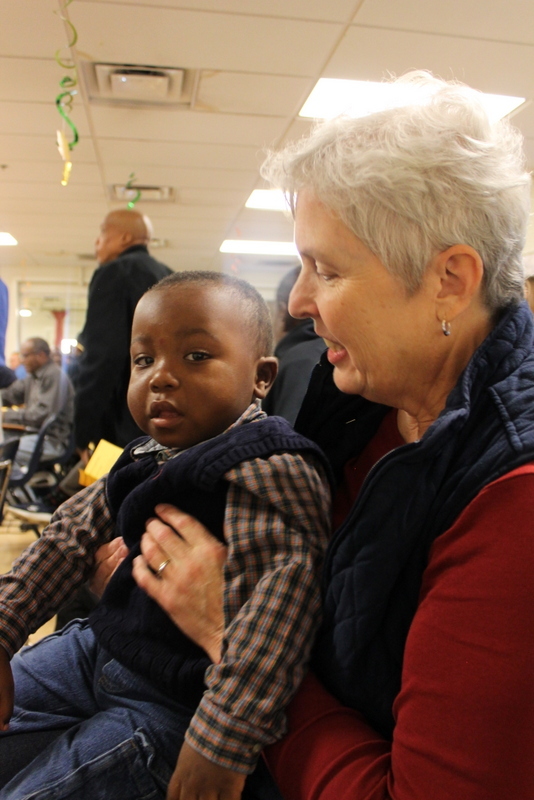 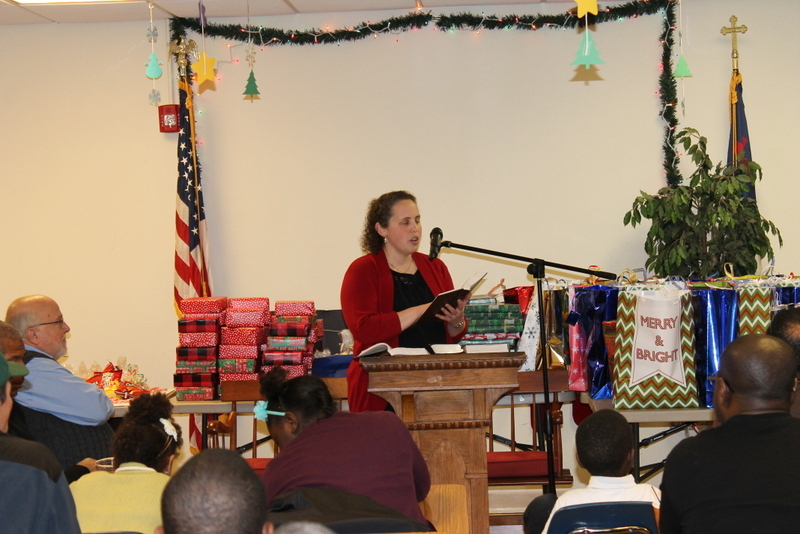 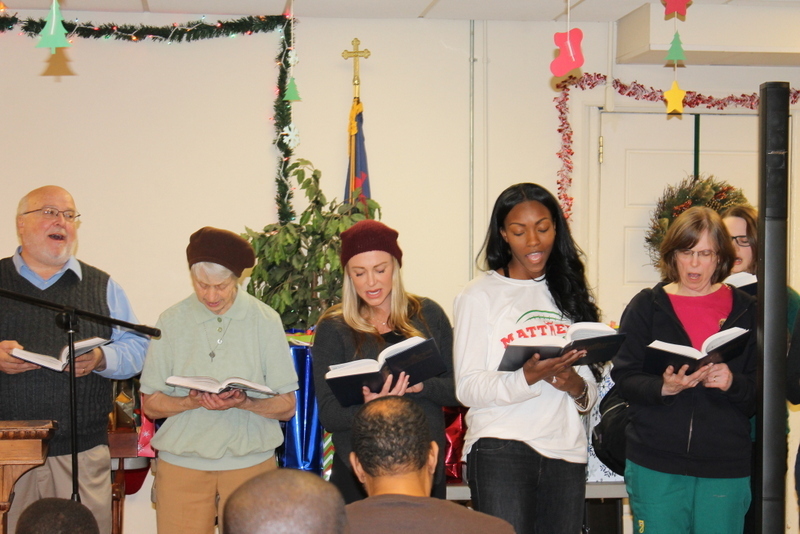 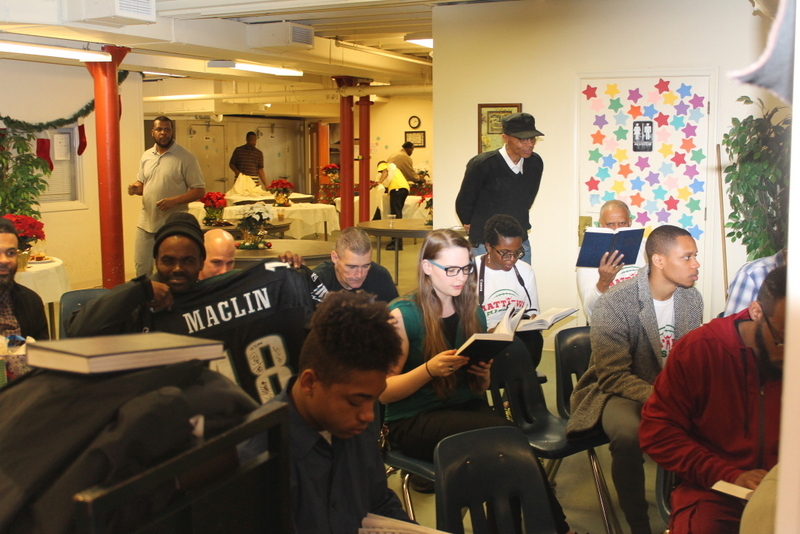 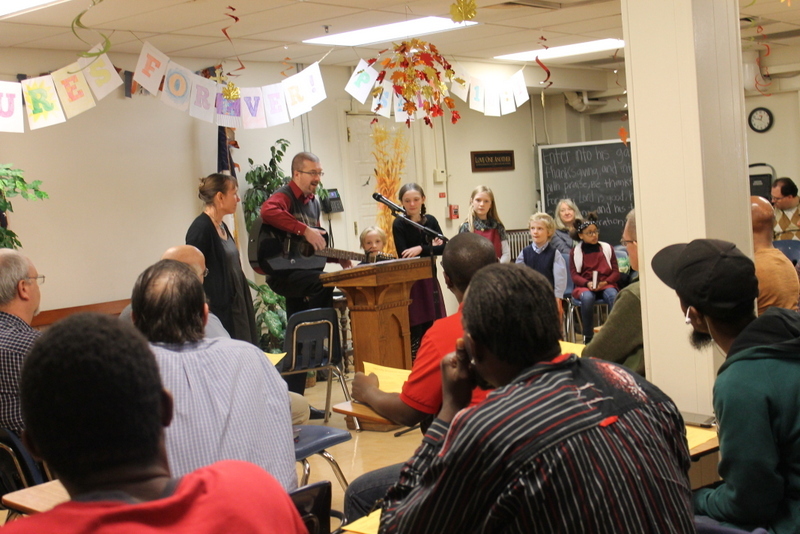 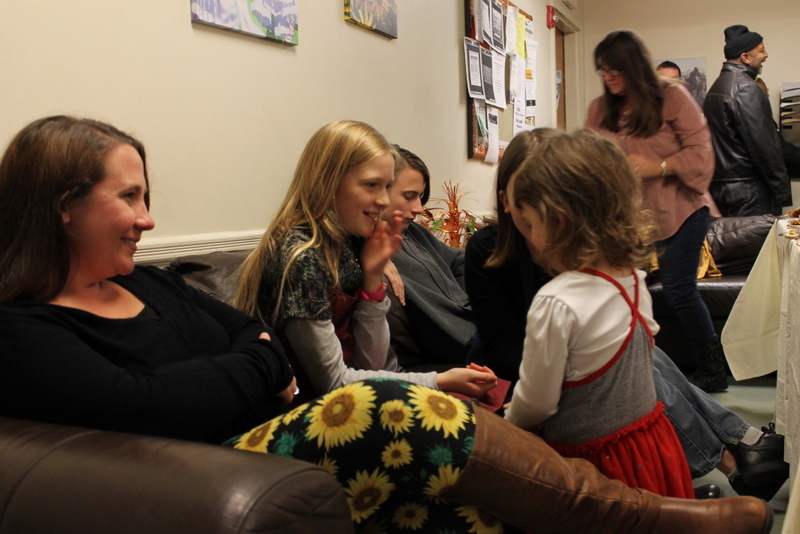 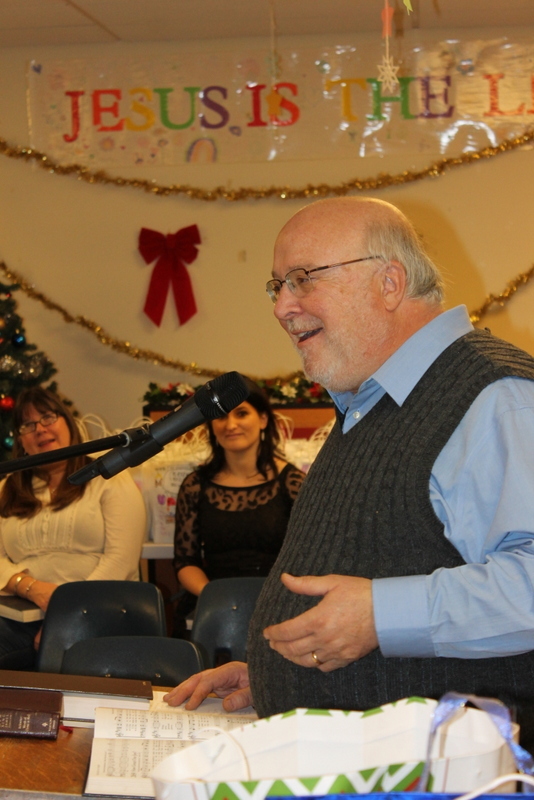 Together, we sang Christmas carols, read Scripture, prayed and shared testimonies of God’s goodness. 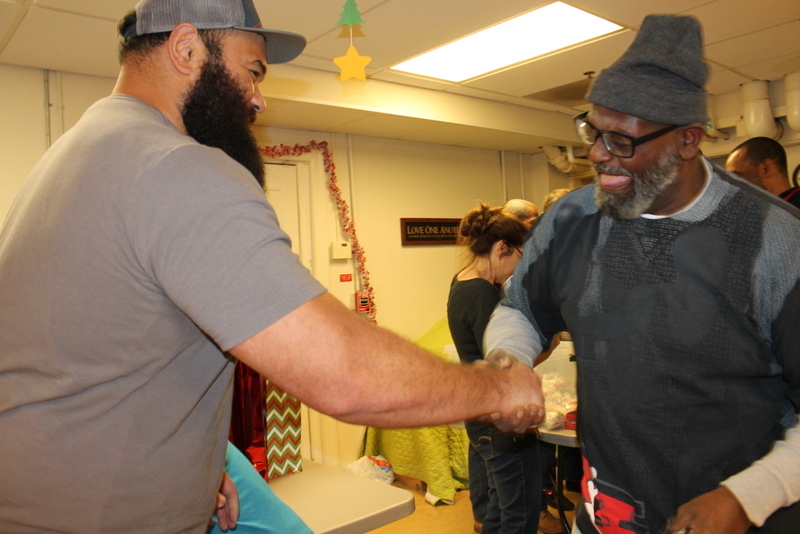 NFL players stood next to men who are often overlooked by society – men without homes or jobs, men struggling to get back on their feet. 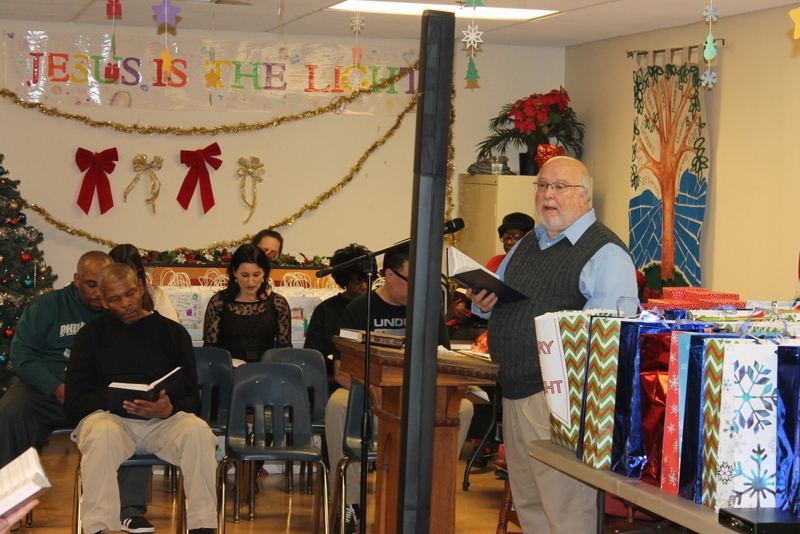 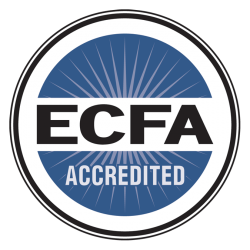 The highly regarded next to the oft forgotten – all stood worshiping Jesus, the Famous One who comes to bring life and healing to kings and shepherds, rich and poor, famous and invisible alike. 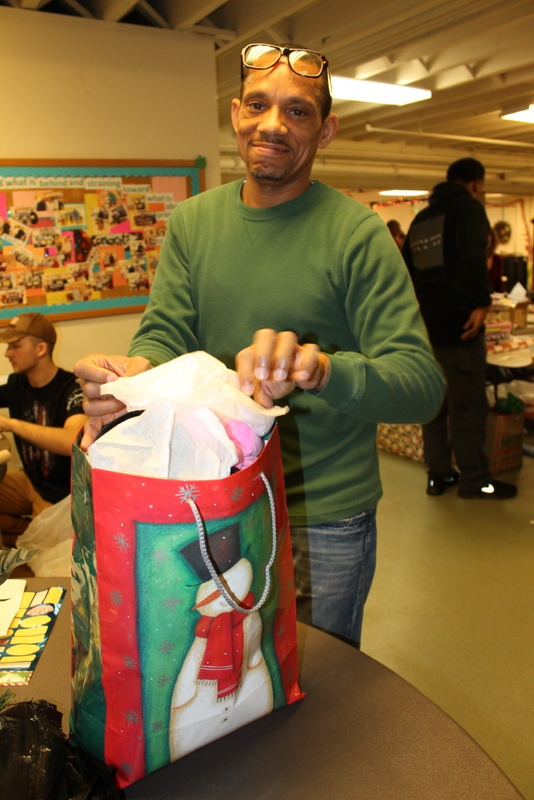 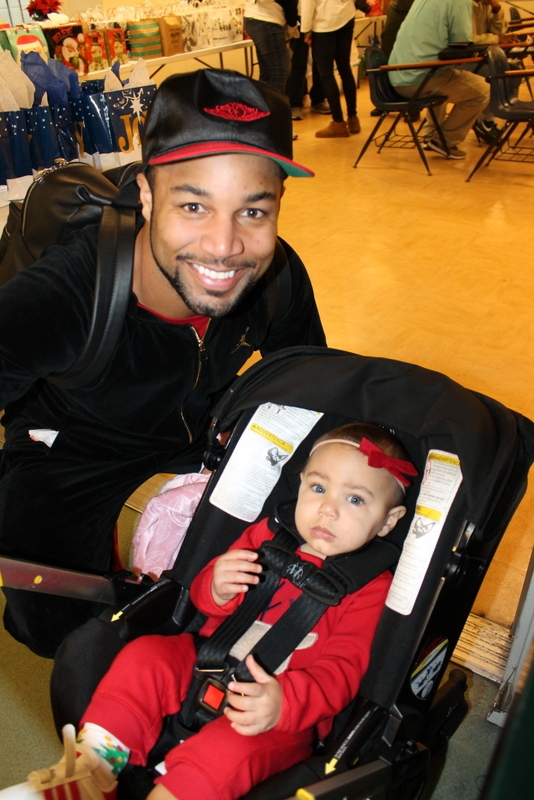 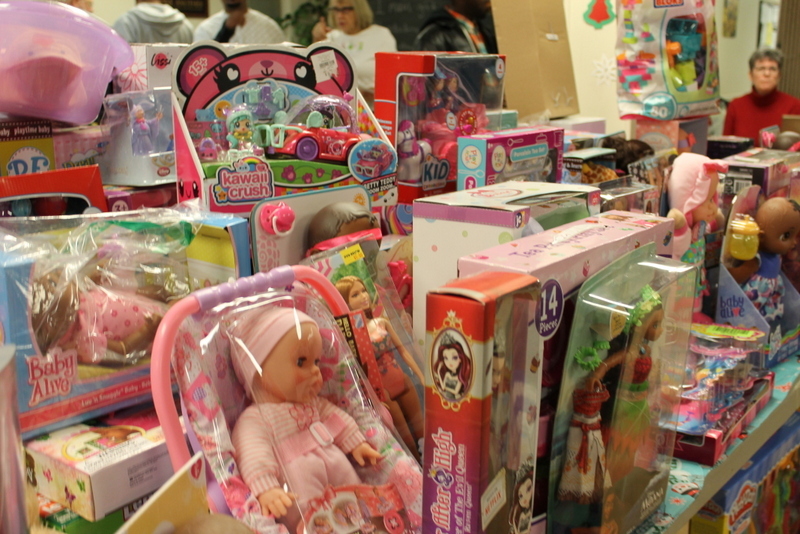 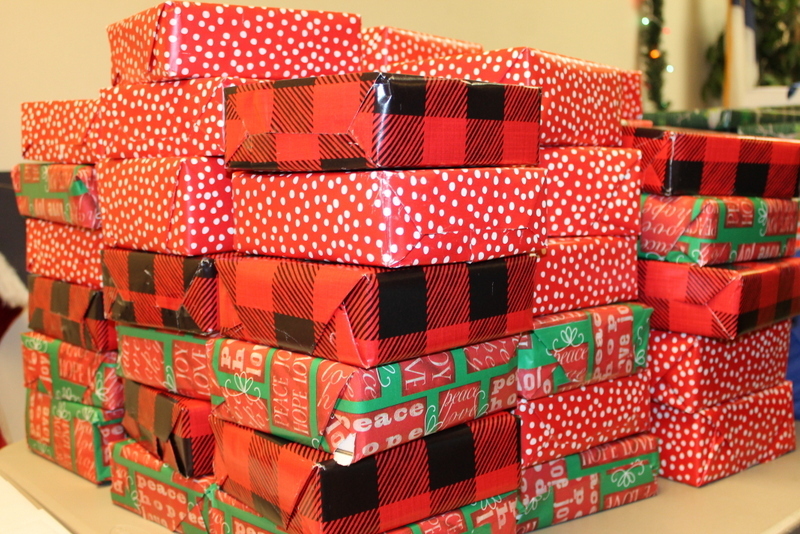 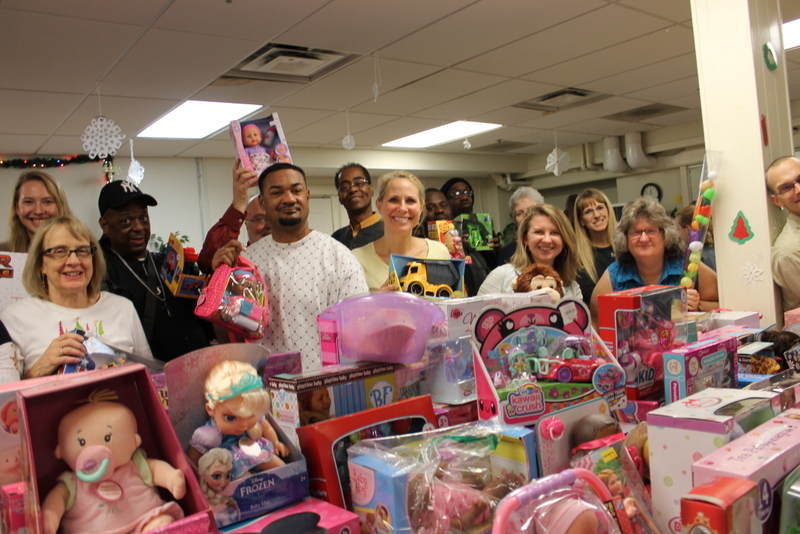 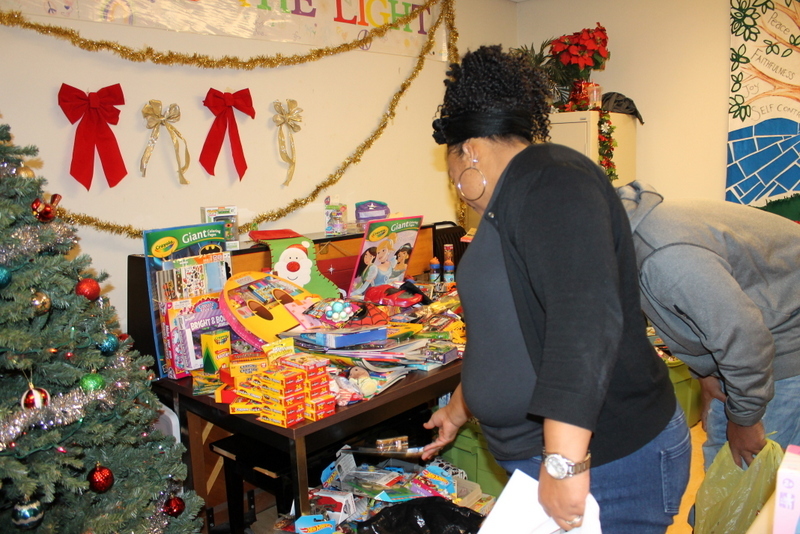 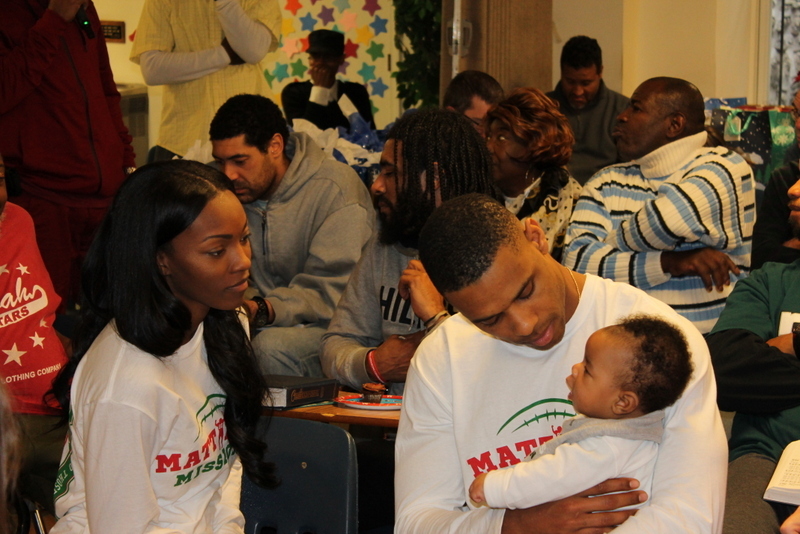 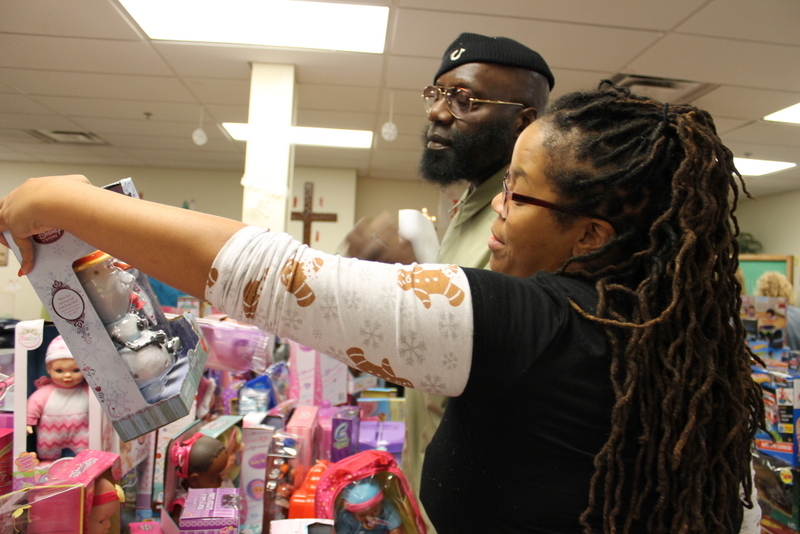 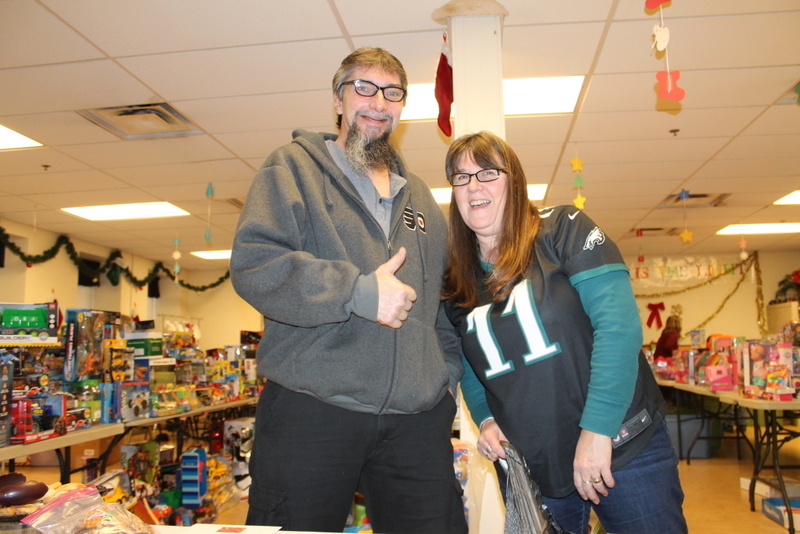 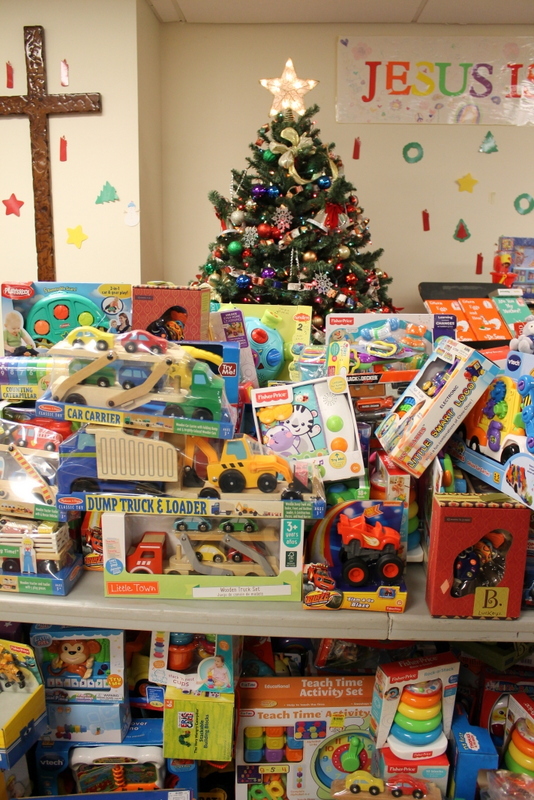 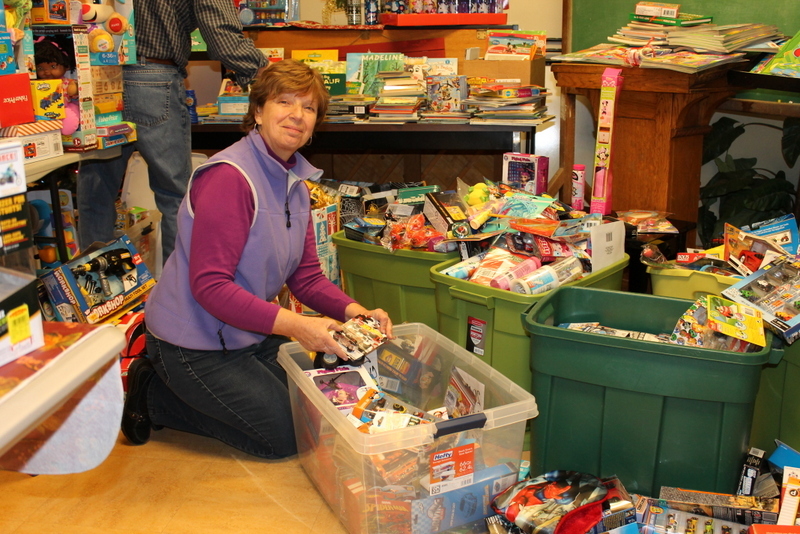 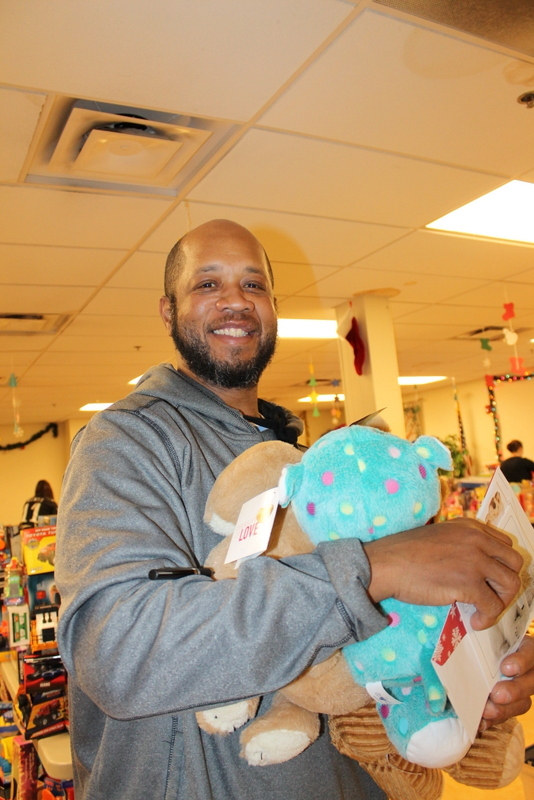 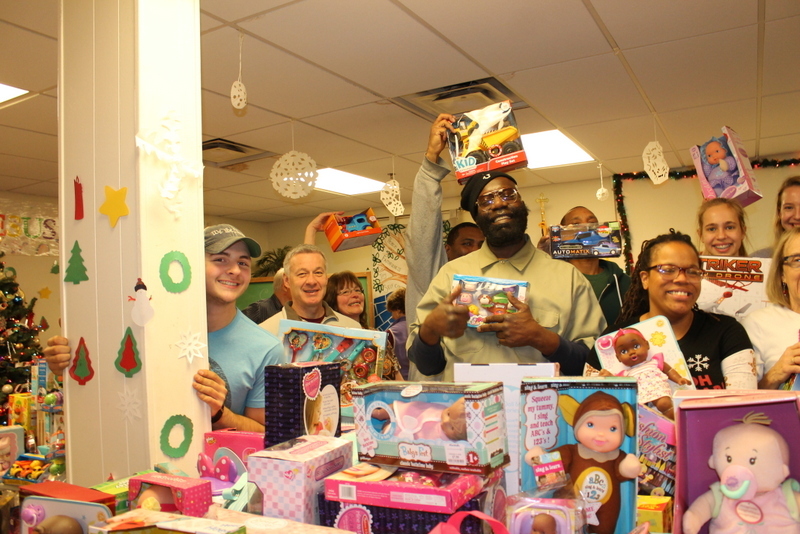 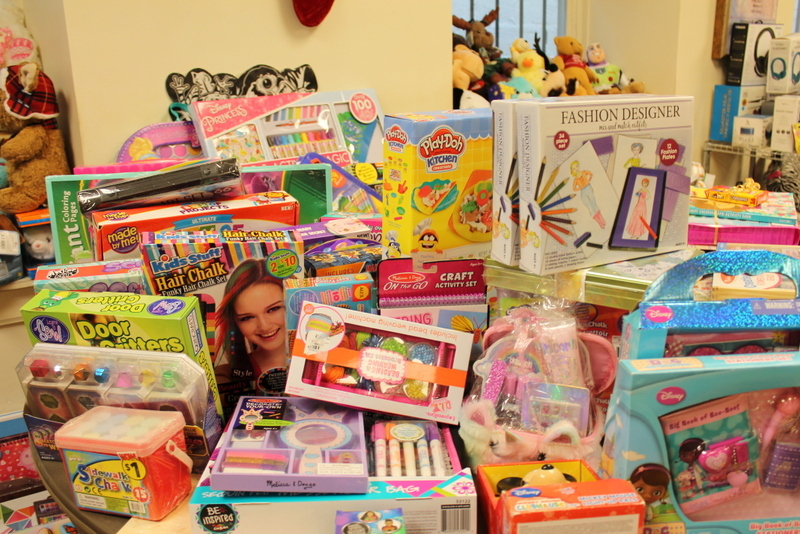 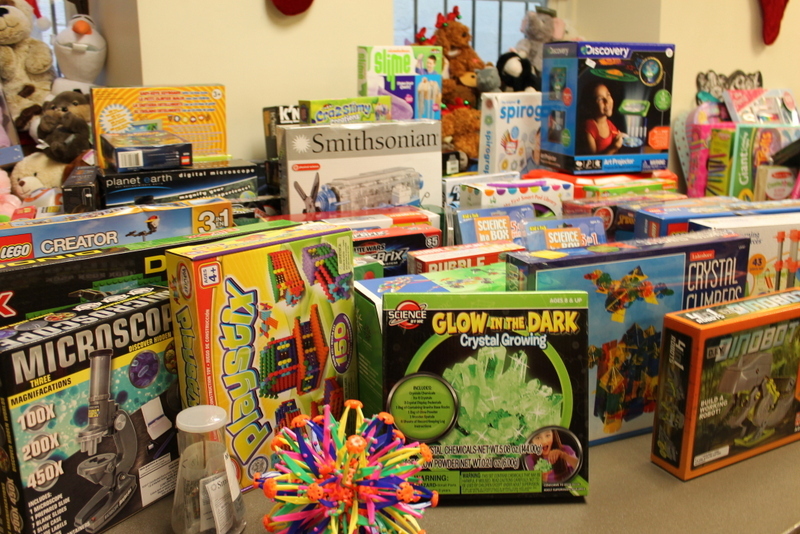 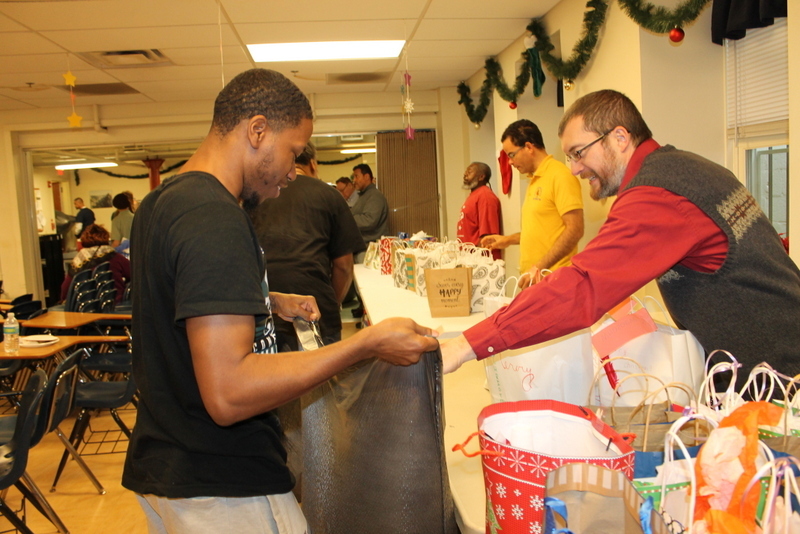 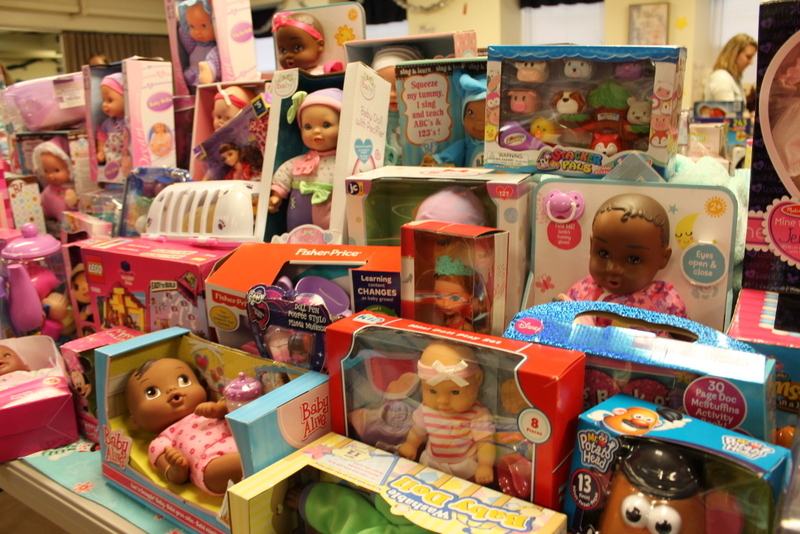 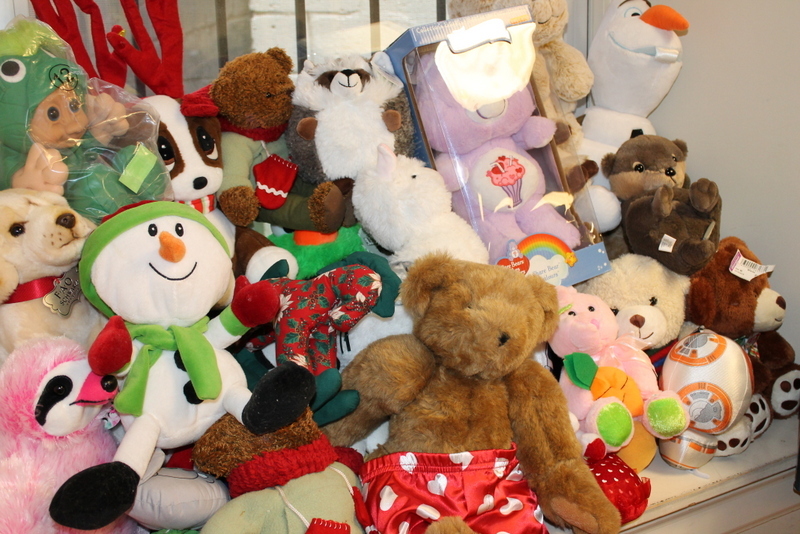 Our men and graduates selected and wrapped over 1,500 FREE toys and gifts for 201 of their kids and grandkids! 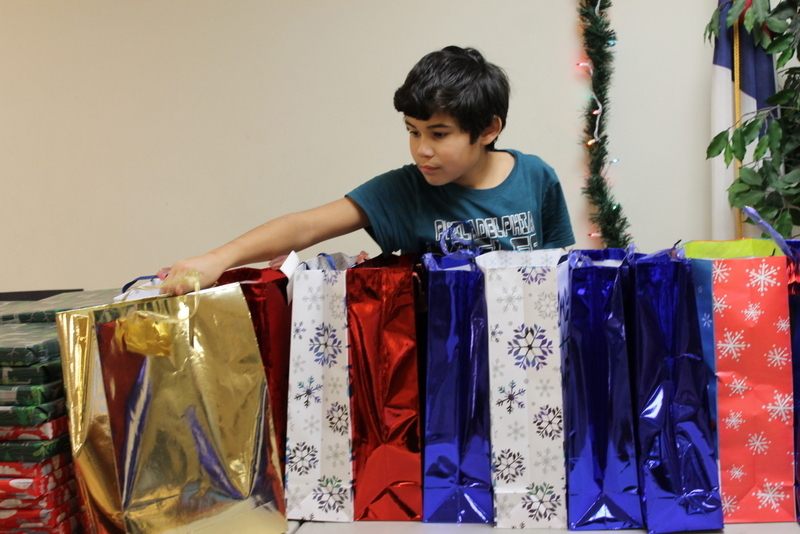 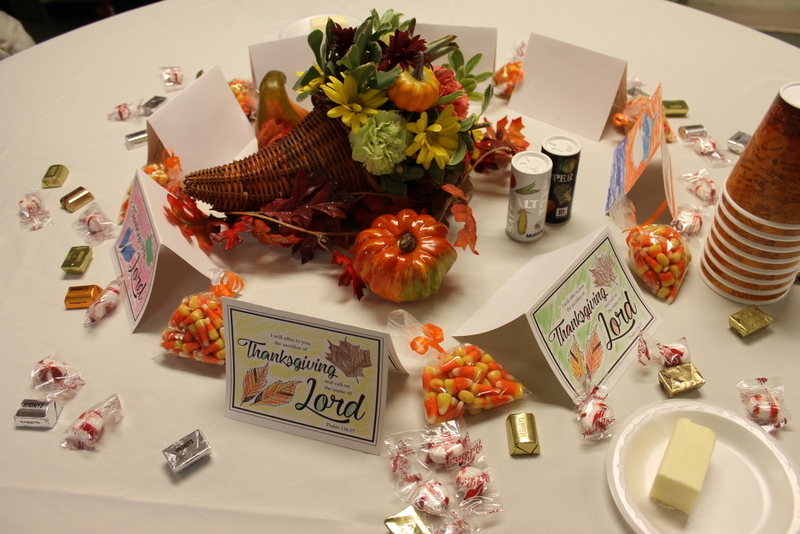 Pray that the Lord uses these gifts as He works to restore family relationships! 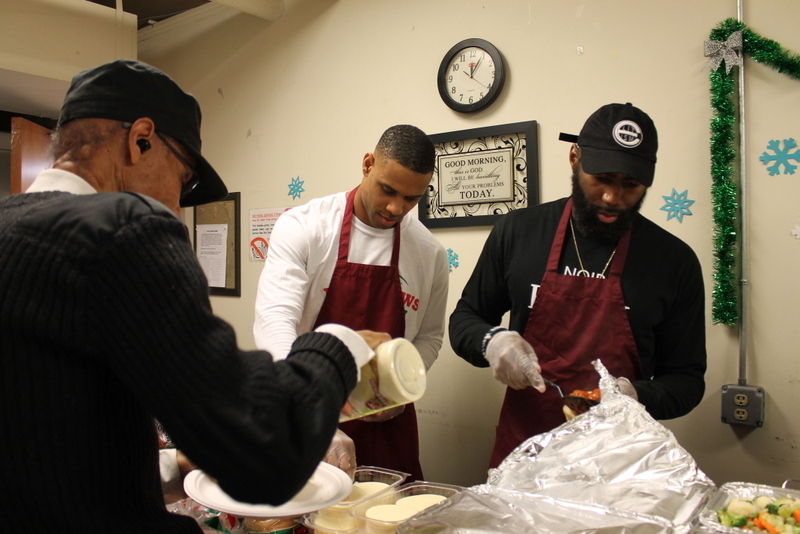 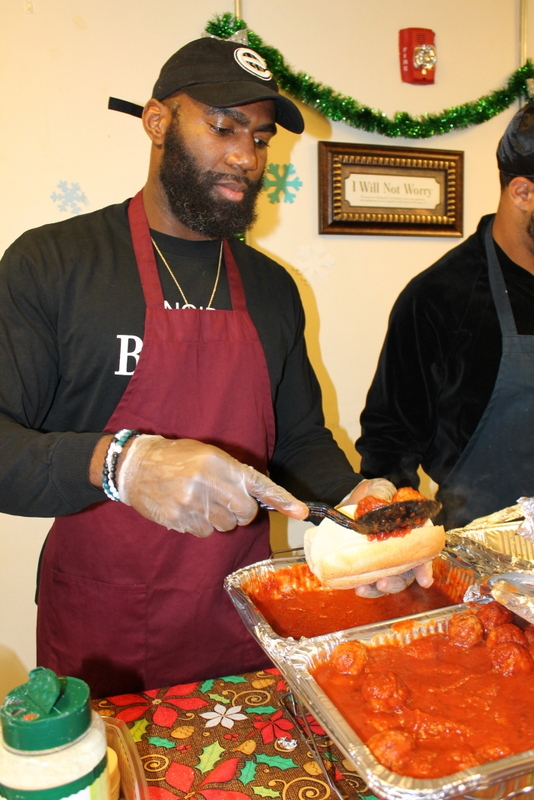 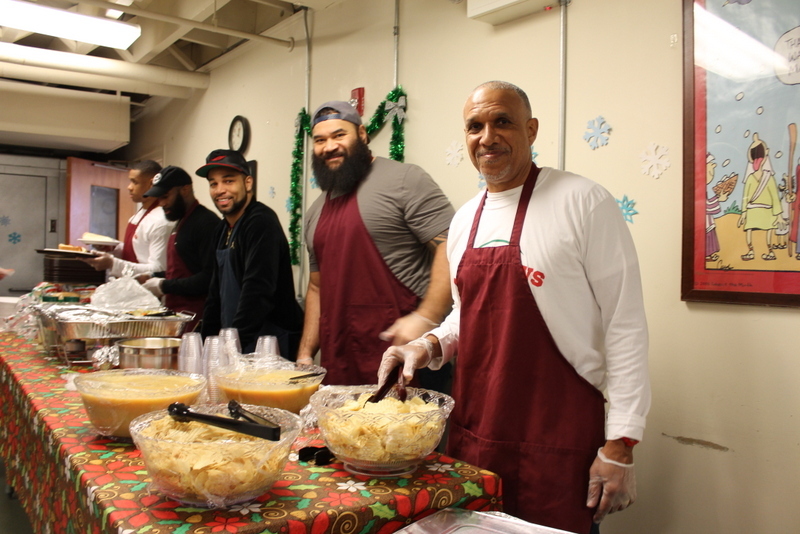 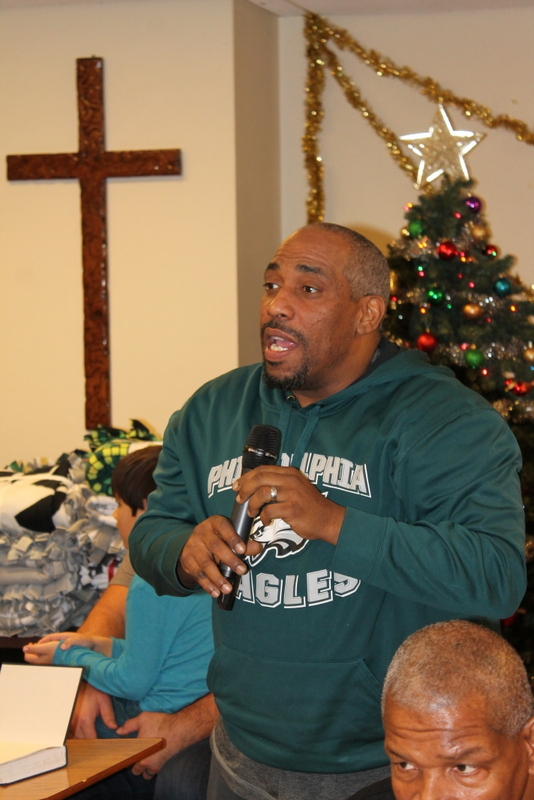 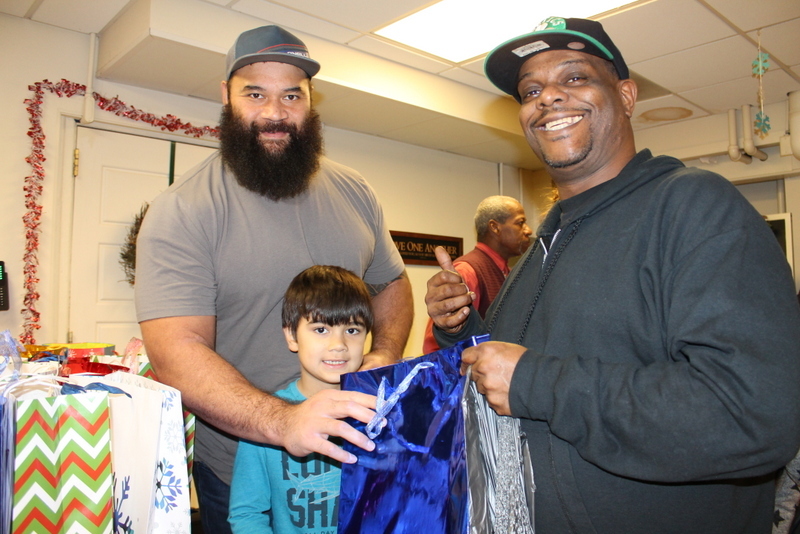 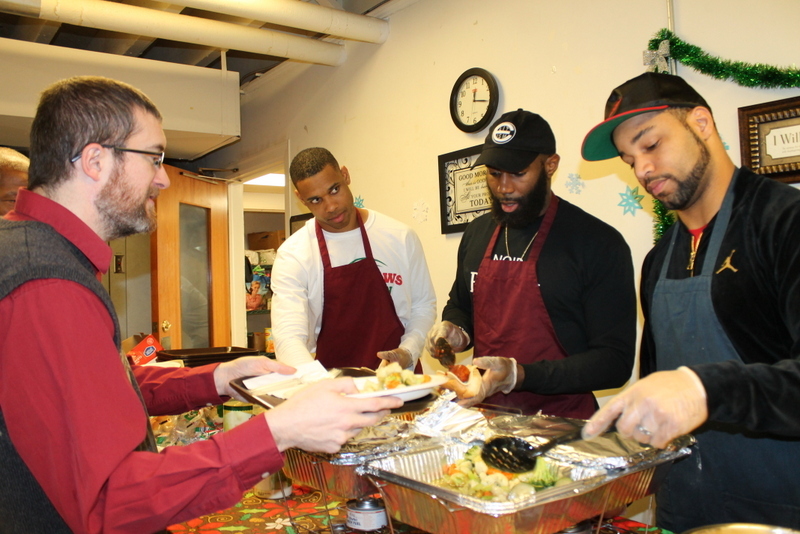 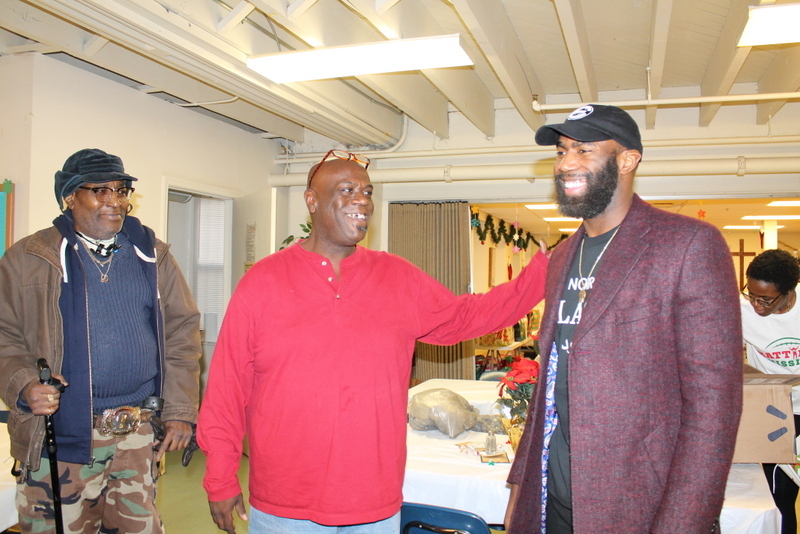 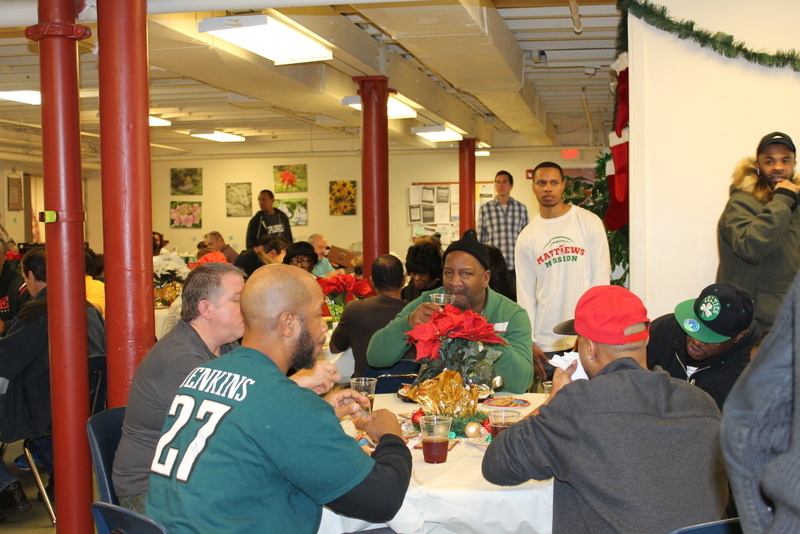 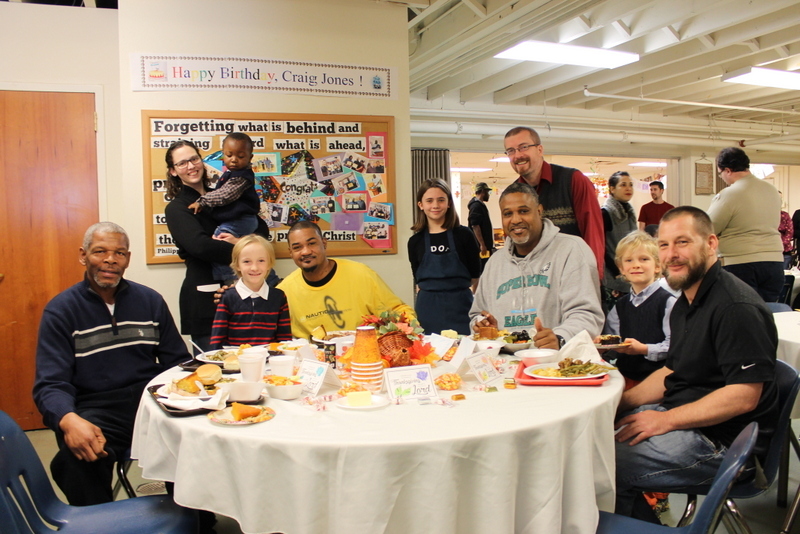 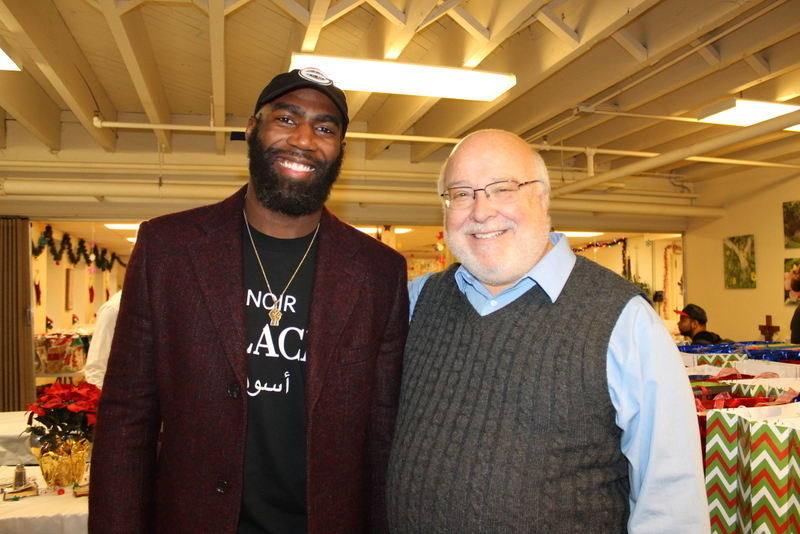 Four members of the Philadelphia Eagles and their families came on Christmas Eve to serve our men lunch, hand out gifts, and worship the Lord with us in our chapel service. 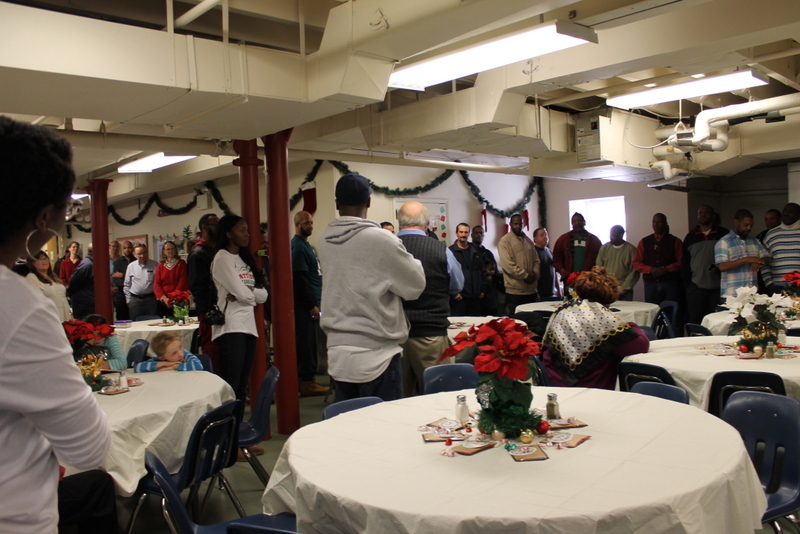 It was awesome to see famous football players and homeless men side by side singing songs of worship to Jesus. 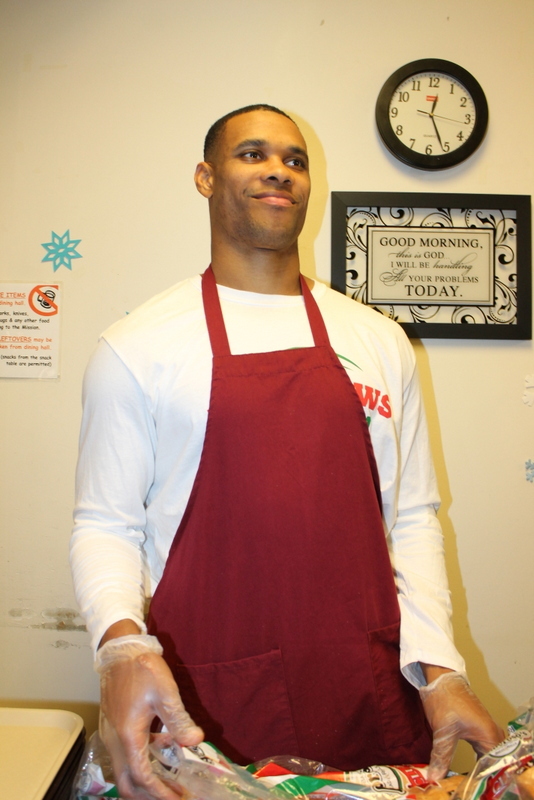 Thank you, Jordan Matthews, Malcolm Jenkins, Haloti Ngata, and Golden Tate! 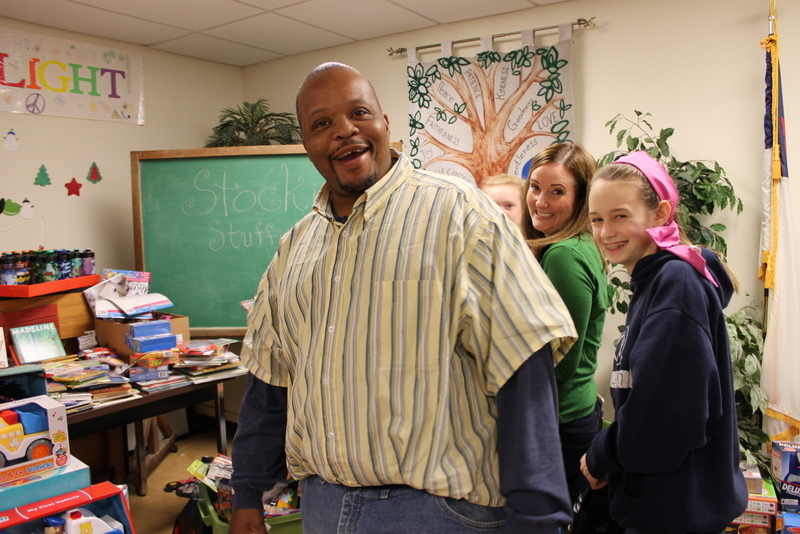 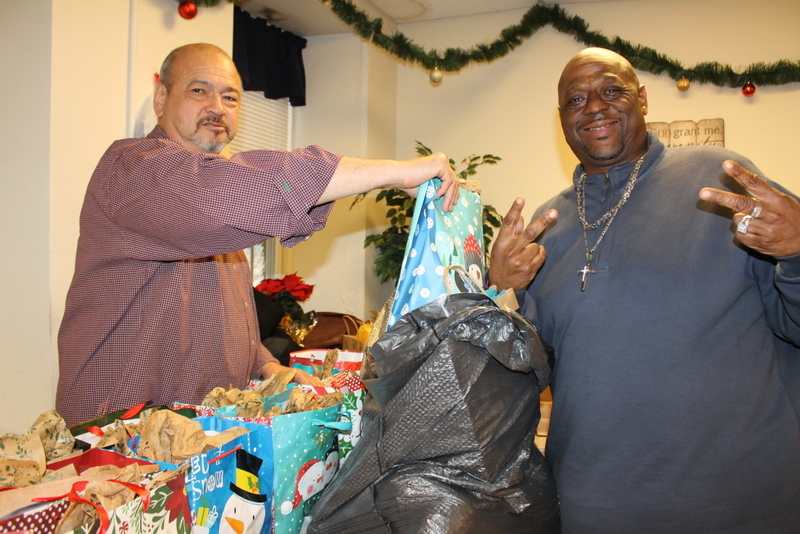 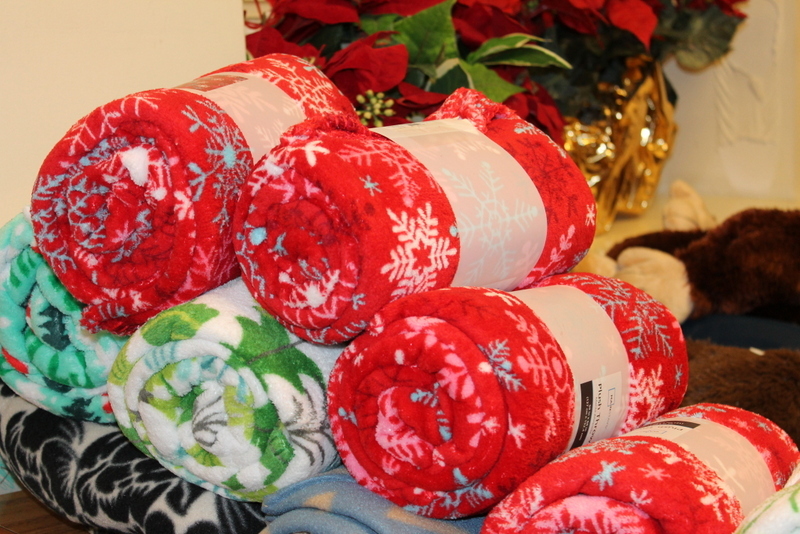 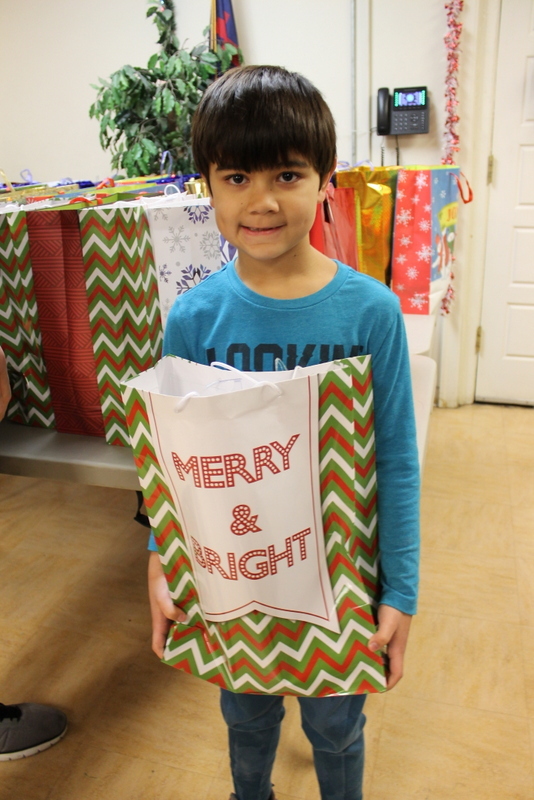 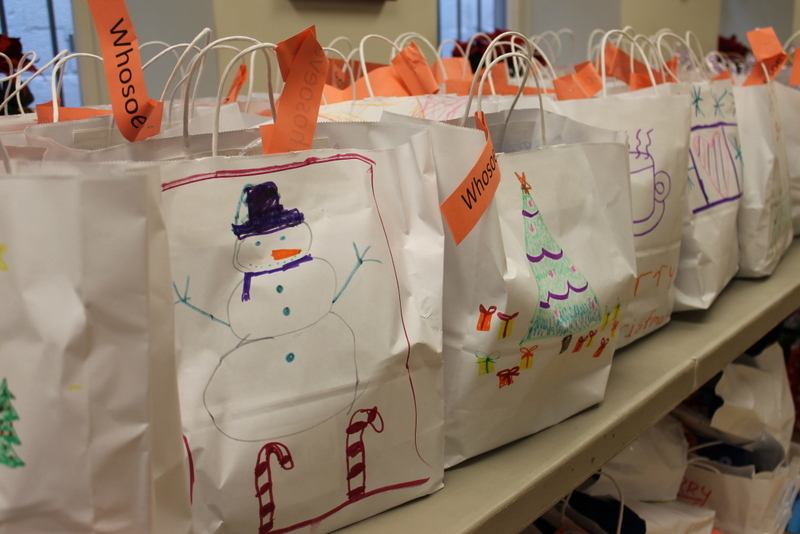 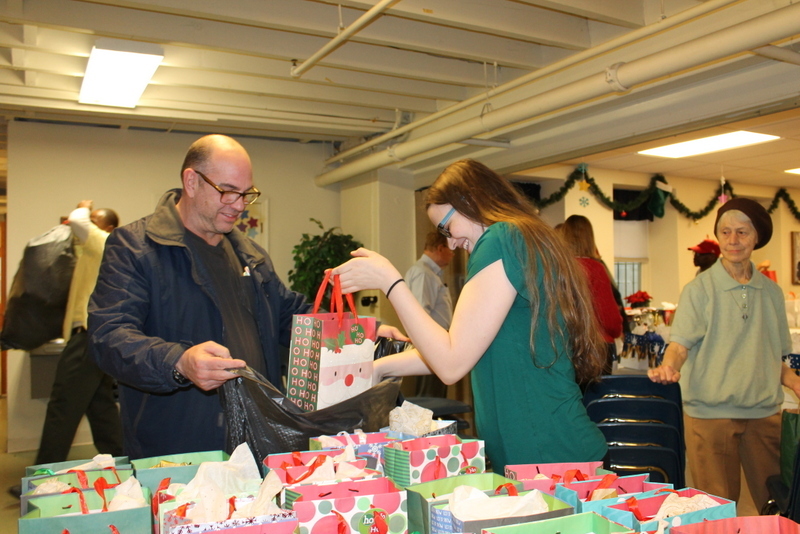 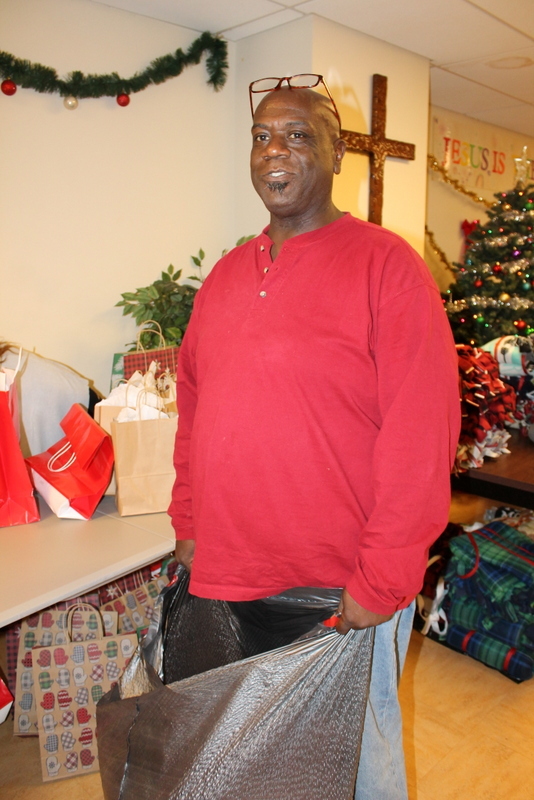 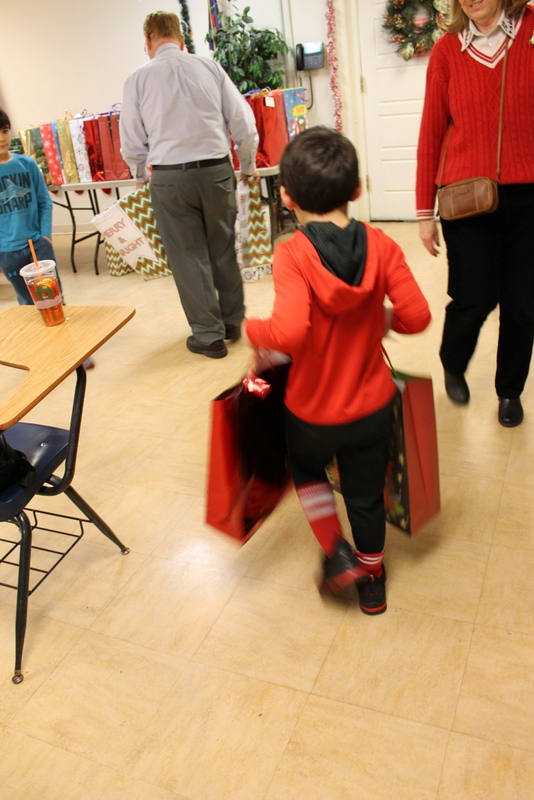 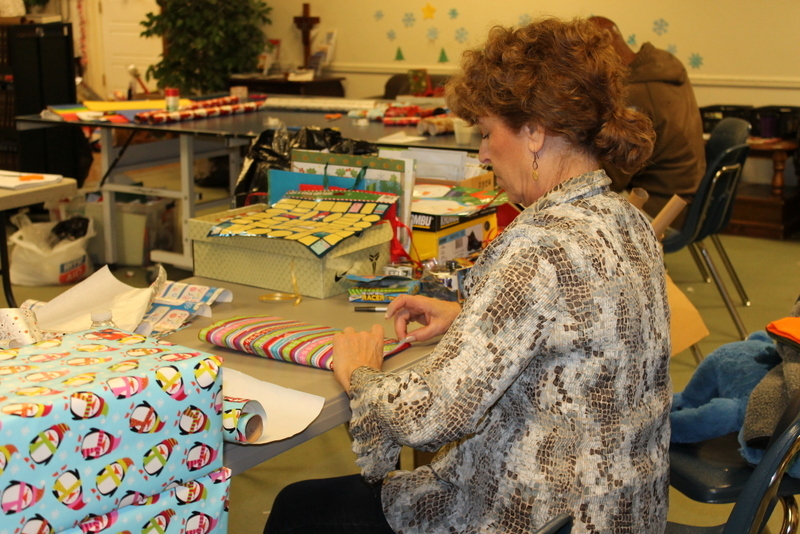 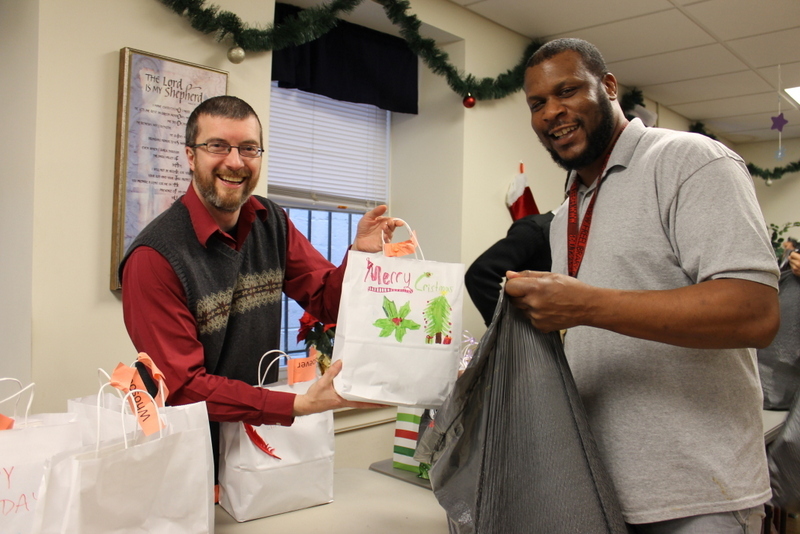 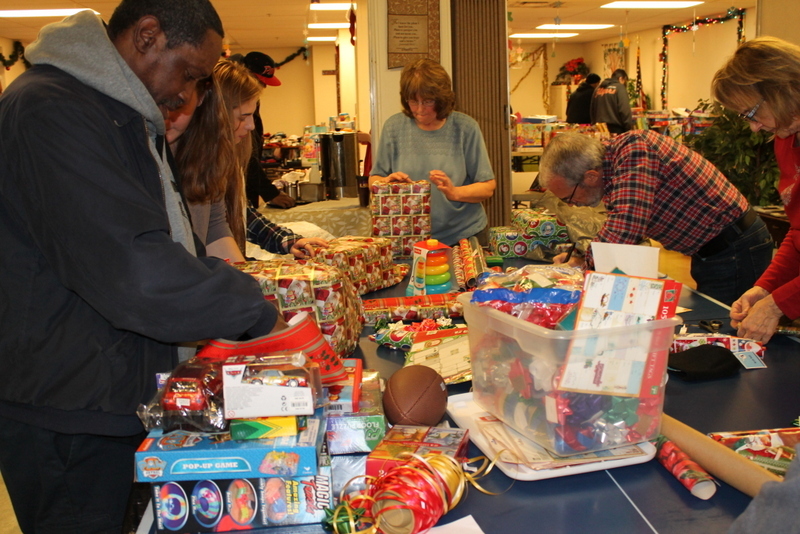 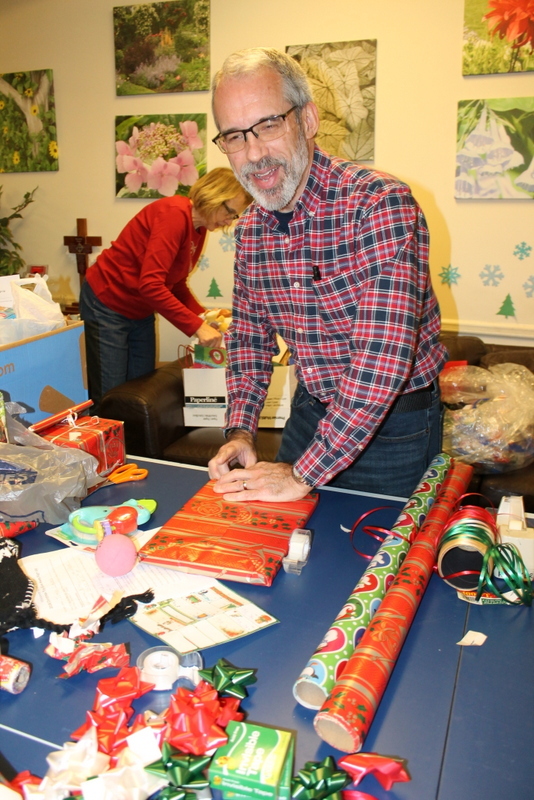 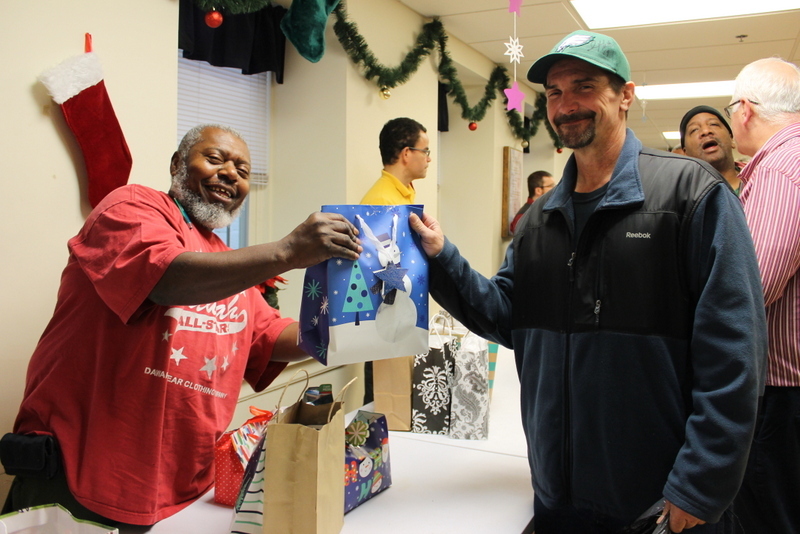 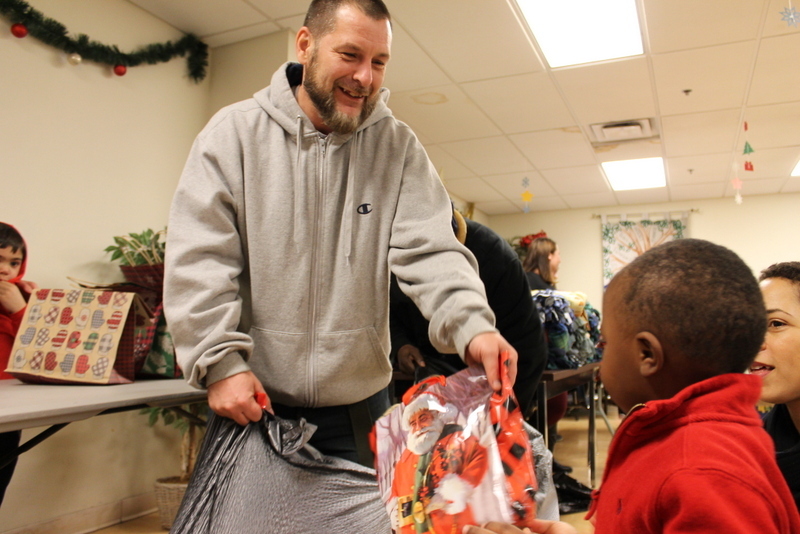 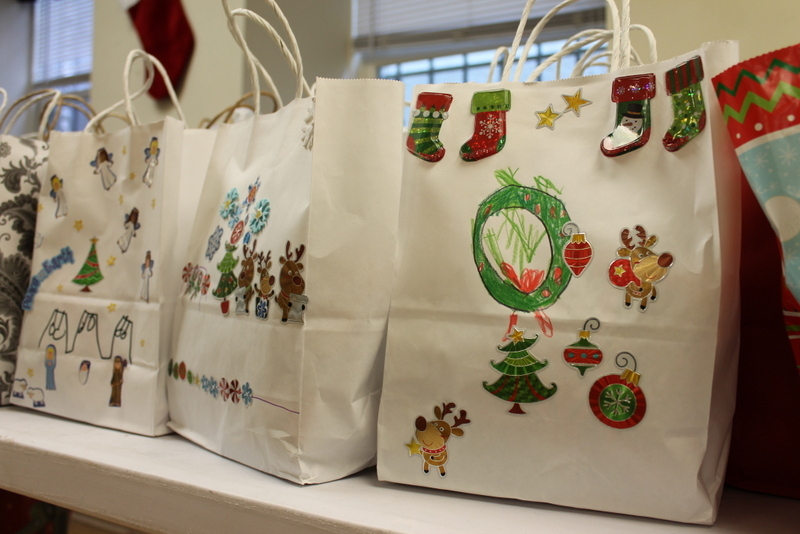 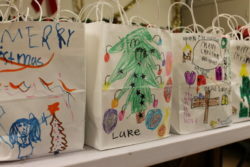 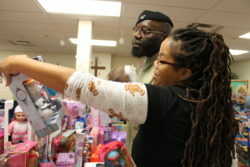 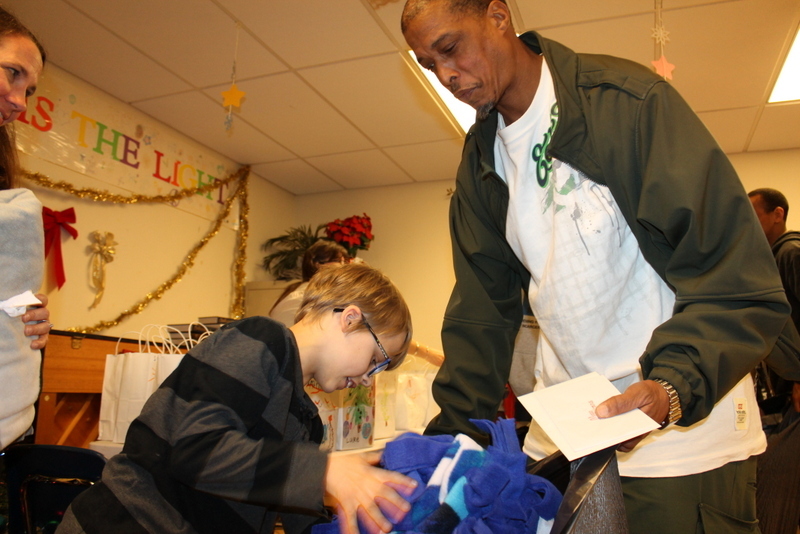 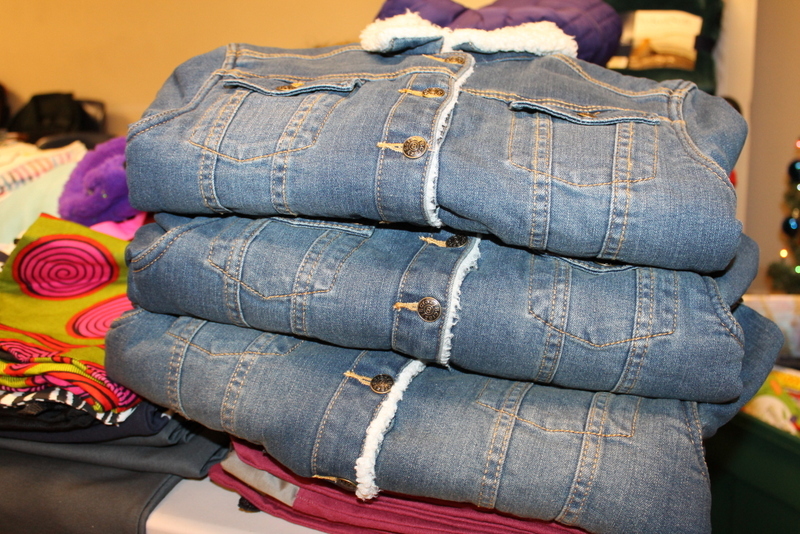 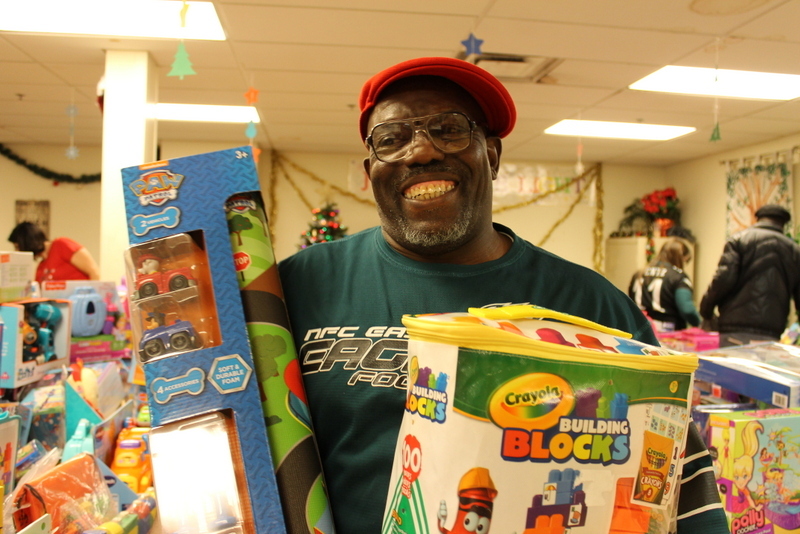 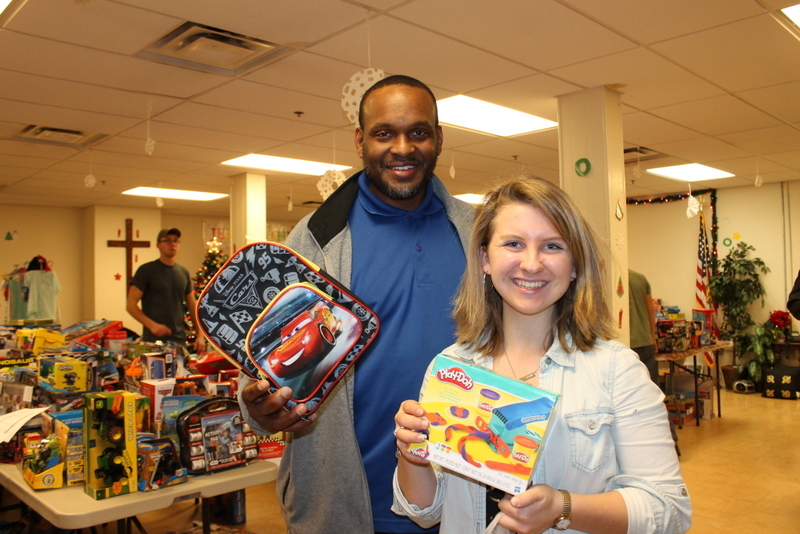 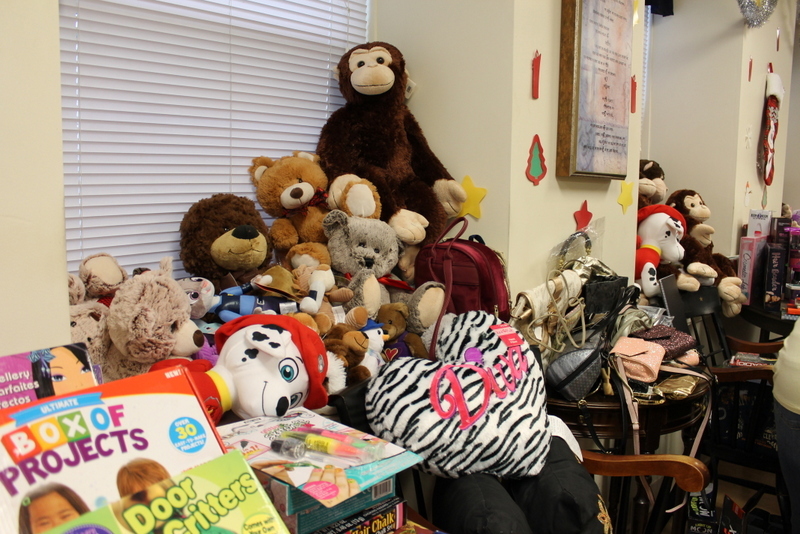 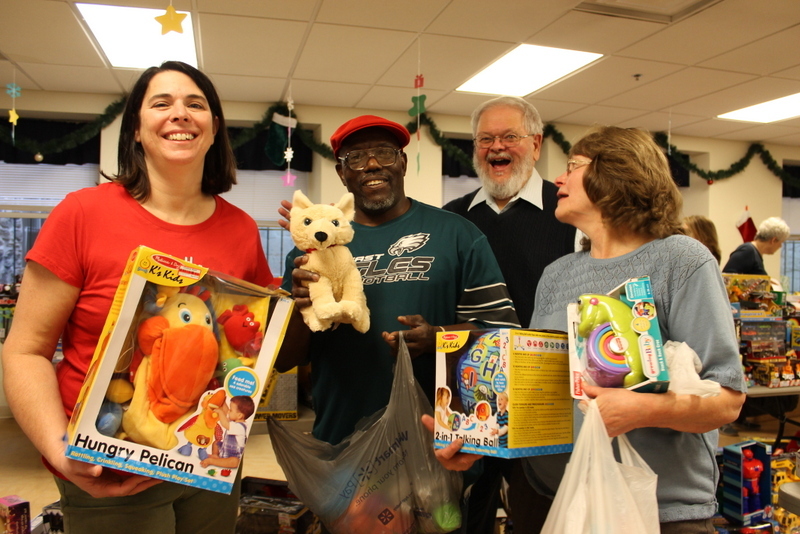 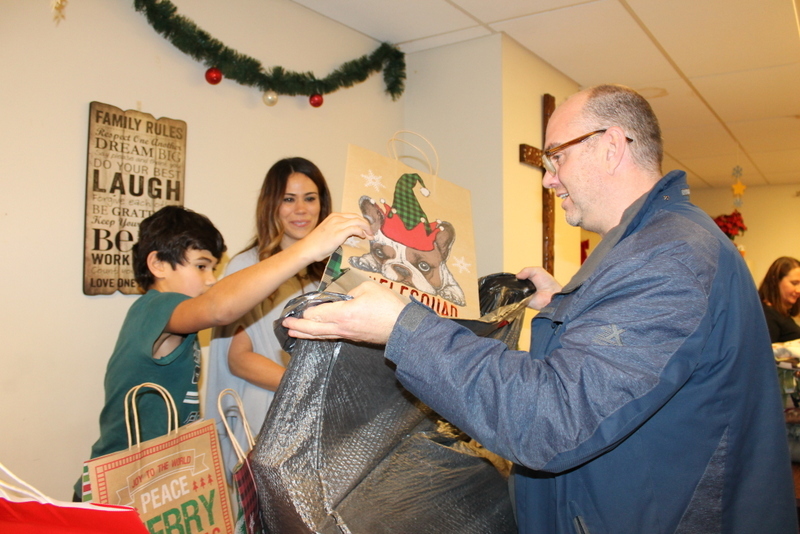 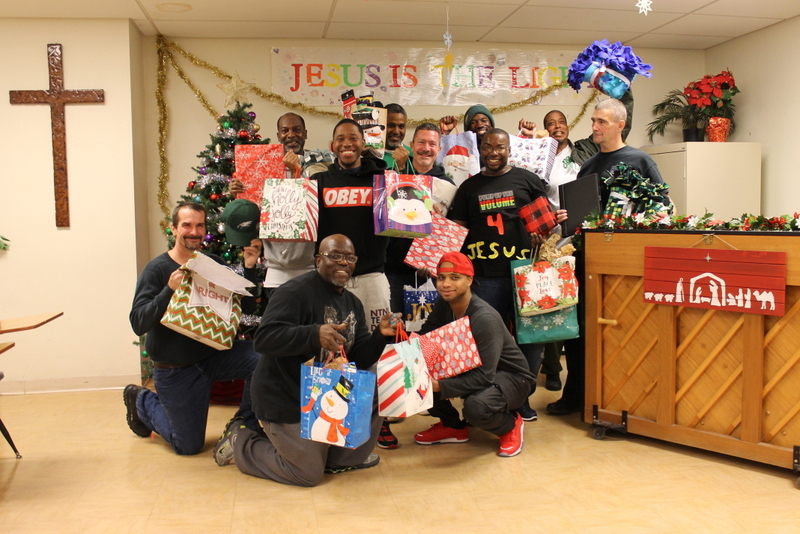 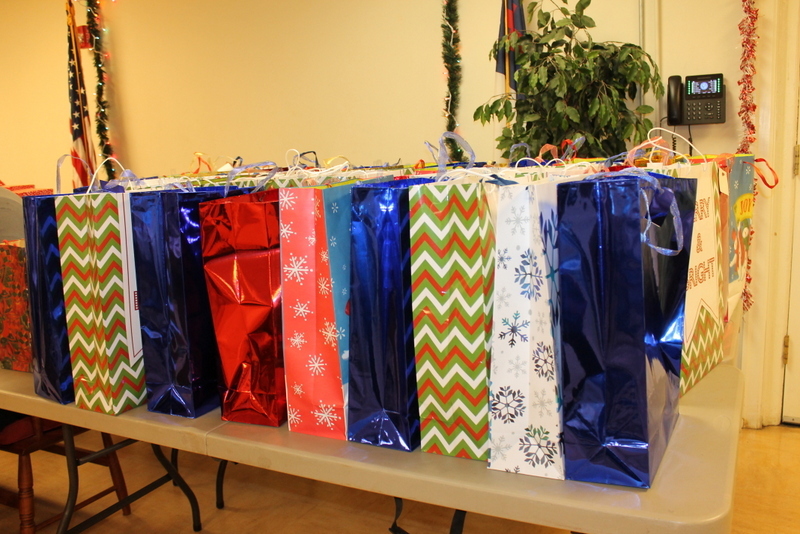 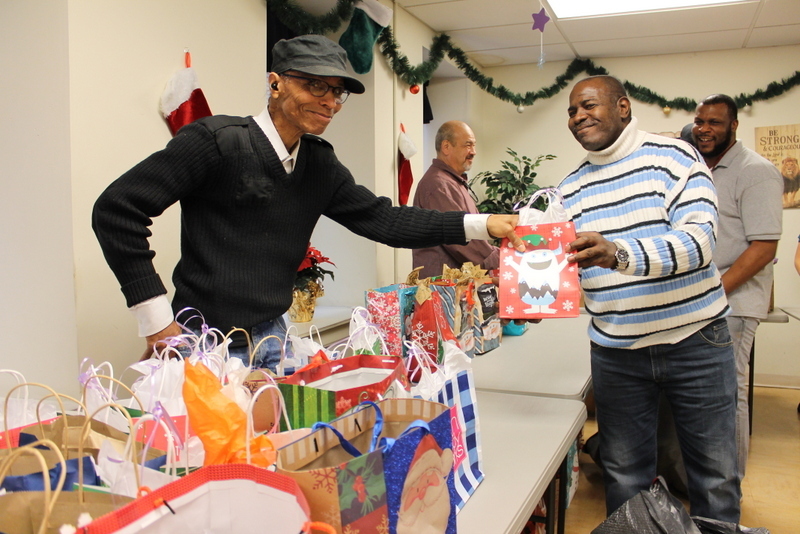 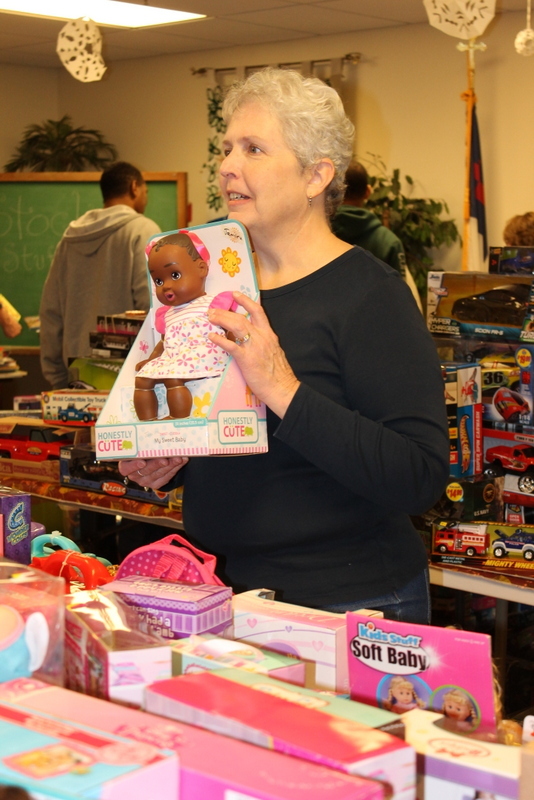 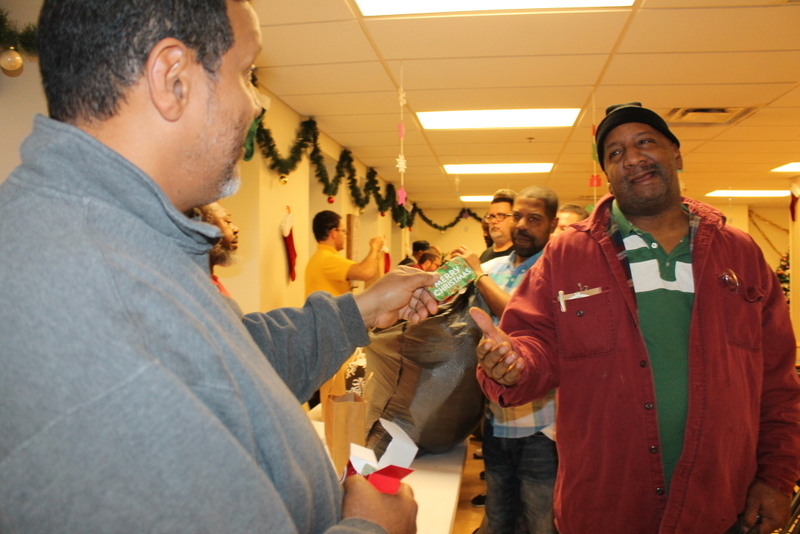 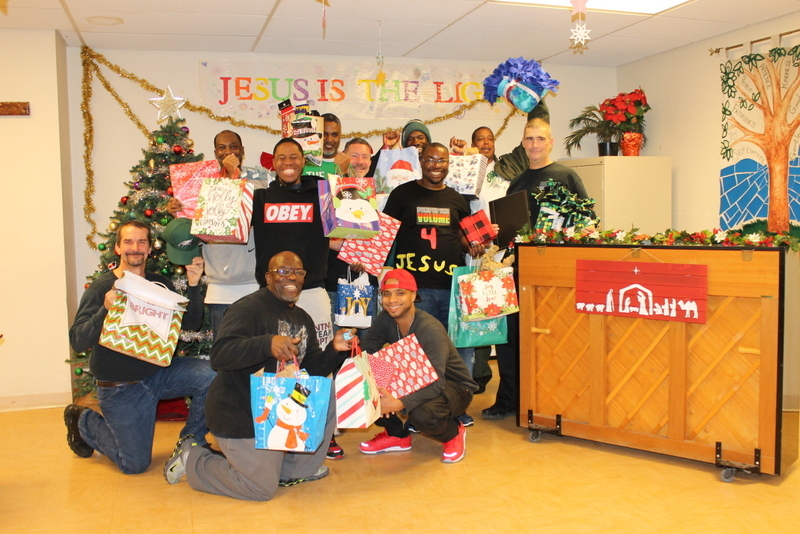 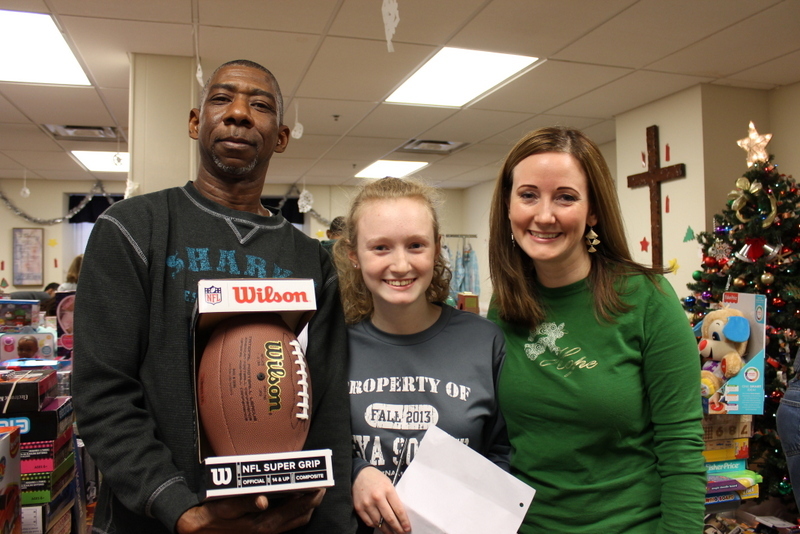 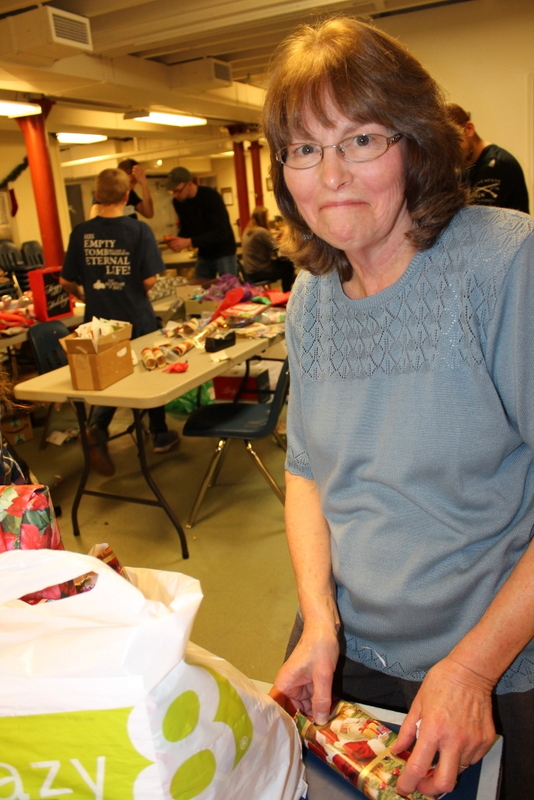 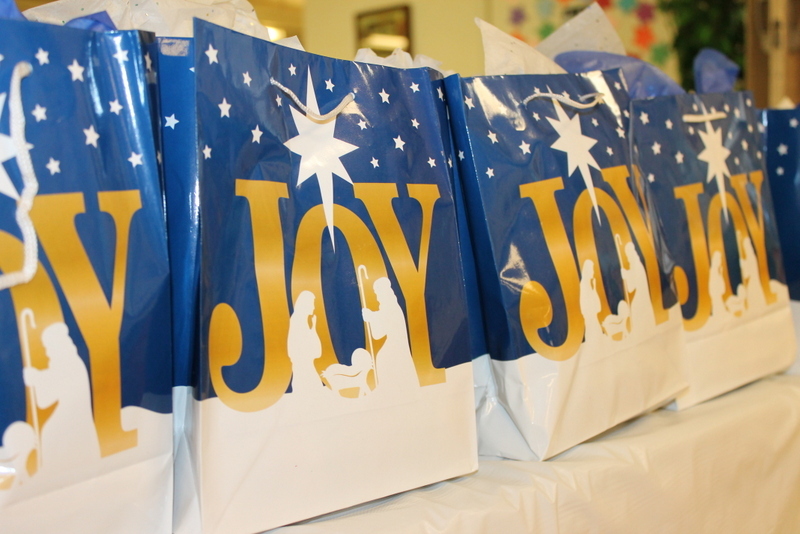 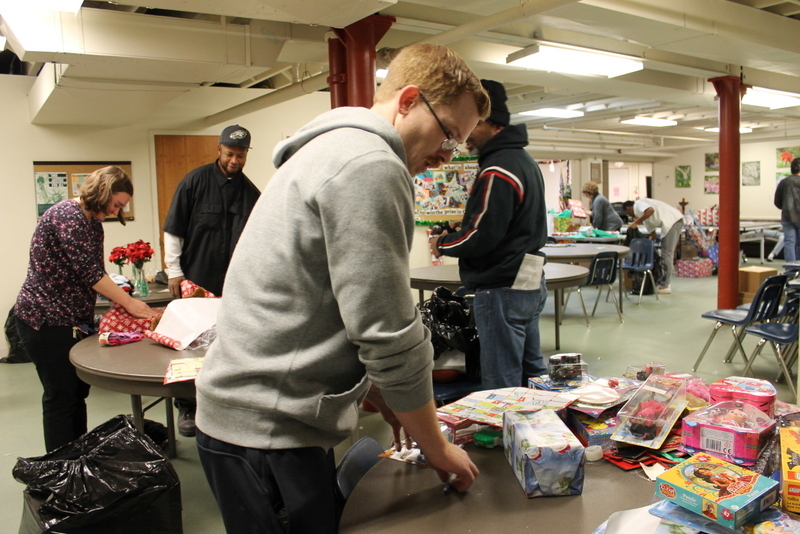 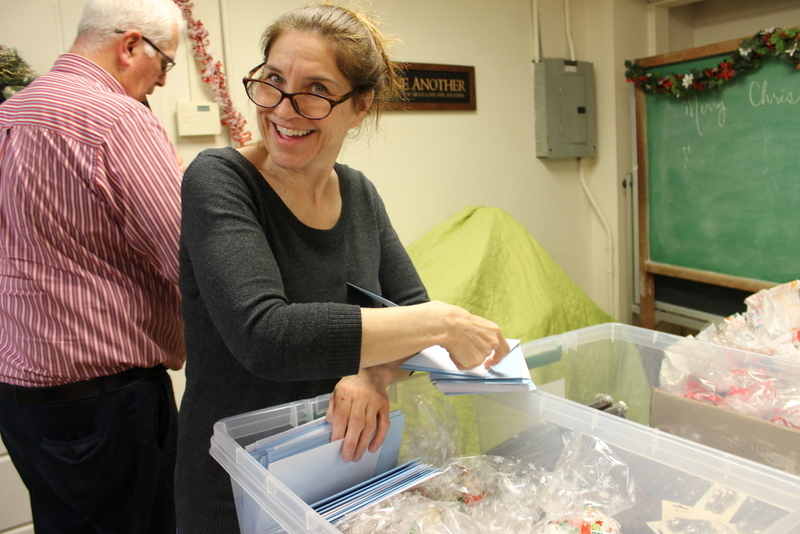 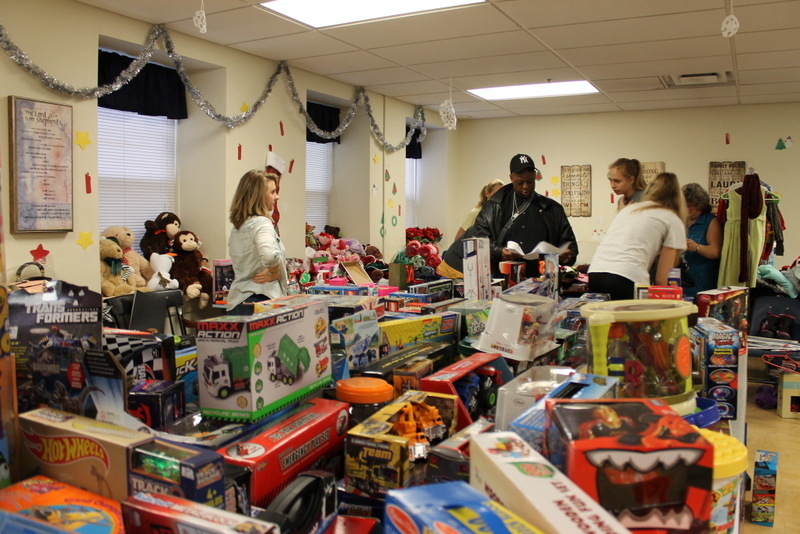 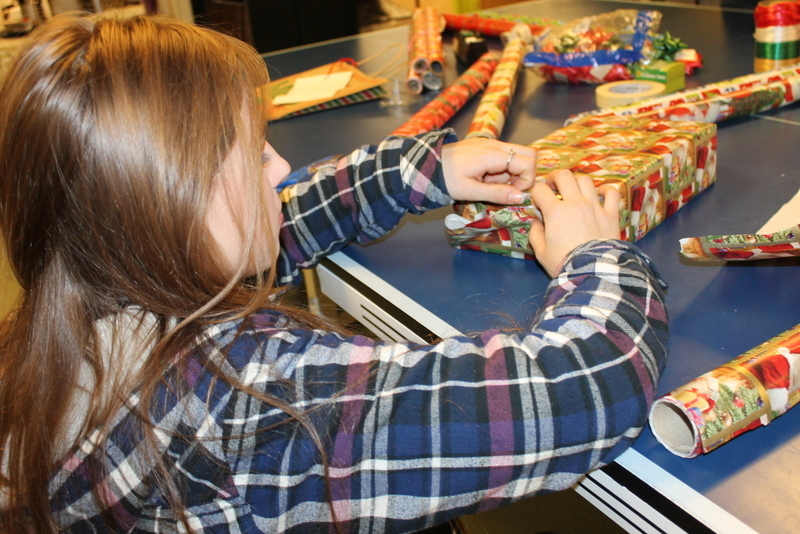 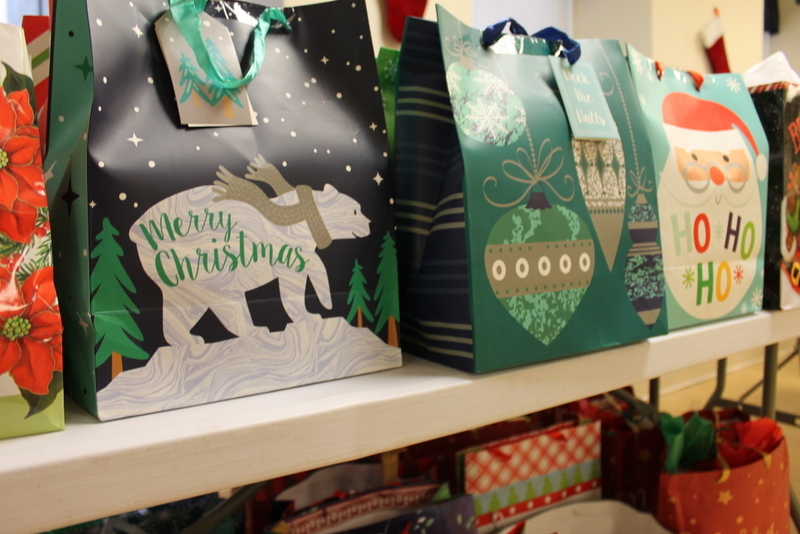 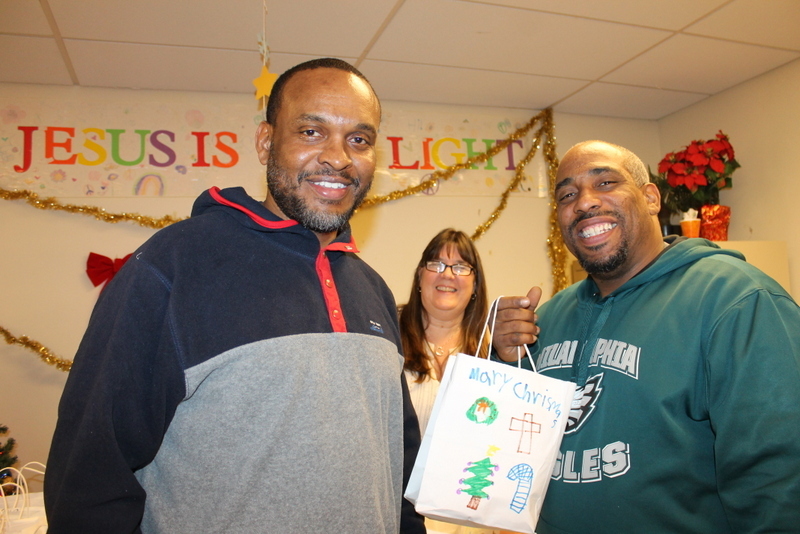 Each man was blessed with about 2 dozen Christmas presents lovingly prepared for them by churches and families. 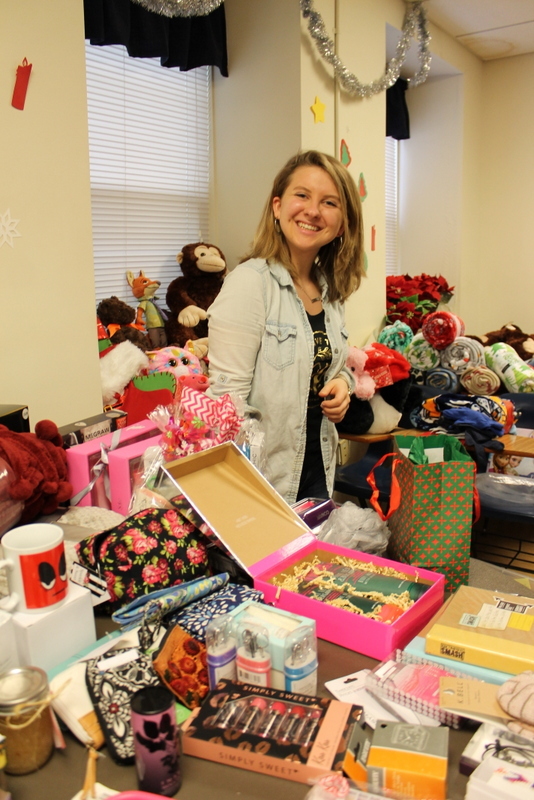 This year’s gifts included gift cards, scarves, hats, gloves, socks, candy, professional portfolio folders, pens, thermal travel mugs, umbrellas, homemade treats and various other presents. 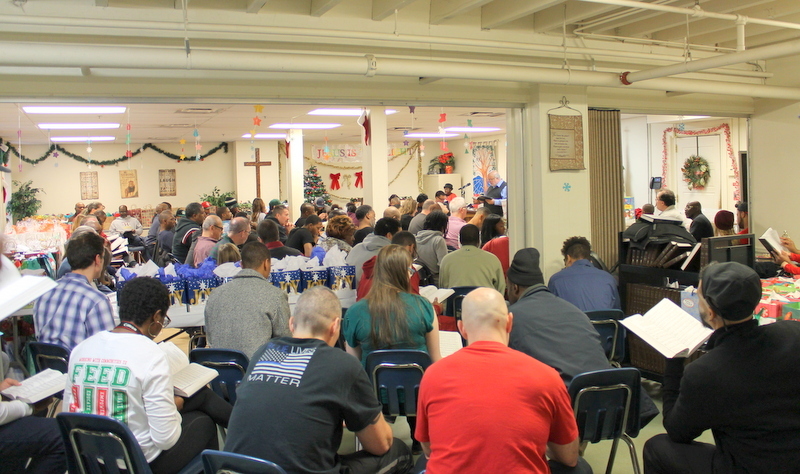 At a time when people can feel so alone, thank you for sharing the love of Jesus, our Emmanuel, God with us! 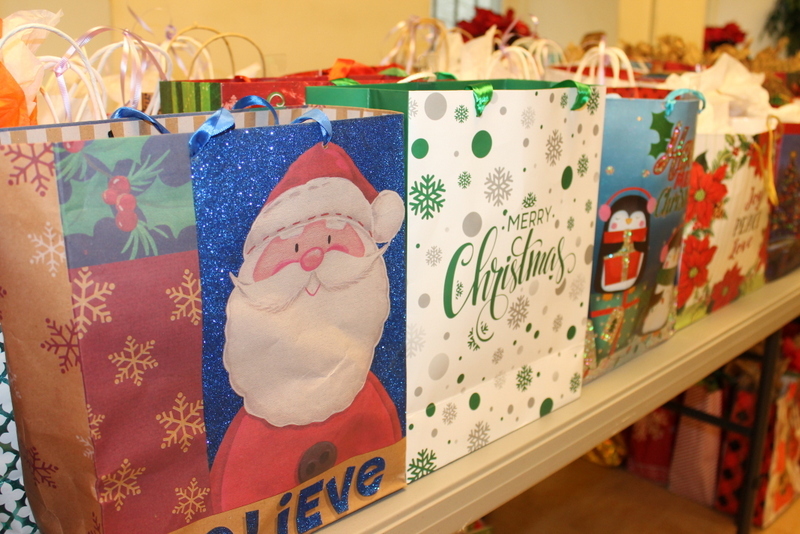 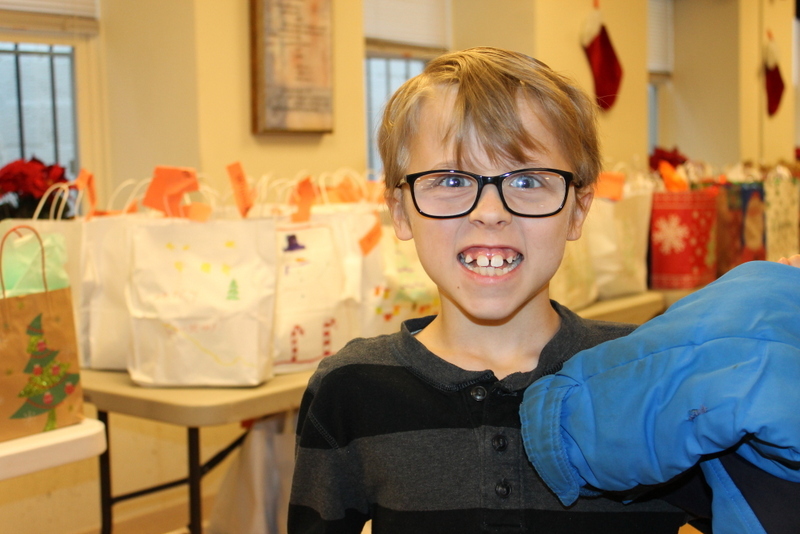 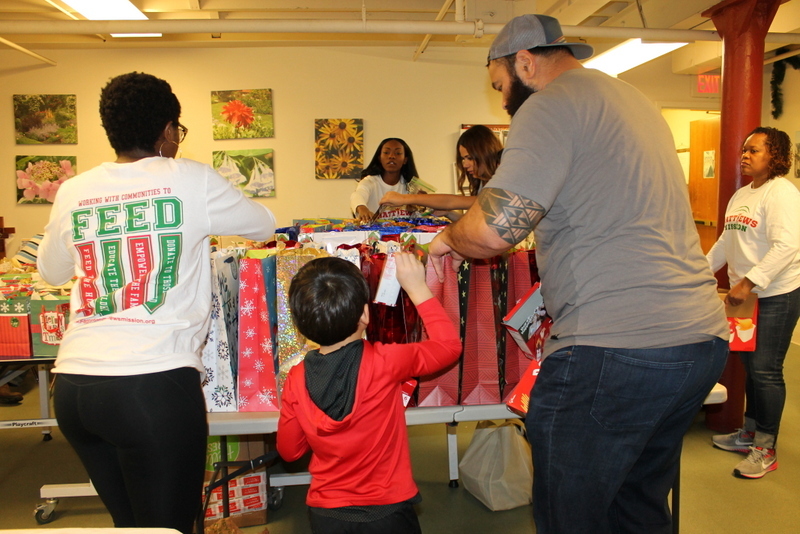 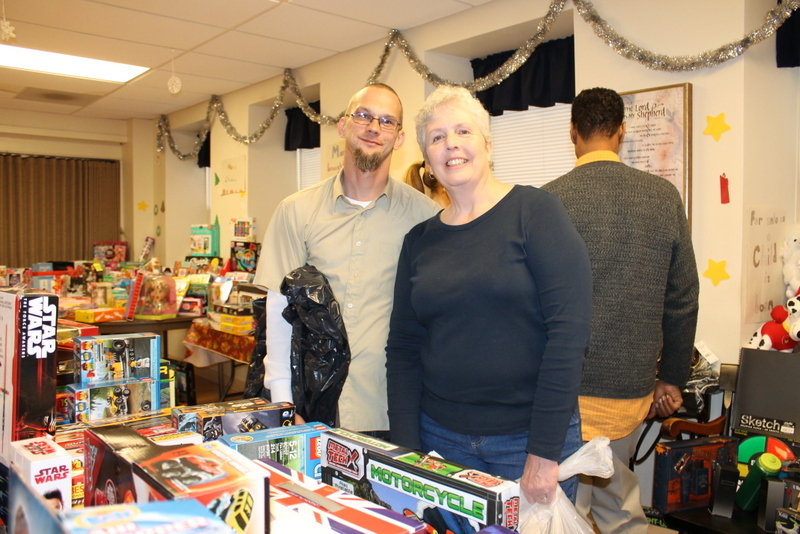 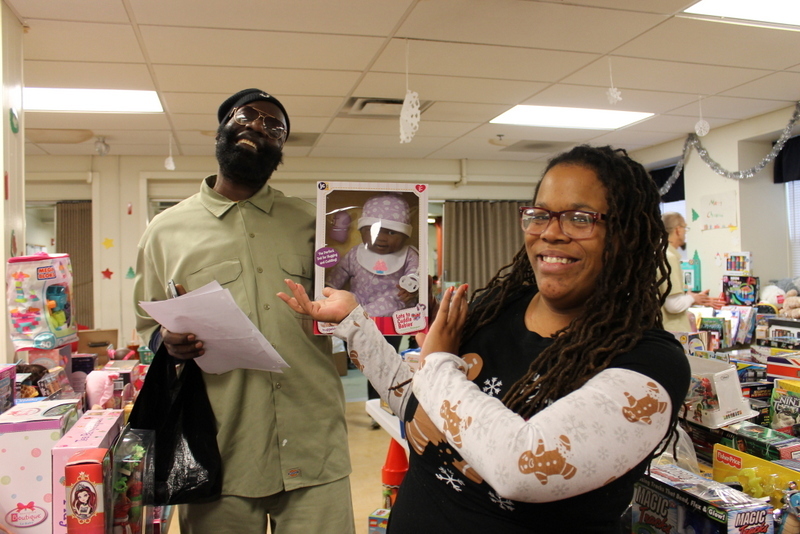 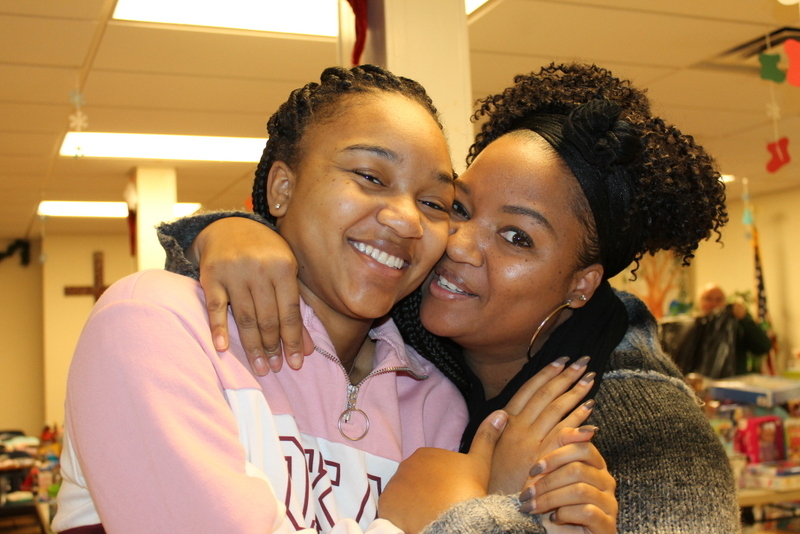 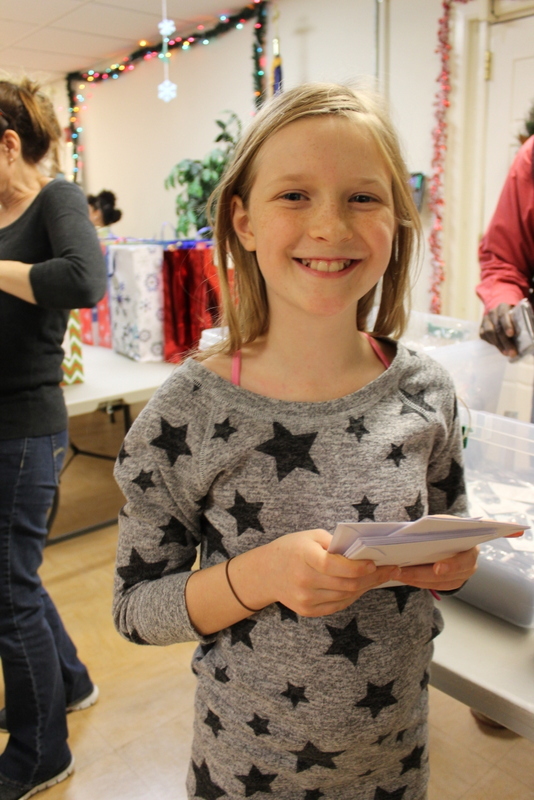 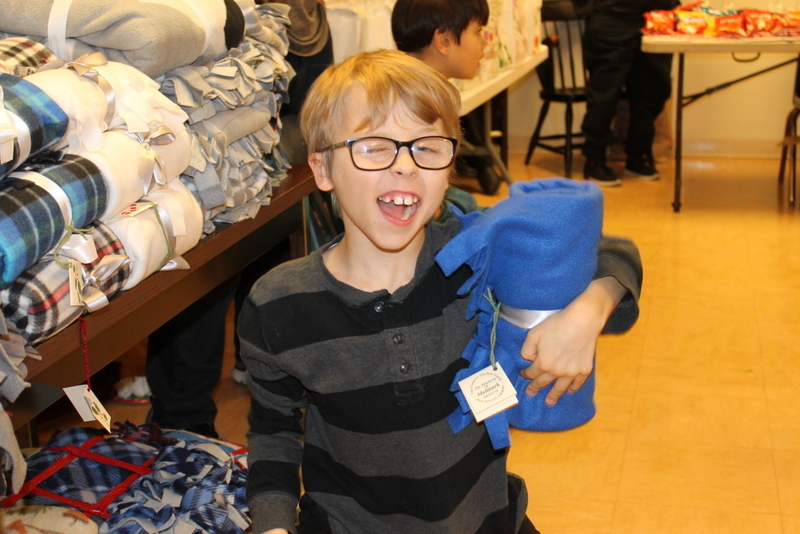 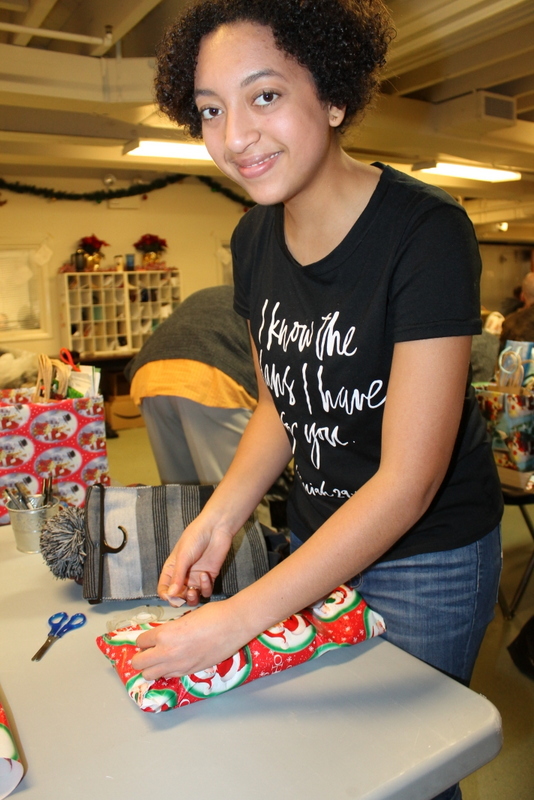 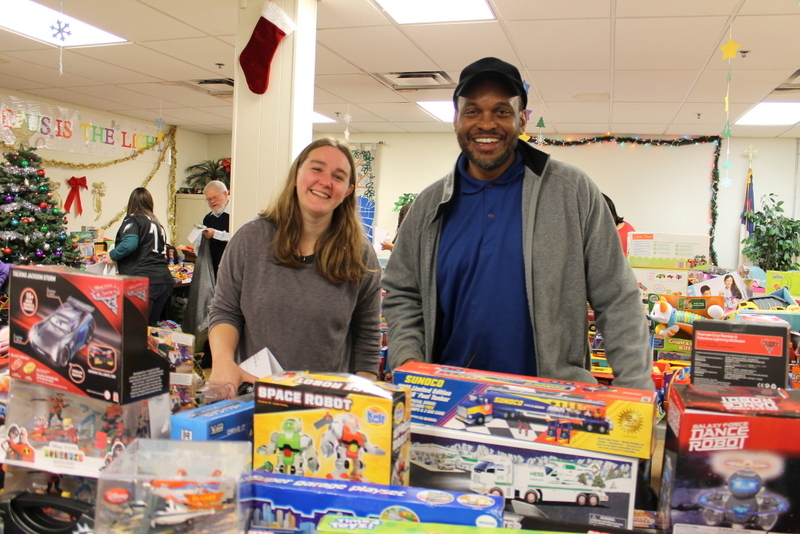 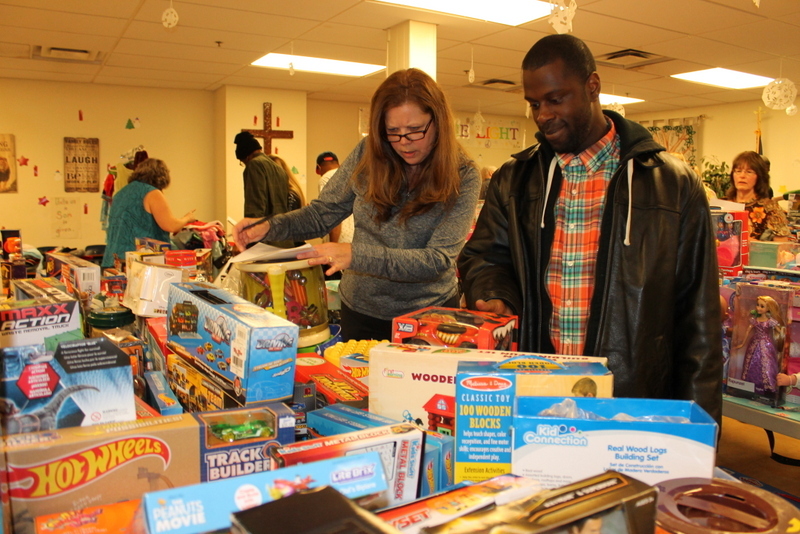 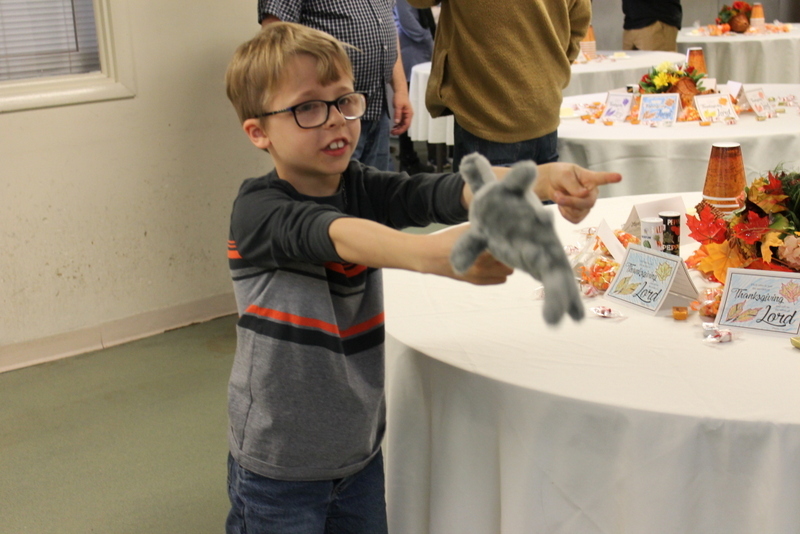 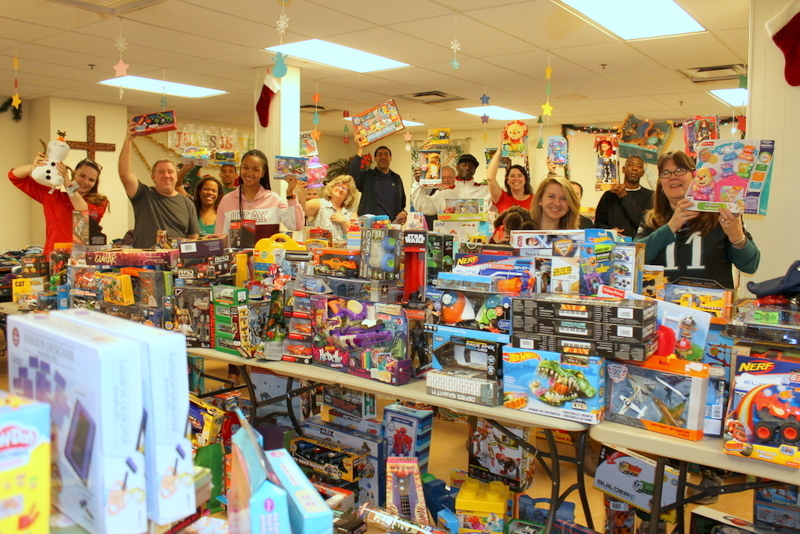 On Thursday, December 20th, our chapel was transformed into a toy store and 54 of our New Life Program residents and graduates selected and wrapped about 1,500 gifts for 201 of their kids. 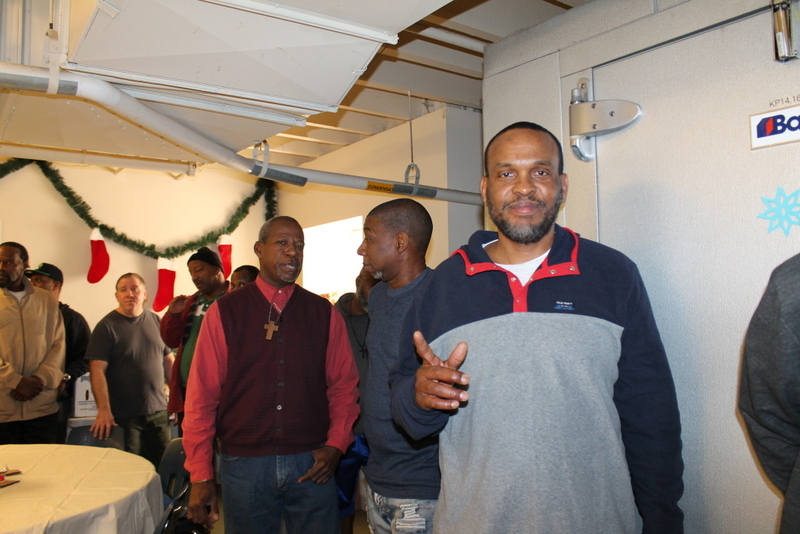 See some of the joy and excitement as men reach out to rebuild and strengthen bridges to family and home. 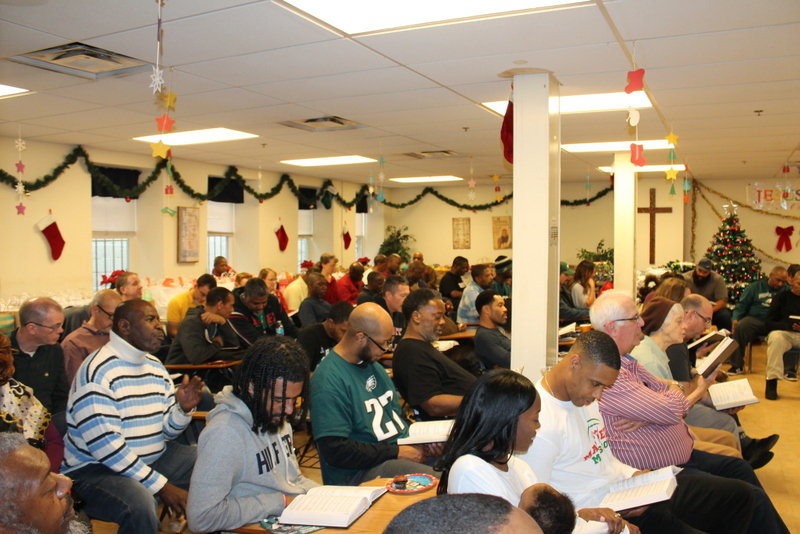 The men who come to the Whosoever Gospel Mission looking for help and a way forward are sons and fathers, brothers and cousins, husbands, nephews, uncles, grandfathers and grandsons. 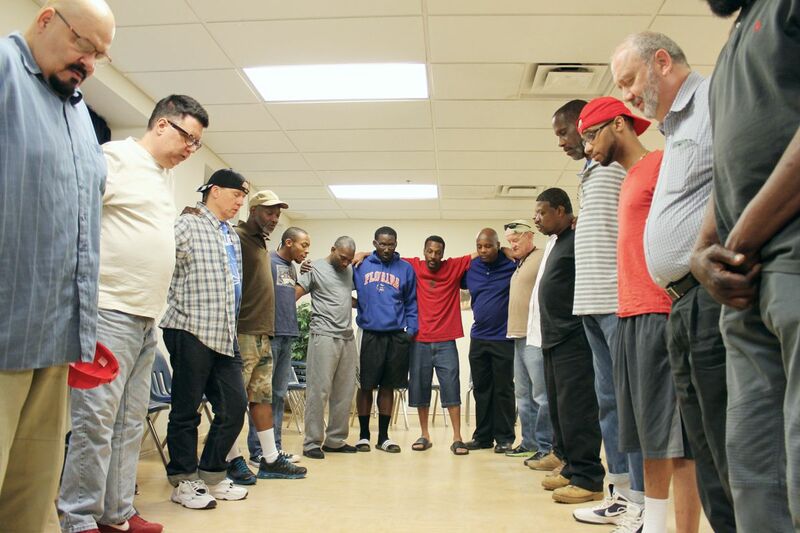 Addiction and homelessness can eat away at these relationships leaving both the men and their families grieving the loss. 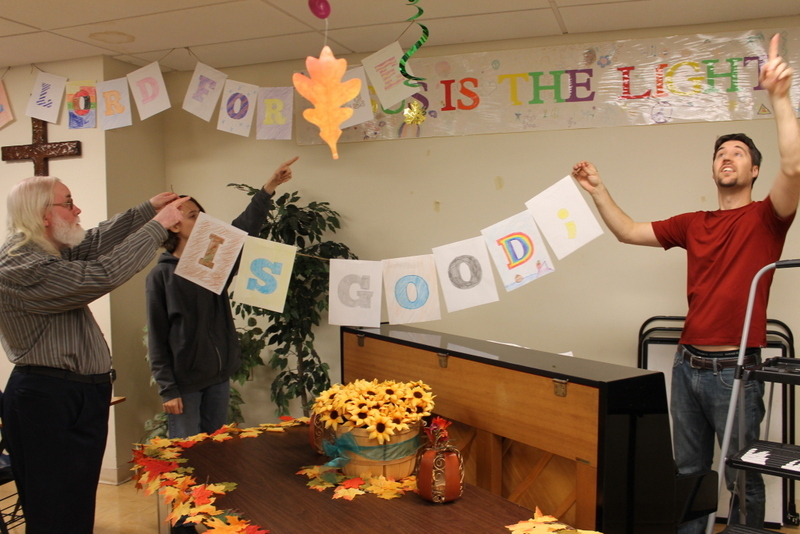 But there is hope! 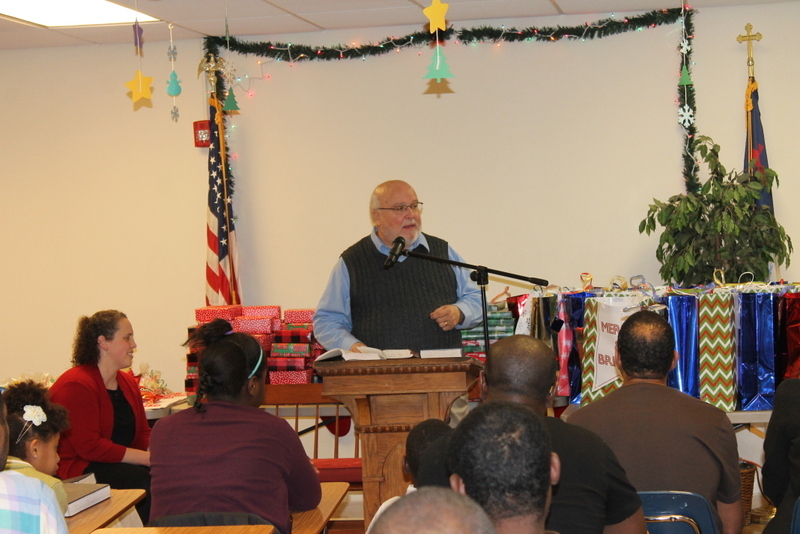 Jesus is the great Reconciler. 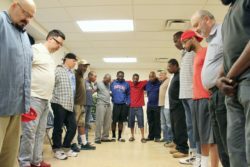 Here at the Mission we get to see God at work restoring relationships and rebuilding families as men work hard by God’s grace to rebuild trust, make themselves vulnerable, and repair broken relationships. 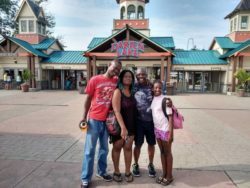 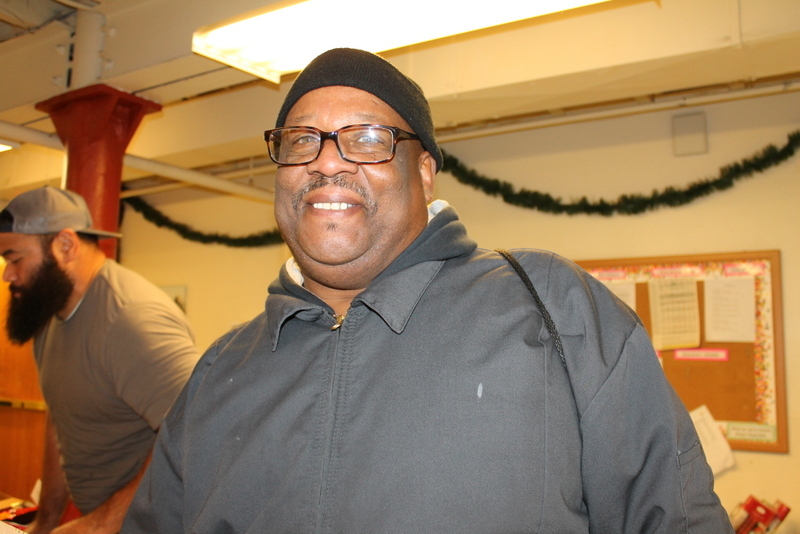 Alton hasn’t had much to do with his family for ten years – not since he moved out when he was 18 years old. 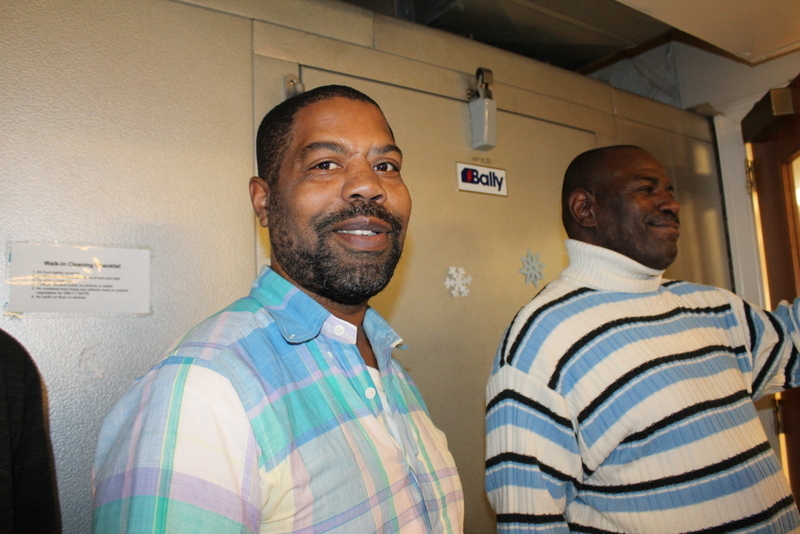 Over the years, his dad has tried to reach out to him, but Alton would never respond. 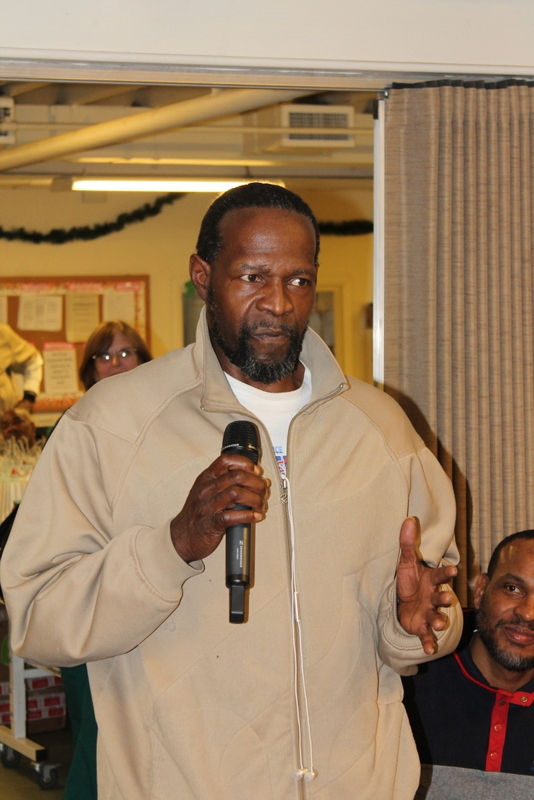 He spent the next ten years living mostly in the streets until coming to the Mission. 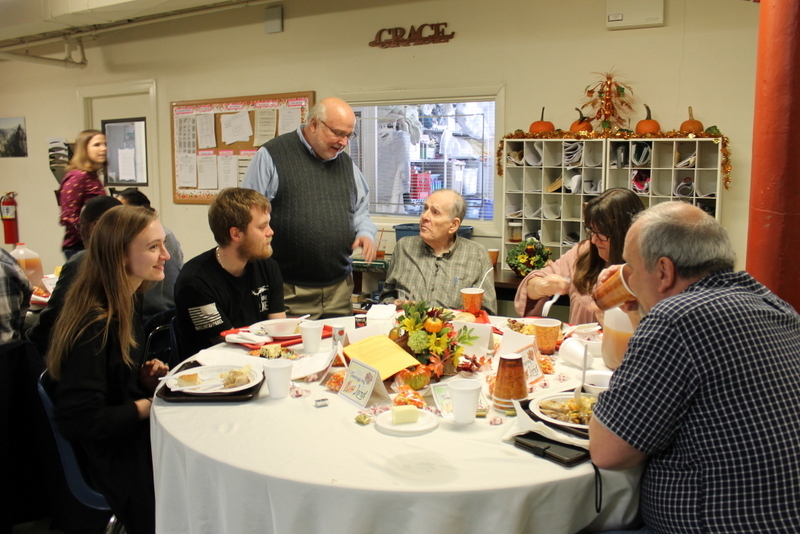 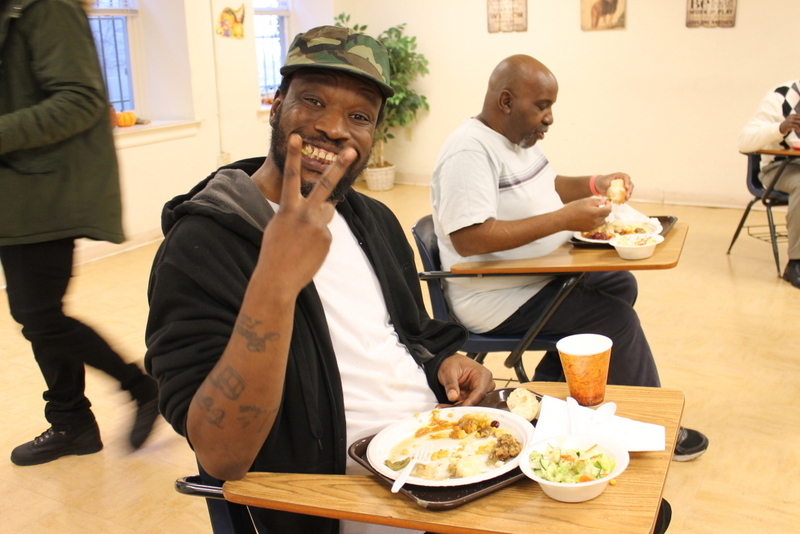 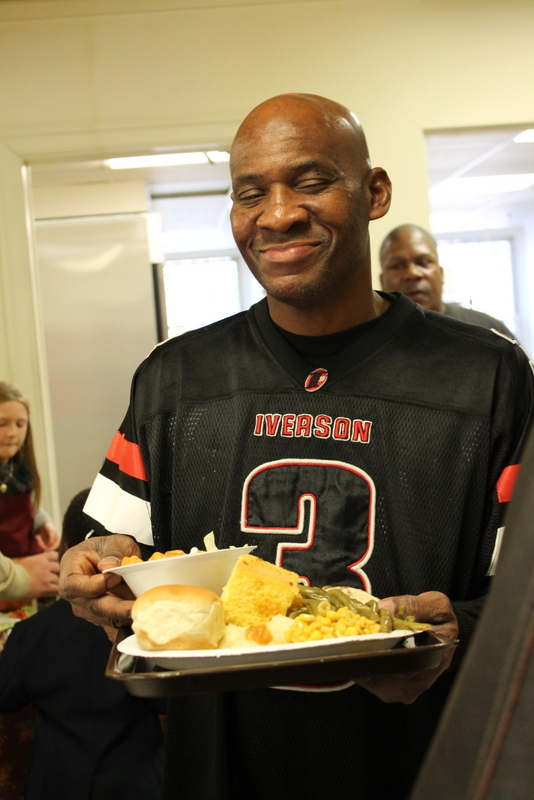 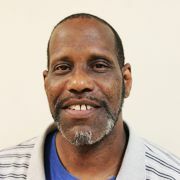 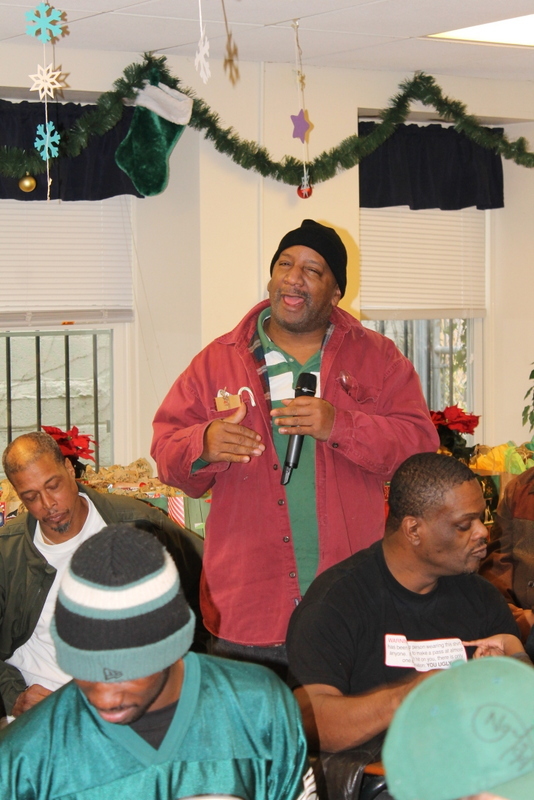 Alton shares that he’s thankful for the counseling he receives here at the Mission. 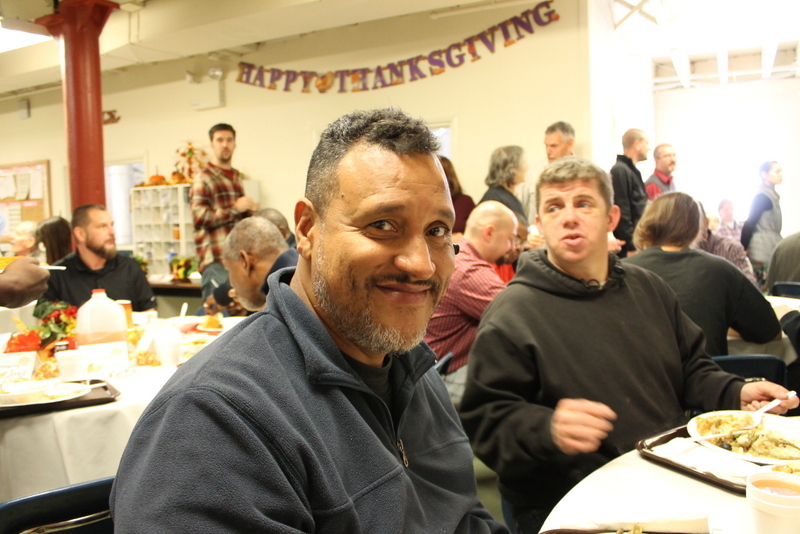 It’s given him a chance to talk with someone who loves him and is willing to listen. 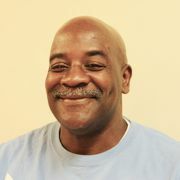 He found himself able to trust his counselor and open up about hurts he had been holding on to for a long time. 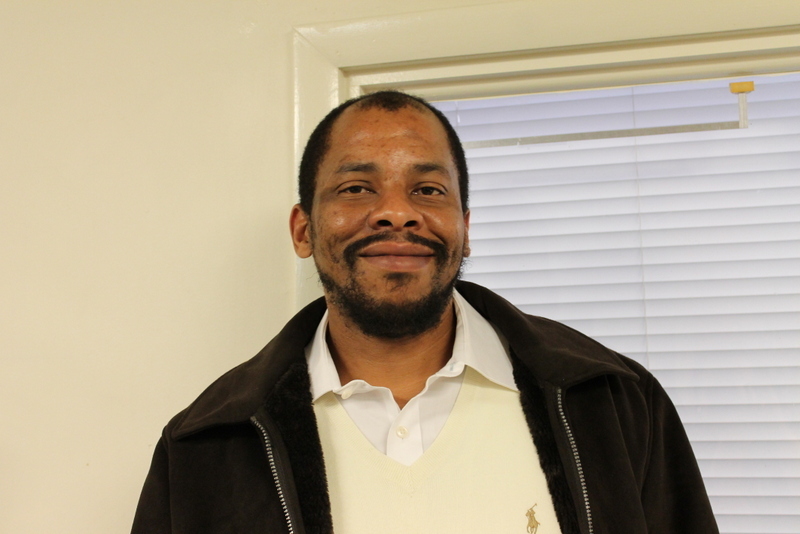 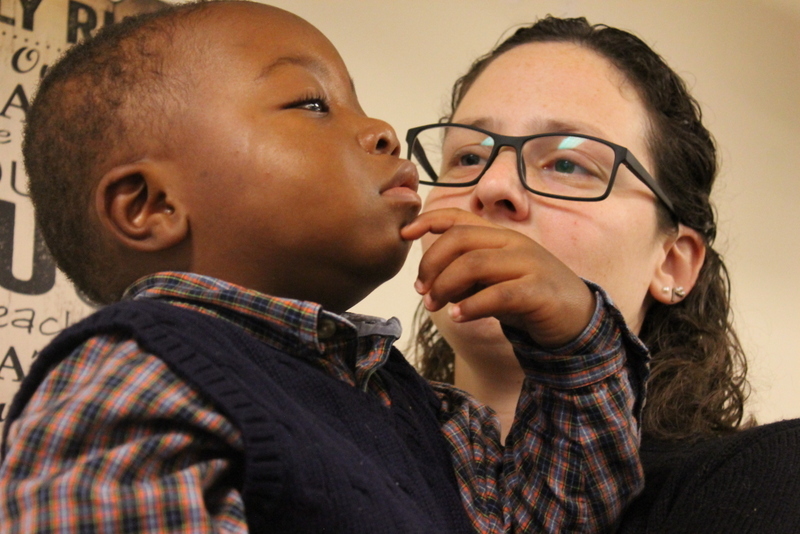 With counsel, Alton was able to begin seeing things from a new perspective. 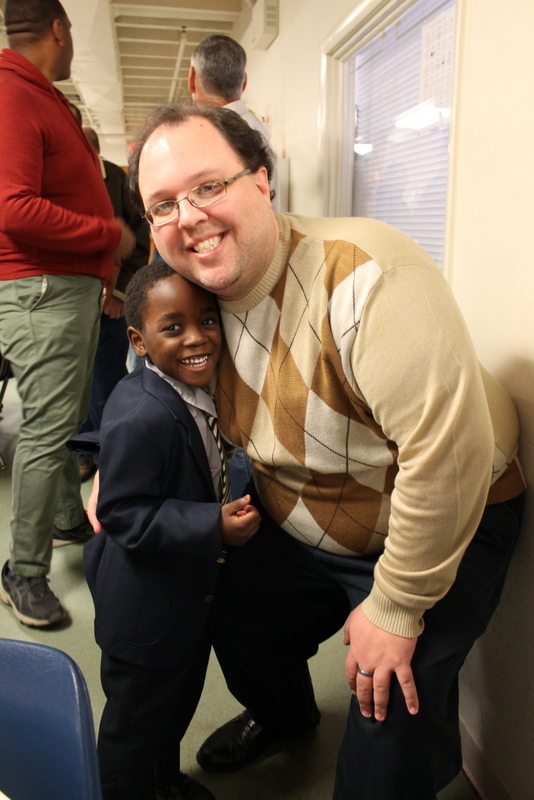 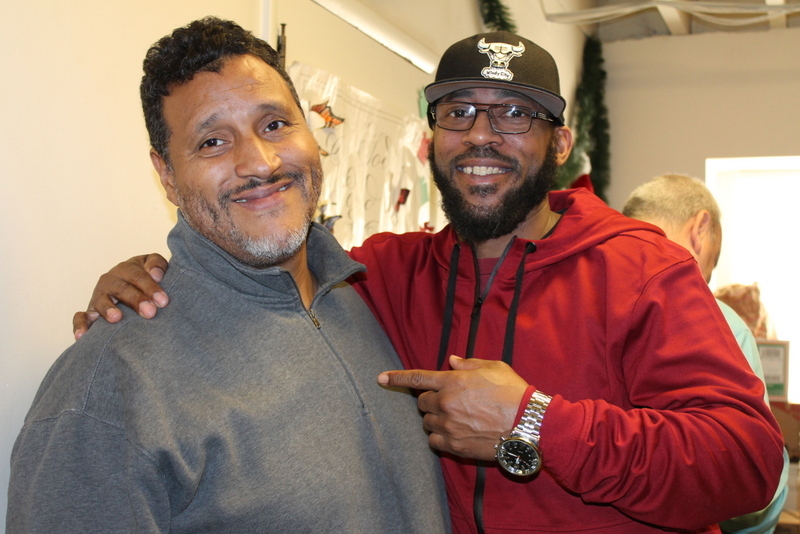 Since coming to the Mission, Alton has made two trips home to New York to spend time with family, and both were a blessing! 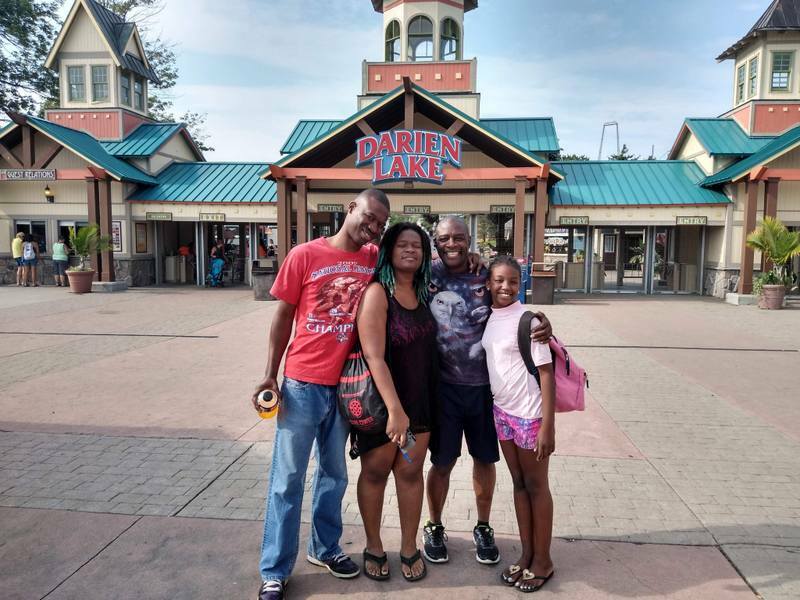 Here are a few highlights of our summer! 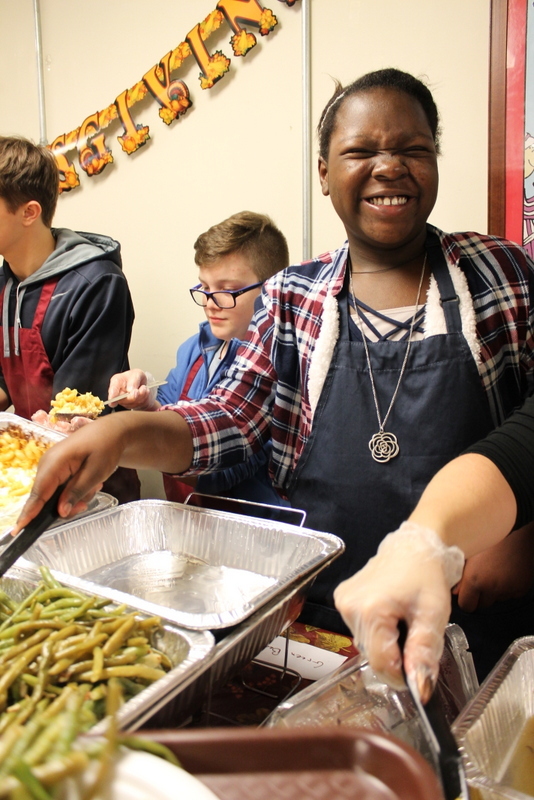 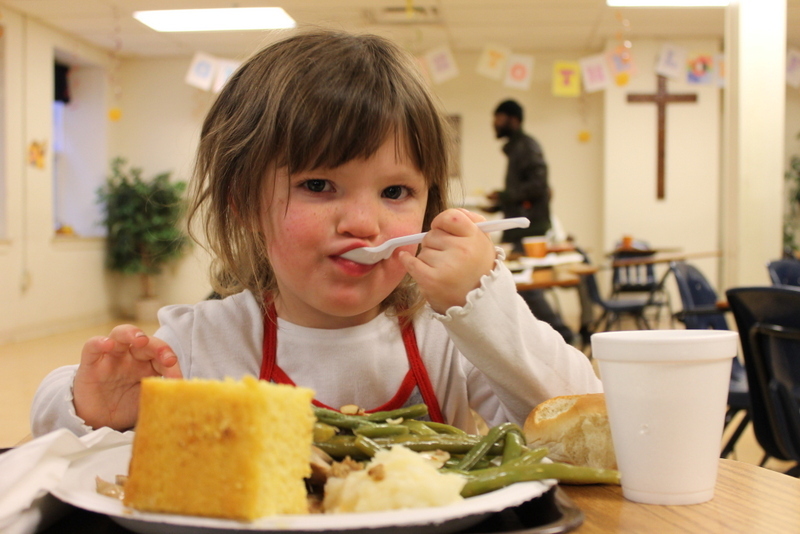 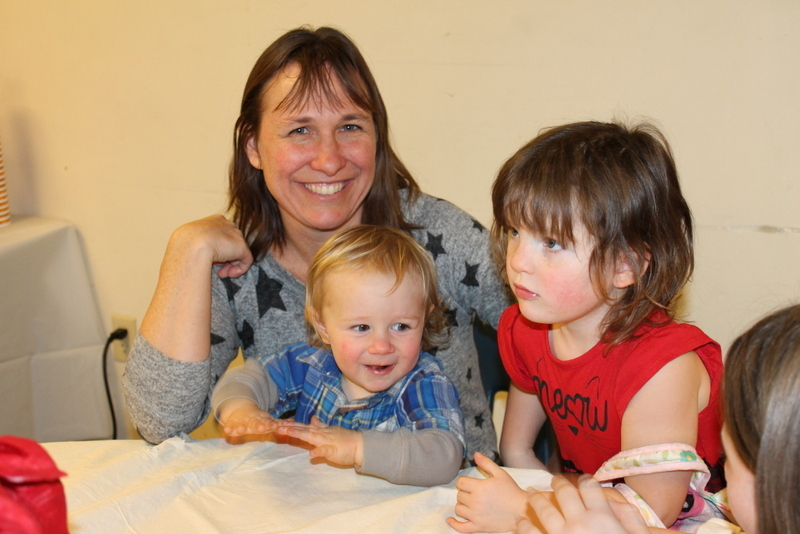 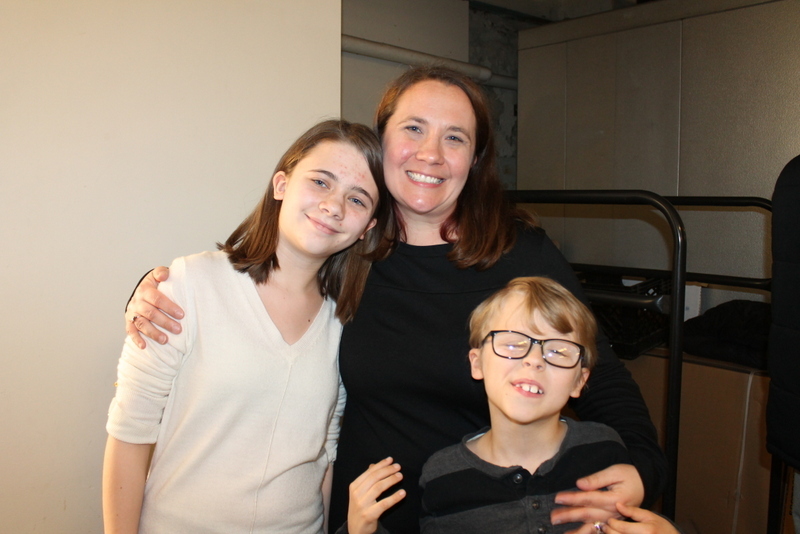 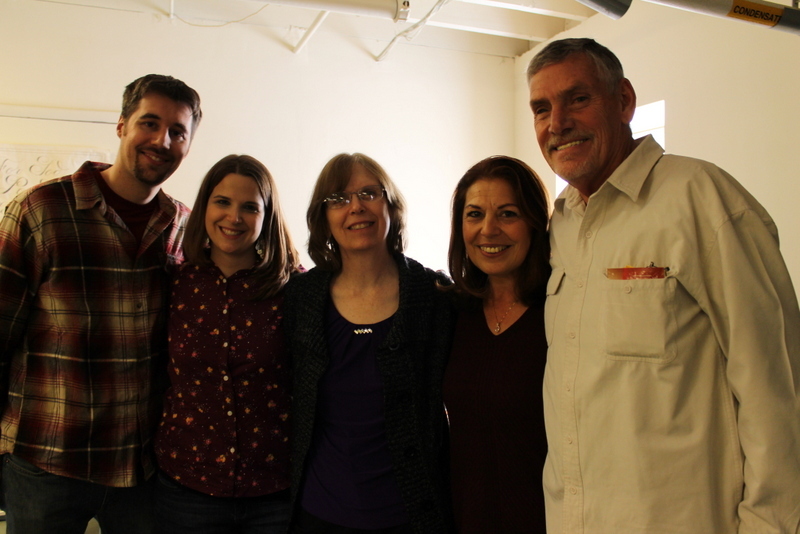 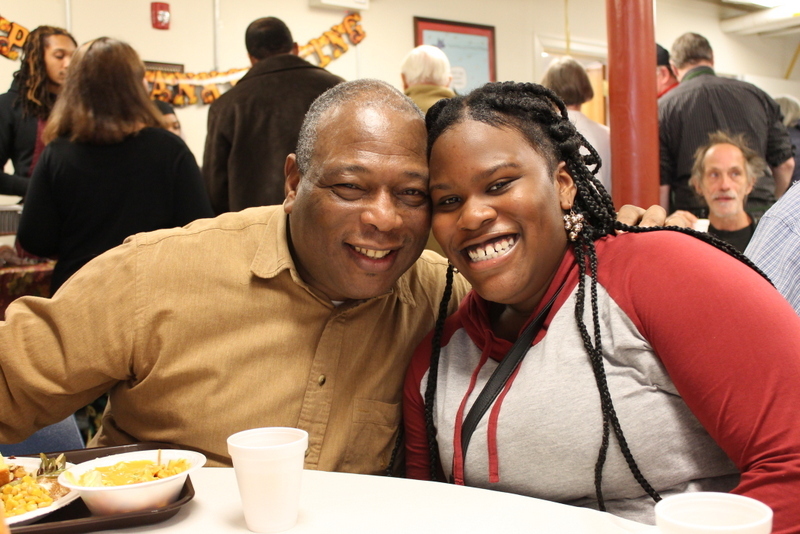 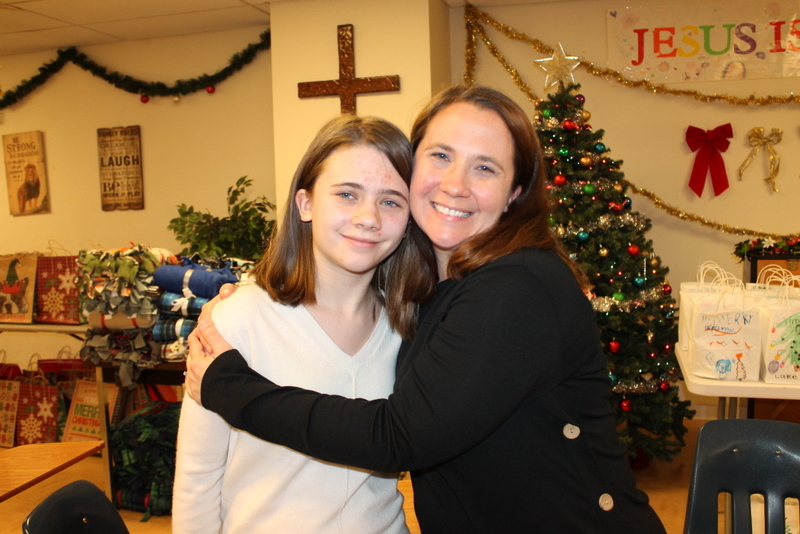 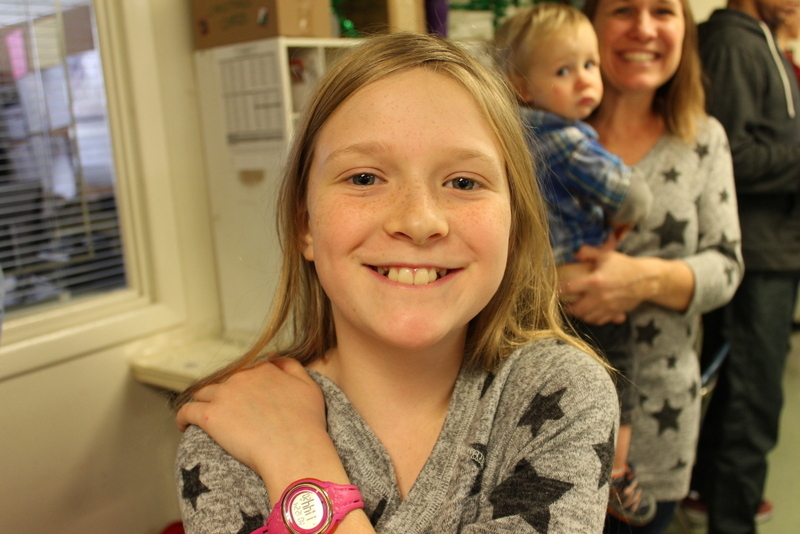 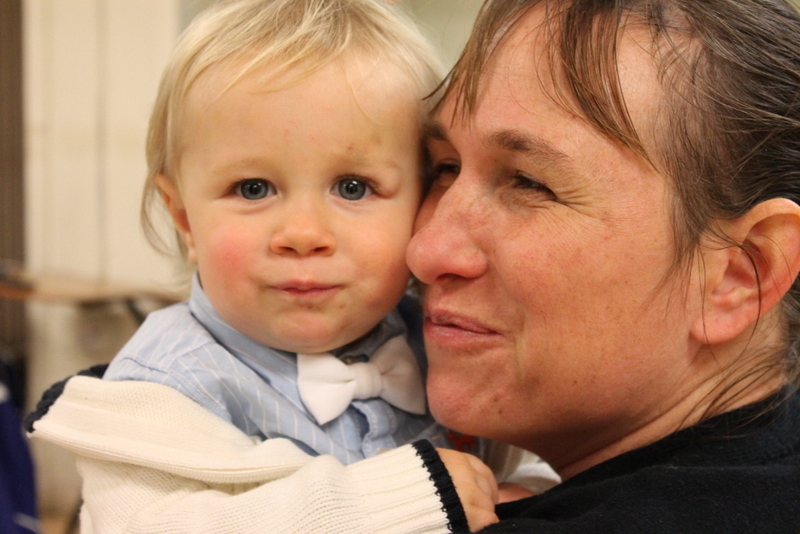 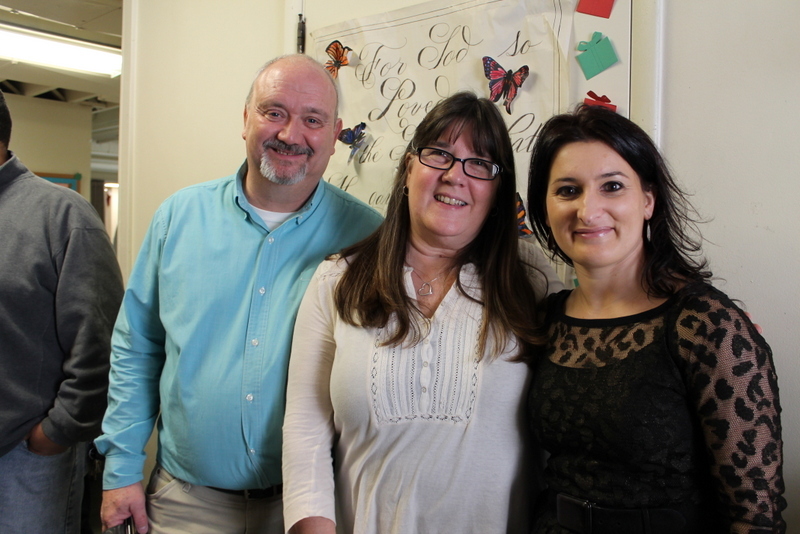 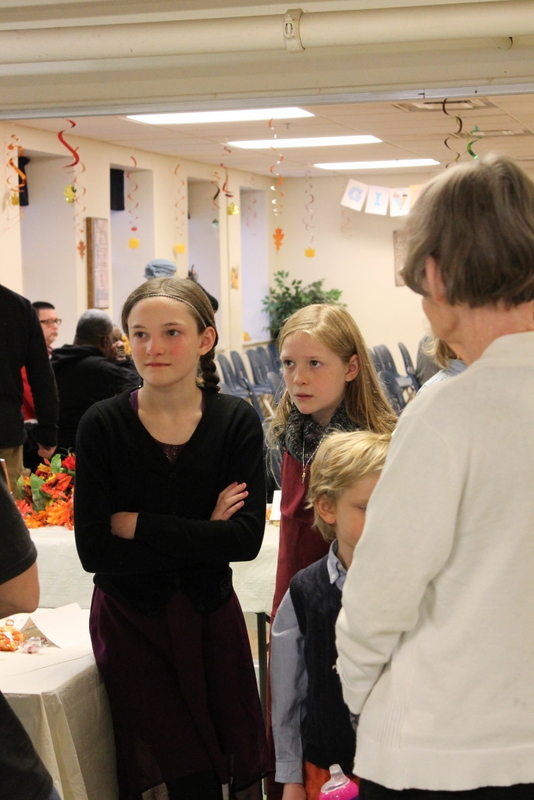 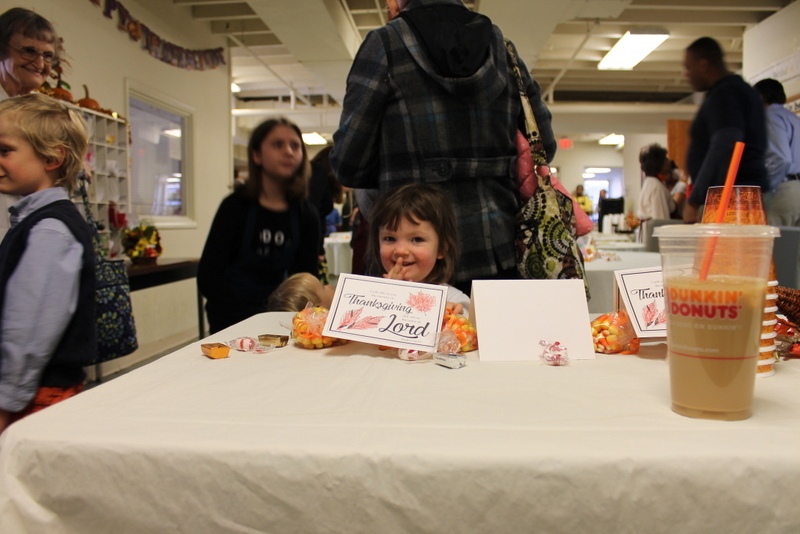 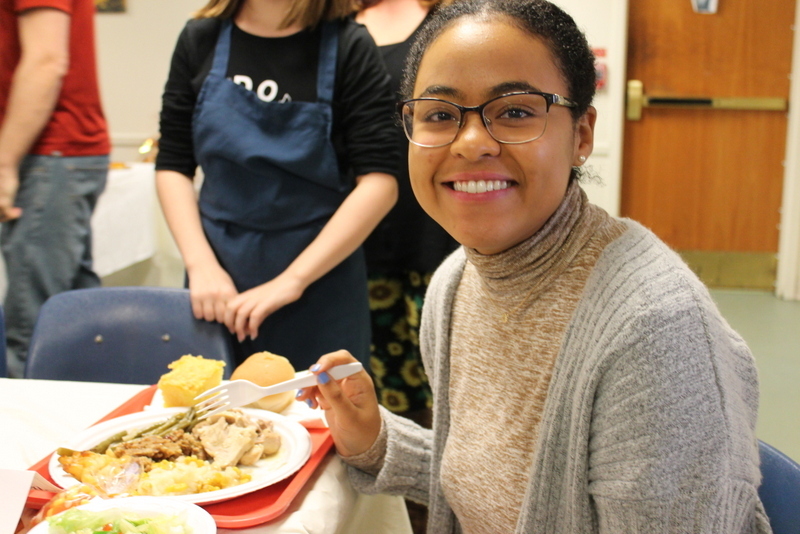 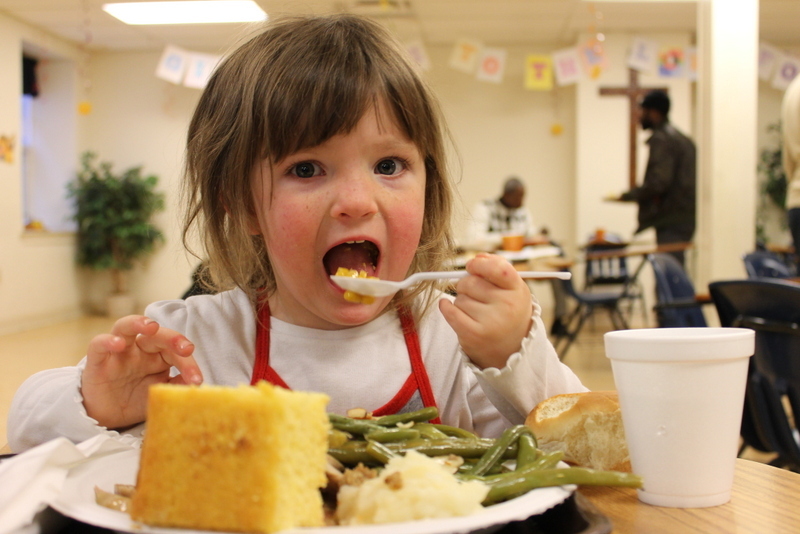 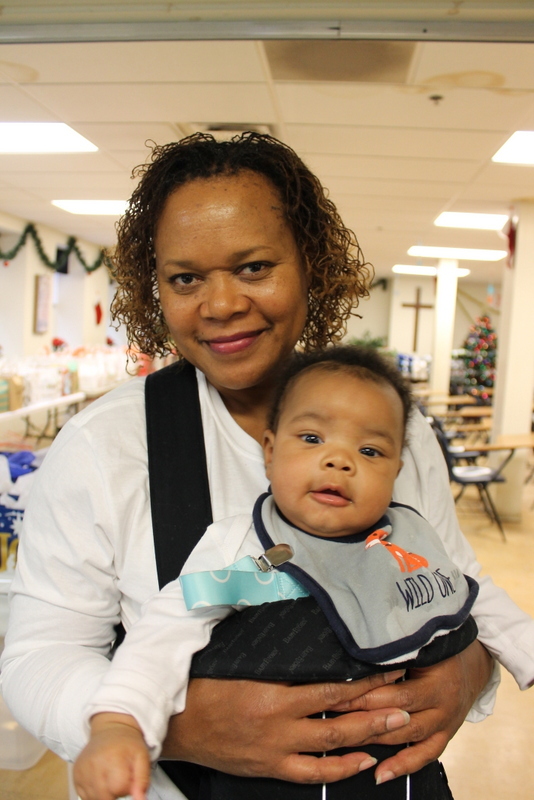 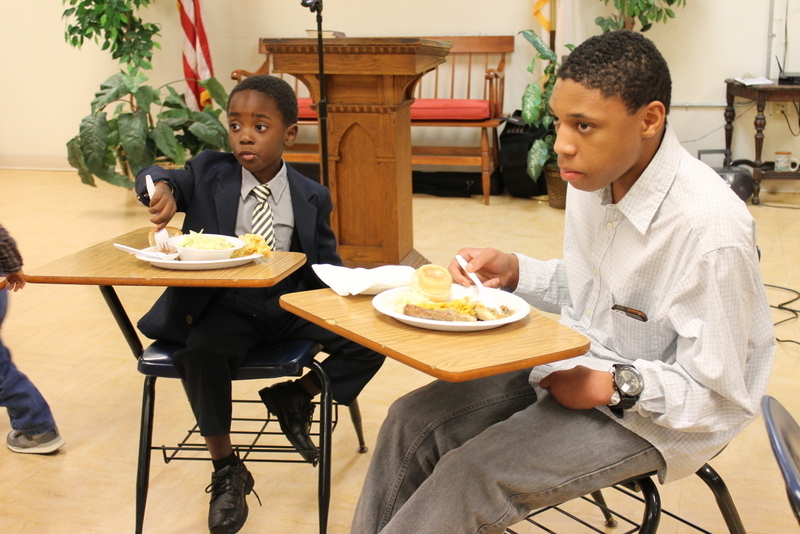 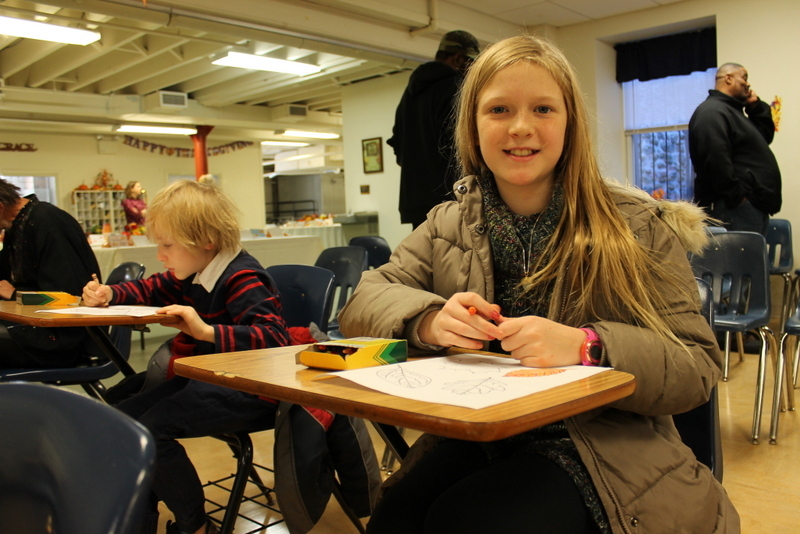 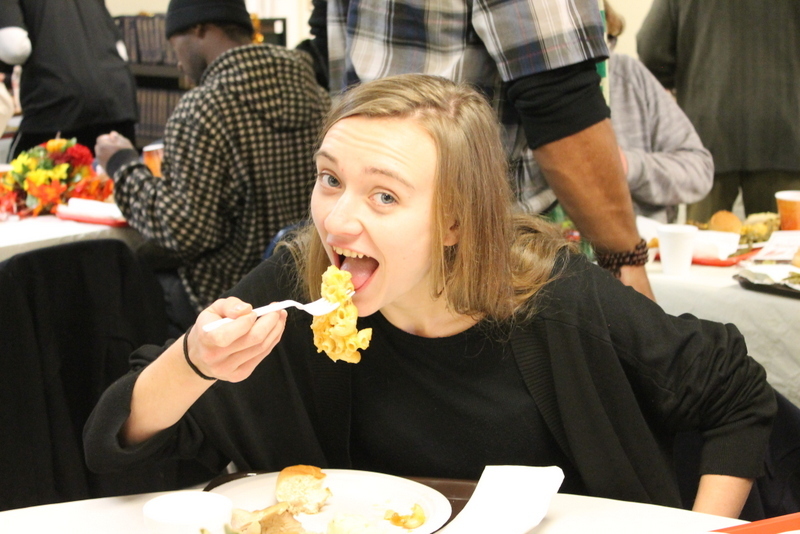 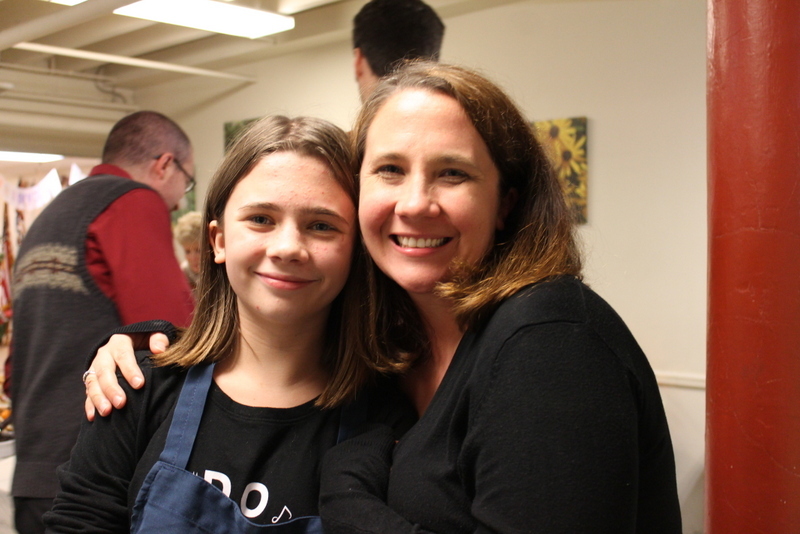 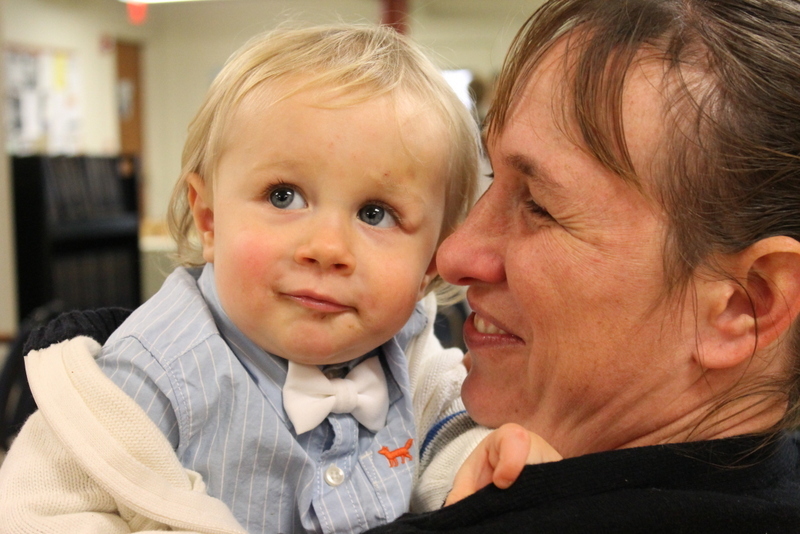 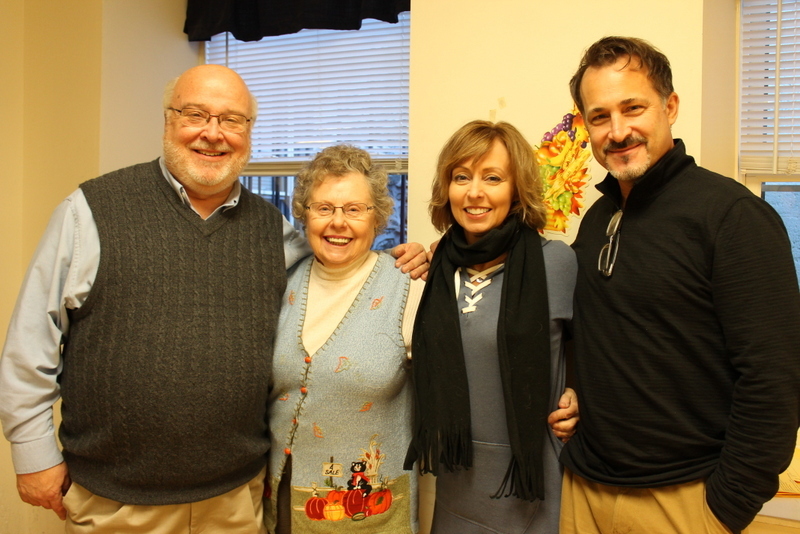 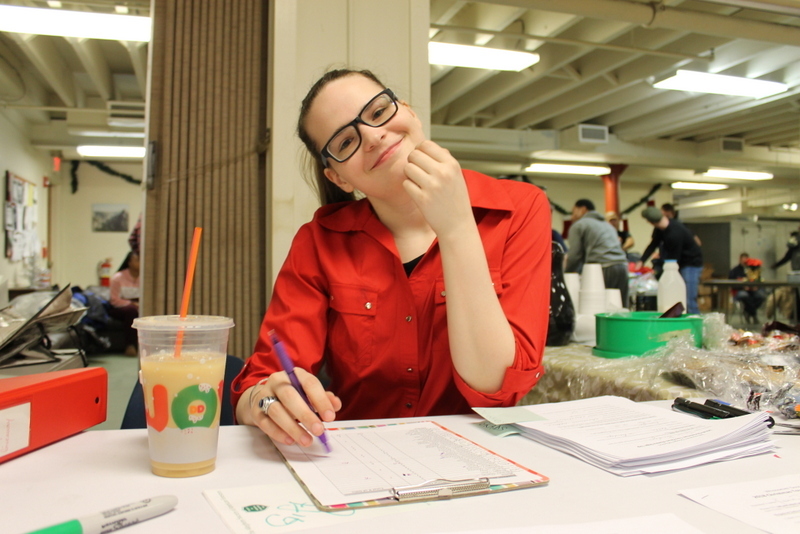 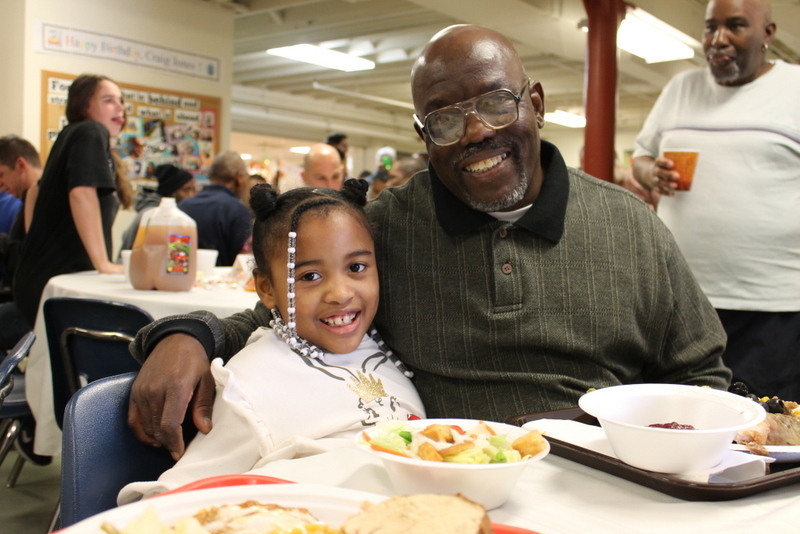 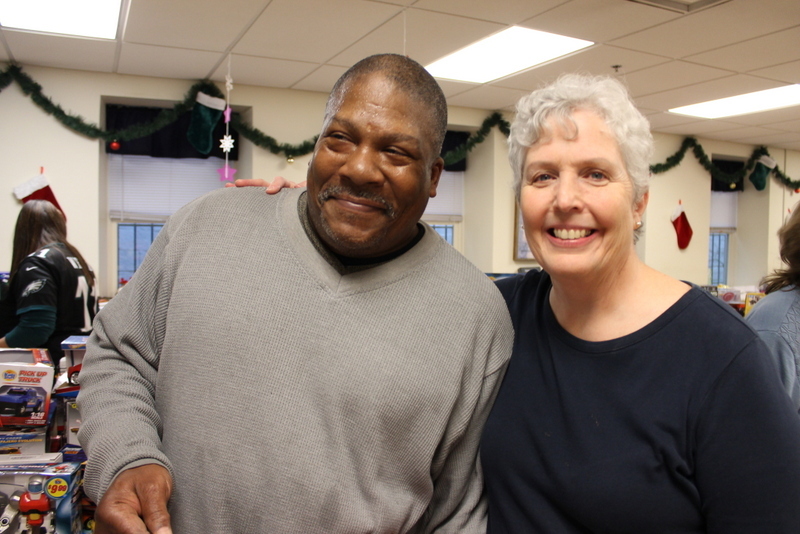 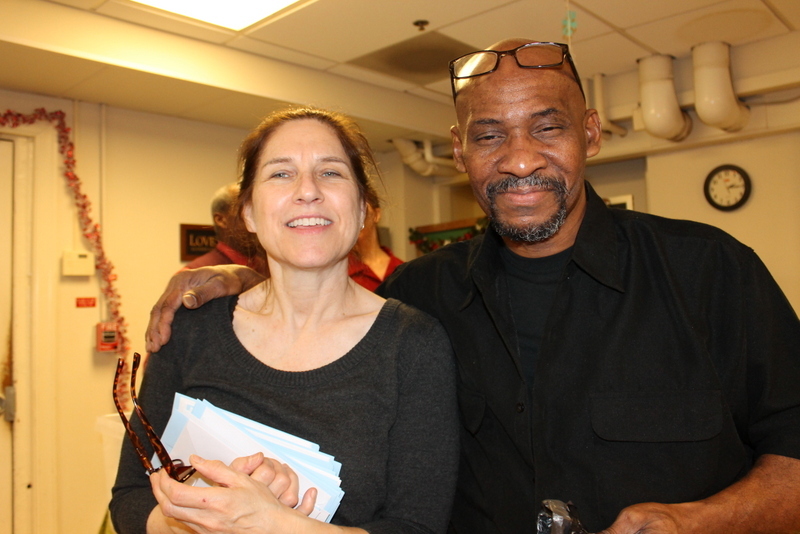 Cordie and Robert both faced big health challenges while at the Mission. 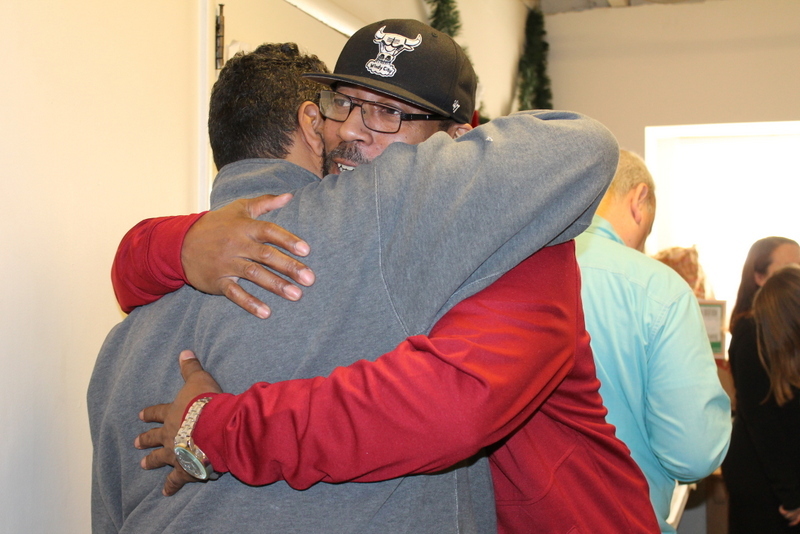 While they were here, they accessed the medical care they needed and worked hard to get back on their feet. 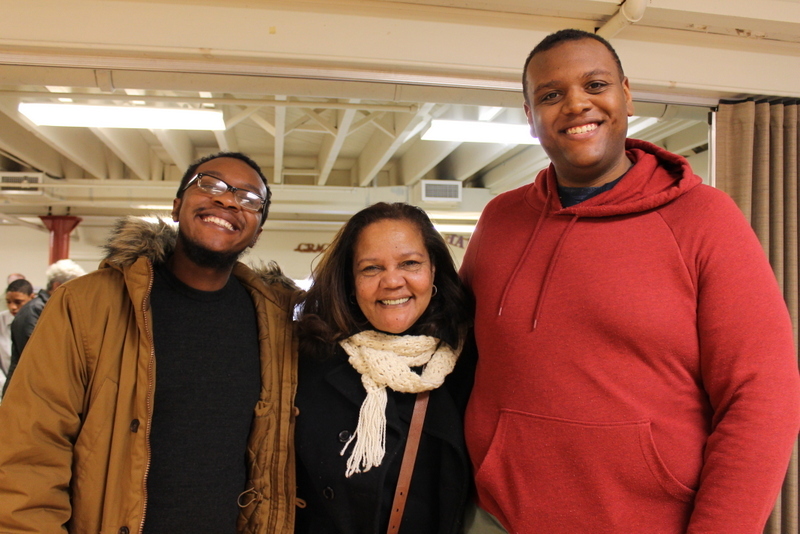 Both Cordie and Robert had long journeys to moving into their own places and graduating. 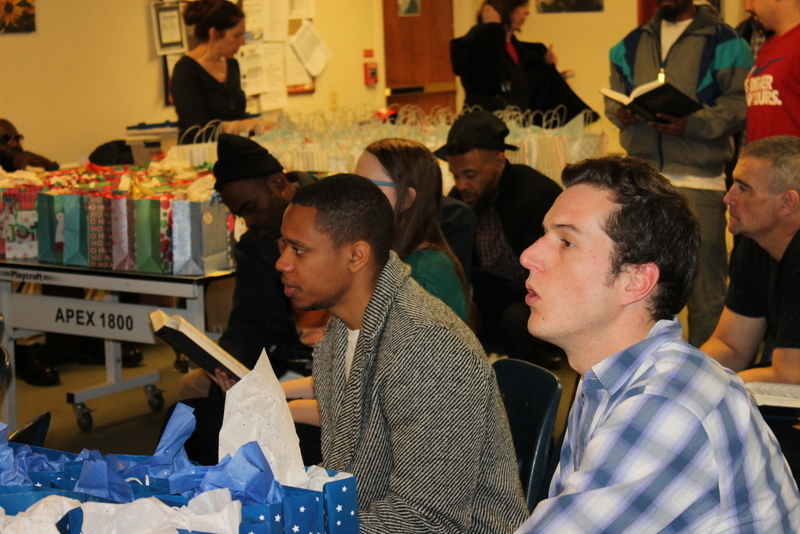 But move out and graduate they did! 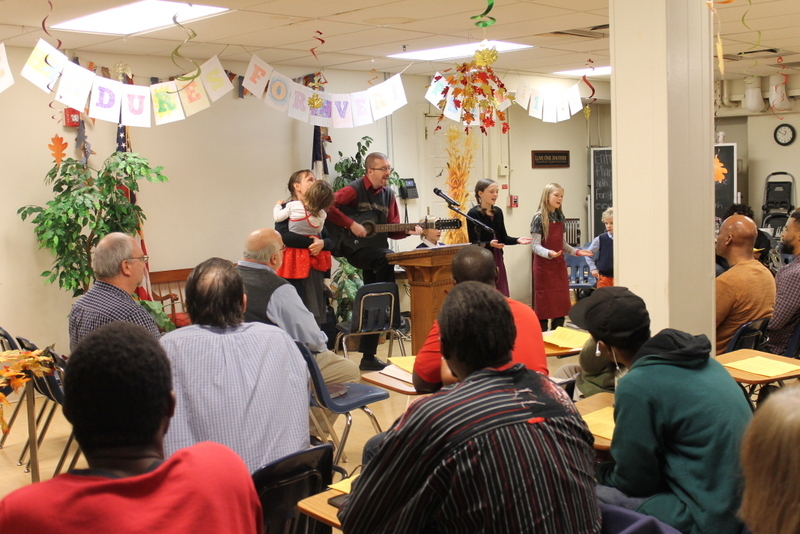 We celebrated their graduation with cake and balloons, the sharing of testimonies, singing, and a charge to the graduates from God’s Word. 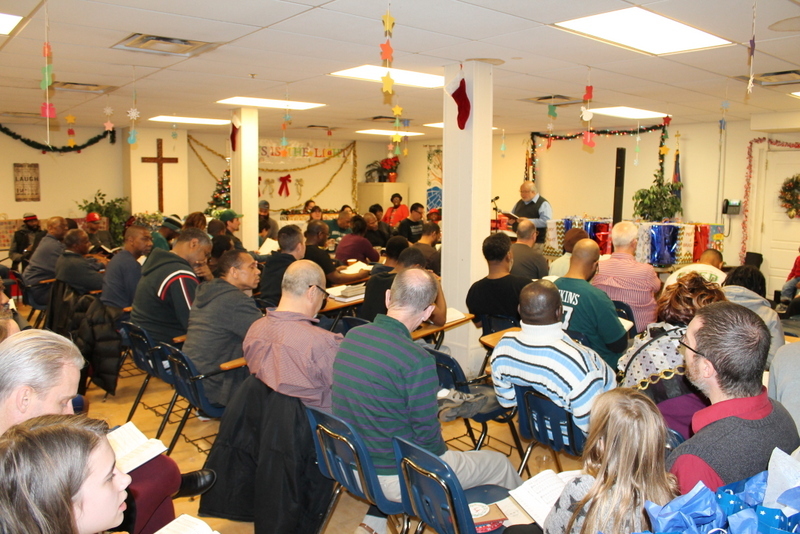 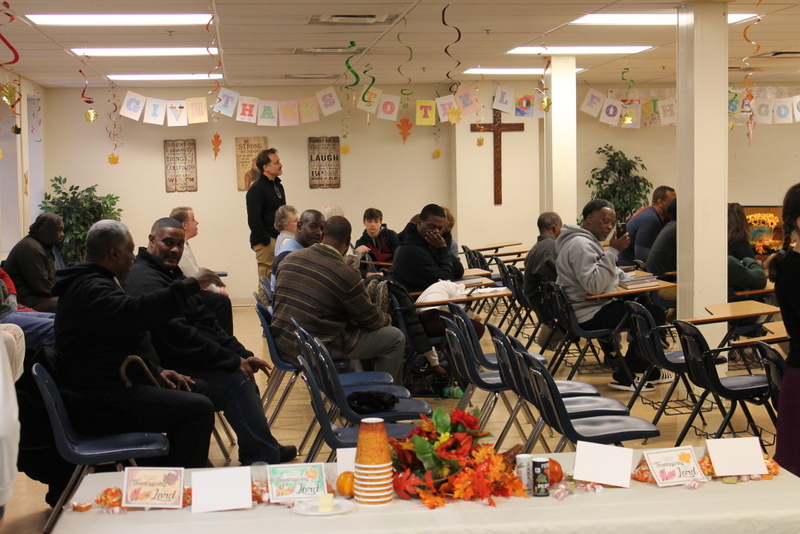 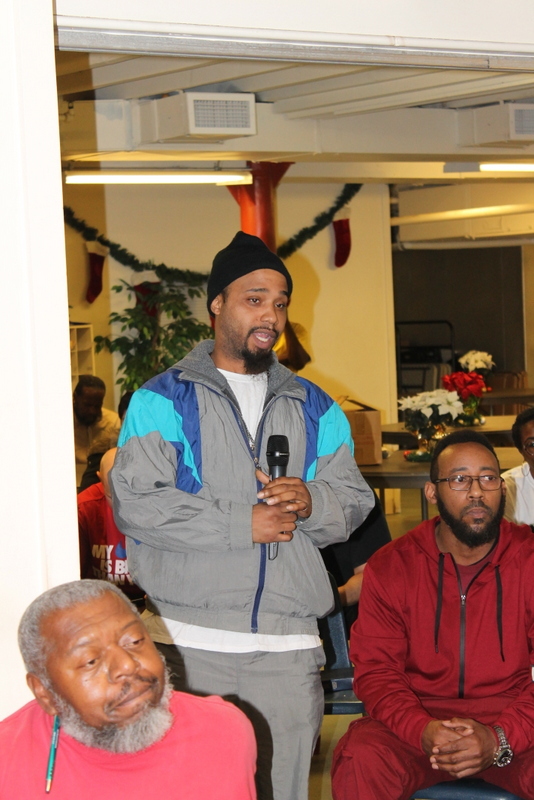 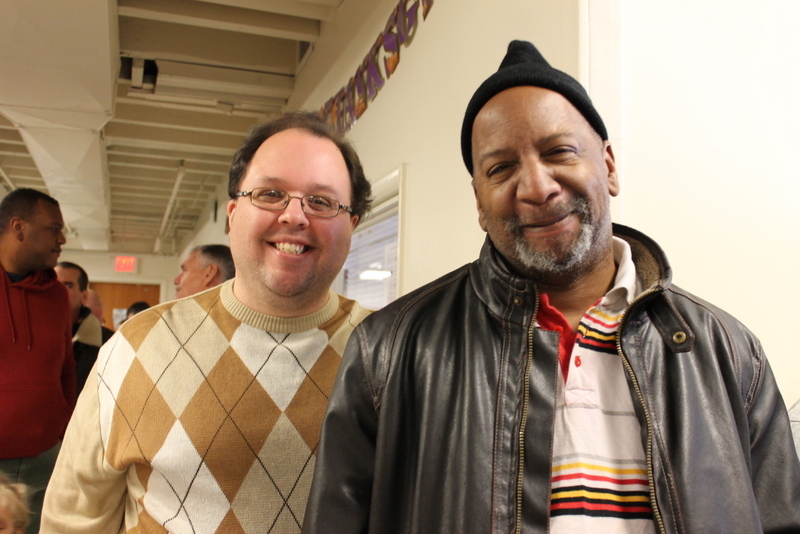 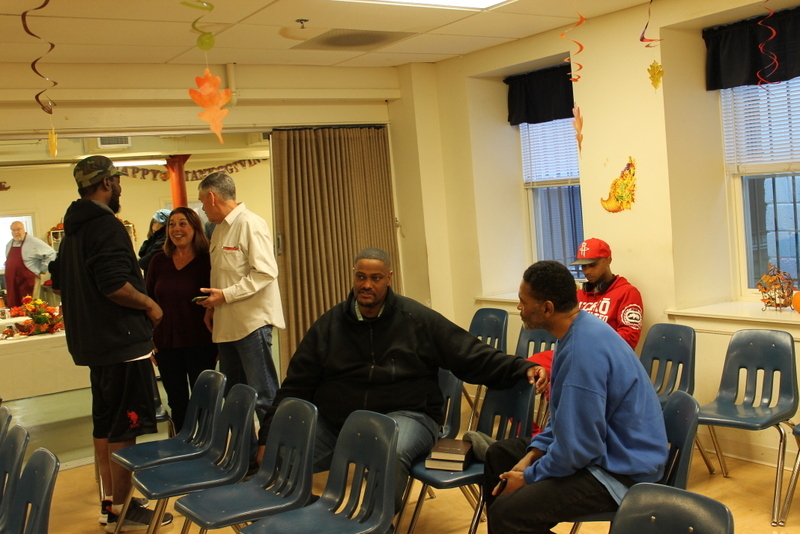 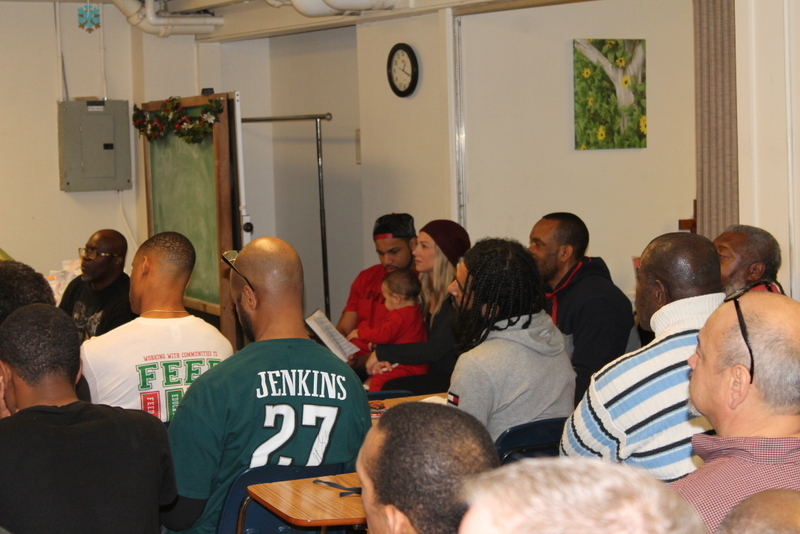 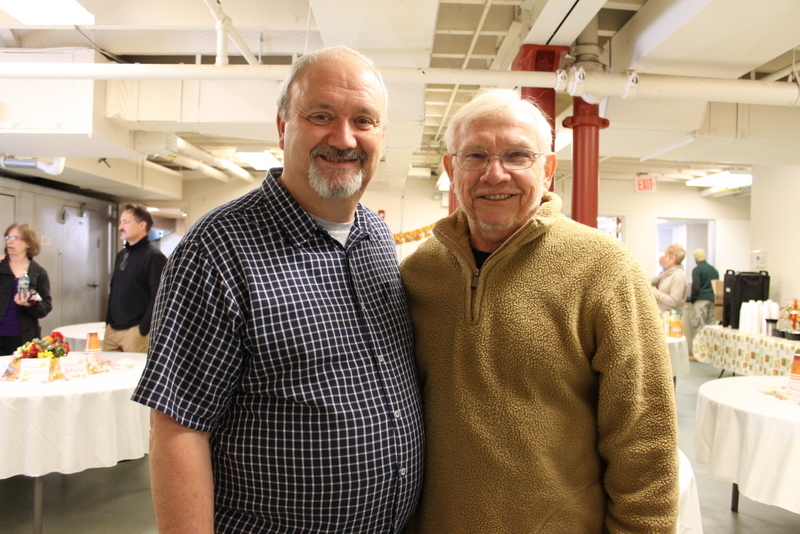 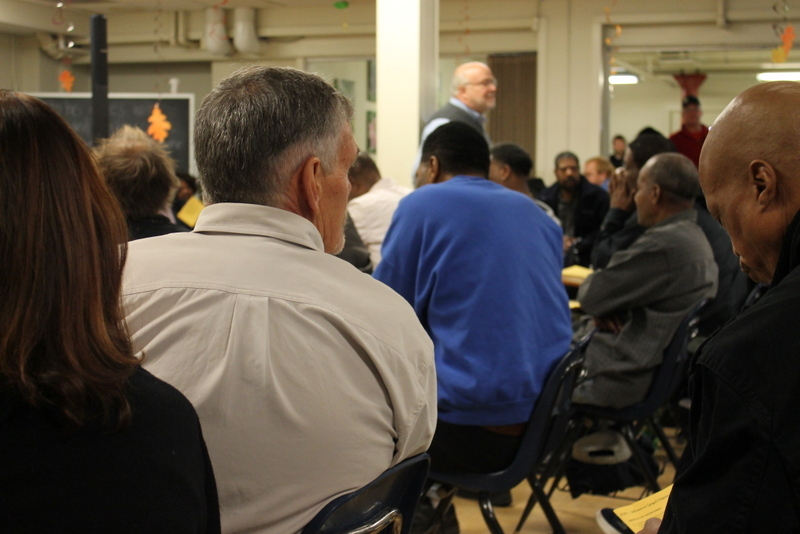 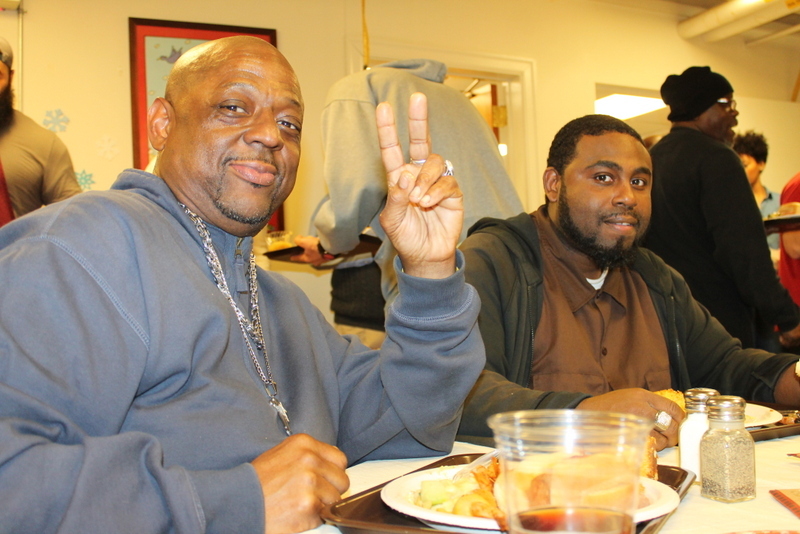 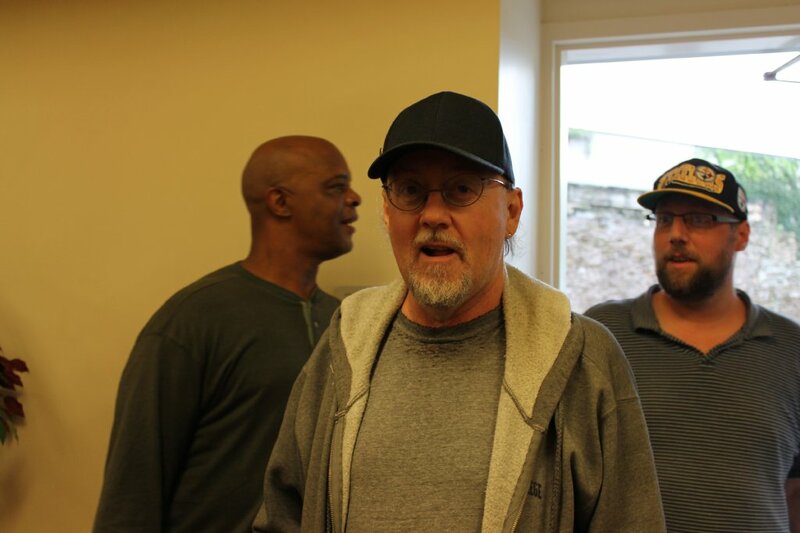 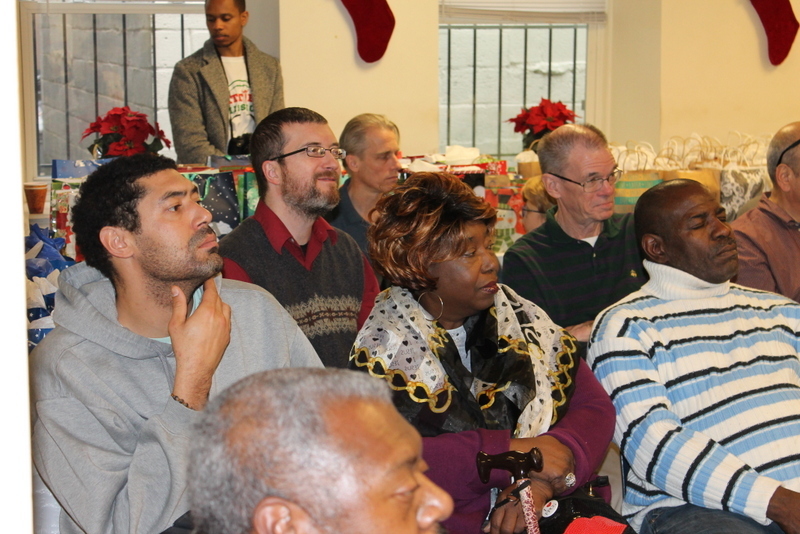 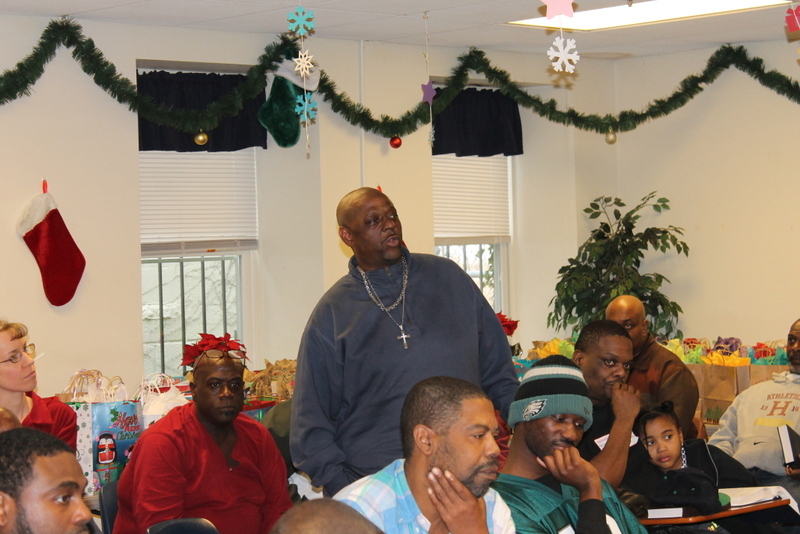 Cordie & Robert both encouraged the men currently enrolled in the New Life Program to press on and stay the course. 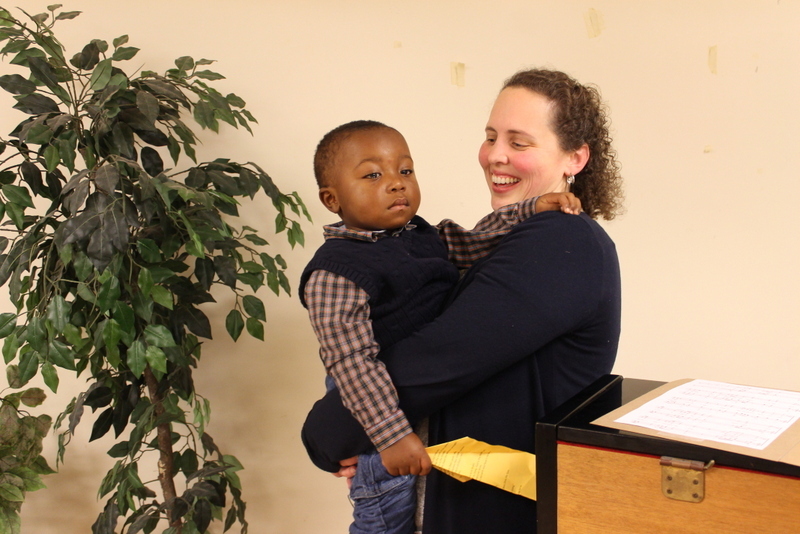 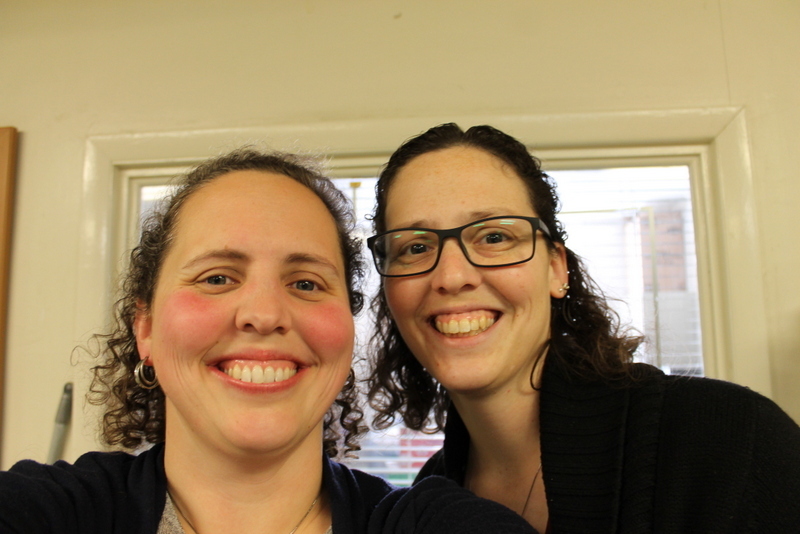 We praise God for Cordie and Robert! 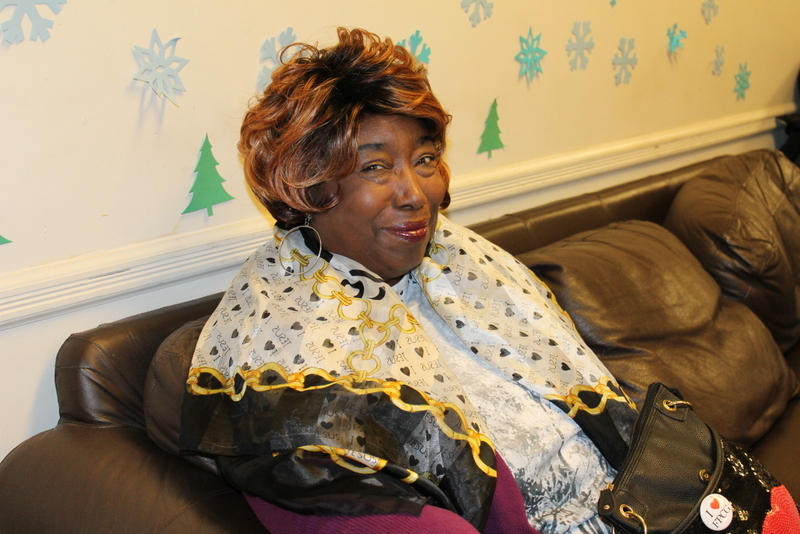 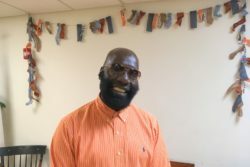 In June, Dr. Donna Elcock and her wonderful team from Great Faith Vision came and provided complete eye care for free to 29 of our men, including prescription glasses. 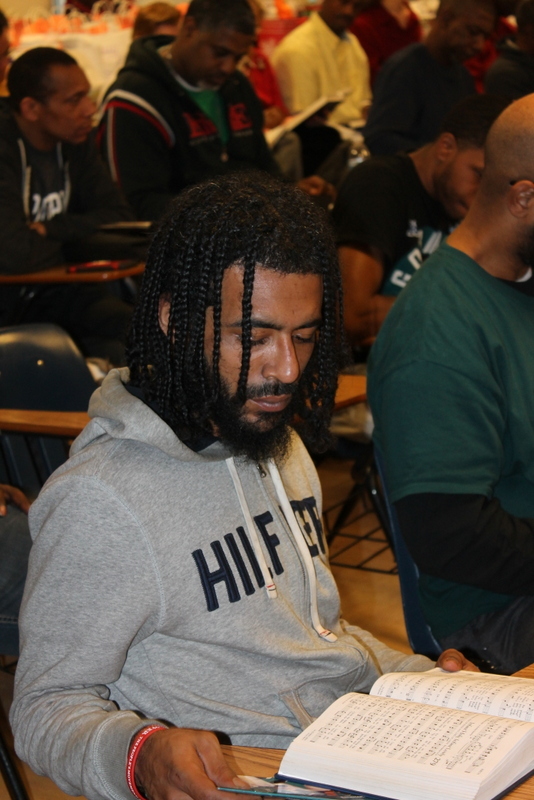 It’s easier to work on rebuilding your life when you can see! 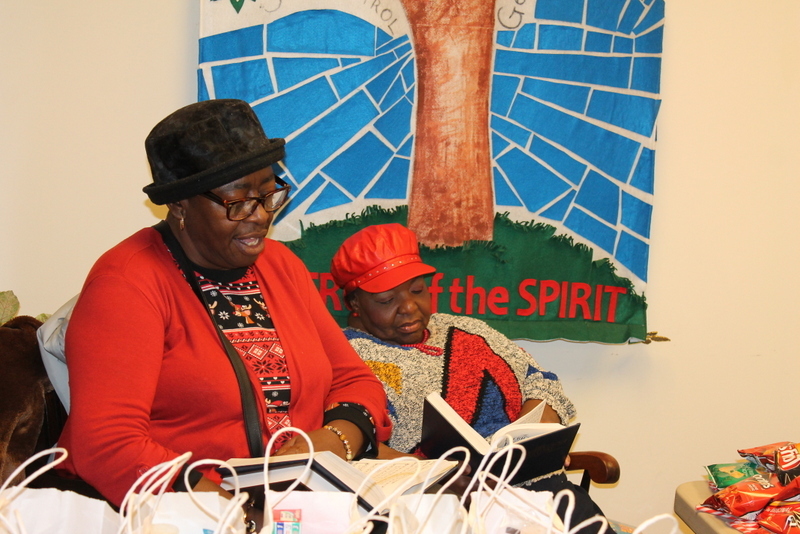 We thank God for Dr. Donna and her team! 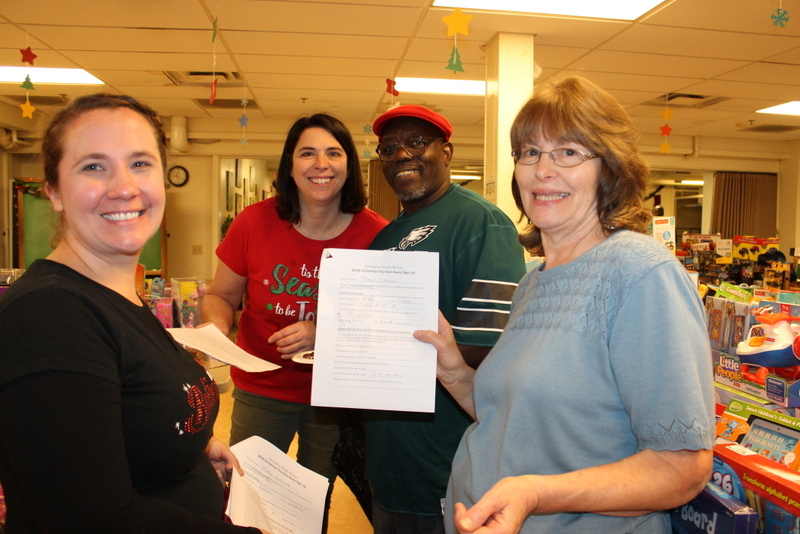 2nd graders from William Penn Charter School earned money to buy plants for our garden. 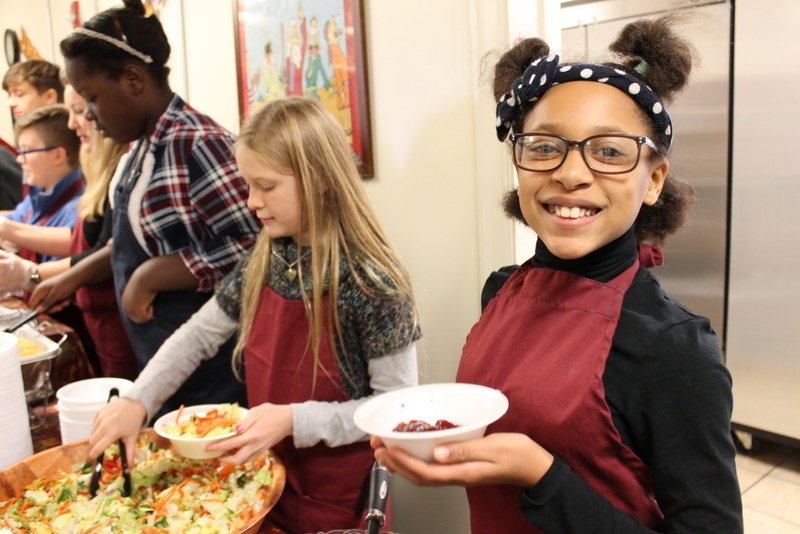 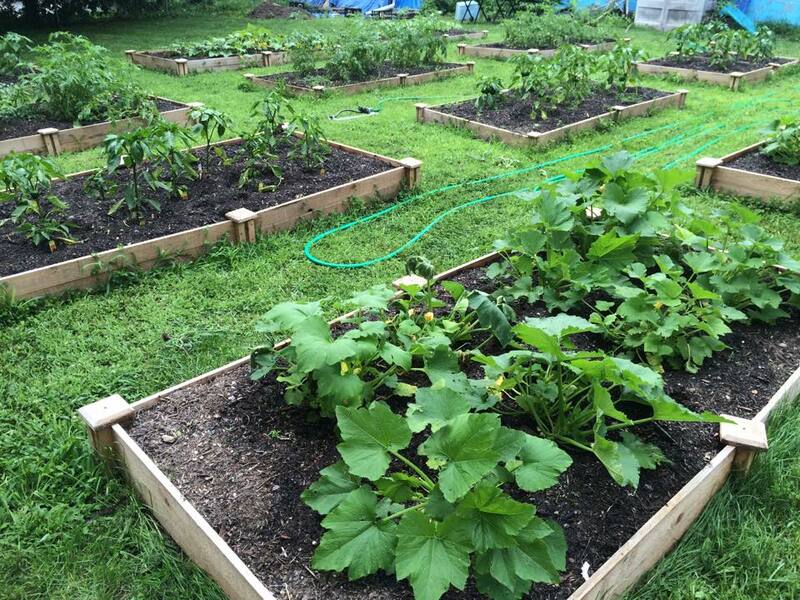 We are looking forward to enjoying fresh salads and other dishes from our homegrown bounty this summer. 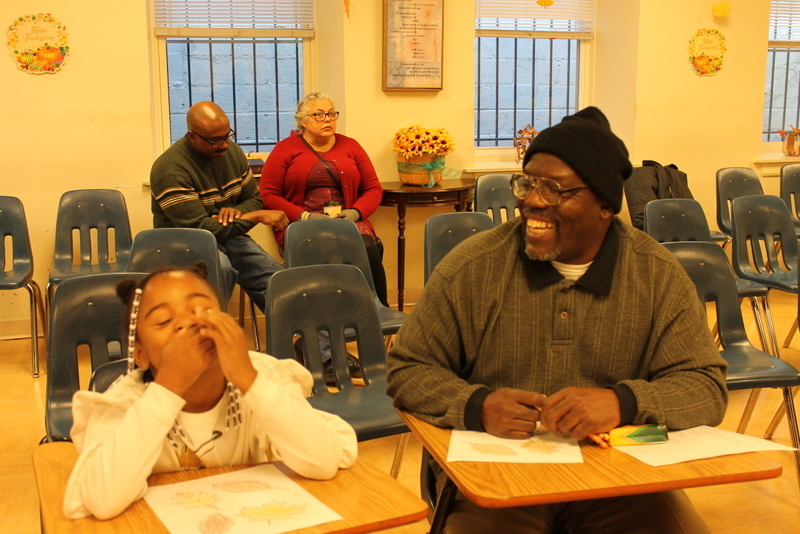 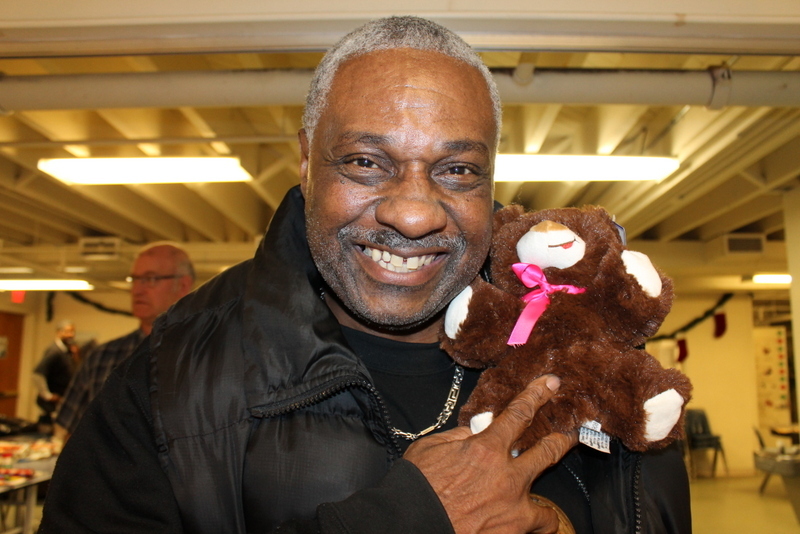 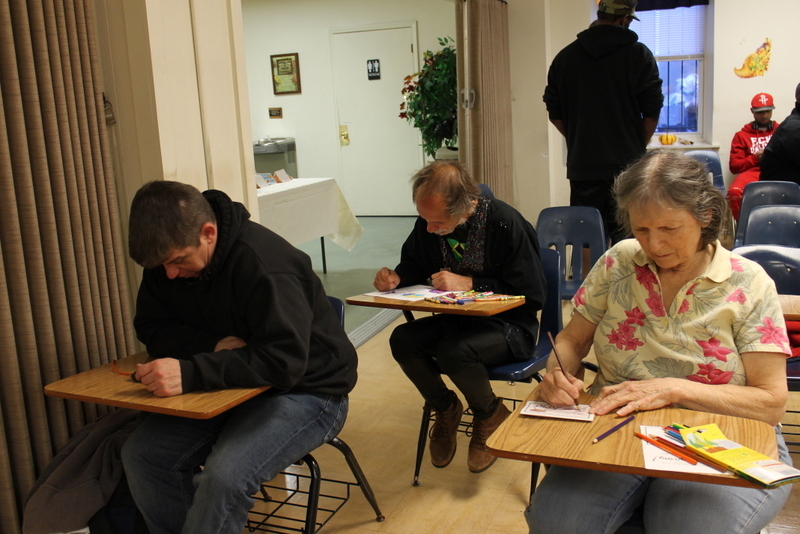 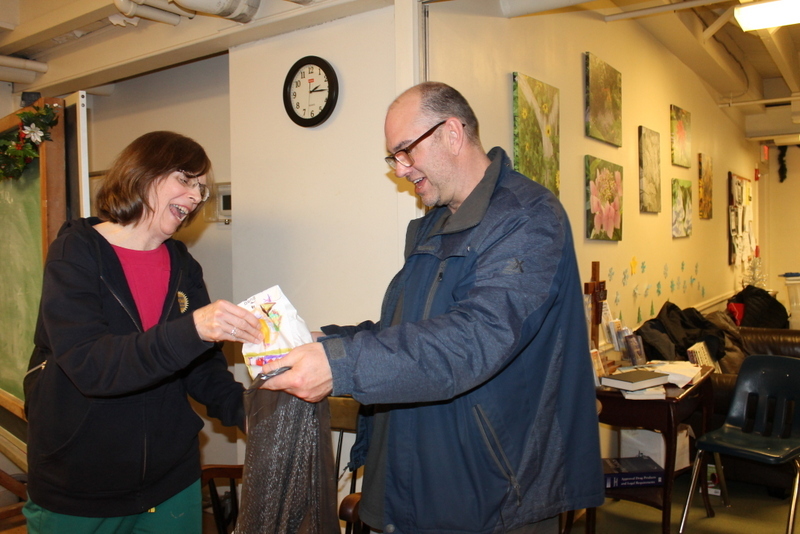 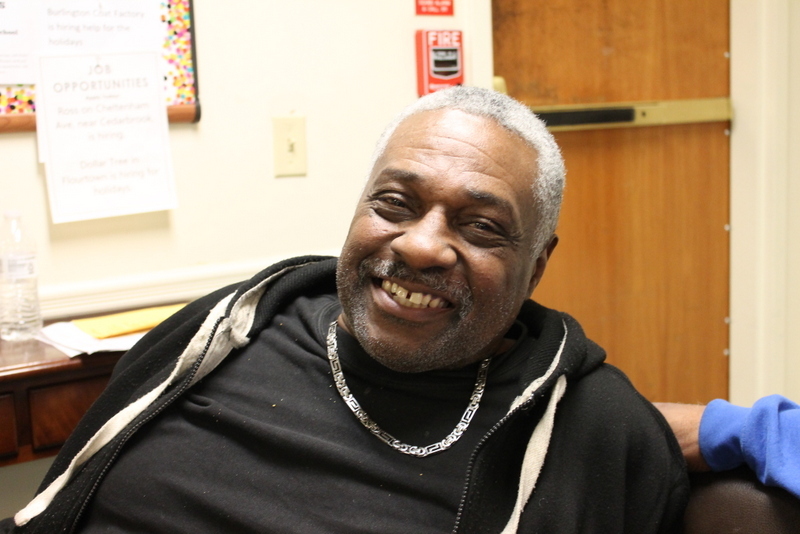 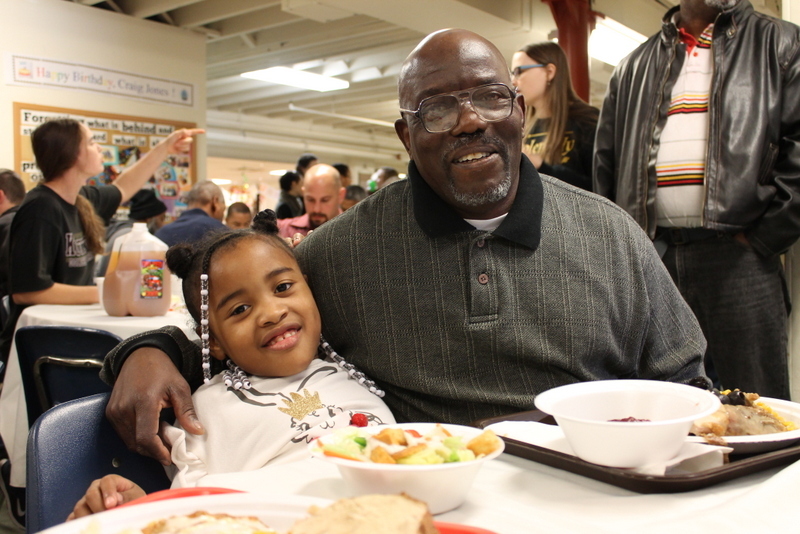 Ray Johnson learned how to read for the first time at the age of 50 here at the Mission. 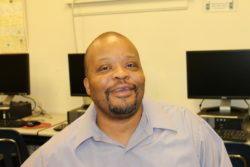 Now he’s learning to use a computer. 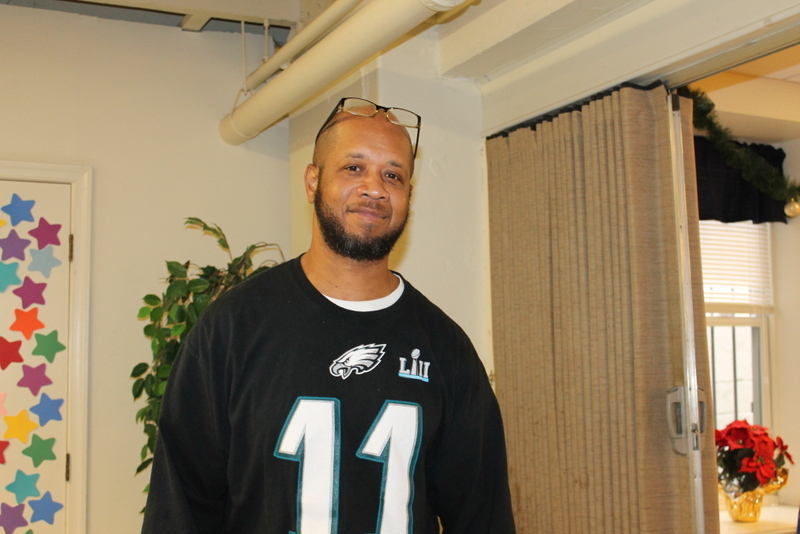 He’s proud & excited to be moving forward. 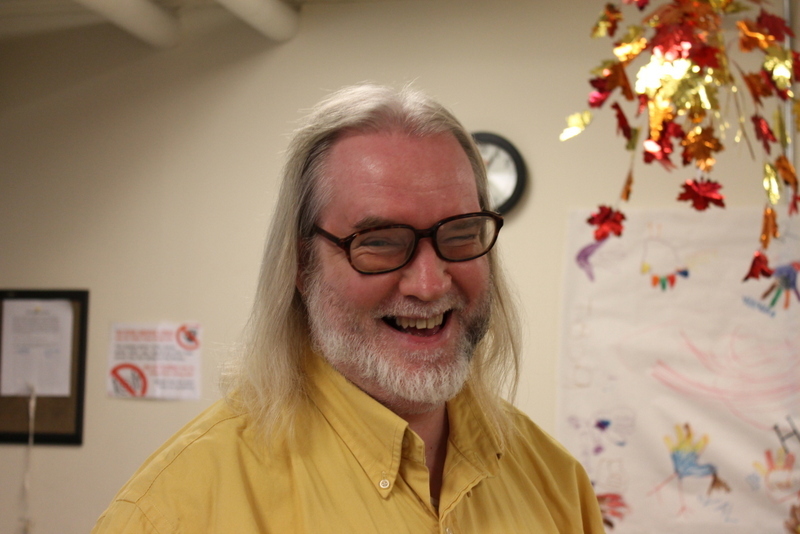 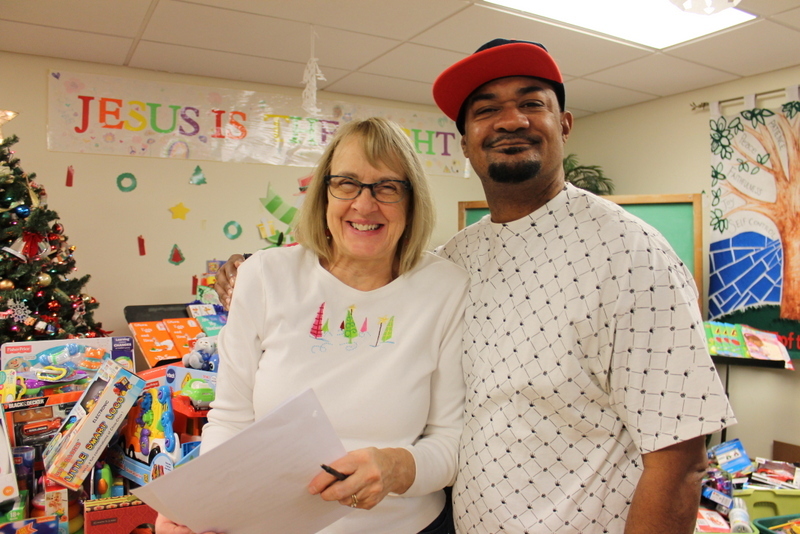 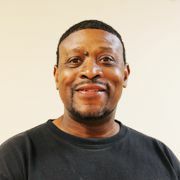 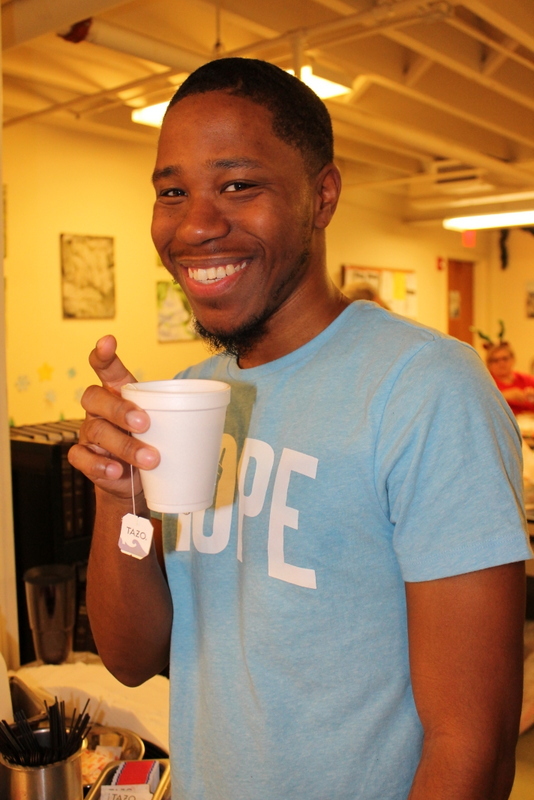 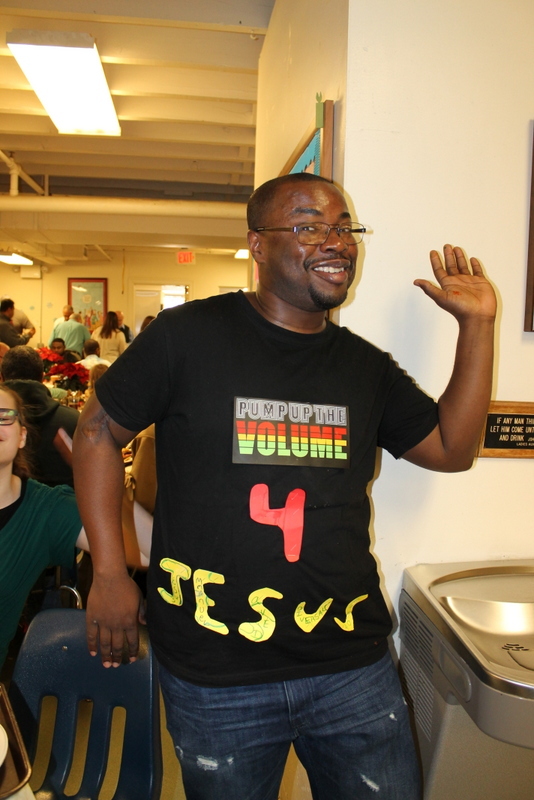 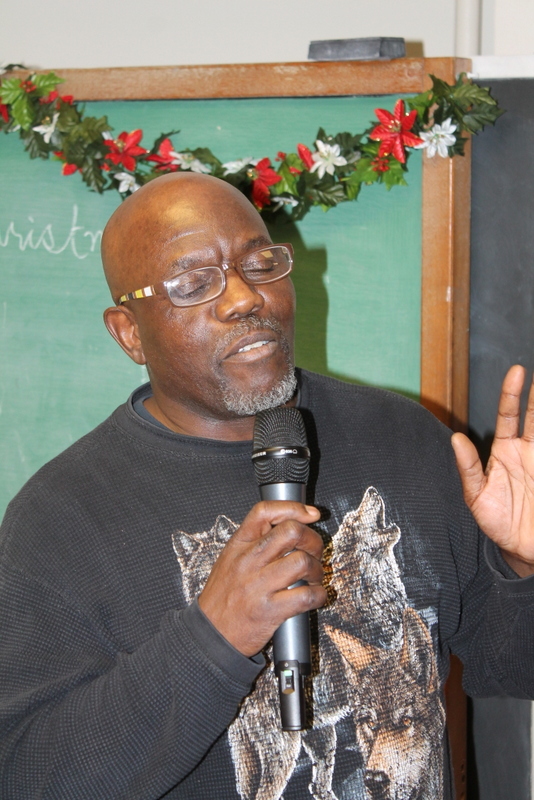 Ray continues to work with Mission teachers & tutors to strengthen his skills. 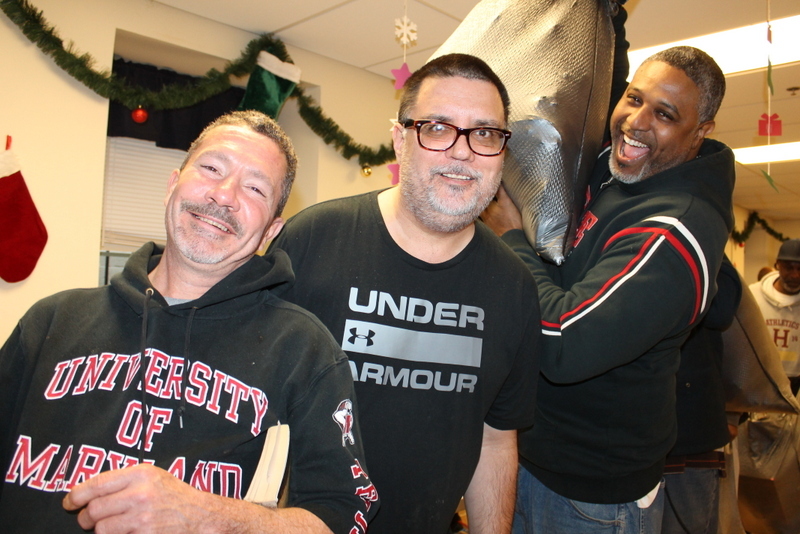 Each year, we put out over $16.5K in essential carfare expenses for men in our New Life Program to access medical care and education, to find employment, and to take care of legal issues. 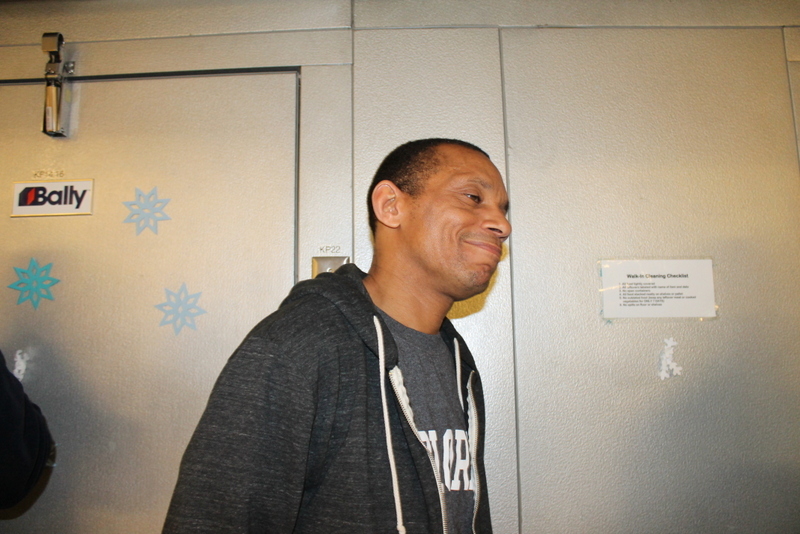 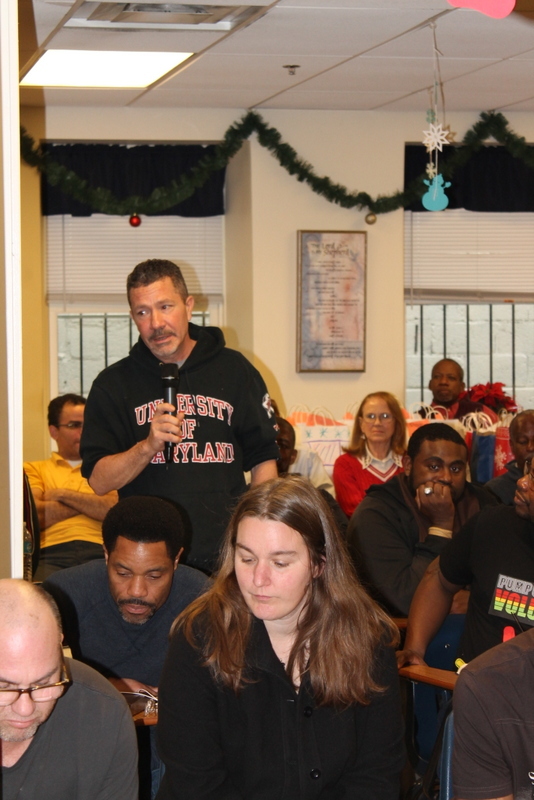 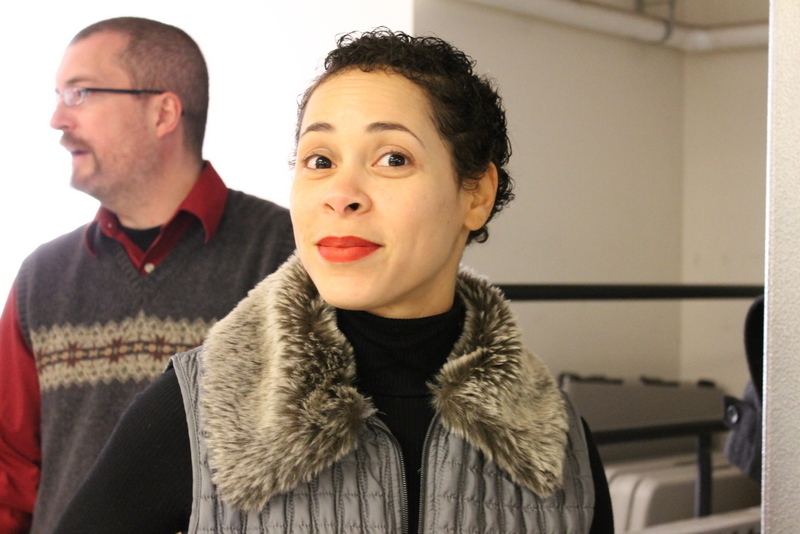 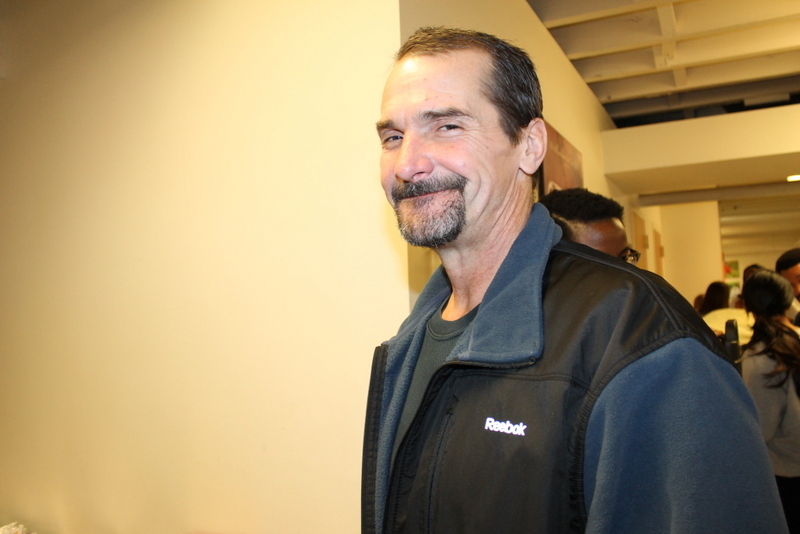 Brelan – “I’ve had to go to court at 13th & Filbert twice so far, and I go next week, too. 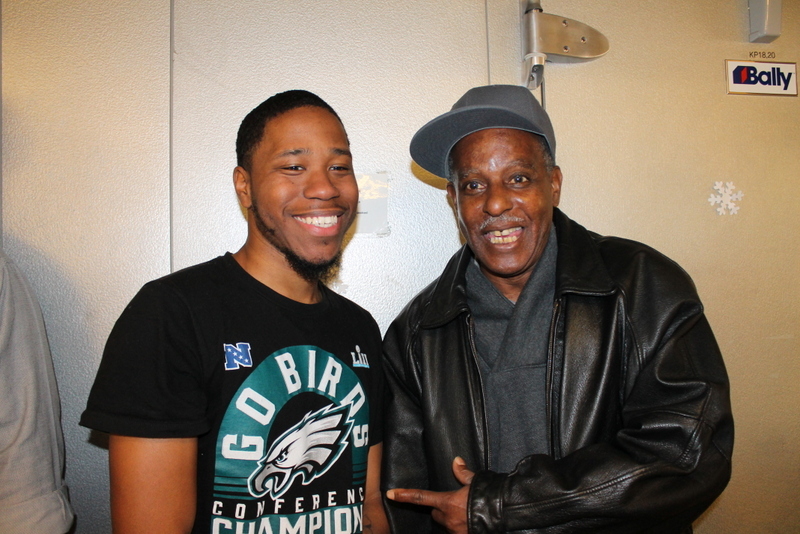 If I didn’t have SEPTA tokens to get there, there would e a warrant for my arrest.” Now, as Brelan works hard to do the right and get his life on track, he can focus on putting one step in front of the other and moving forward. Isaiah & Mike – Isaiah and Mike are both facing surgery on their hands. 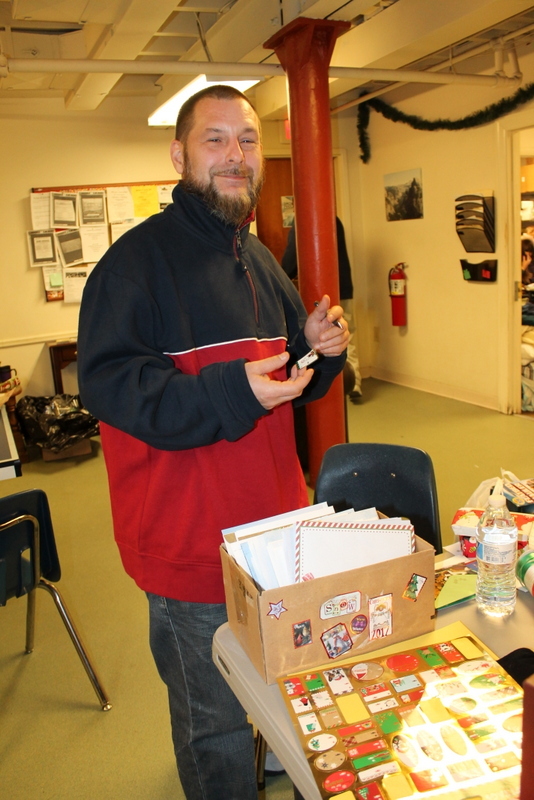 Mike lost the tip of his finger from an injury he sustained. 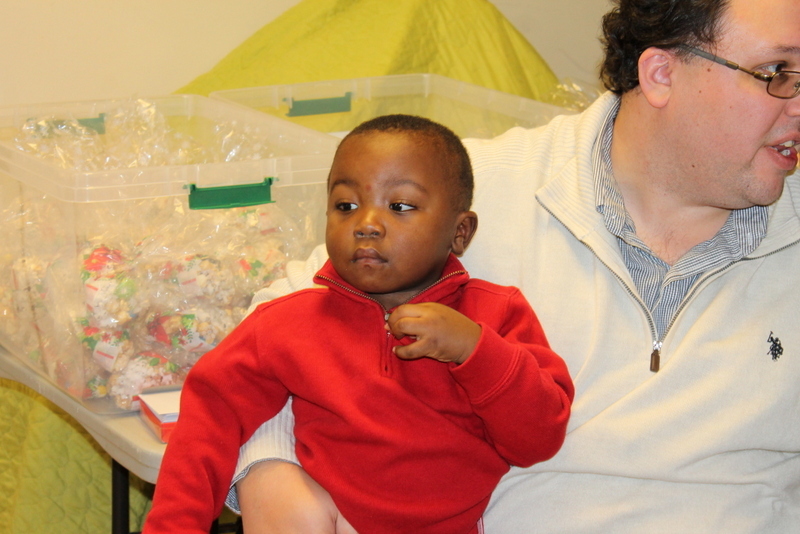 Isaiah broke his hand and found out it needs to be set with a pin. 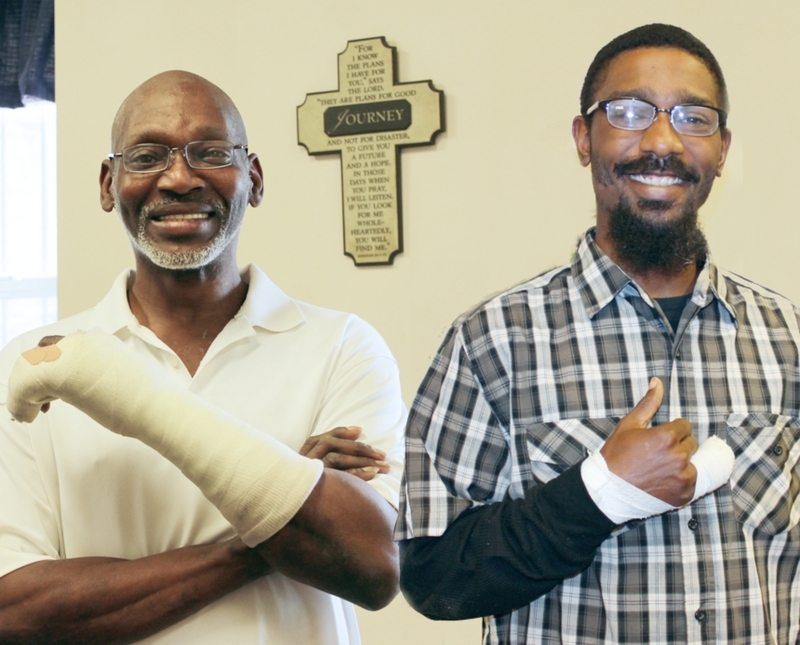 Neither one would have taken care of their injuries without carfare to get to the hospital. 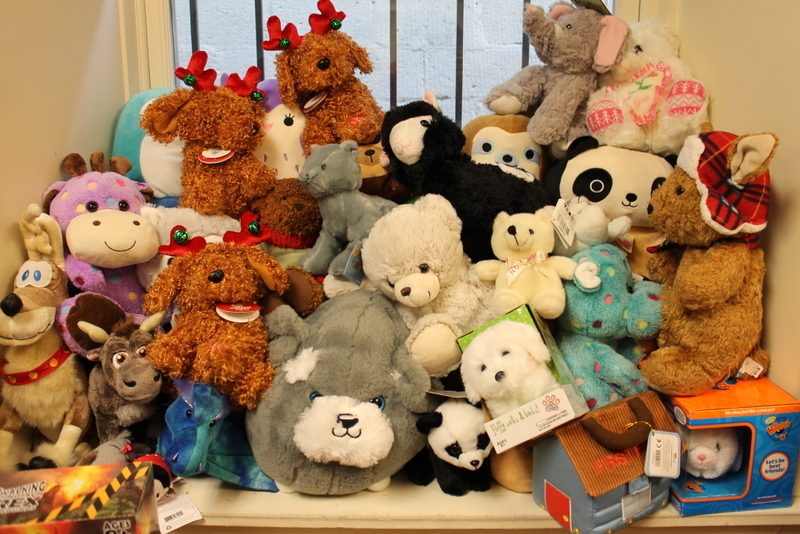 Now, they can get proper treatment to heal. 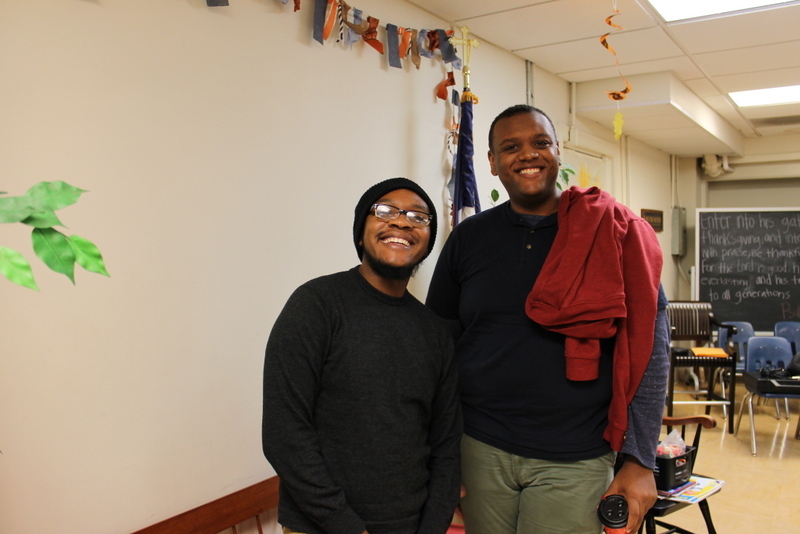 UPDATE: Both Isaiah and Mike have had their surgeries and are healing well. 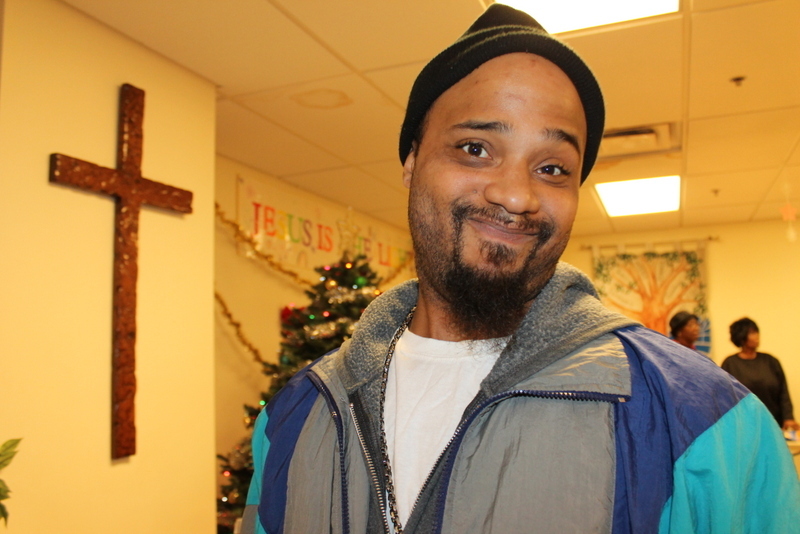 Leonard – The Mission provided carfare for Leonard to get to and from school for orientation and classes, and to go job hunting. 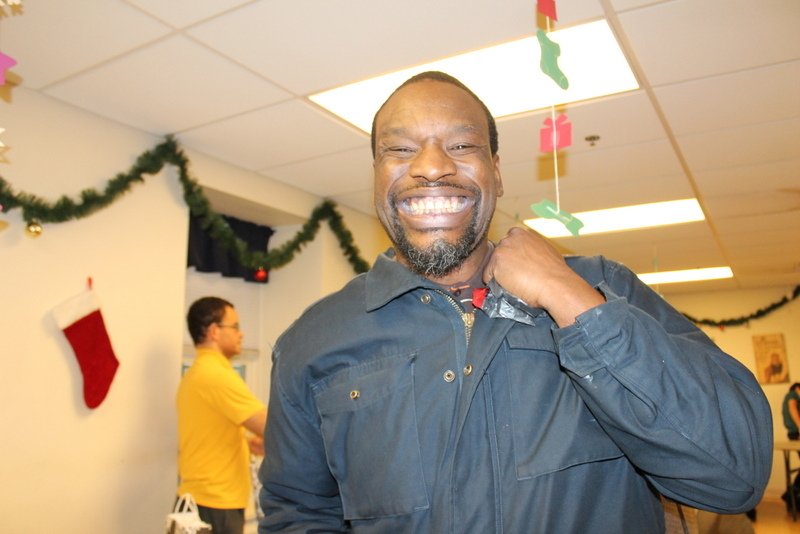 Now, Leonard is glad he has the means to purchase his own SEPTA key card for his part time job and school. 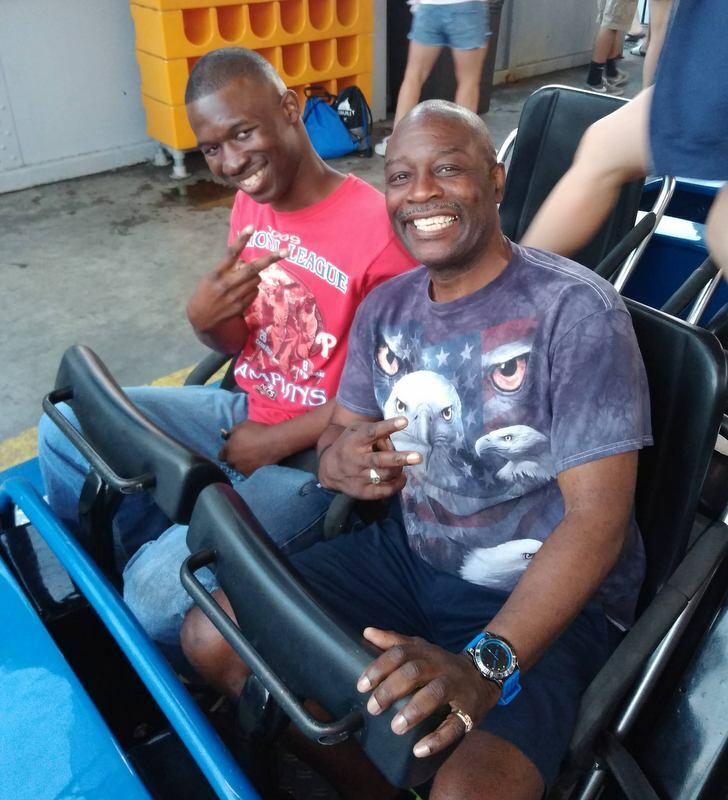 He couldn’t have gotten started on this path without the transportation help up front. 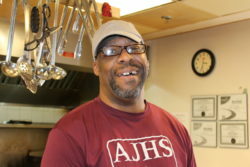 Michael – Michael is an accomplished chef. He did much of his job searching strategically online. 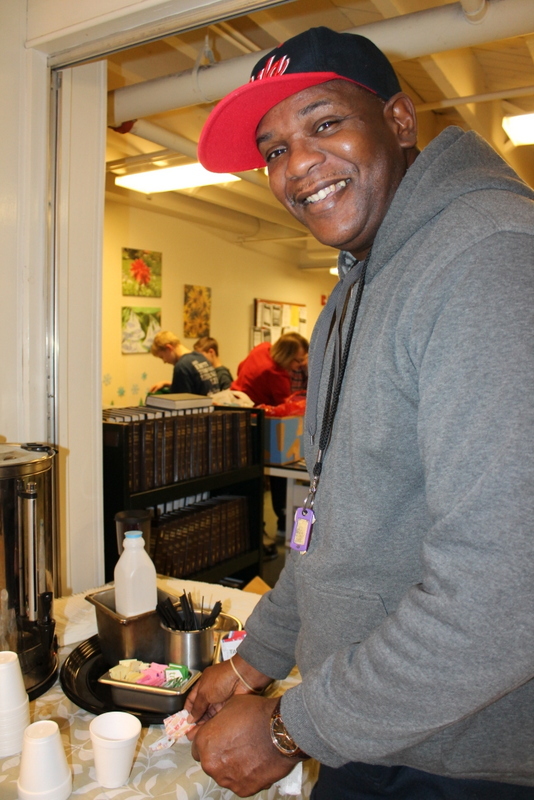 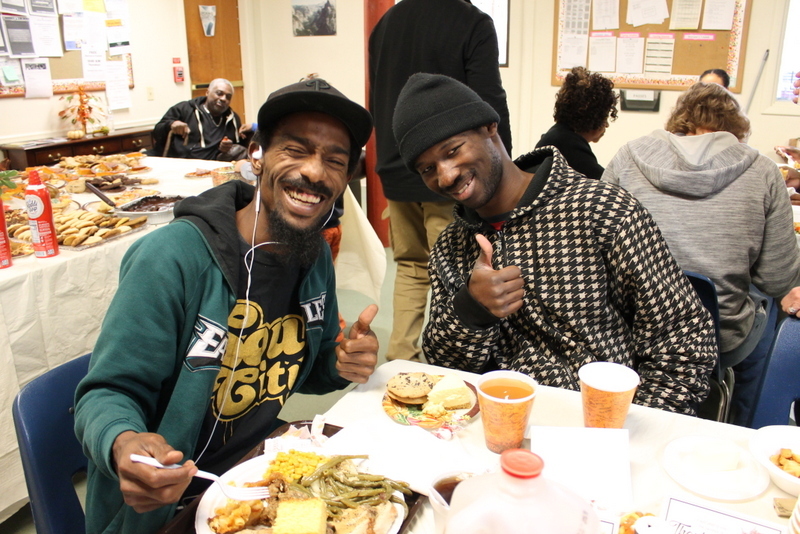 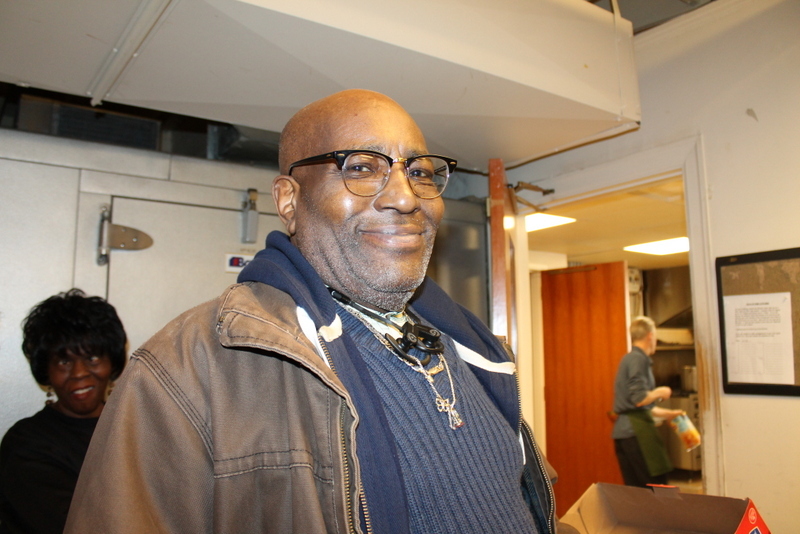 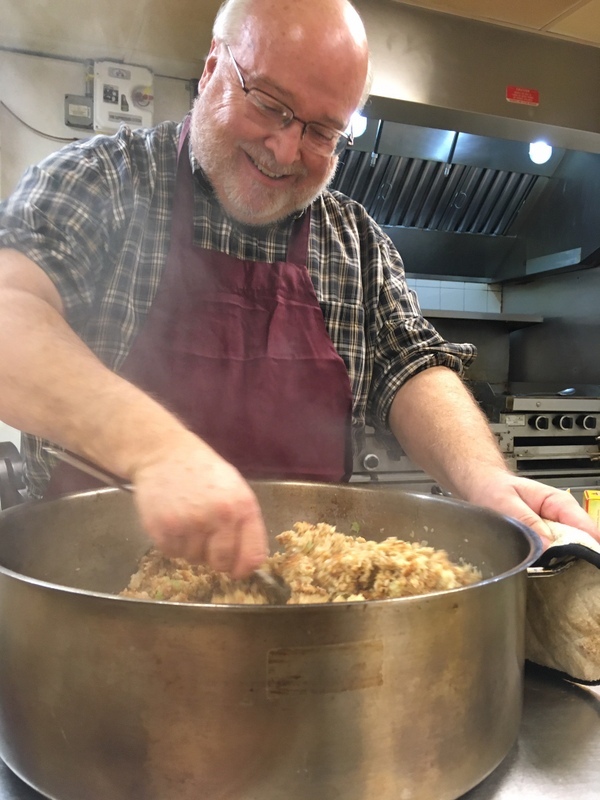 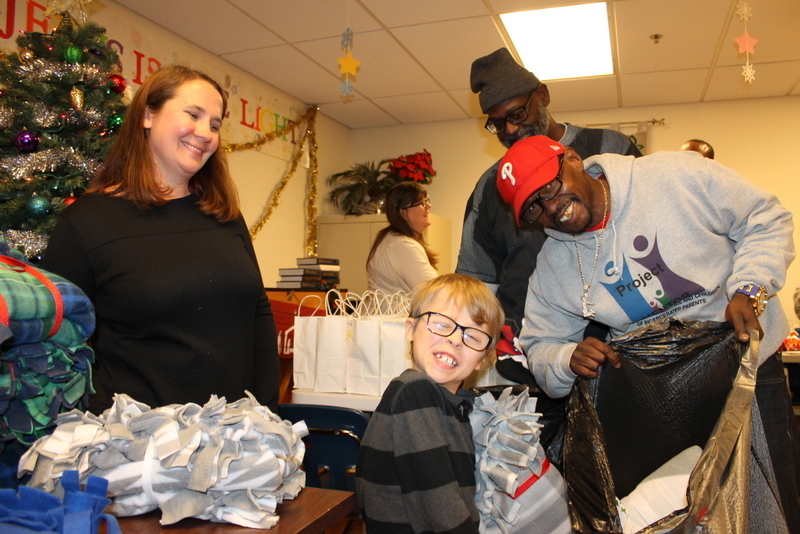 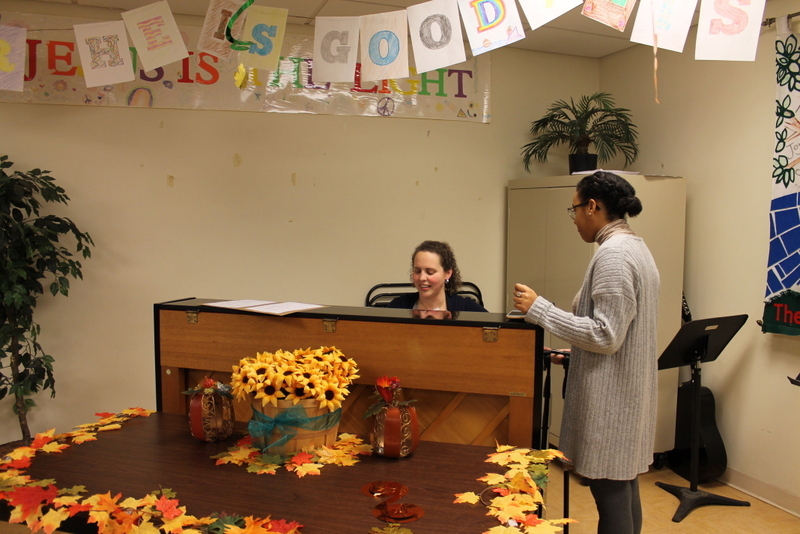 But eventually he needed to go to an interview at Wesley Enhanced Living – Pennypack where he cooked his way into a job at his 2nd interview. 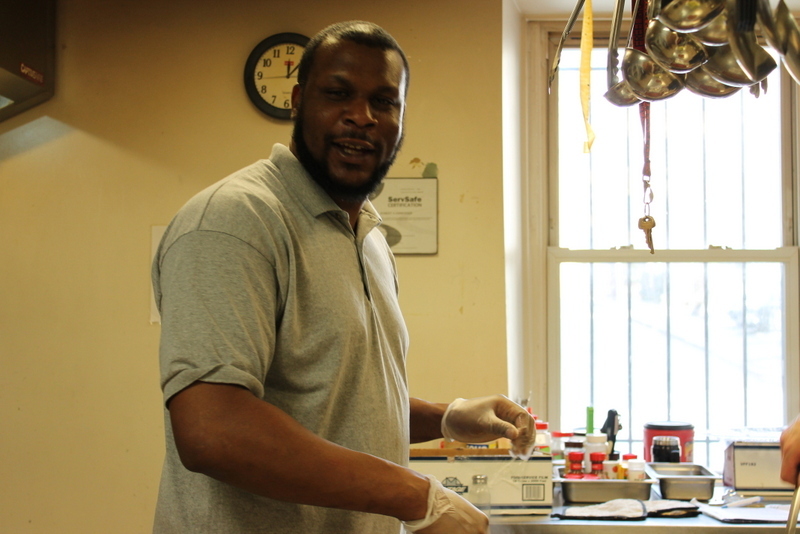 Without carfare, his new job would not have been possible. 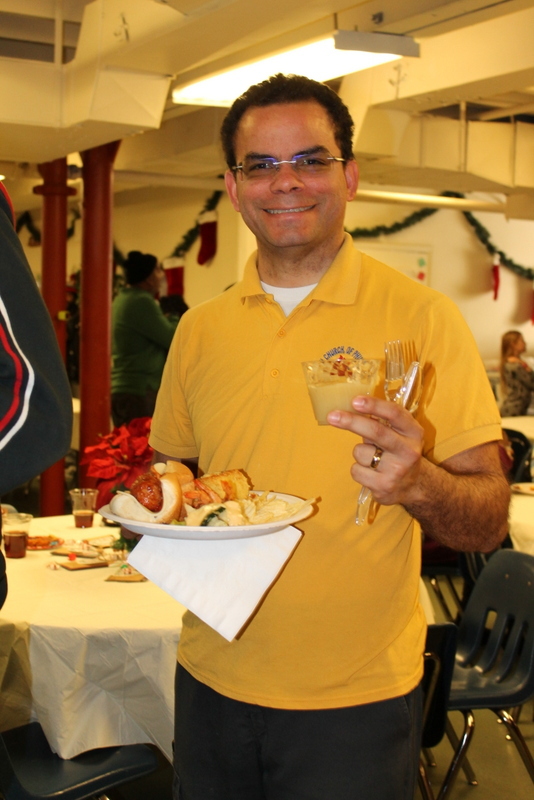 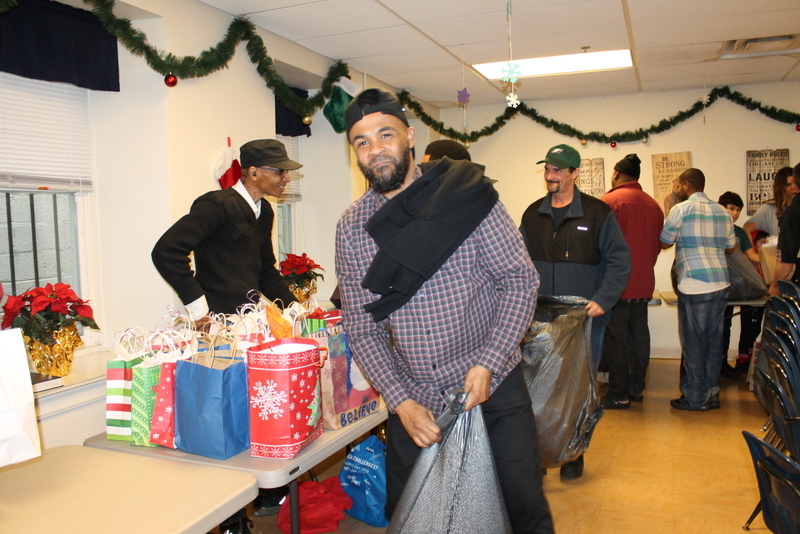 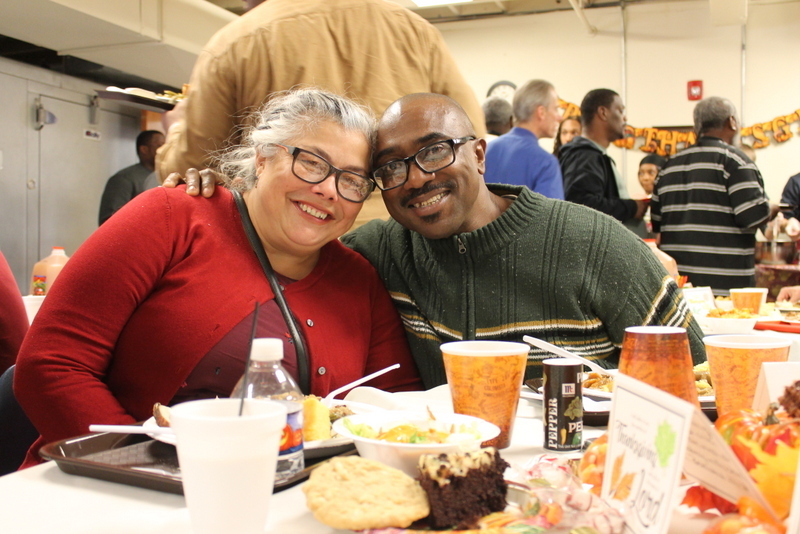 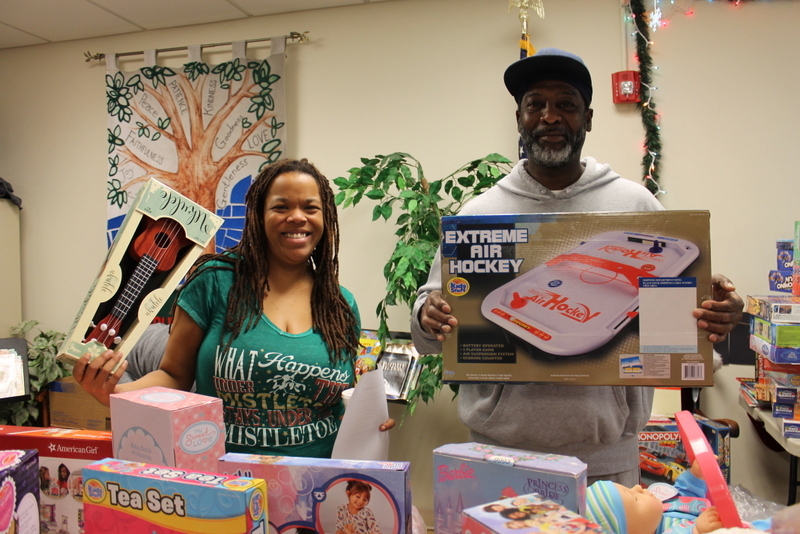 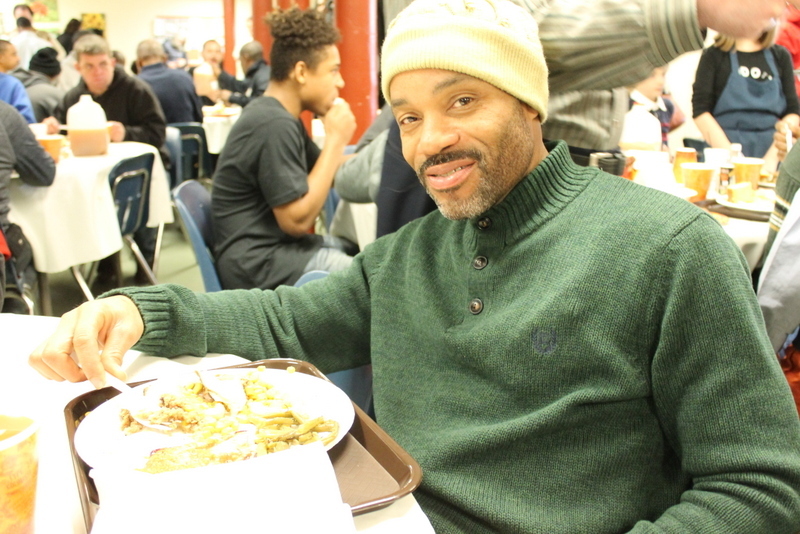 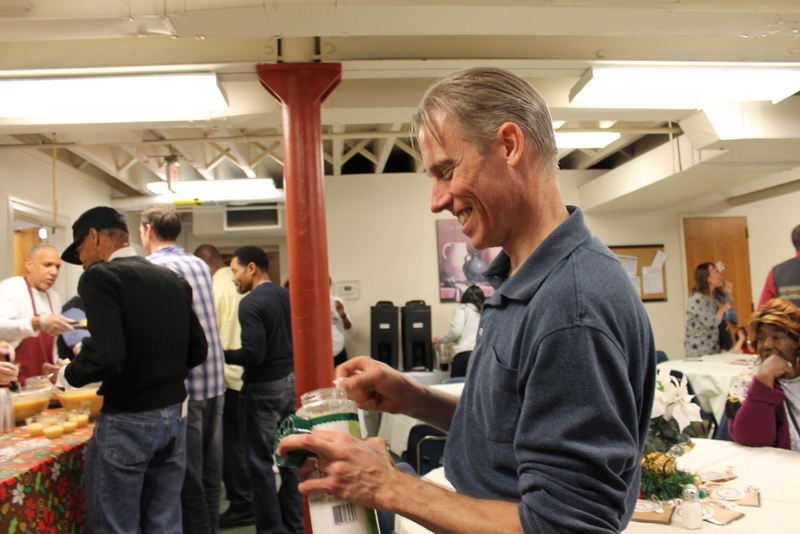 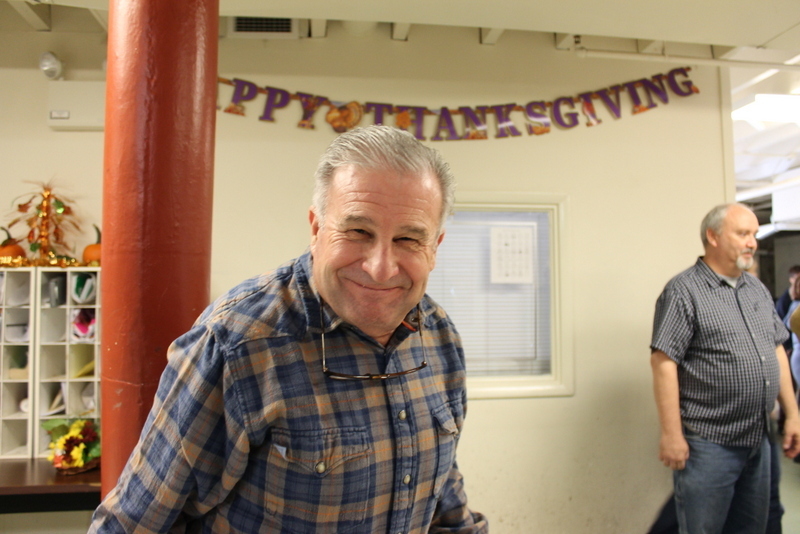 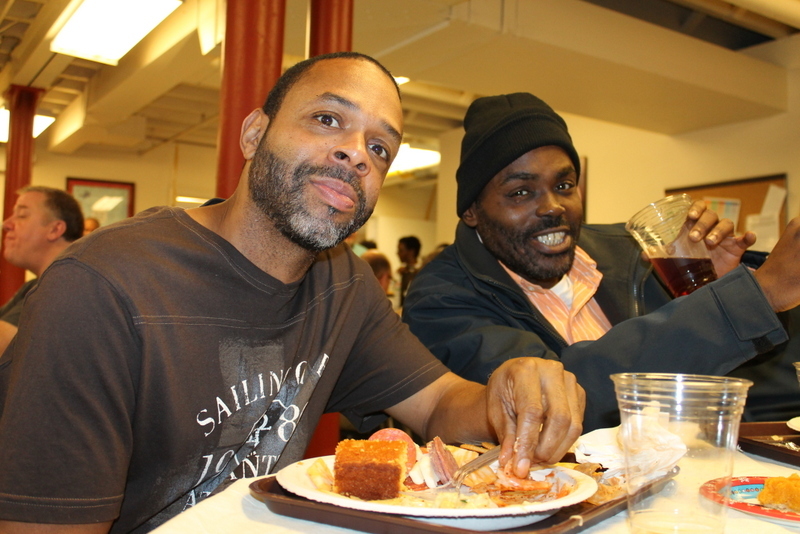 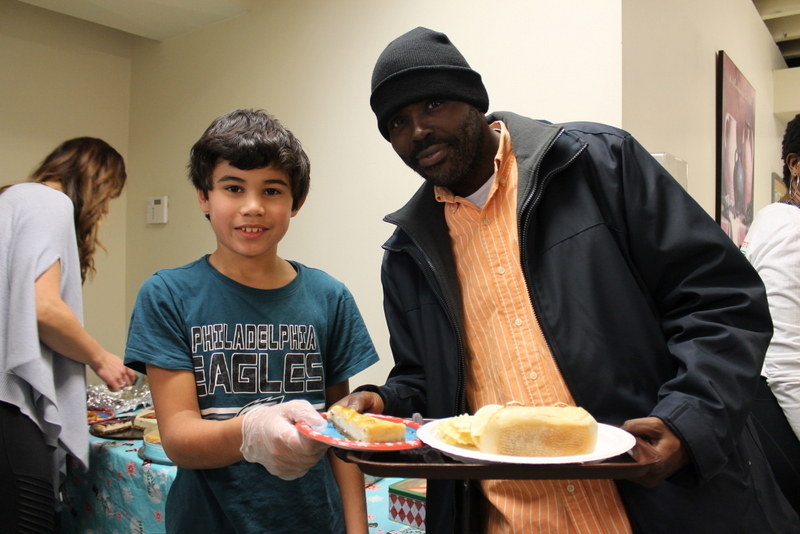 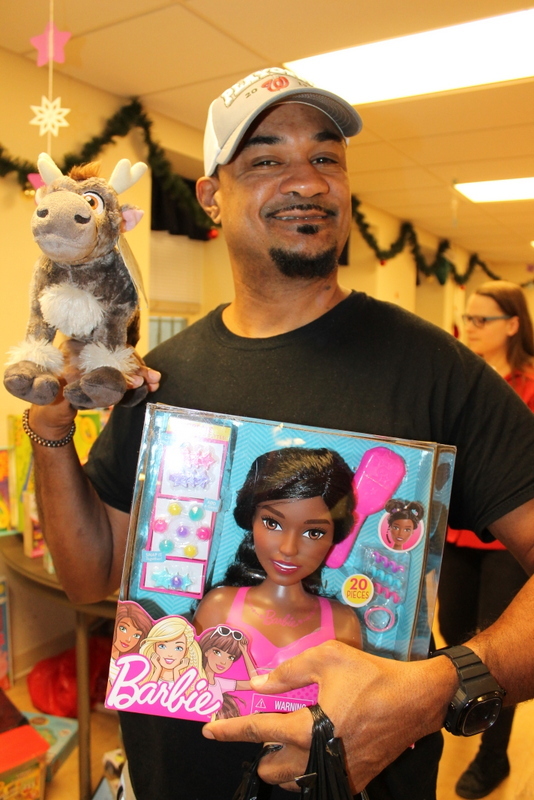 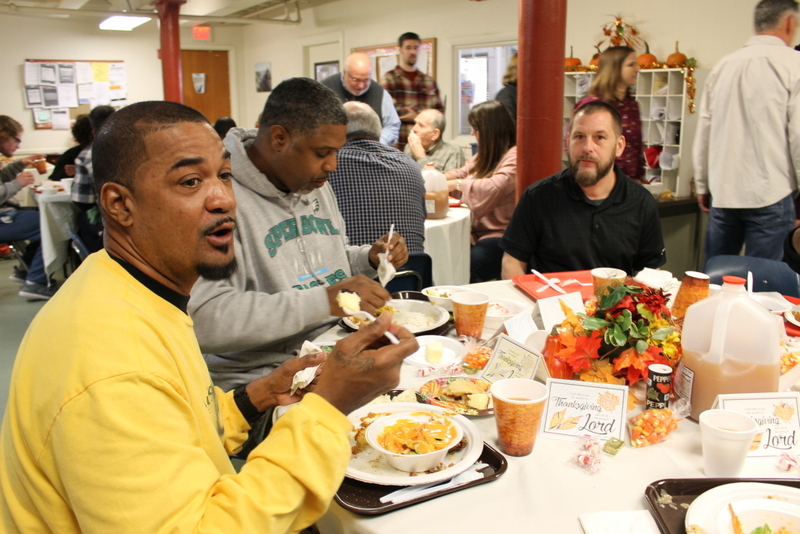 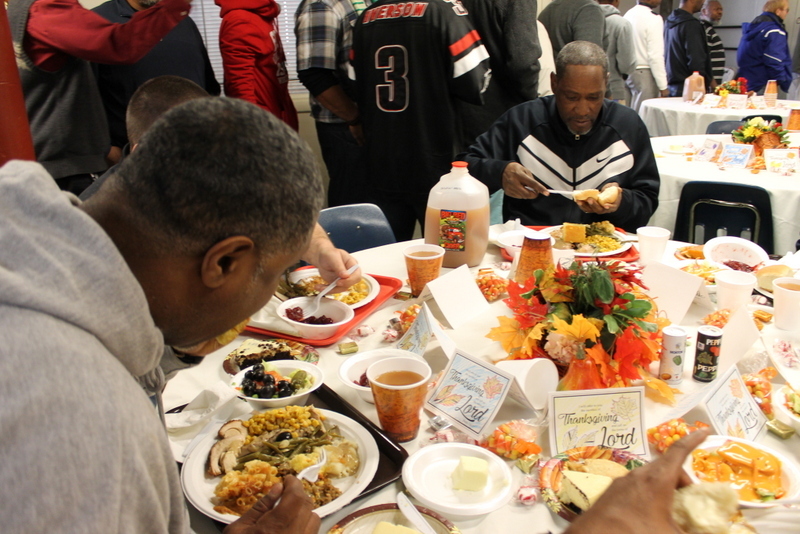 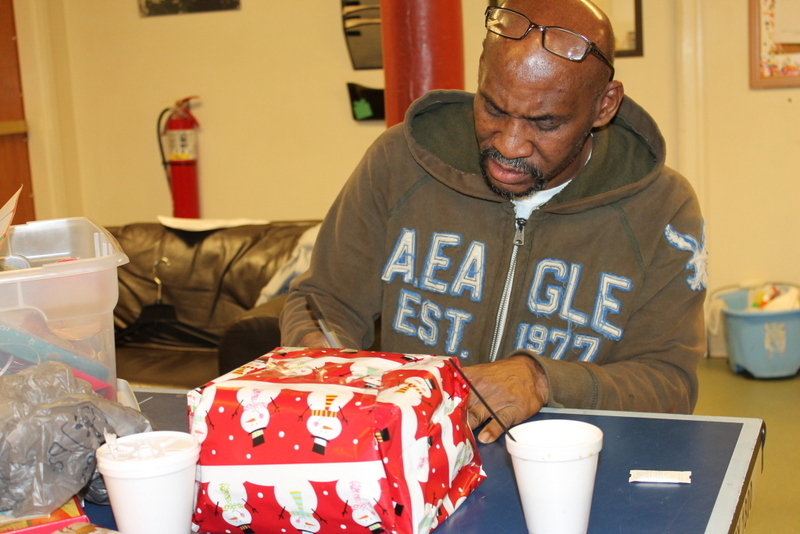 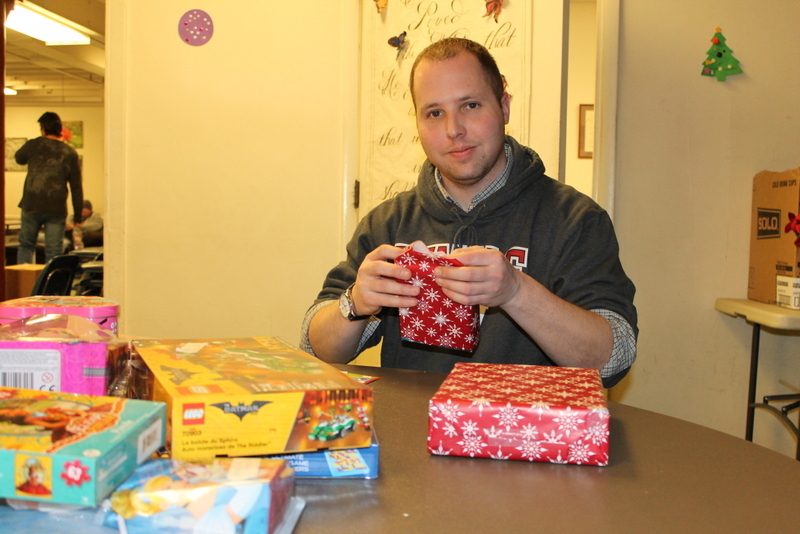 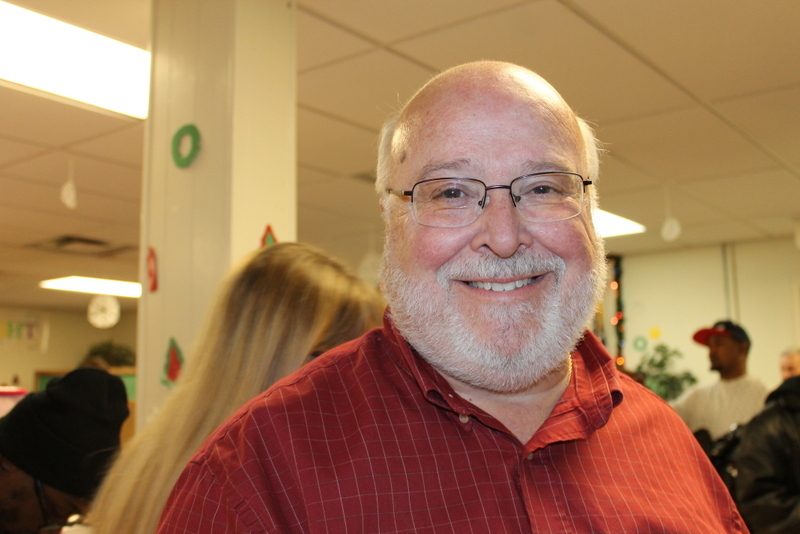 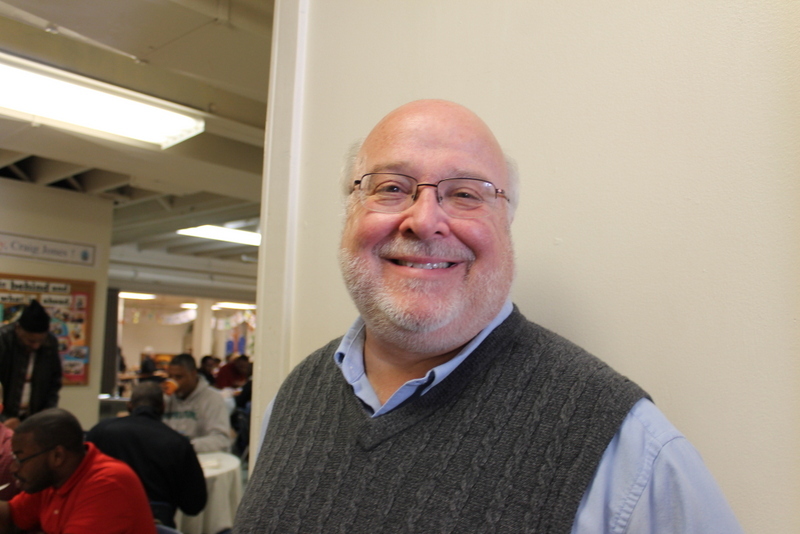 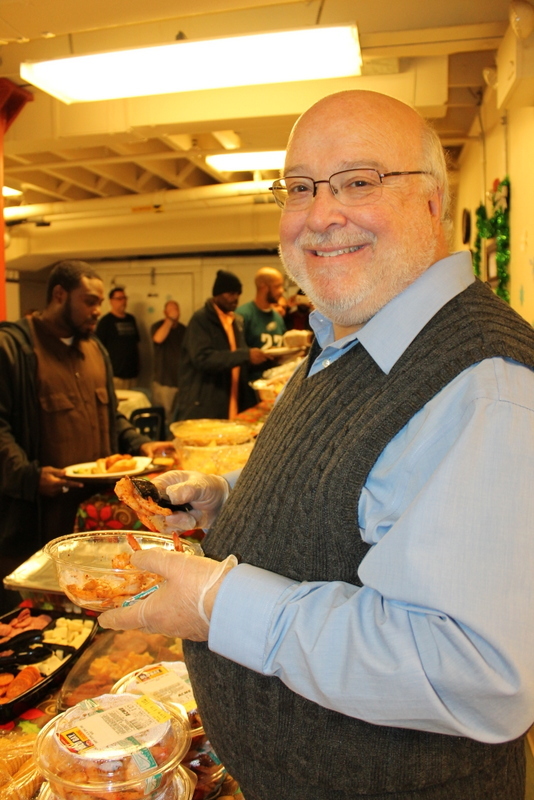 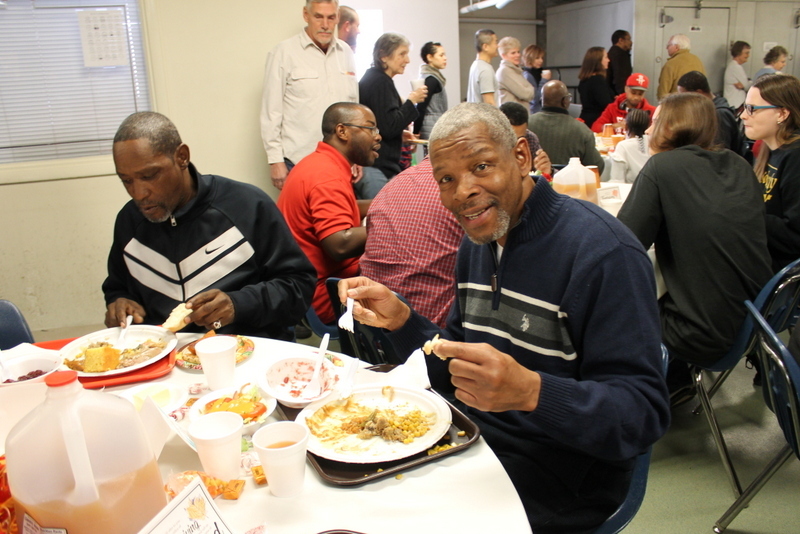 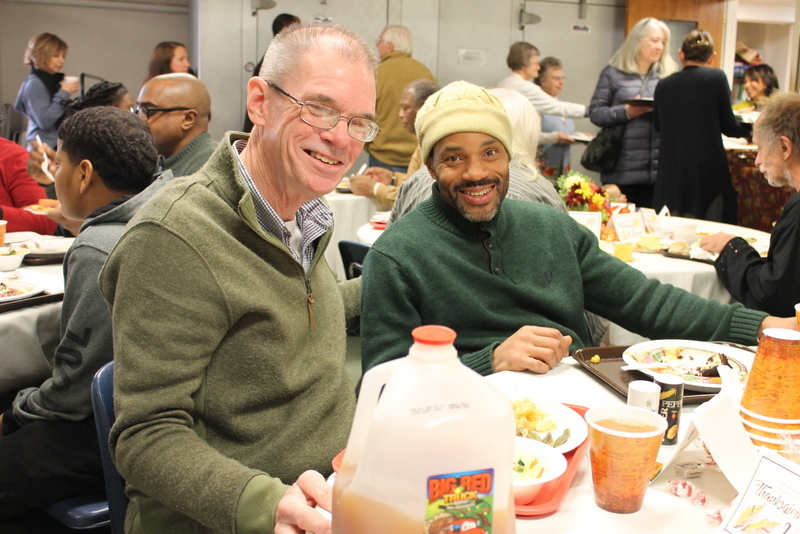 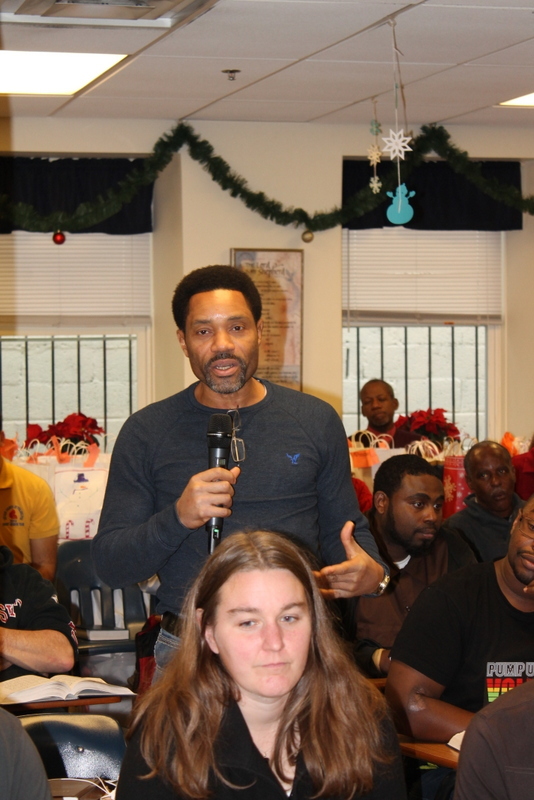 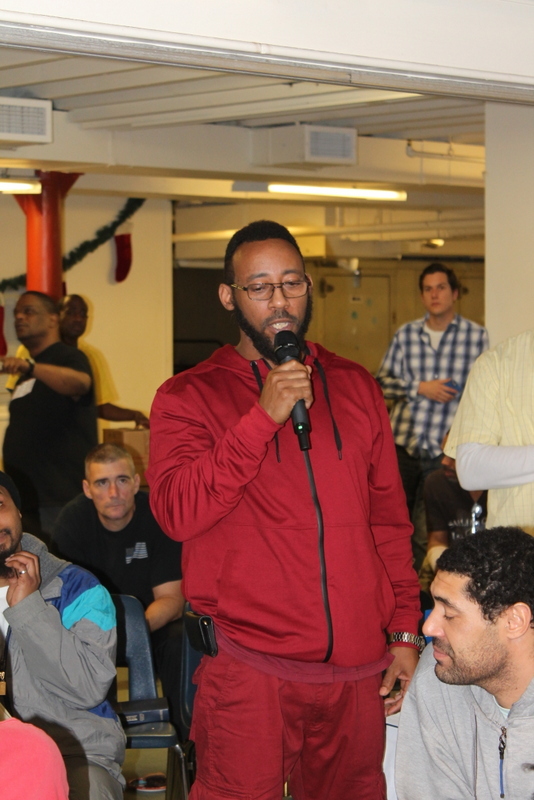 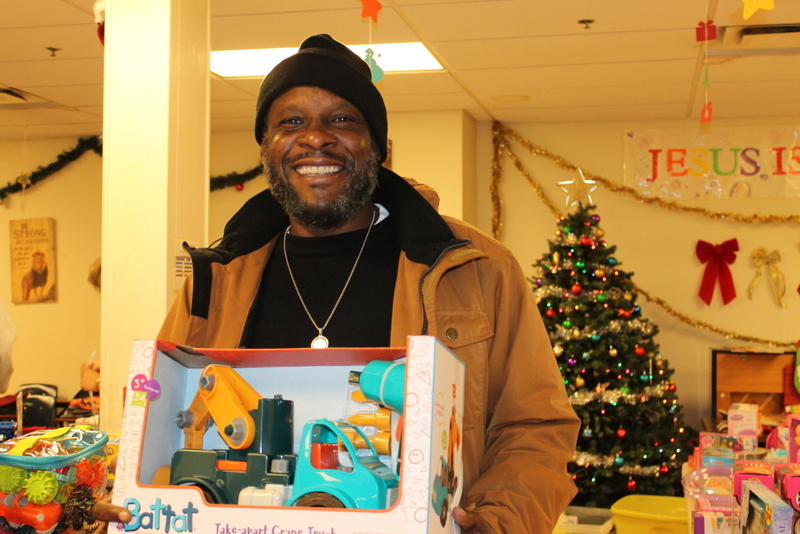 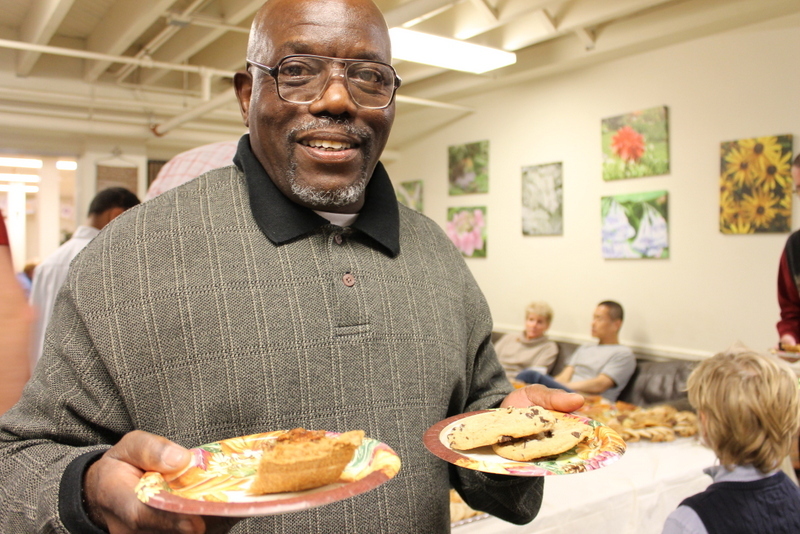 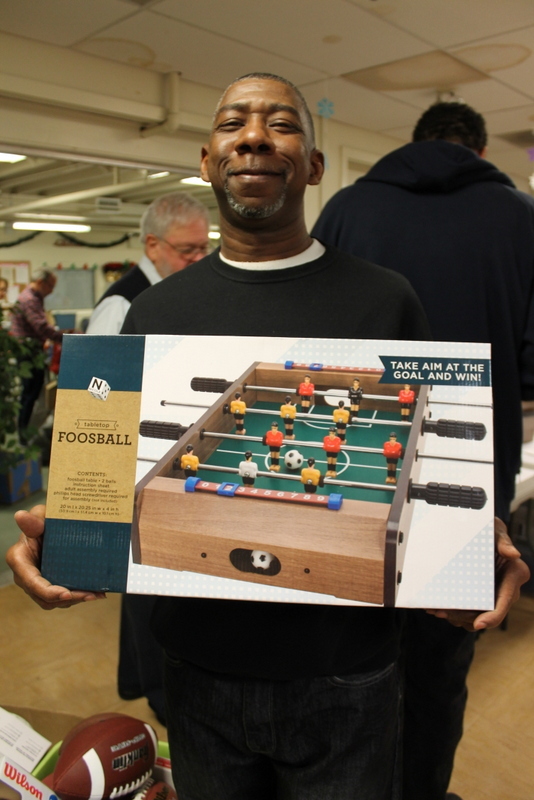 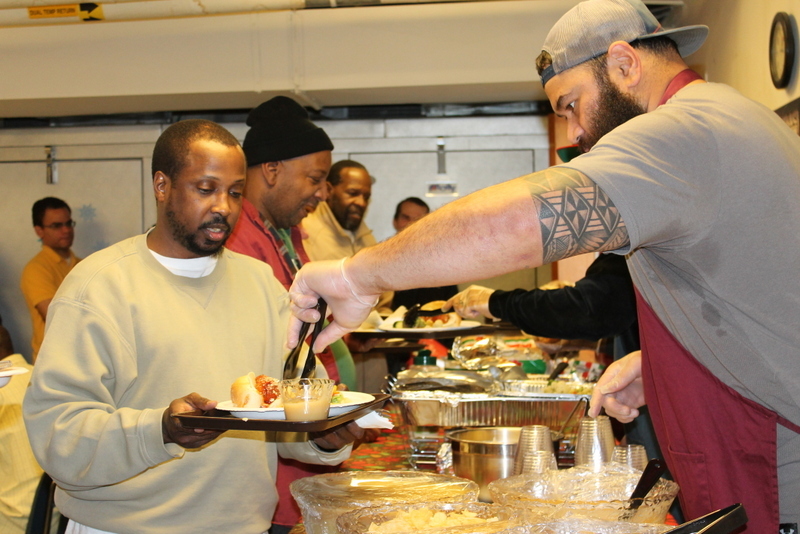 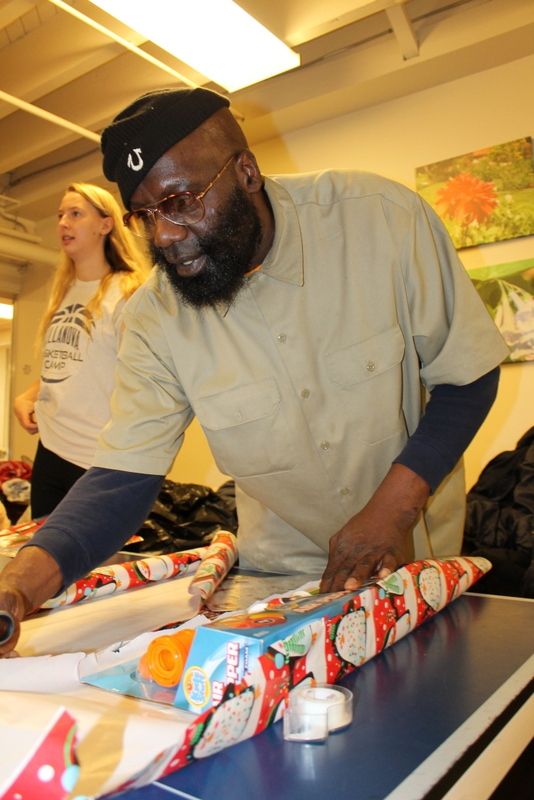 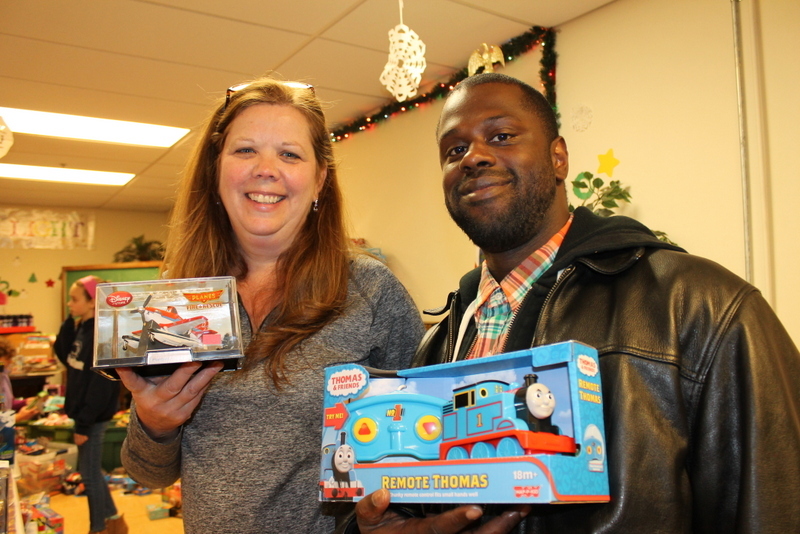 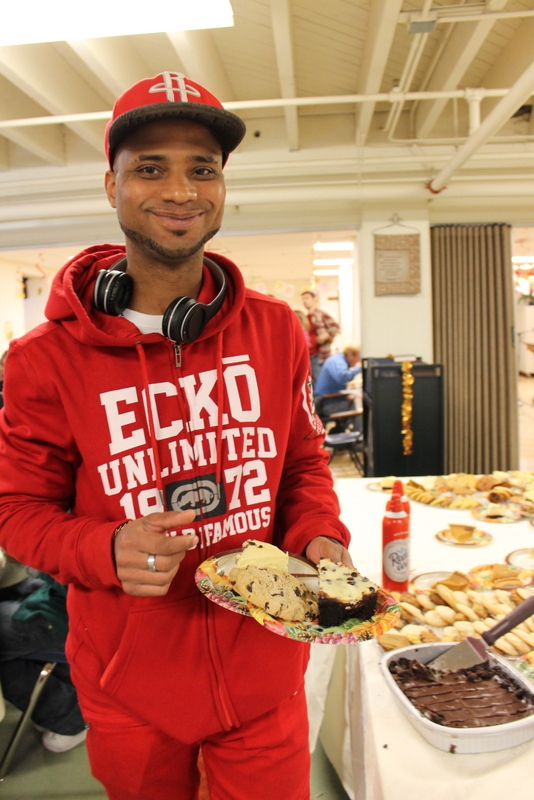 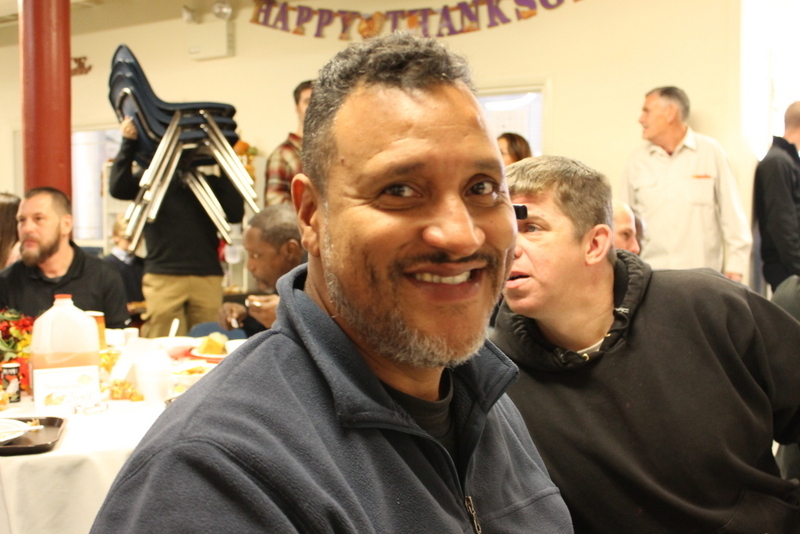 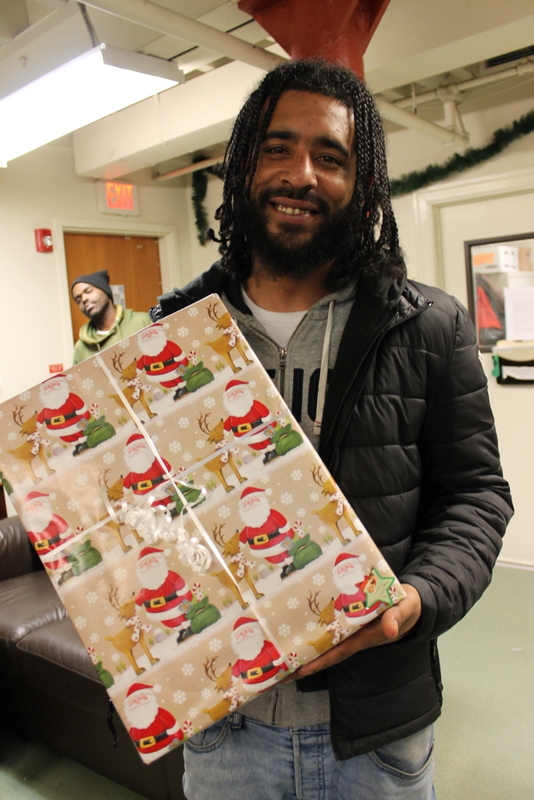 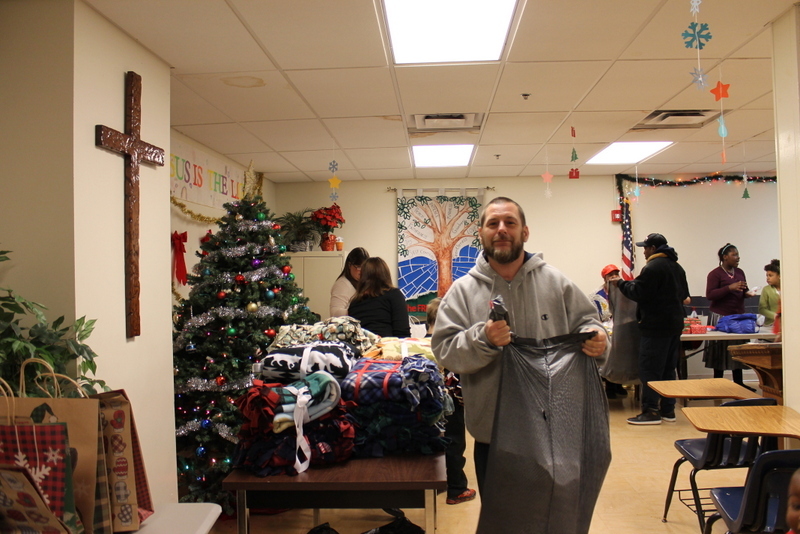 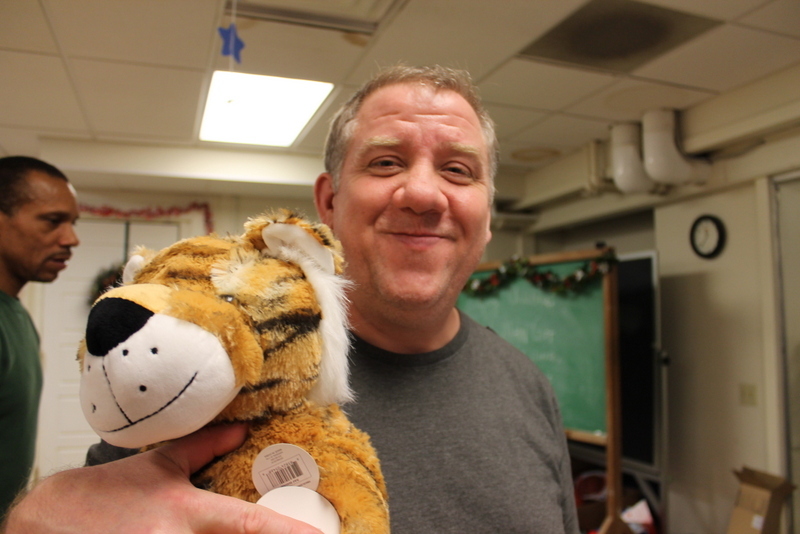 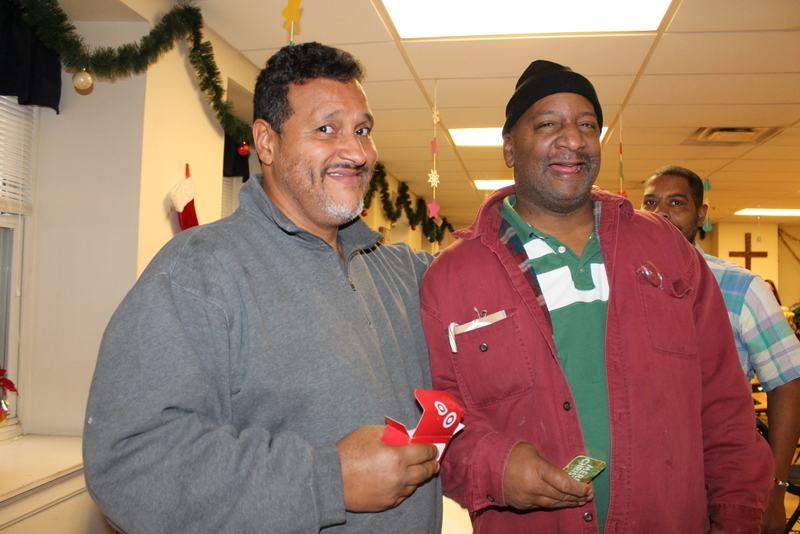 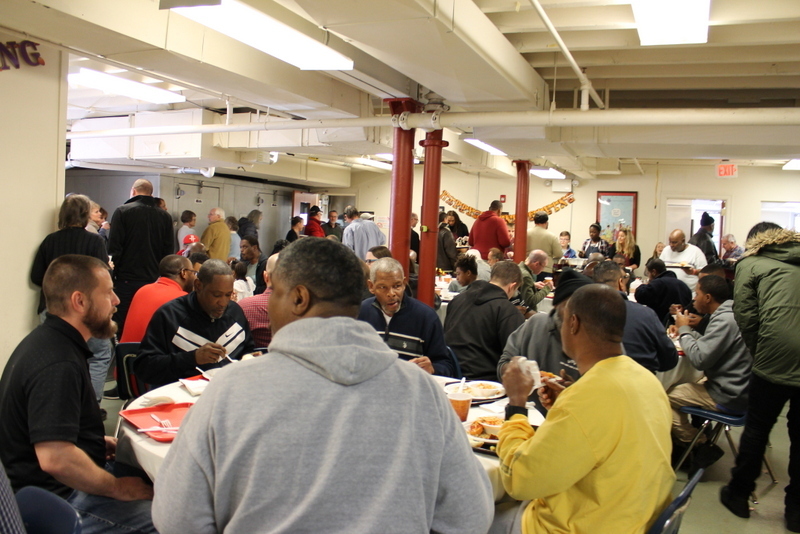 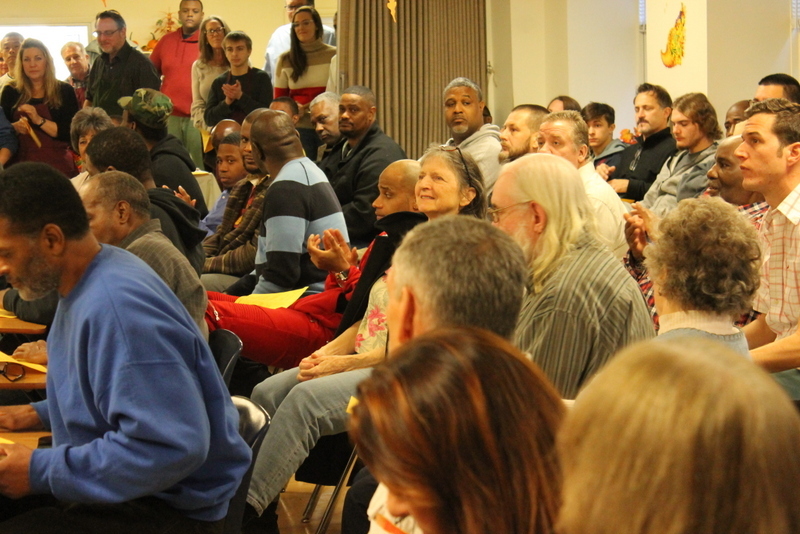 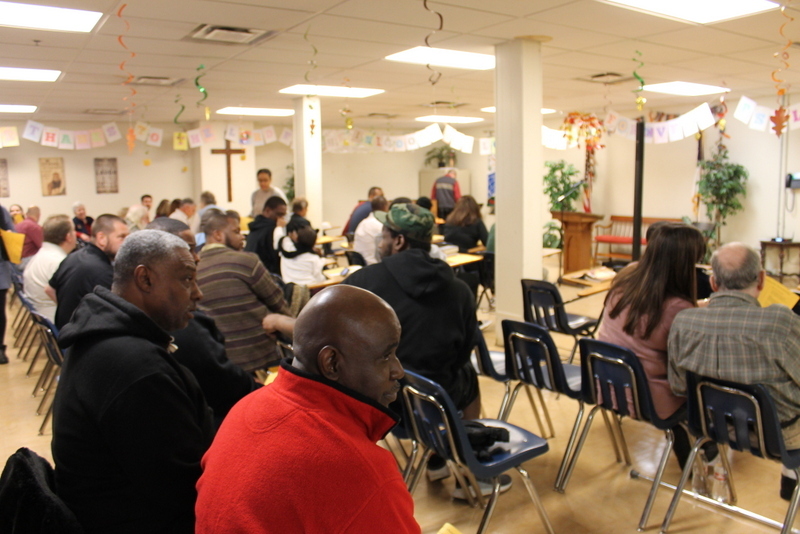 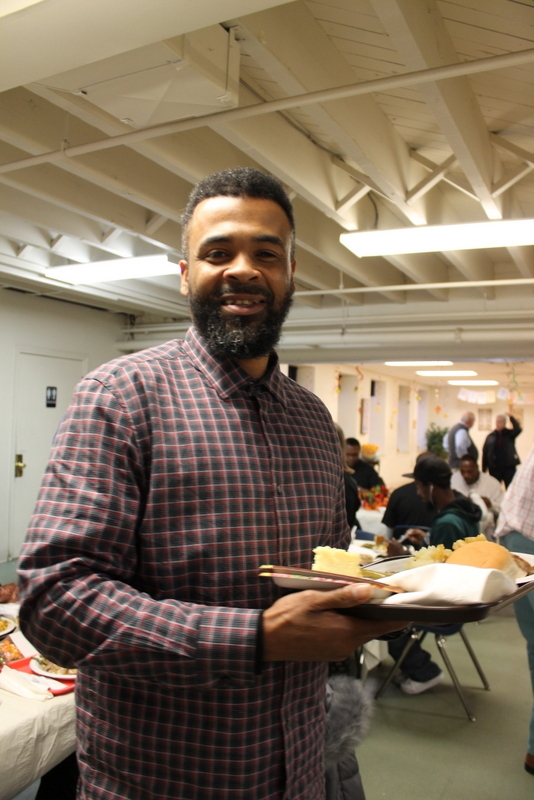 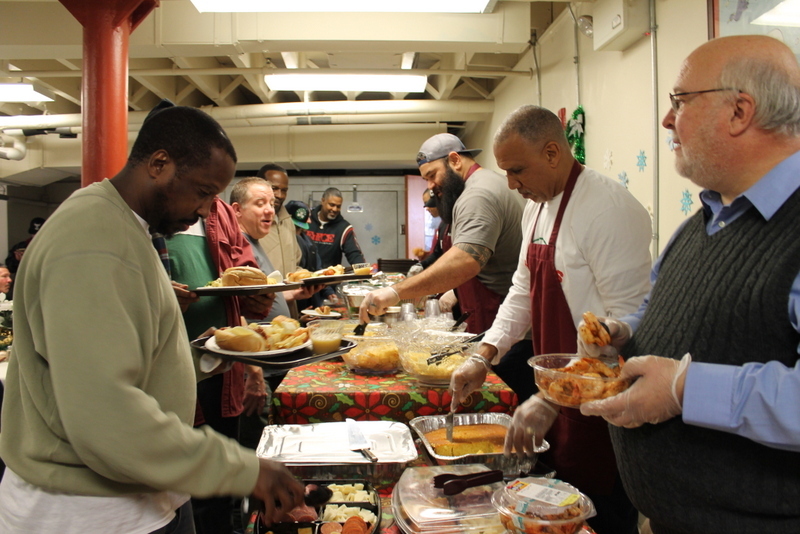 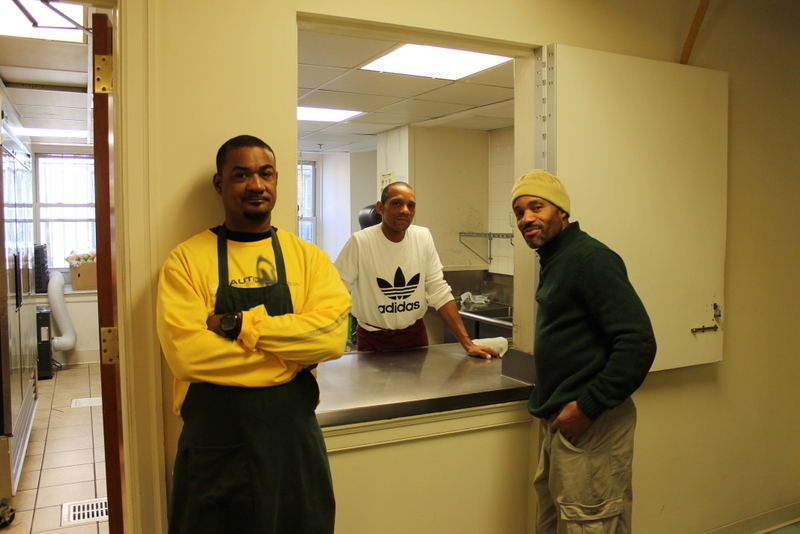 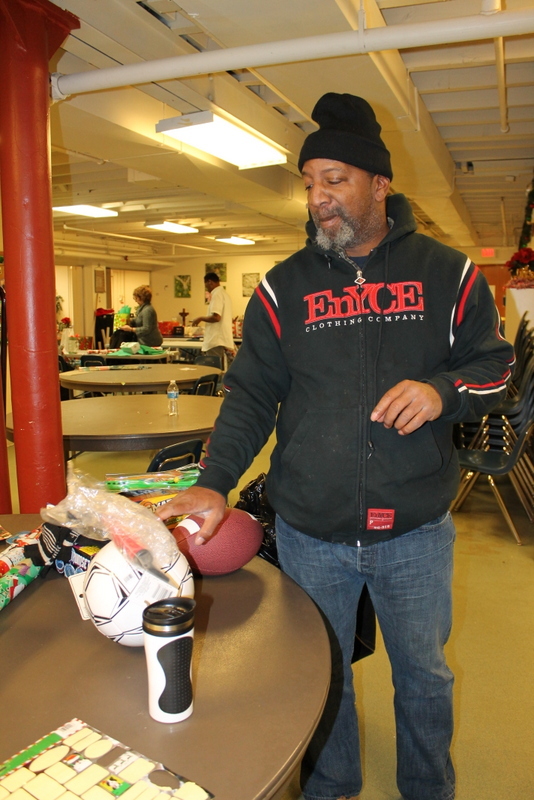 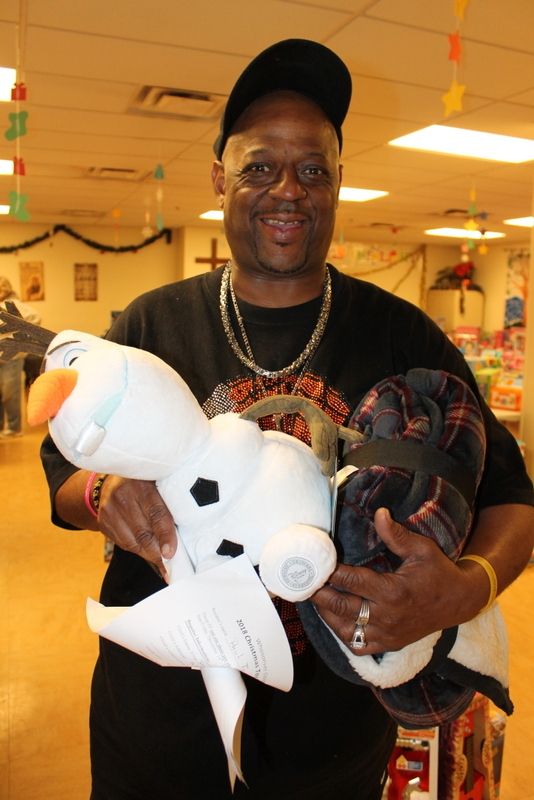 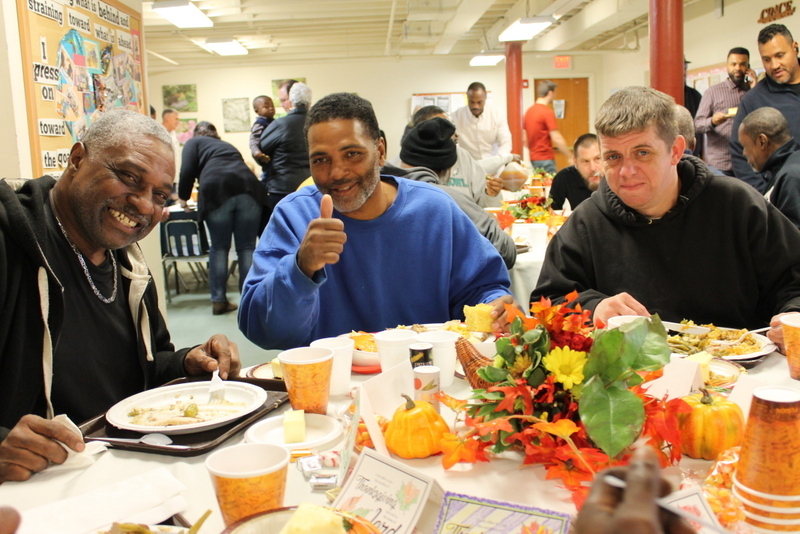 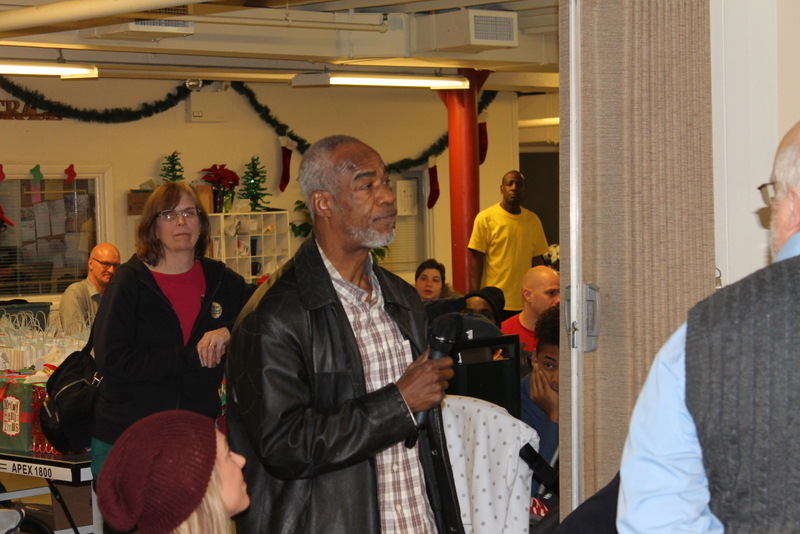 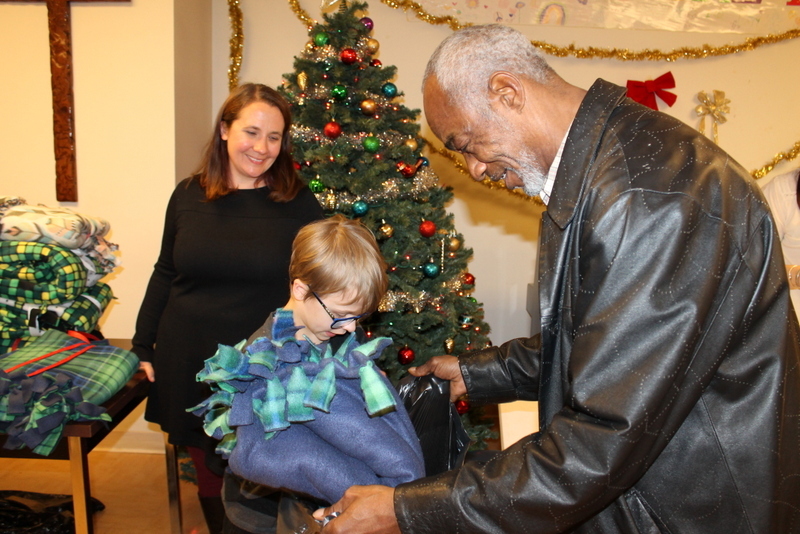 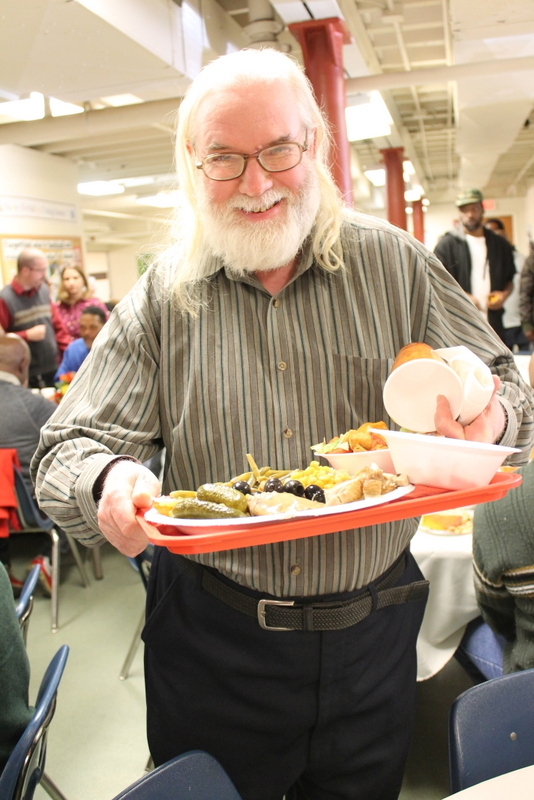 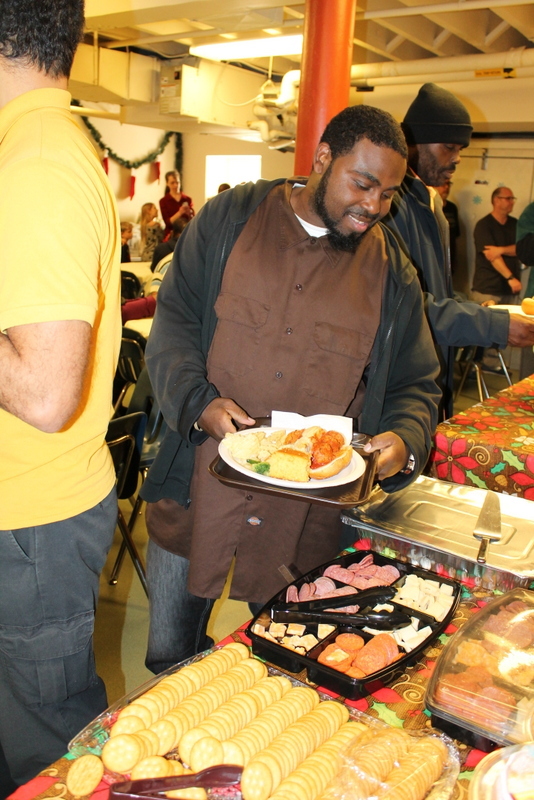 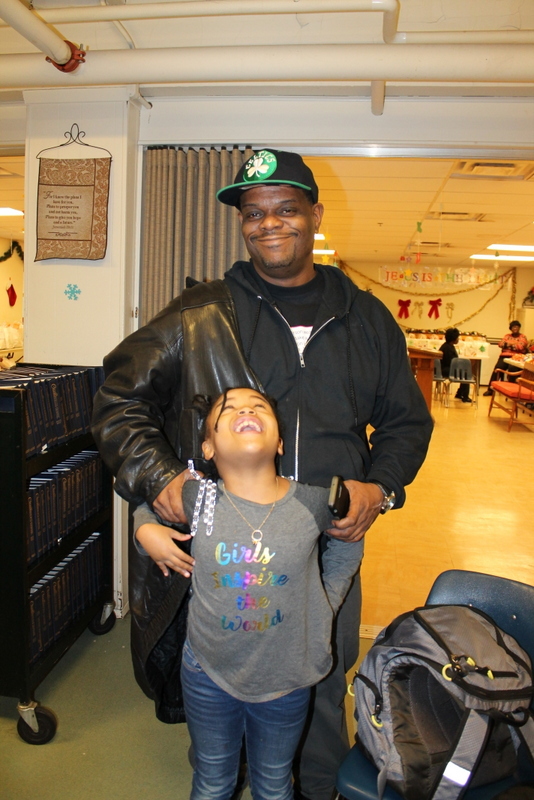 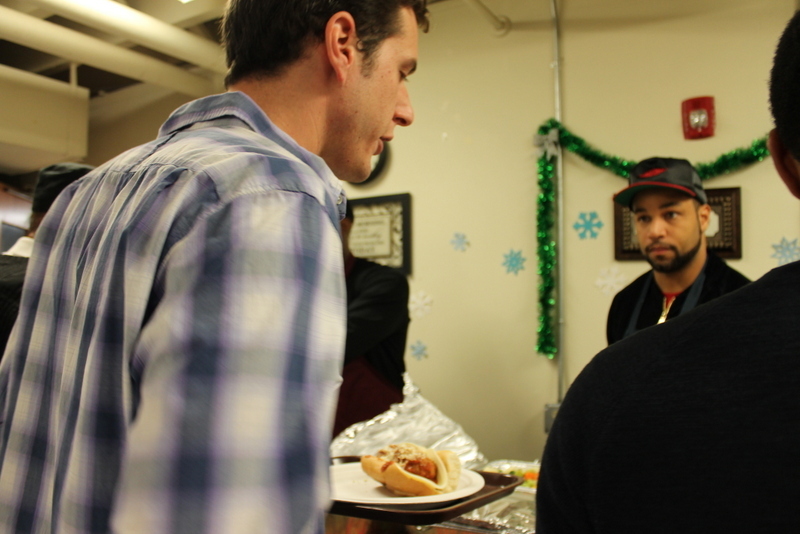 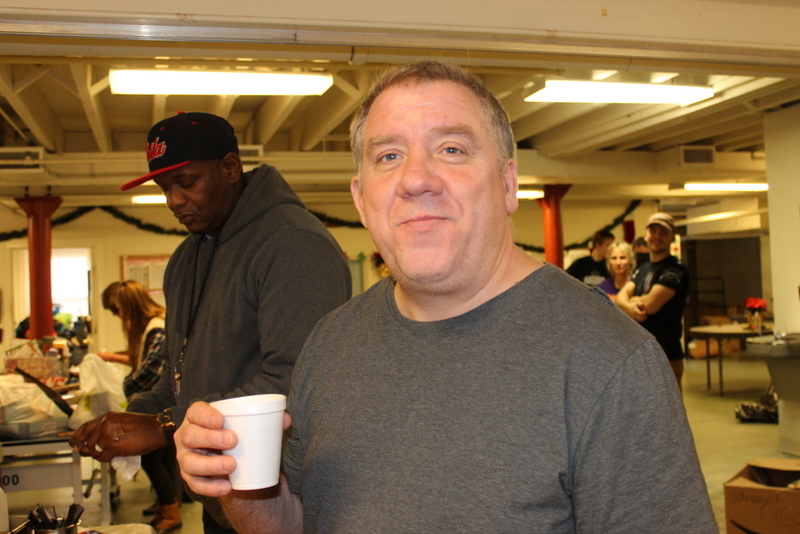 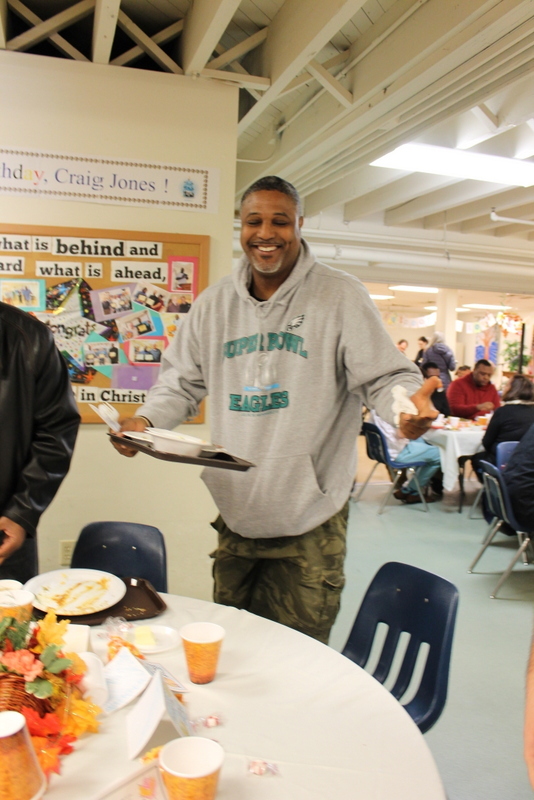 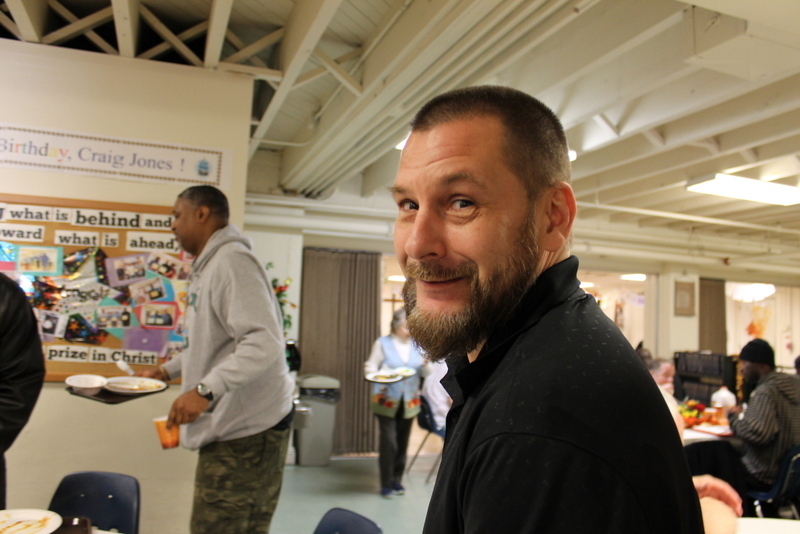 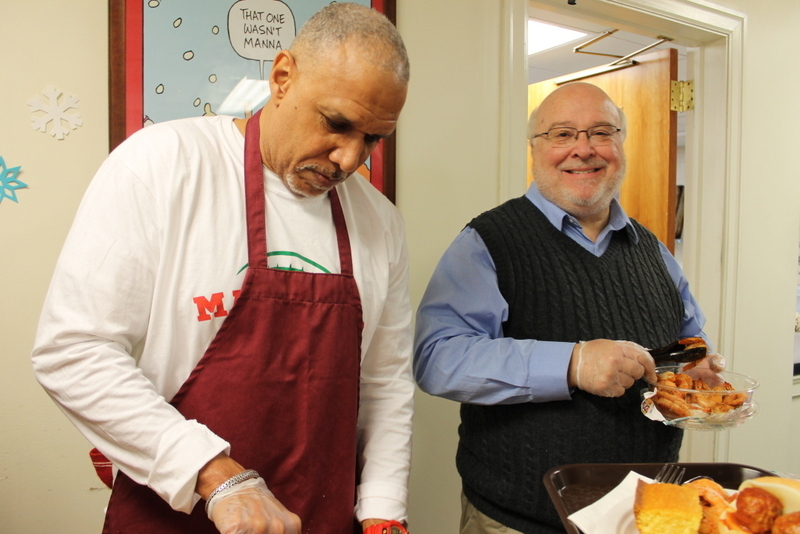 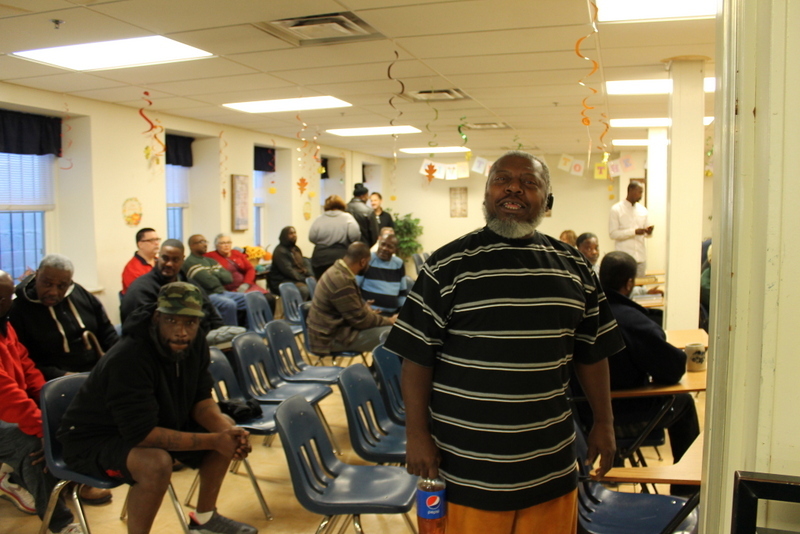 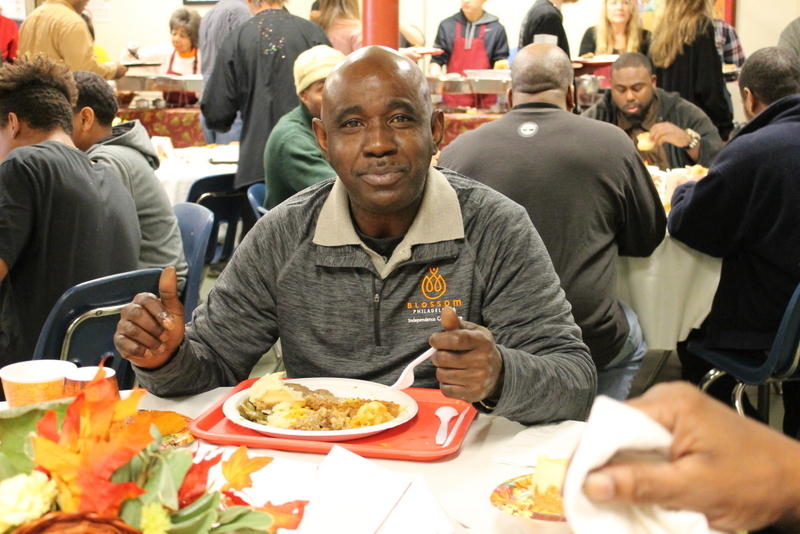 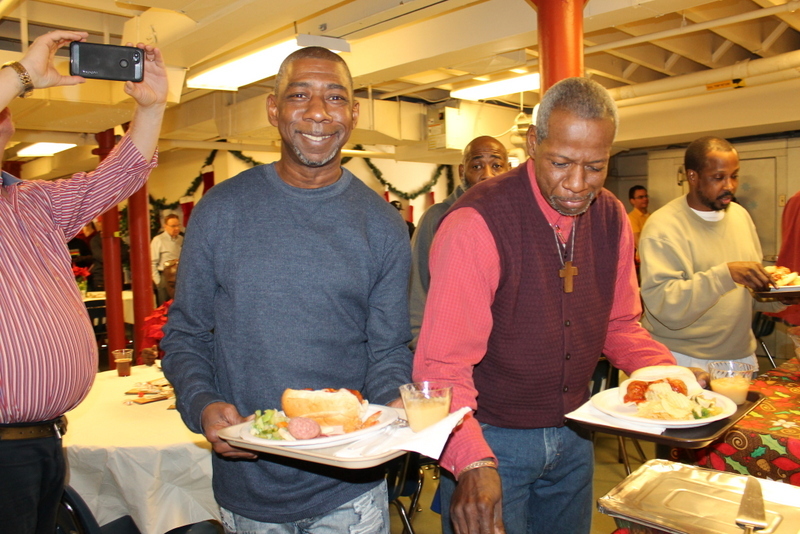 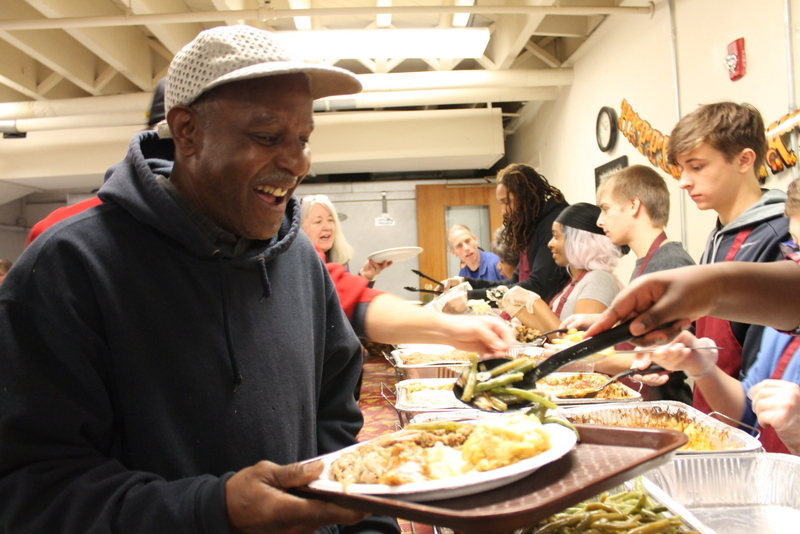 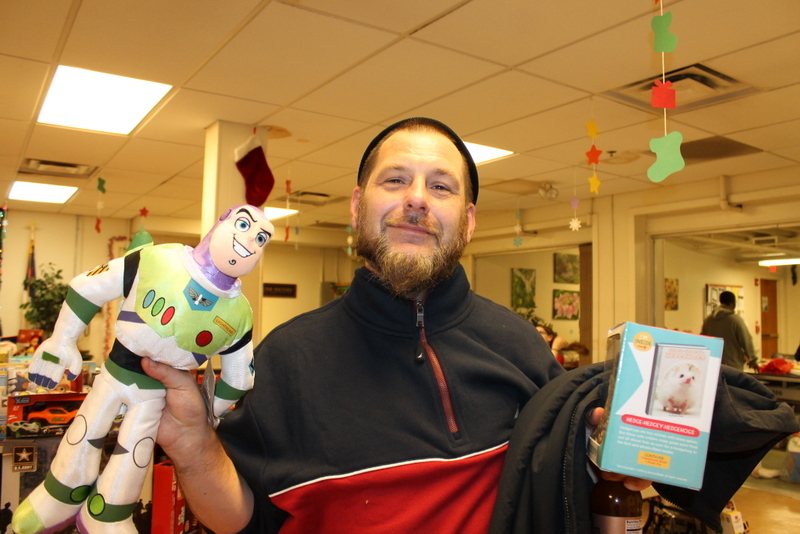 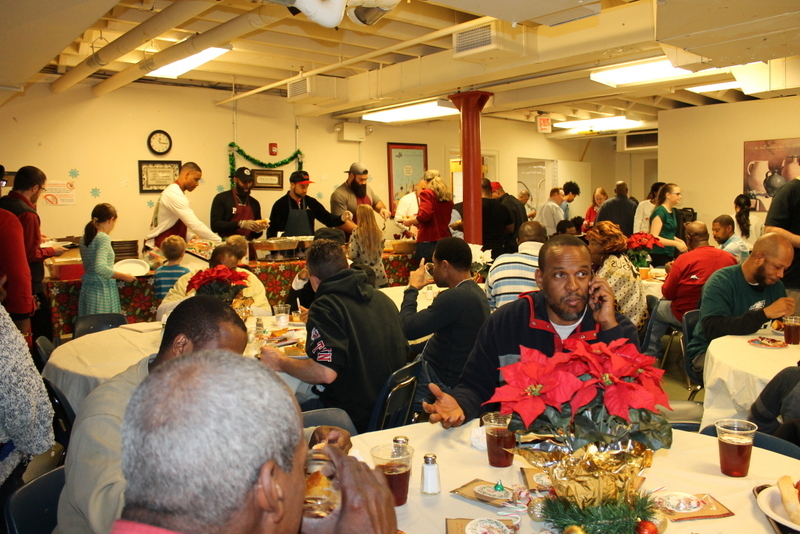 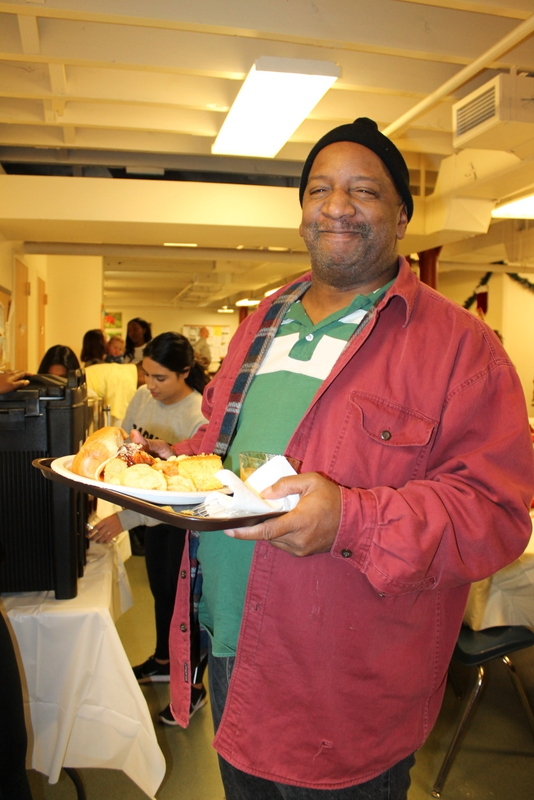 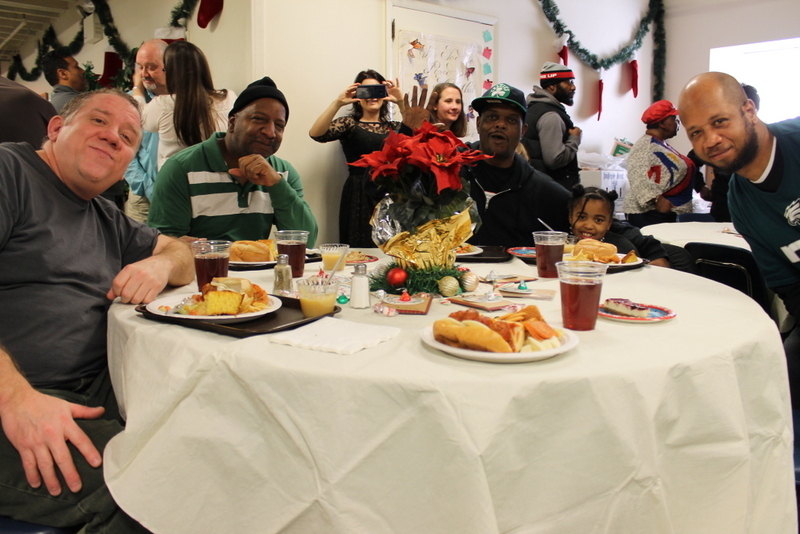 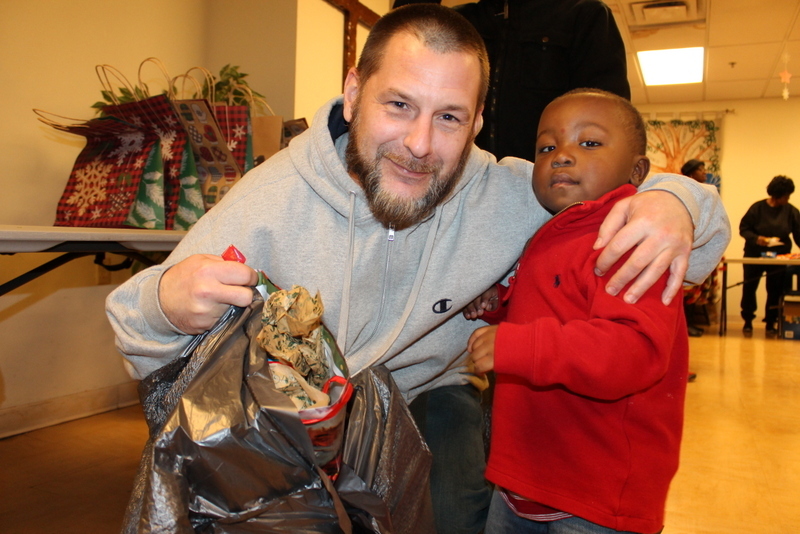 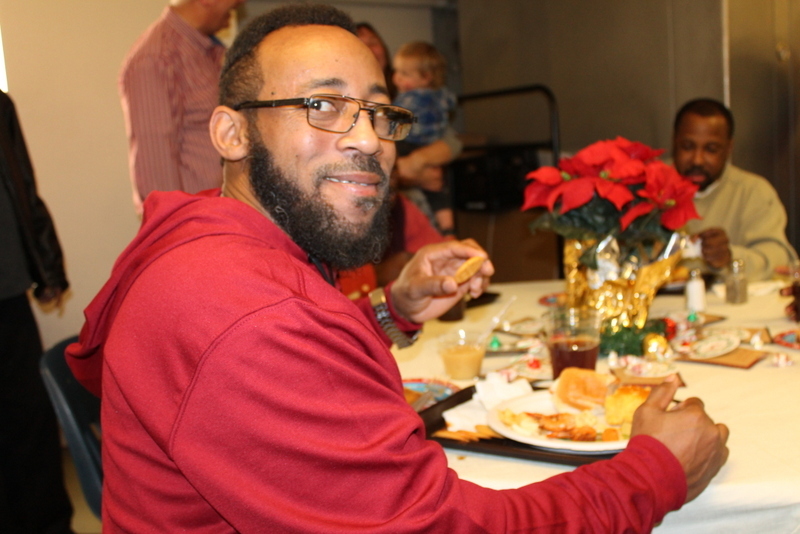 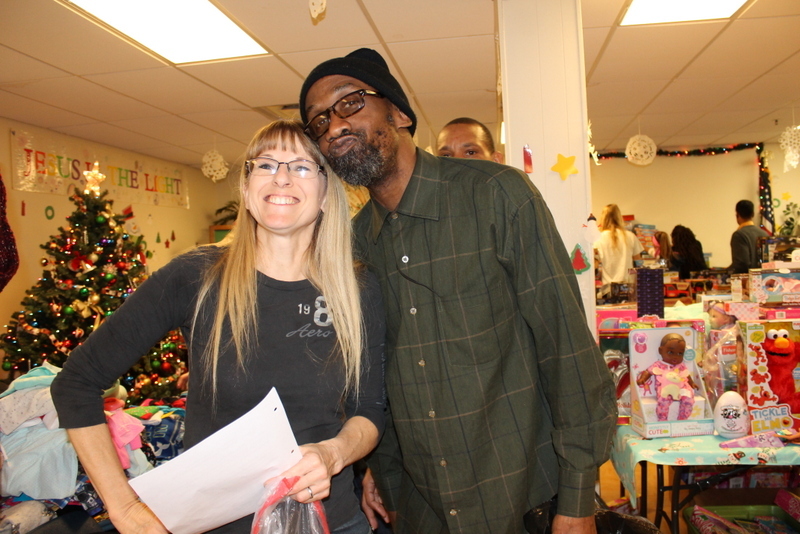 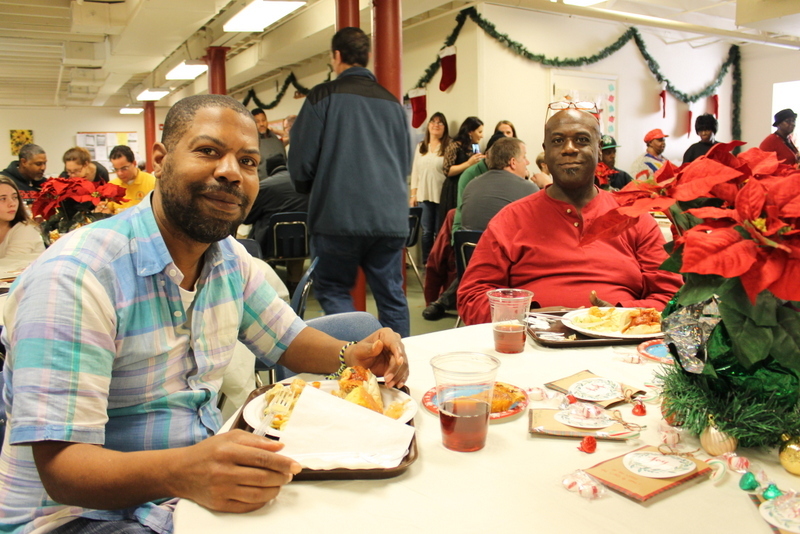 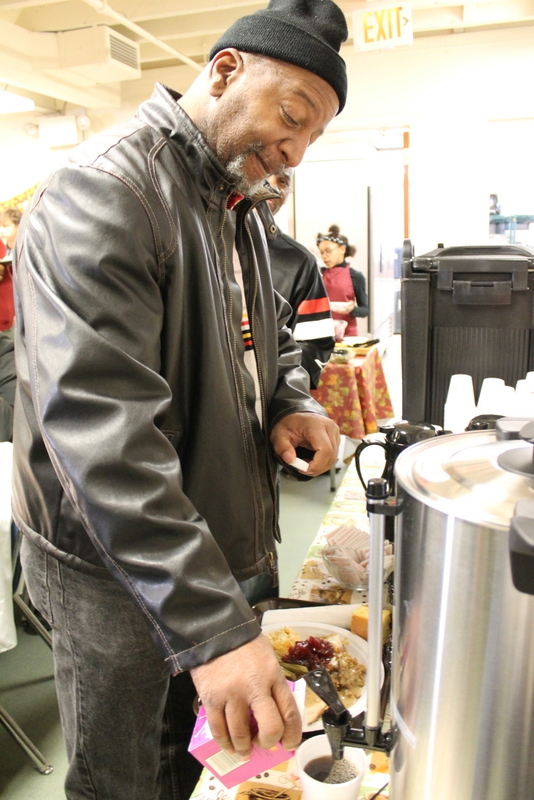 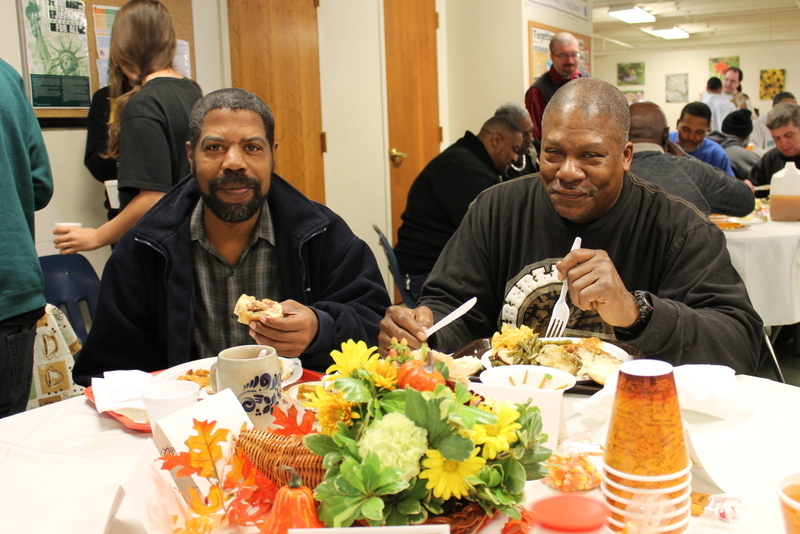 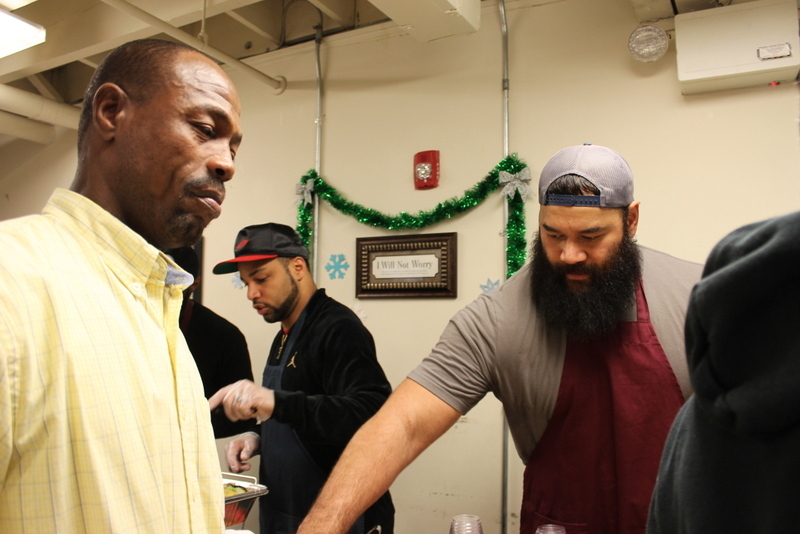 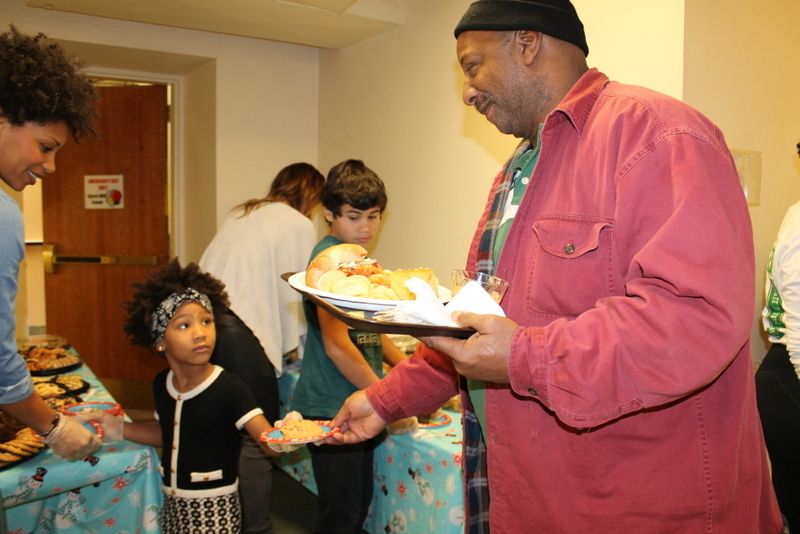 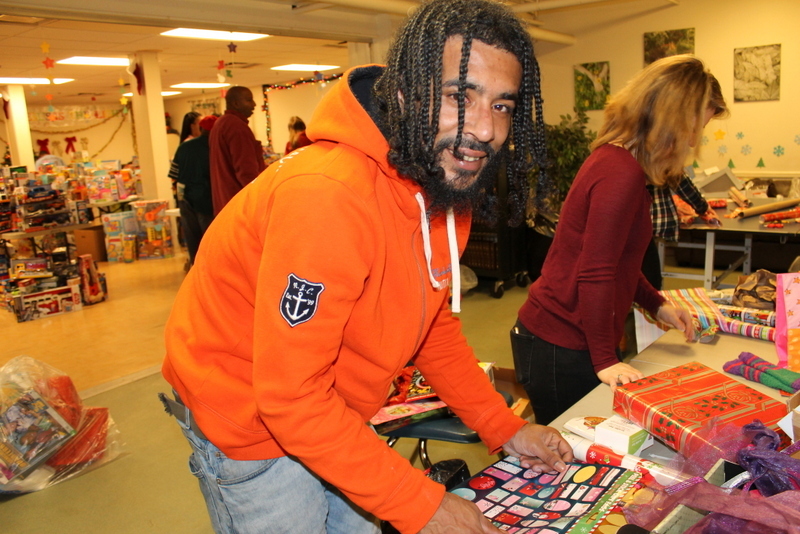 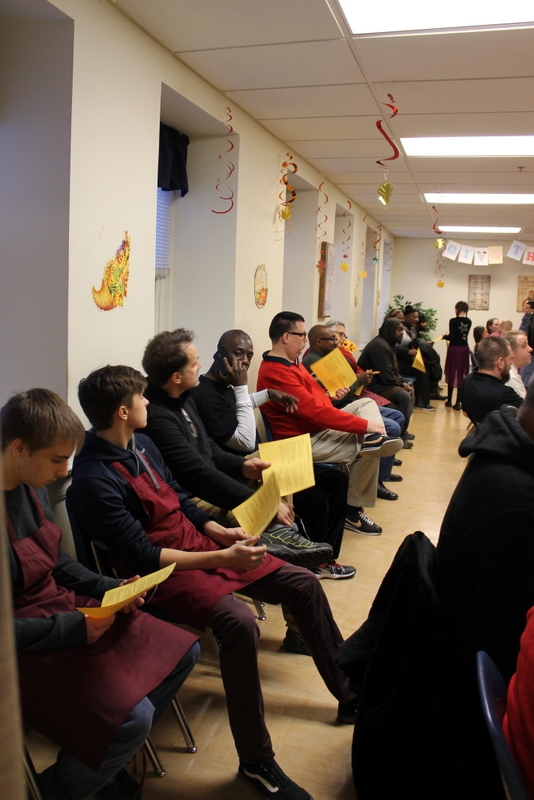 For men experiencing homelessness, the holidays can be a hard. 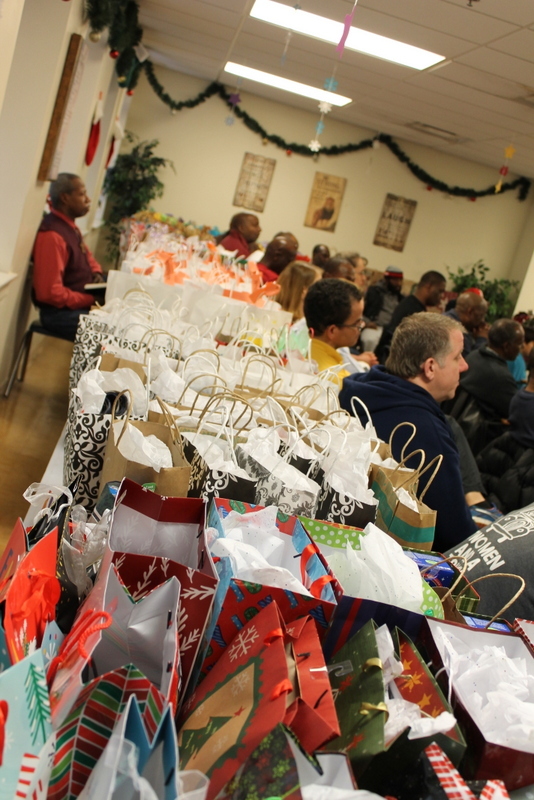 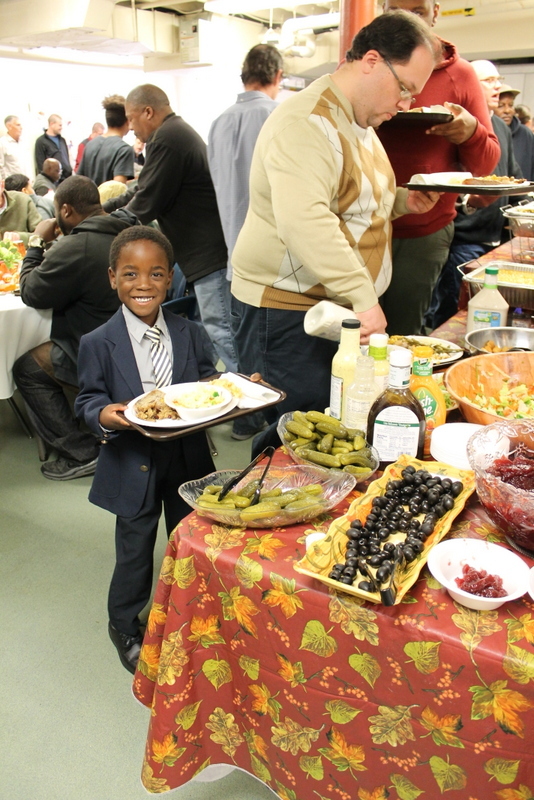 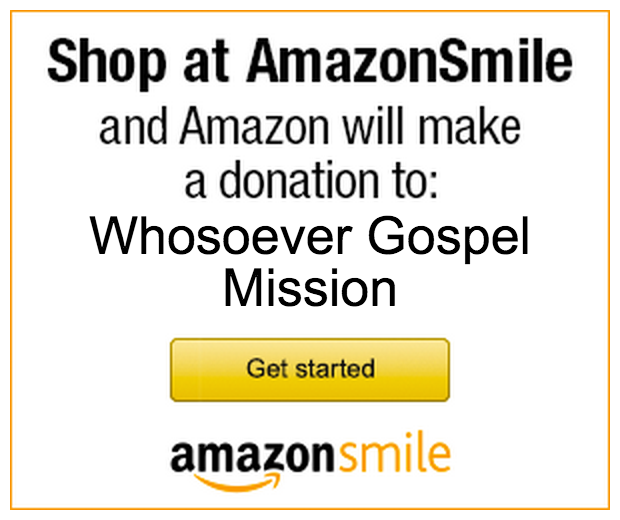 The Mission family wishes to extend a great big THANK YOU to everyone who gave to make this Christmas special for the men of the Whosoever Gospel Mission and their families. 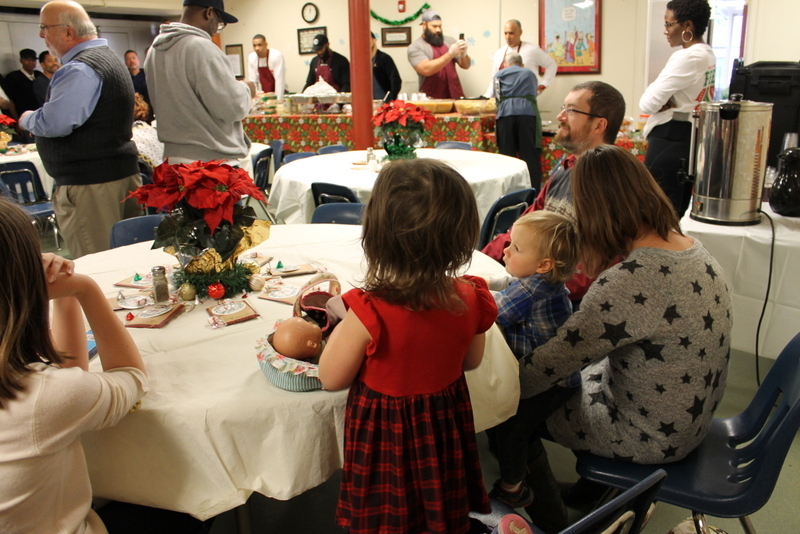 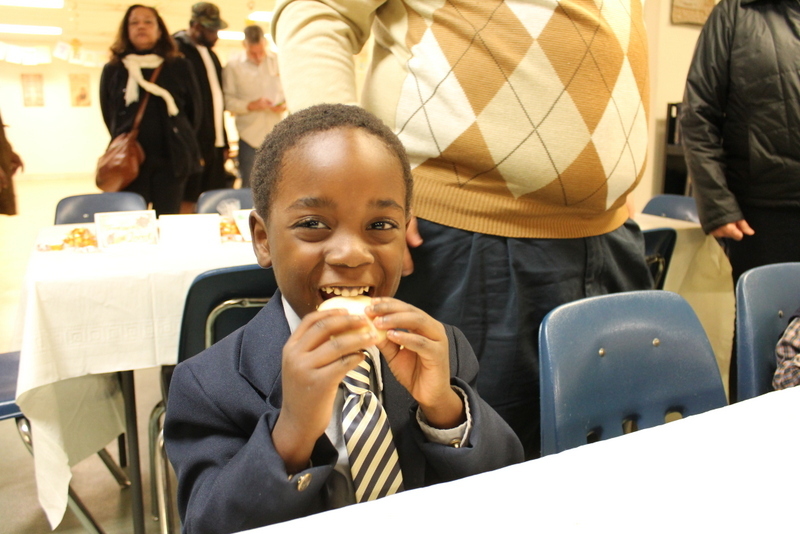 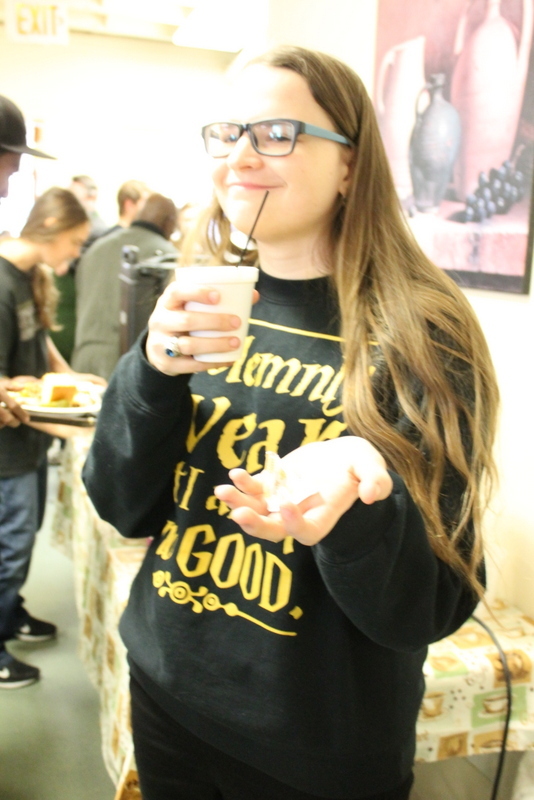 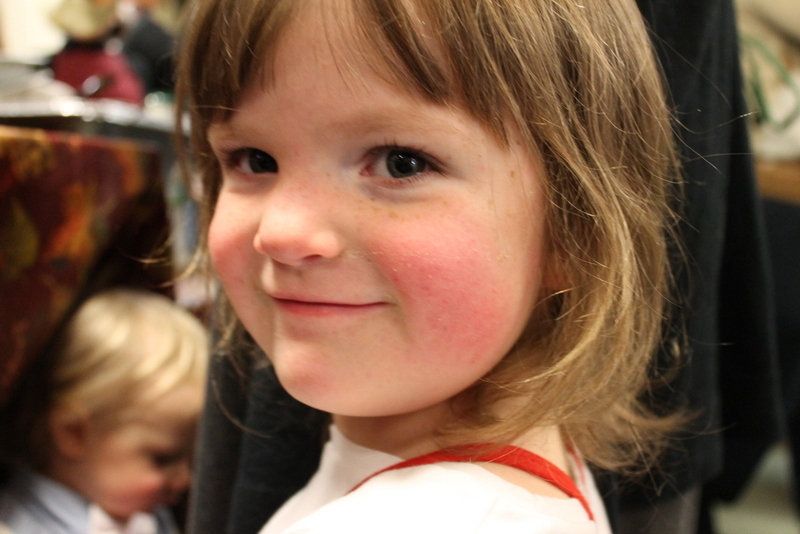 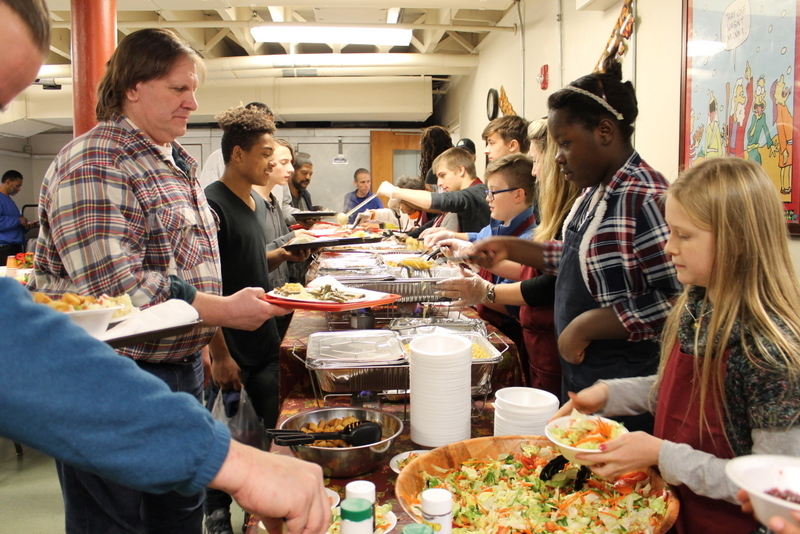 Check out this short video that gives you a taste of our Christmas celebration. 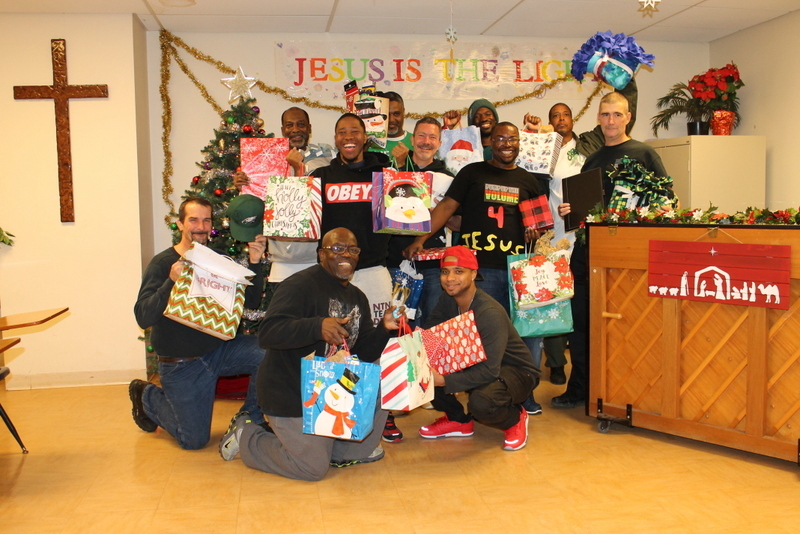 Thank You for a great Christmas!Thank you to everyone who donated to make Christmas special for the men of the Mission!